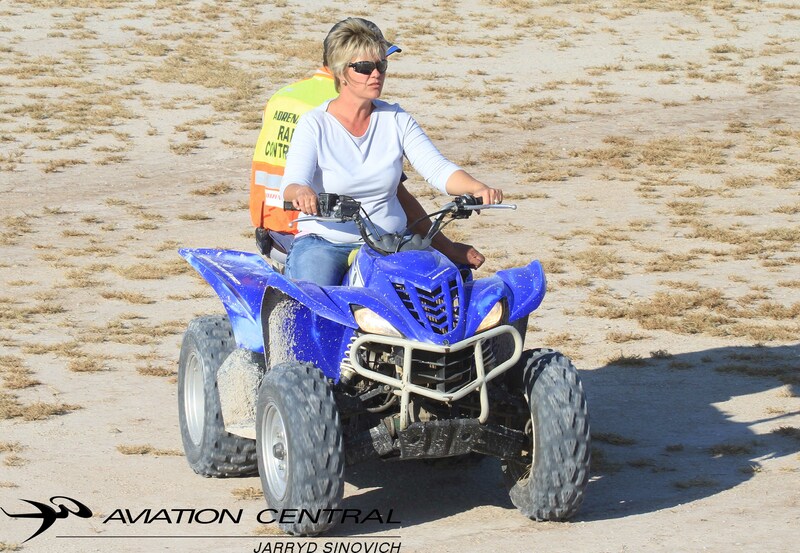 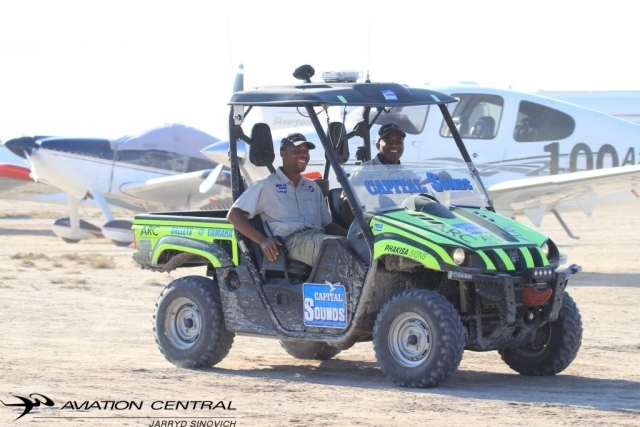 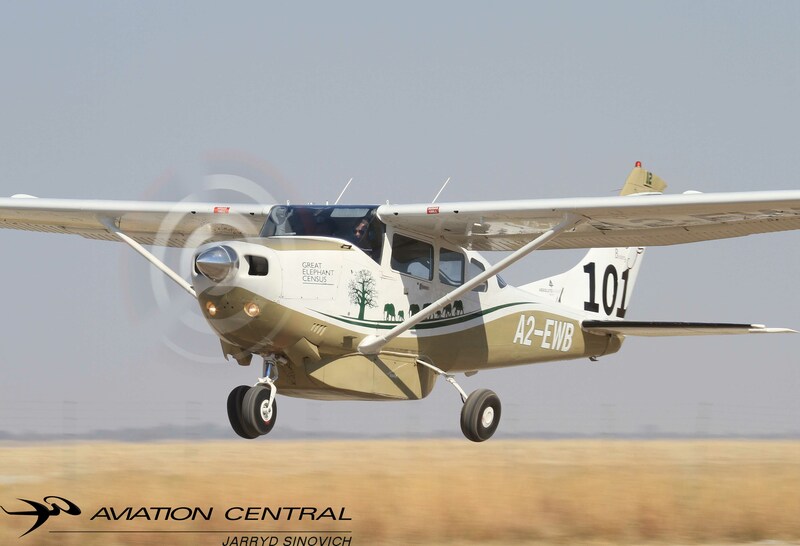 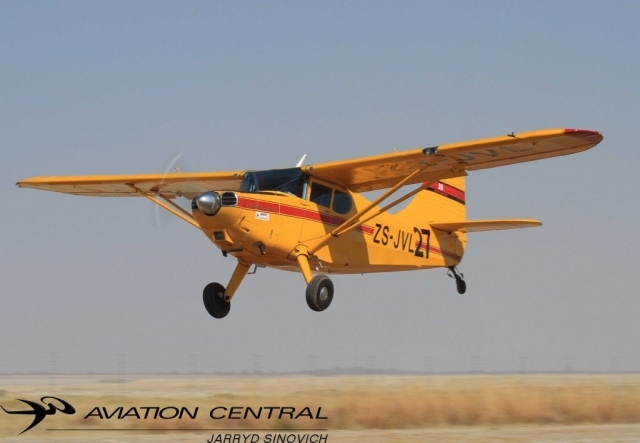 The 2018 edition of Race for Rhinos finally arrived for all the eager competitors taking to the skies of Sua Pan in Botswana from the 28th June -1 July.The Sua Pan or Sowa Pan is a large natural topographic depression within the Makgadikgadi region of Botswana. 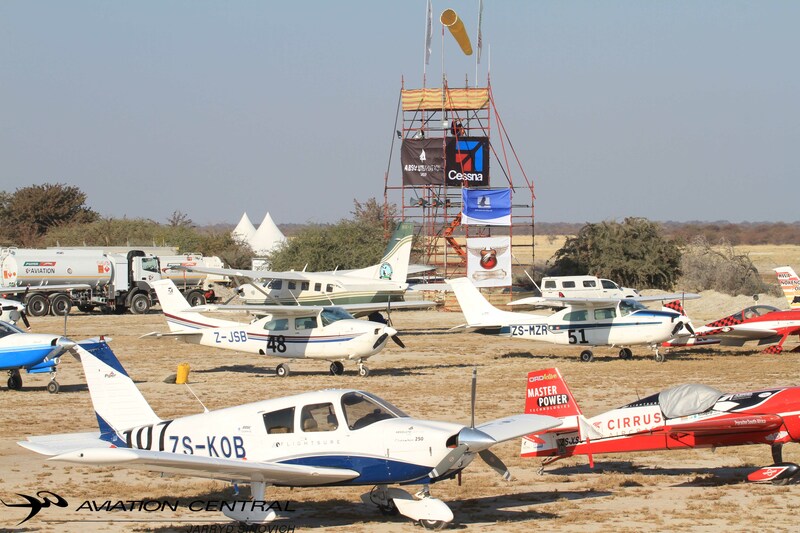 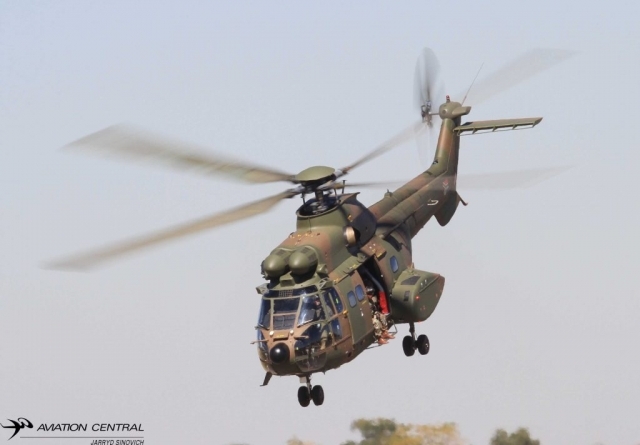 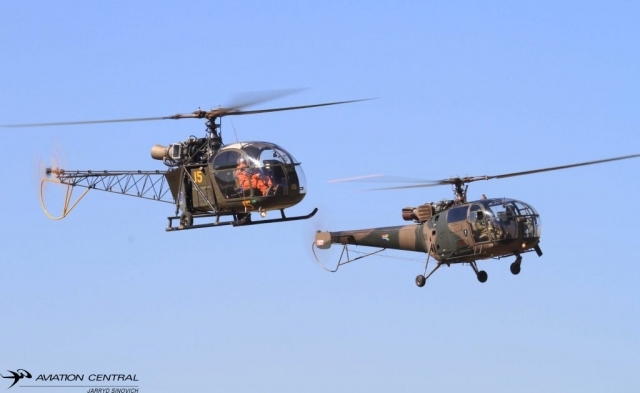 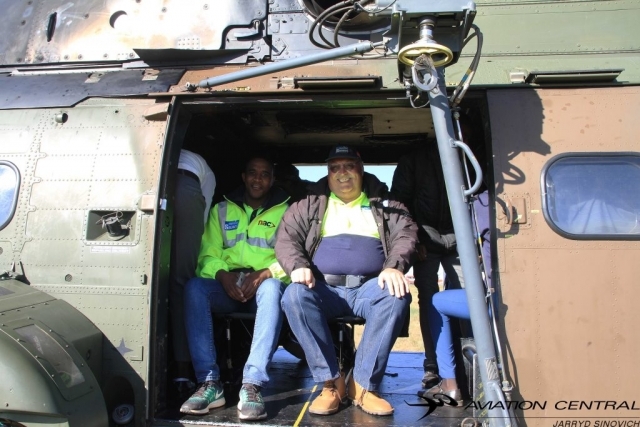 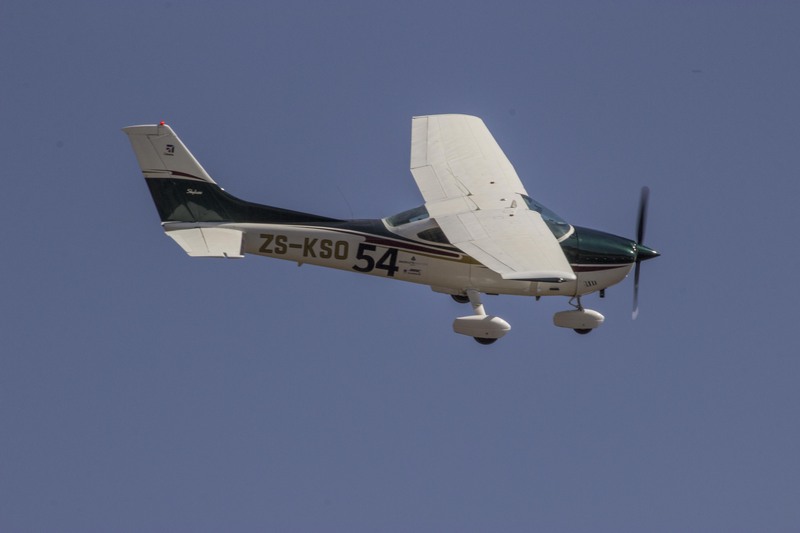 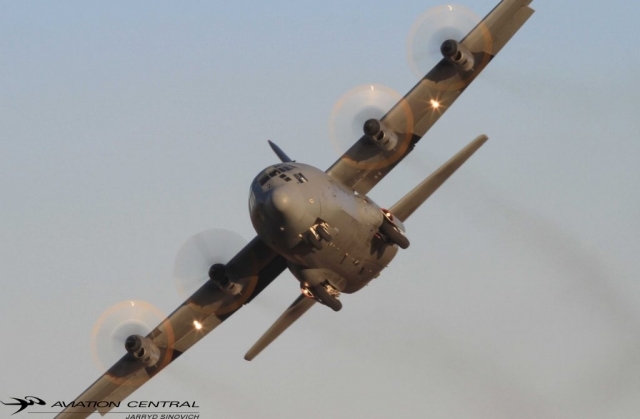 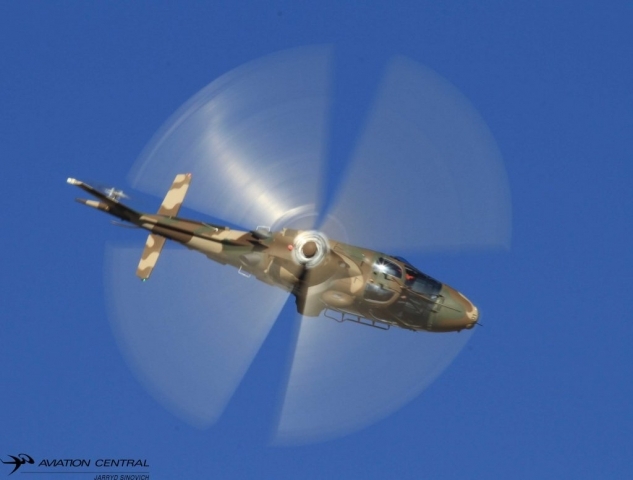 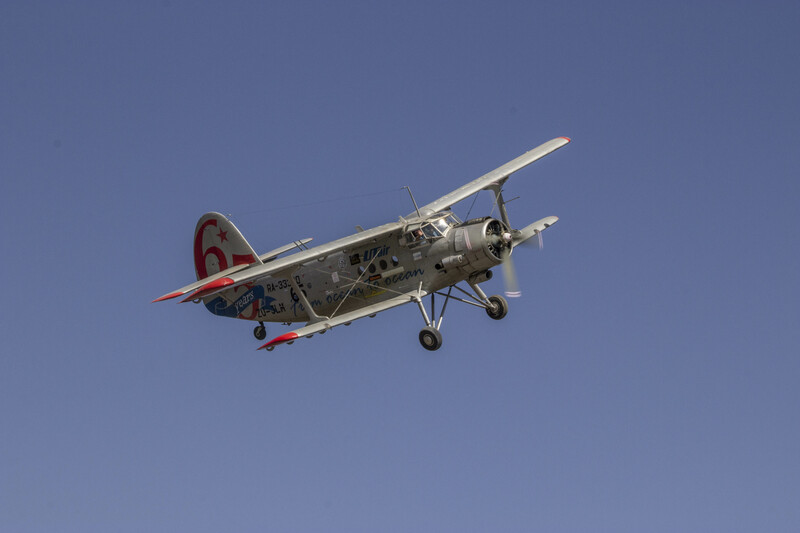 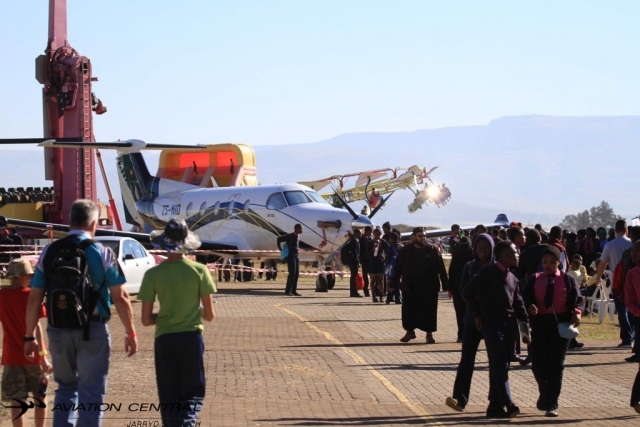 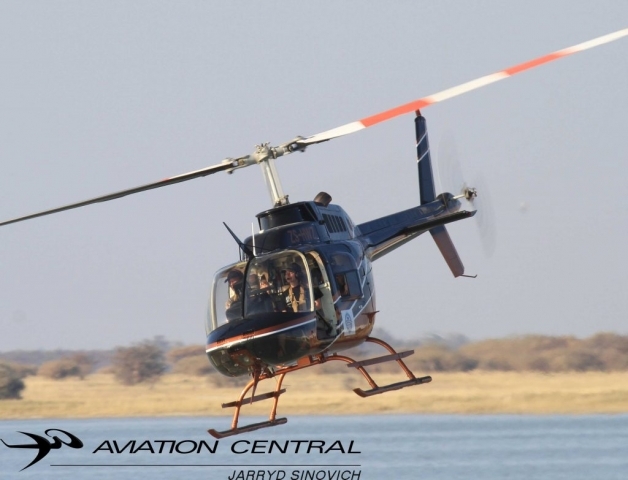 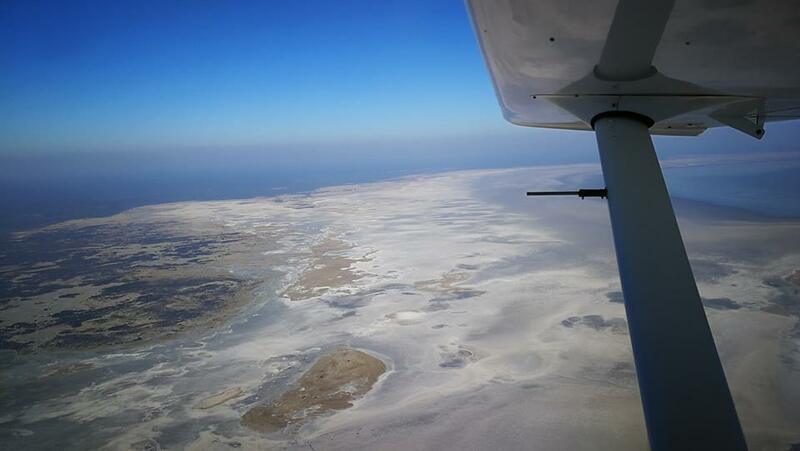 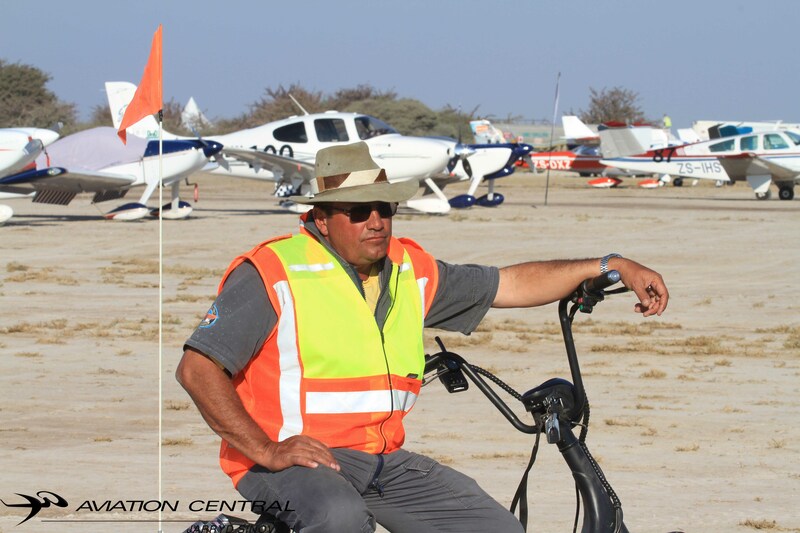 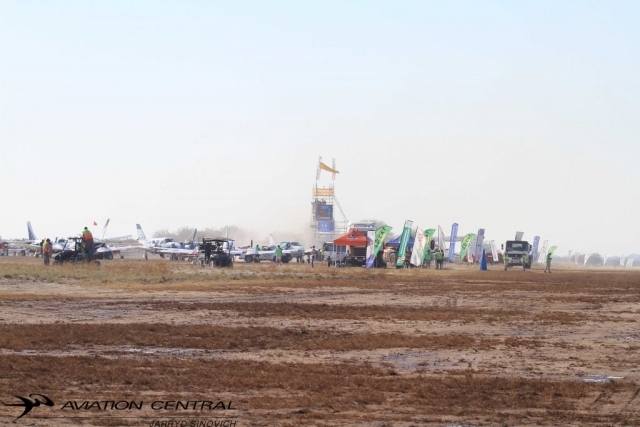 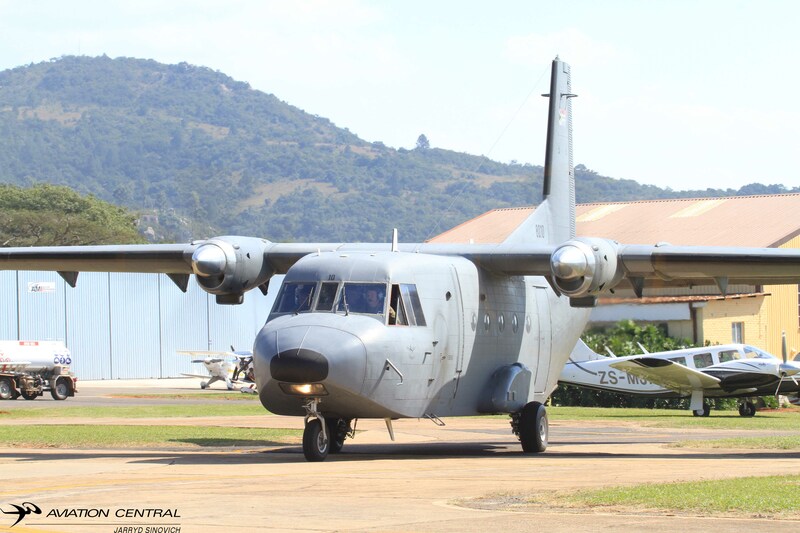 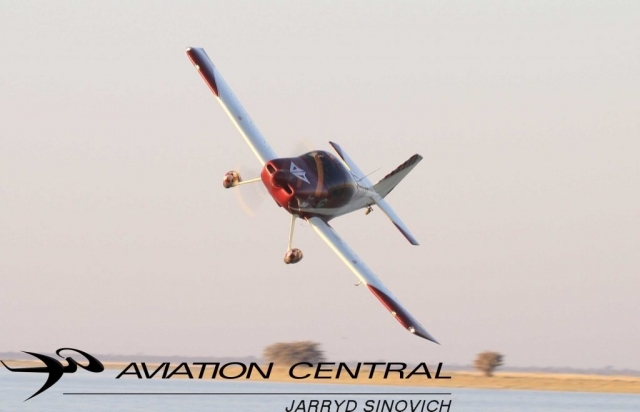 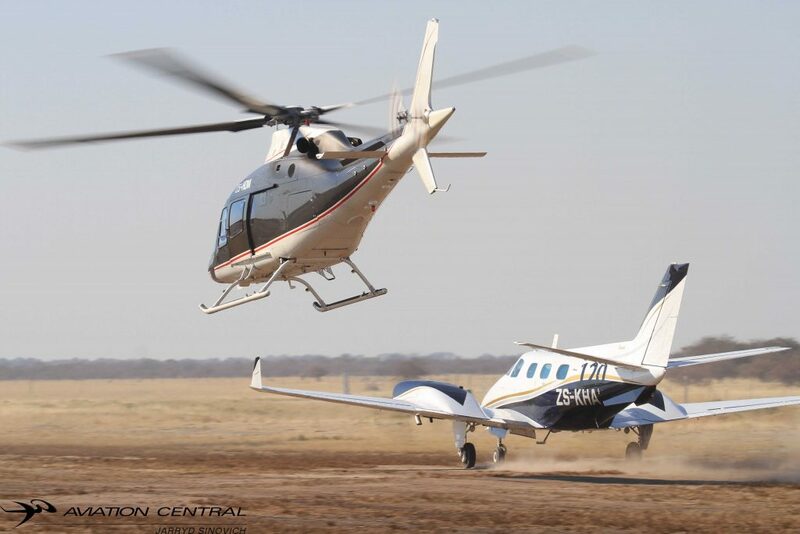 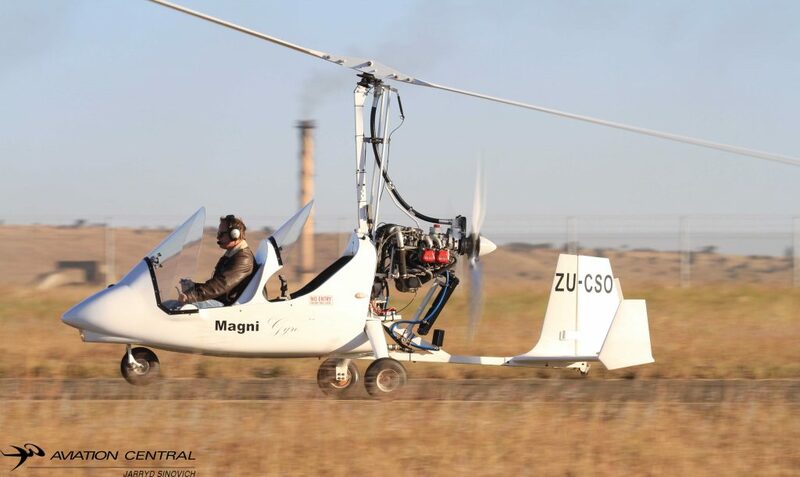 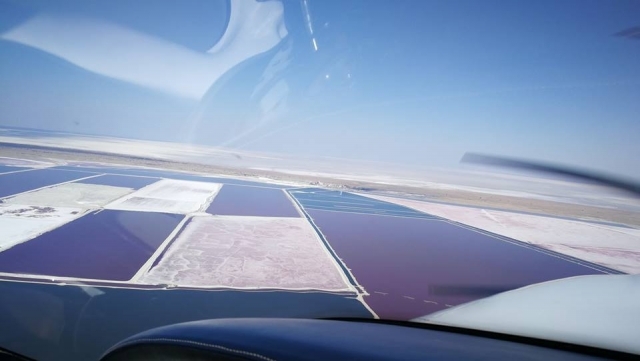 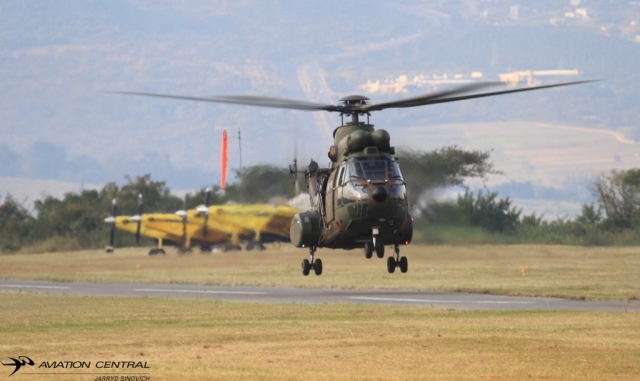 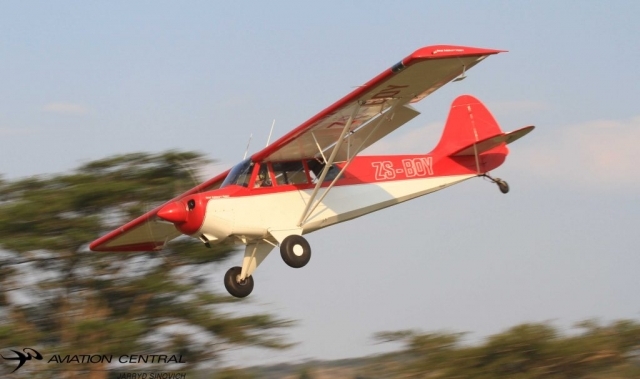 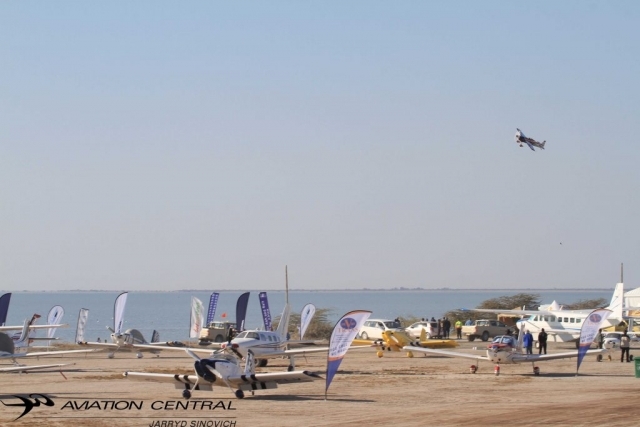 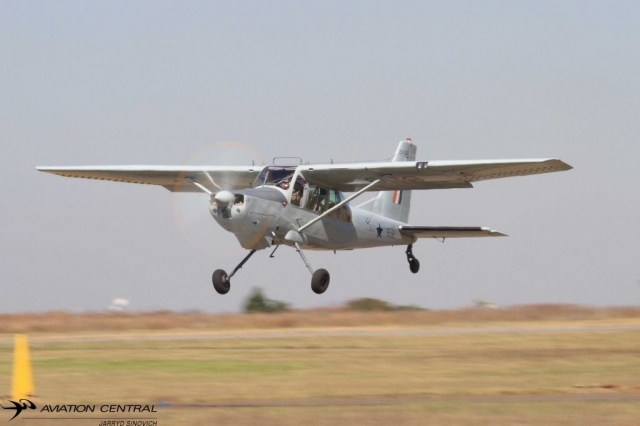 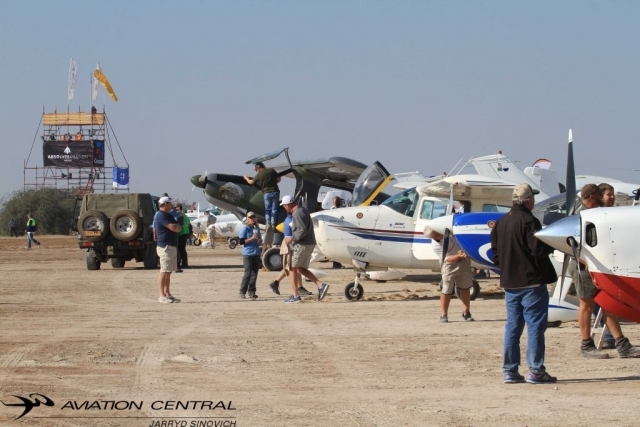 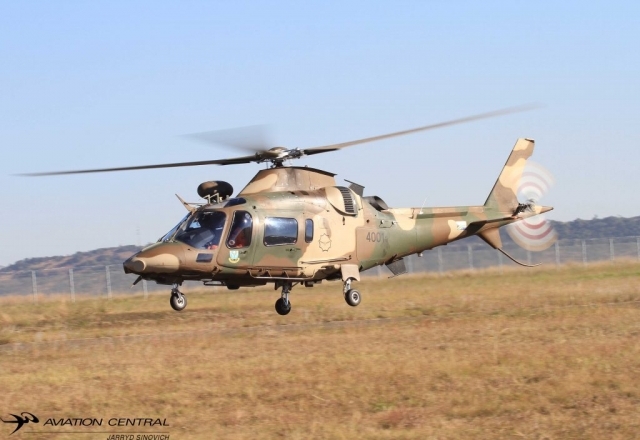 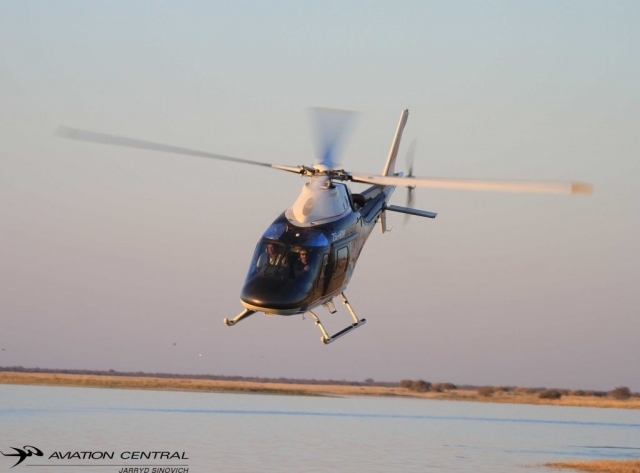 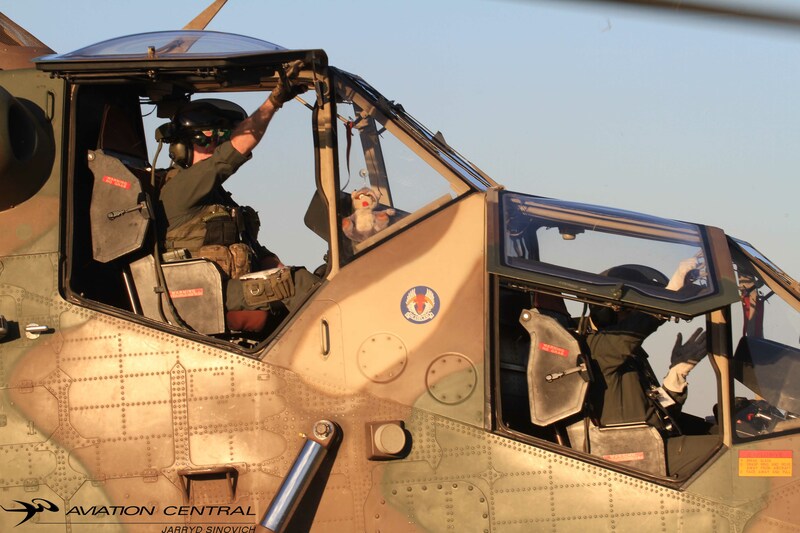 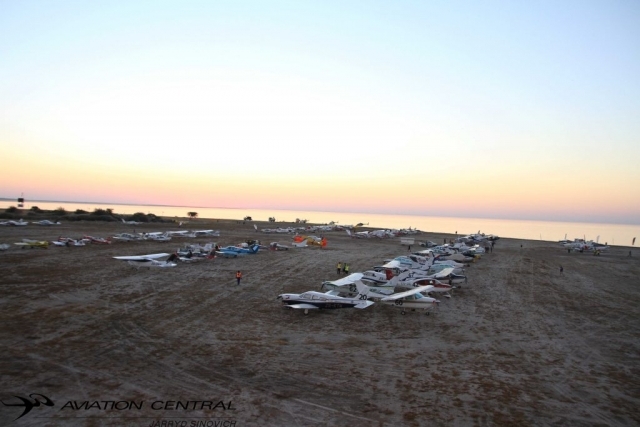 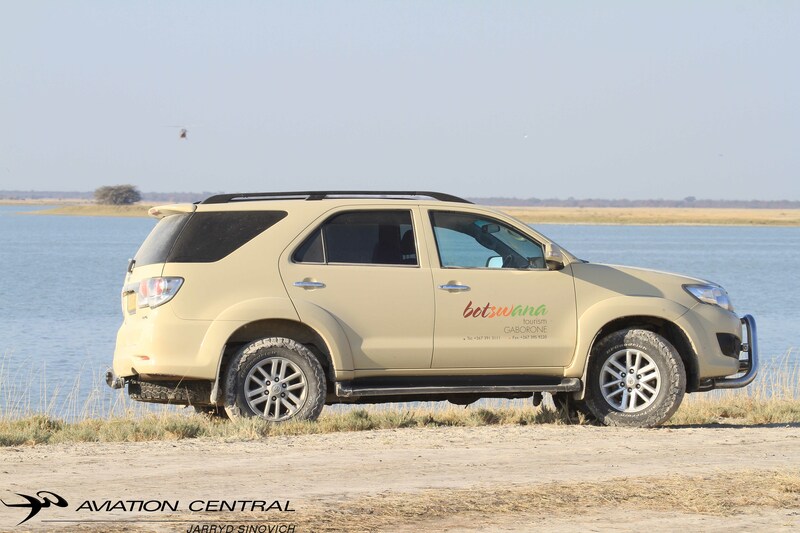 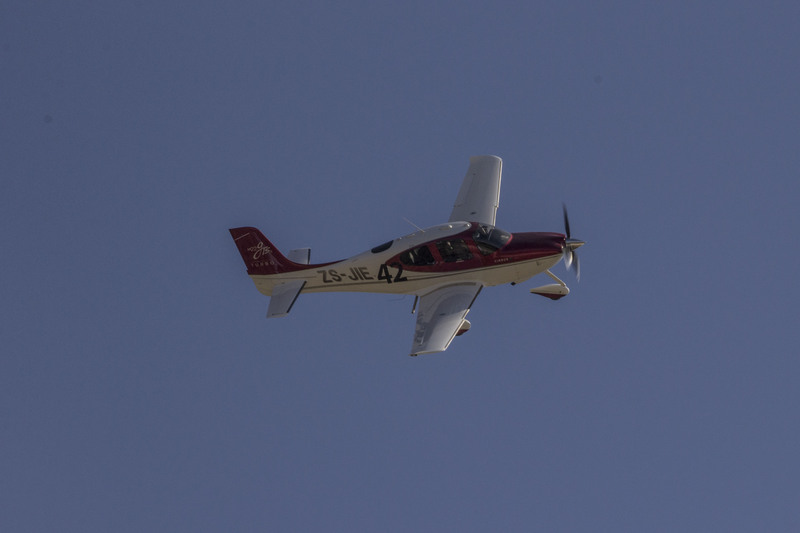 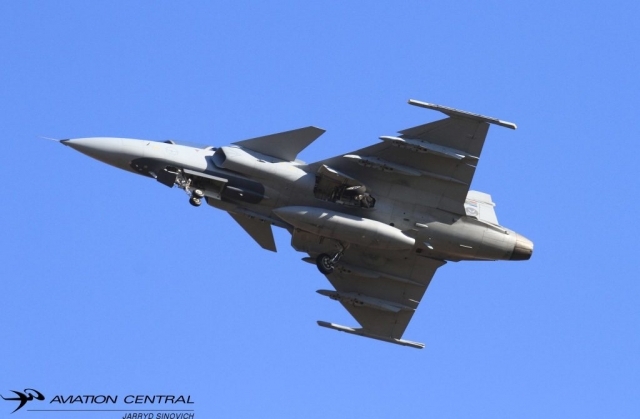 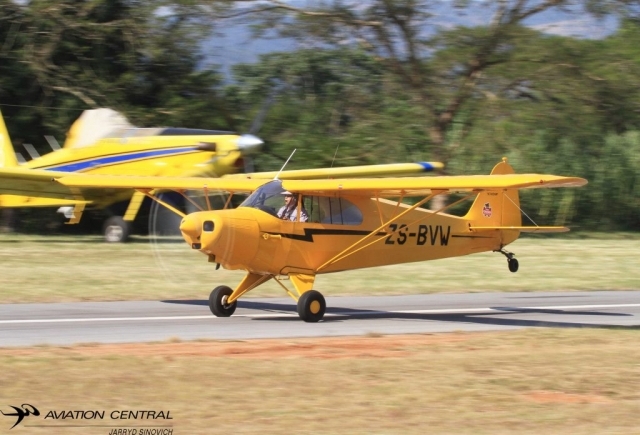 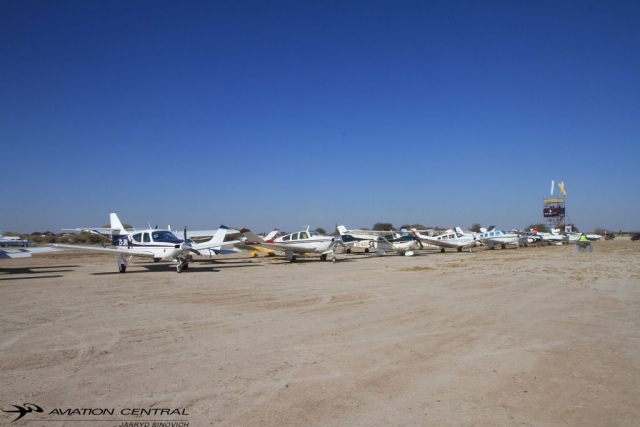 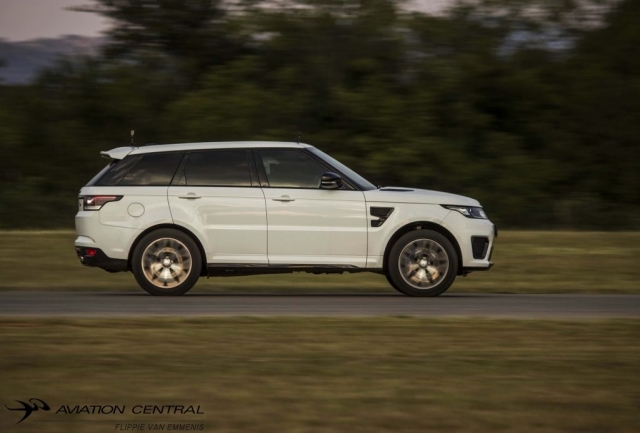 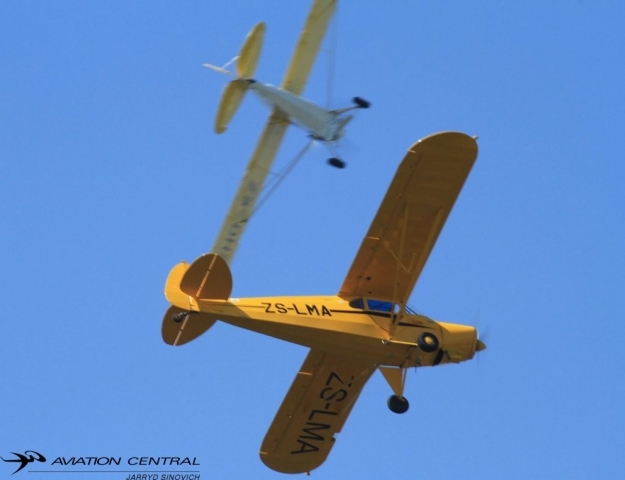 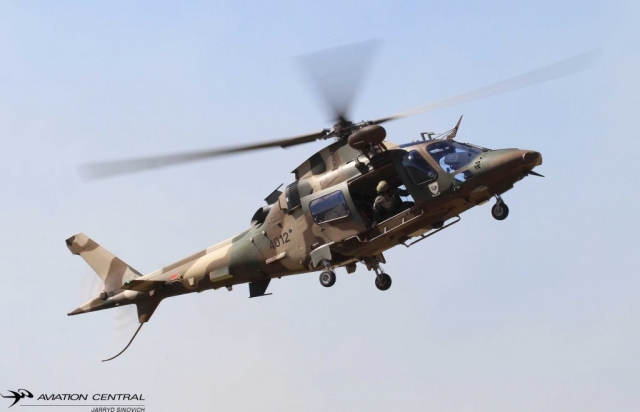 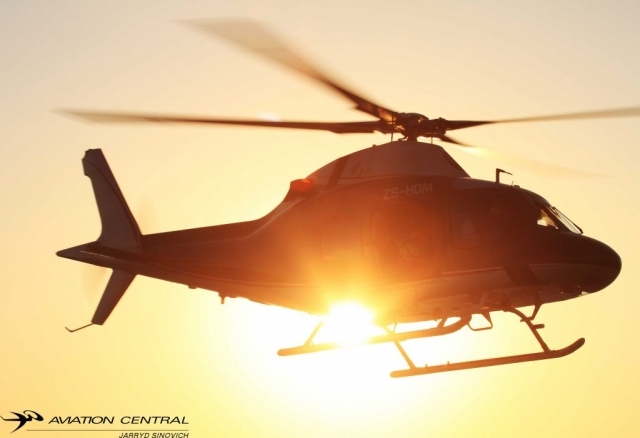 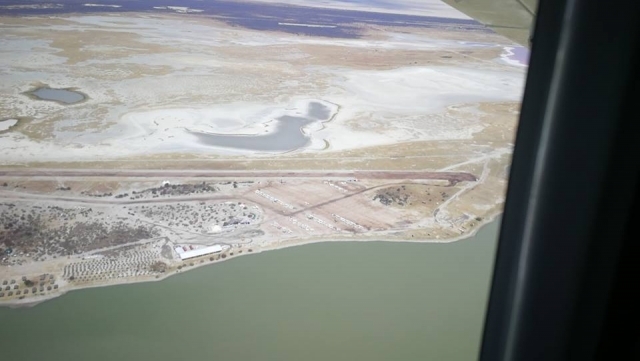 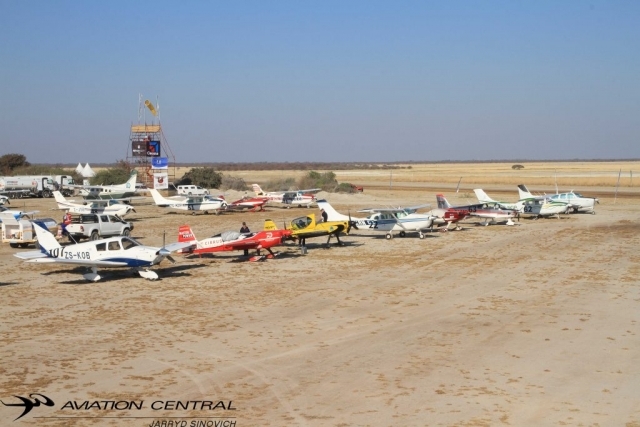 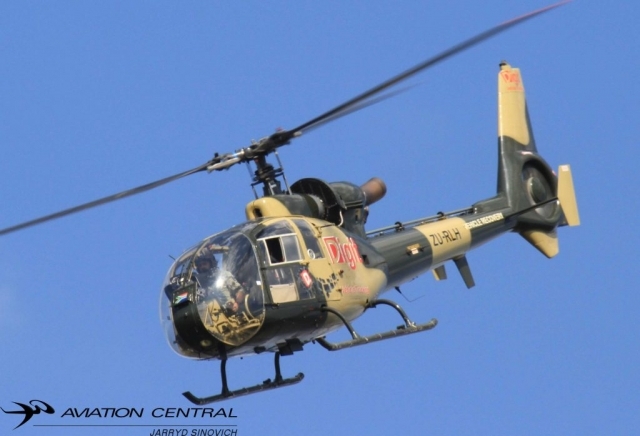 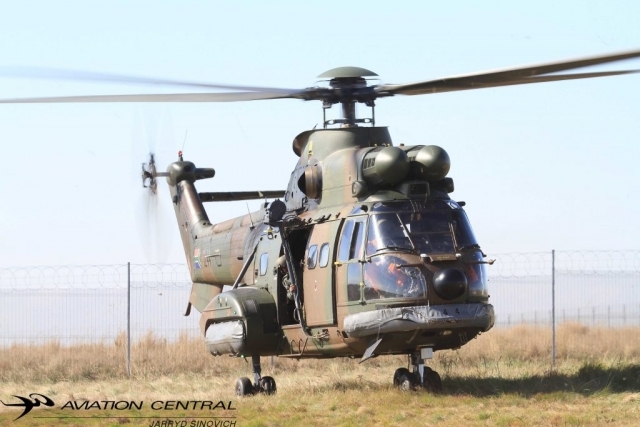 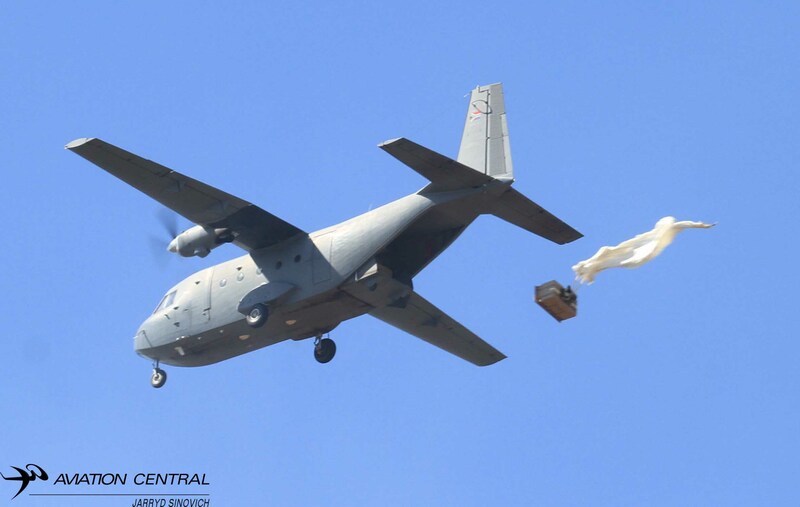 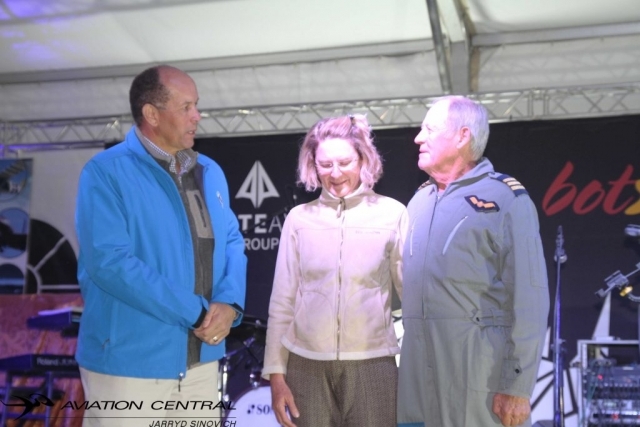 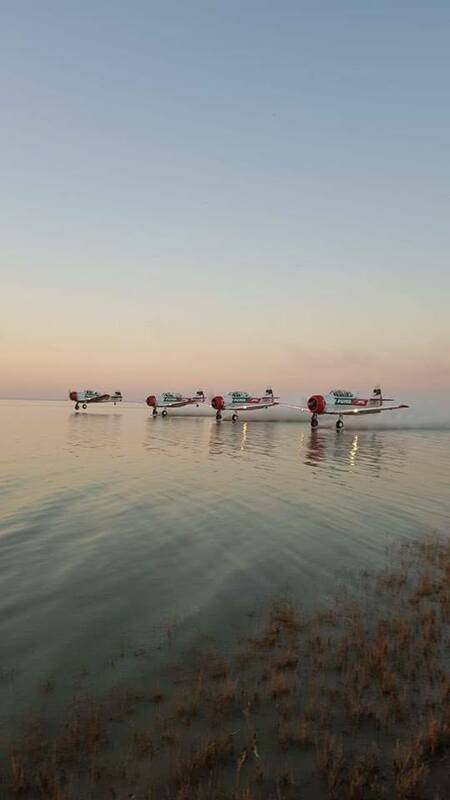 It is located near the village of Sowa, whose name means salt in the language of the San.The Race for Rhinos in now in its forth year running and this year was the biggest amount of aircraft taking part in the race, a new world record. 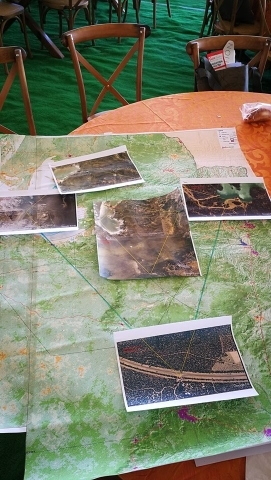 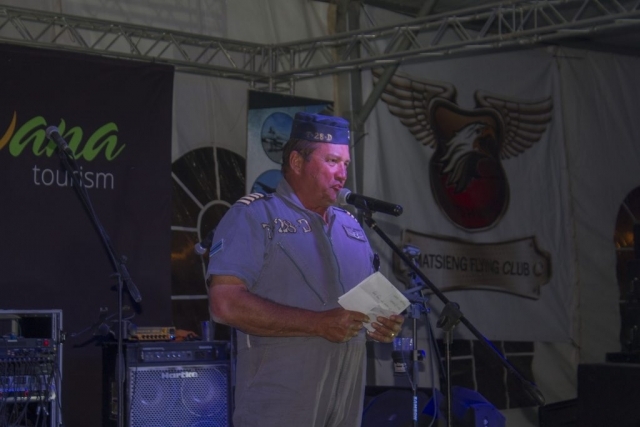 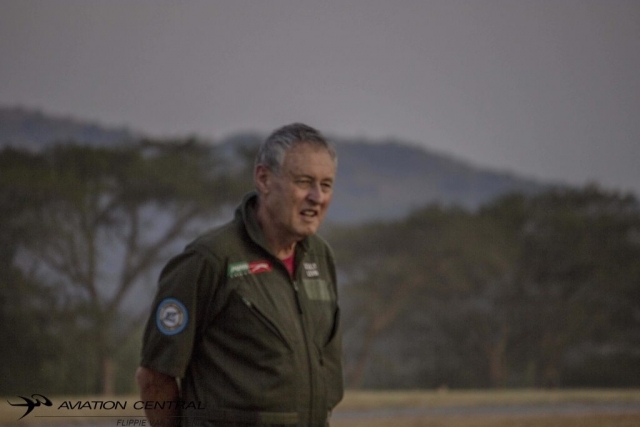 The vision for the race came from veteran pilot Chris Briers who has planned all four races to date, with the help of the Botswana government ,Botswana Tourism and the Botswana environmental Department.This is all to help stop the poaching of Africa’s most majestic animal the Rhinoceros . These animals are being poached on a daily rate and need to be protected before they’re are extinct. 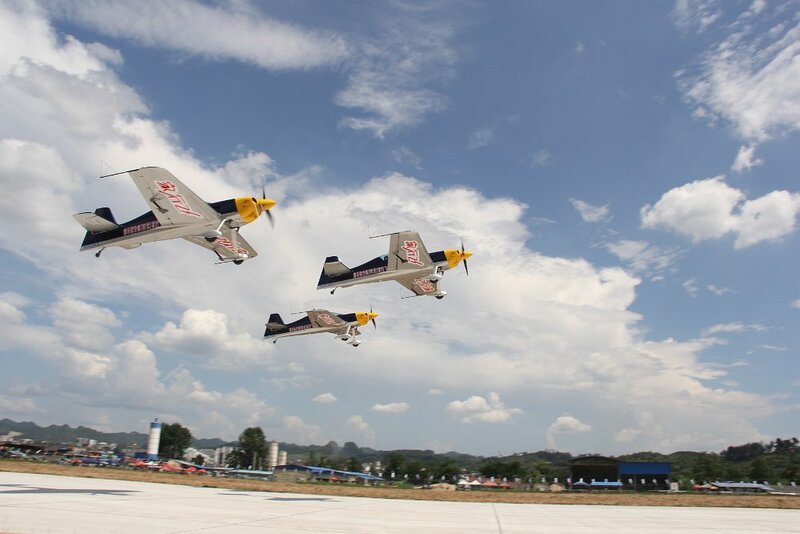 Air racing is a highly specialised type of motorsport that involves aircraft or other types of aircraft that compete over a fixed course, with the winner either returning the shortest time, the one to complete it with the most points, or to come closest to a previously estimated time. 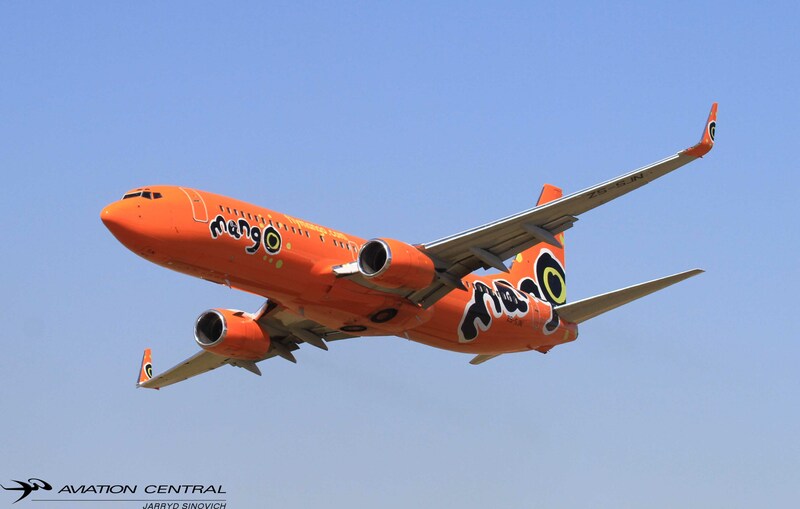 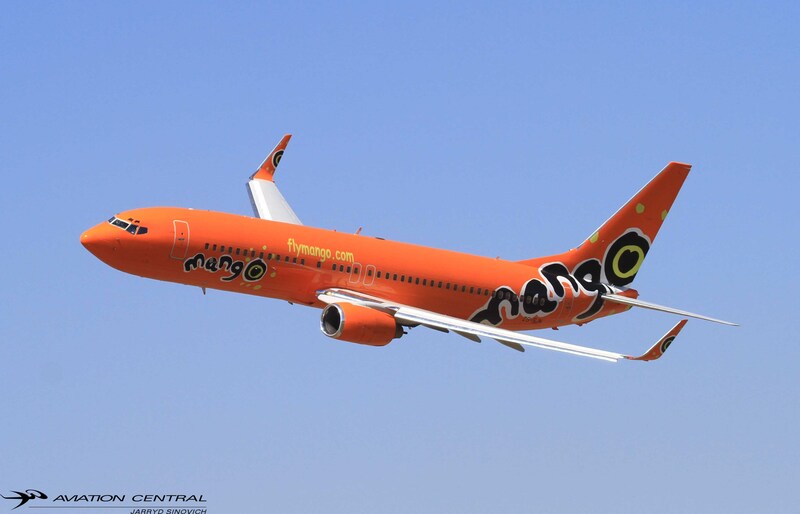 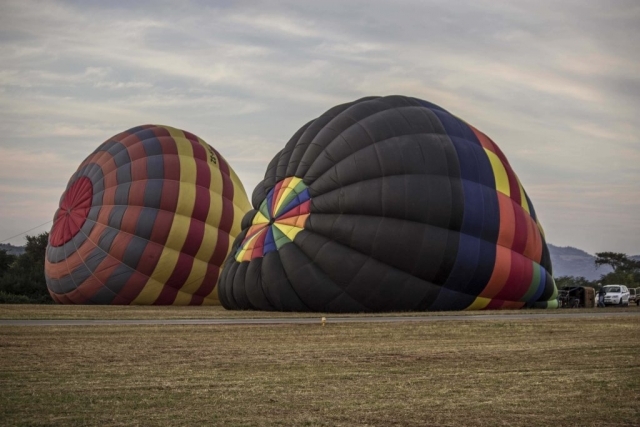 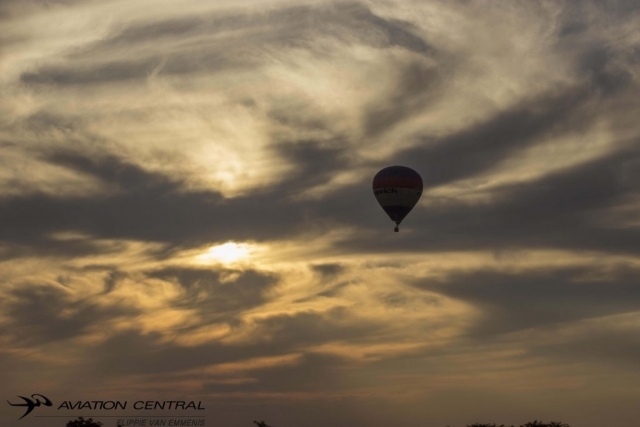 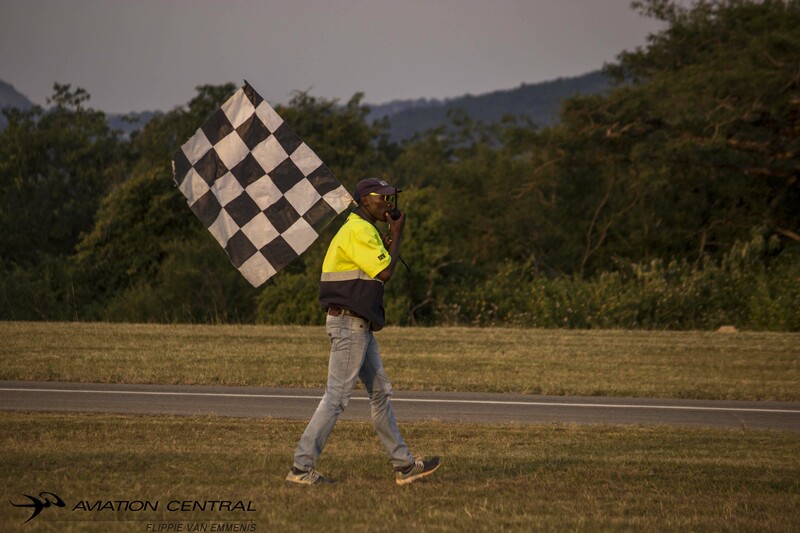 After arriving from Wonderboom National Airport in Pretoria on the Thursday before day1 of the Race. 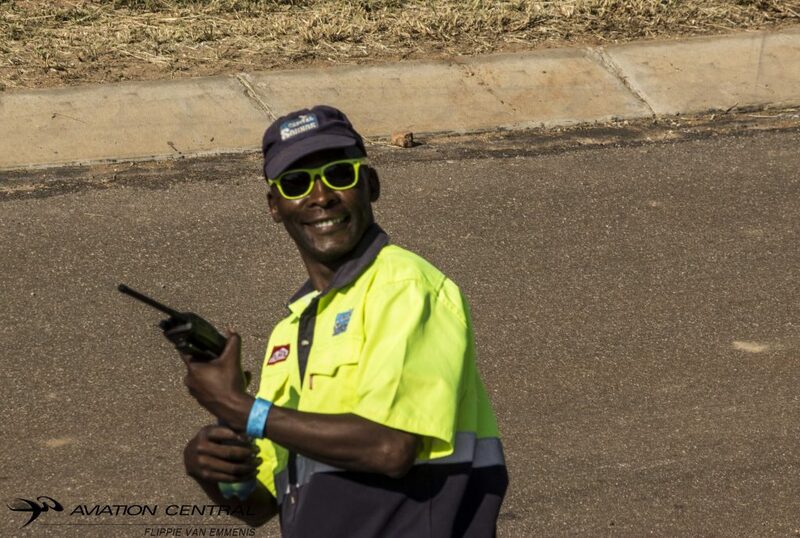 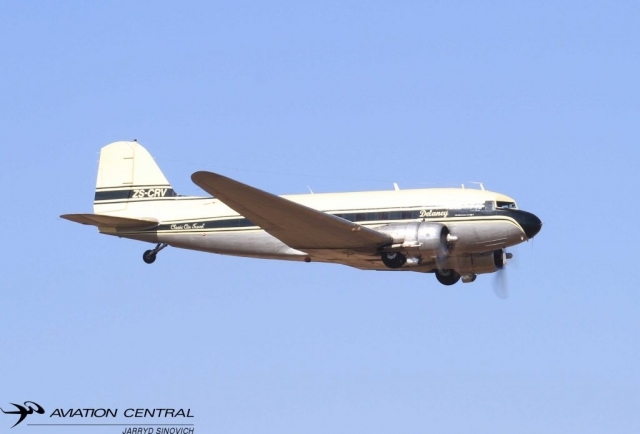 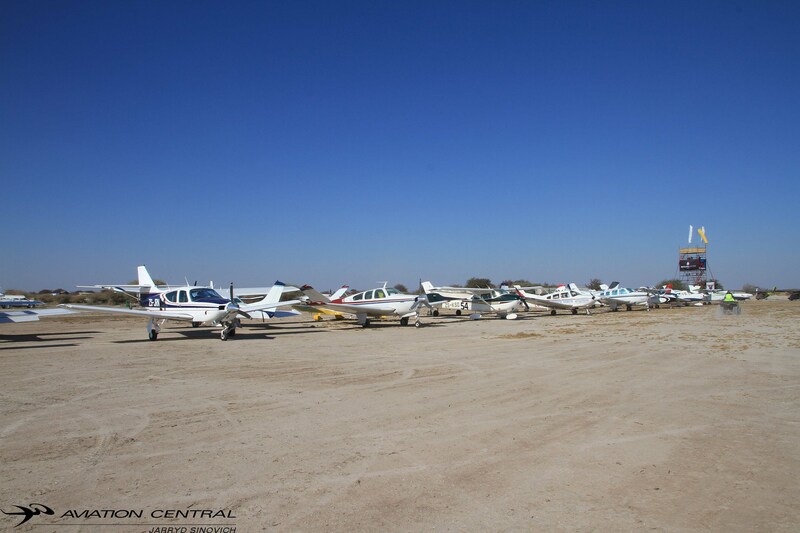 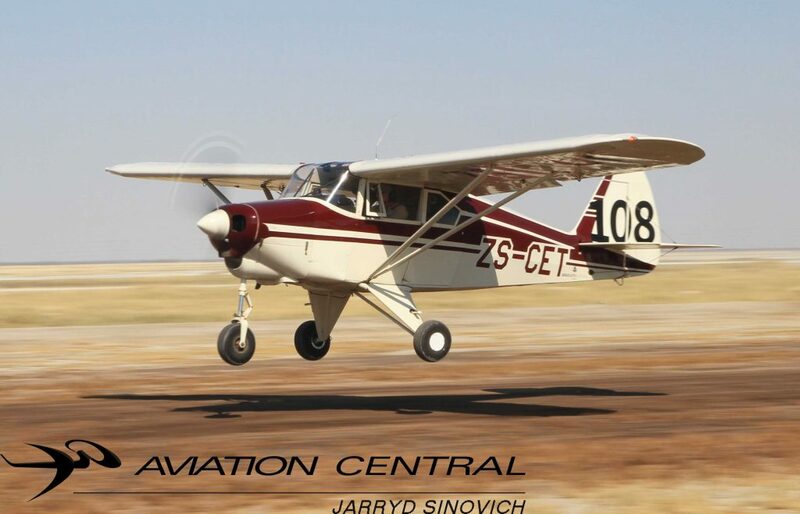 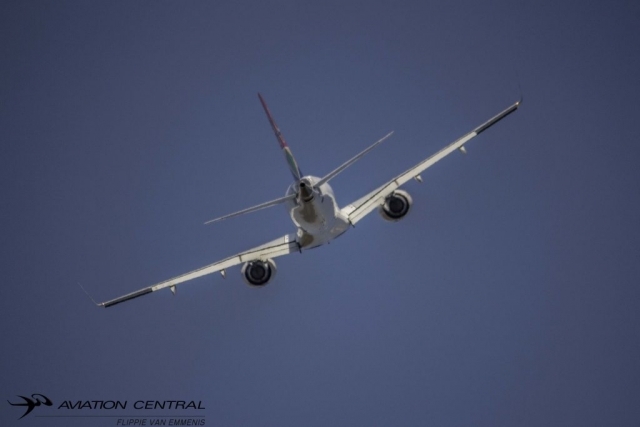 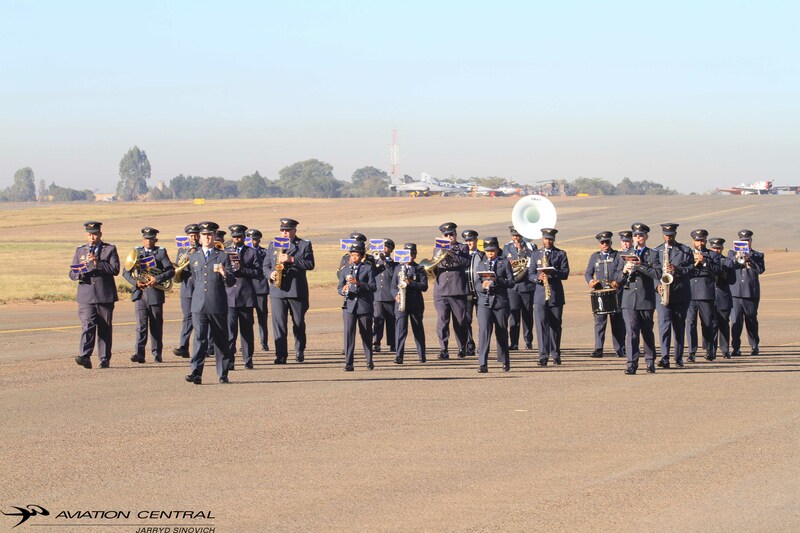 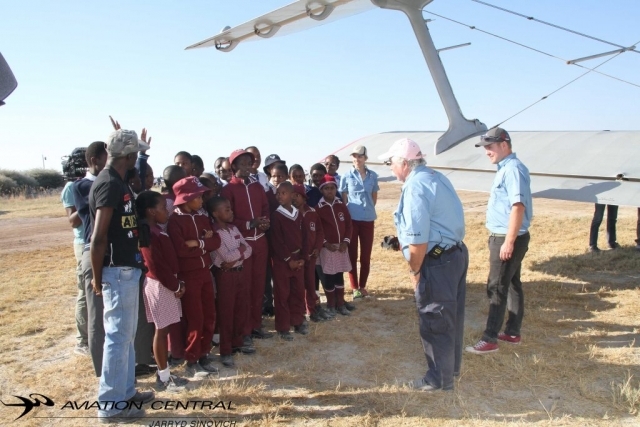 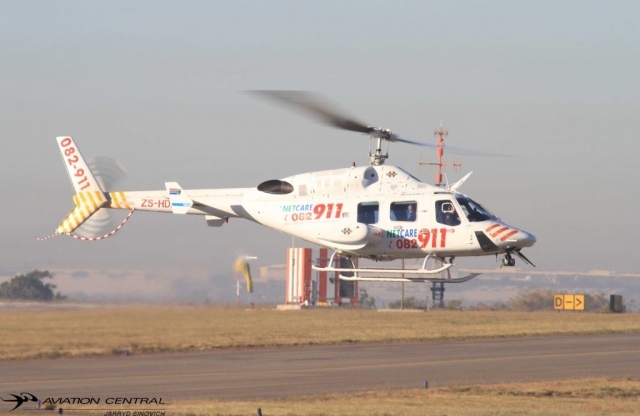 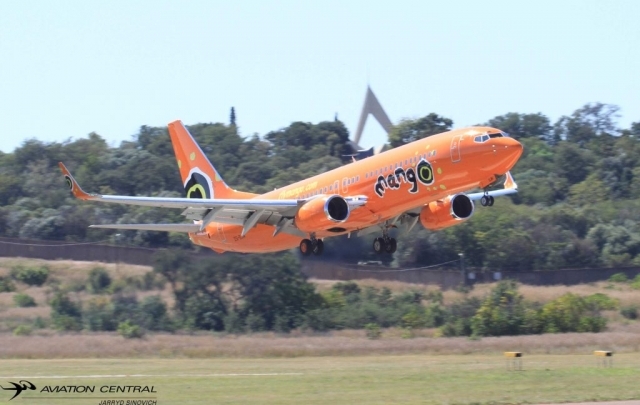 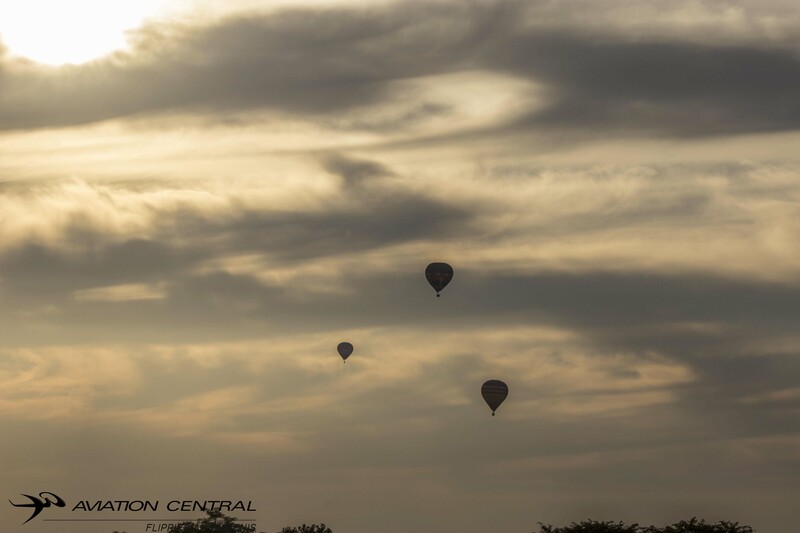 We were greeted by all of the known faces in the Southern African Region of the aviation community,while many aircraft were still arriving over head the pans above us. 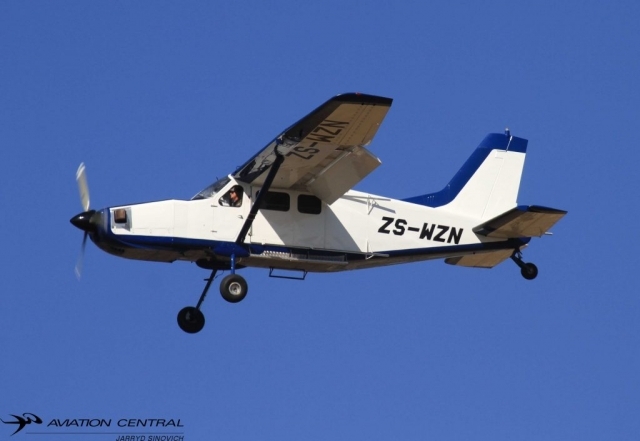 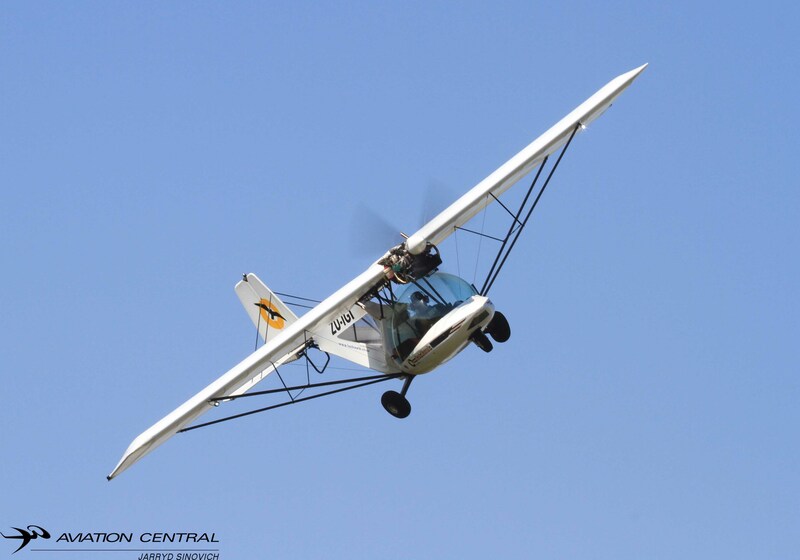 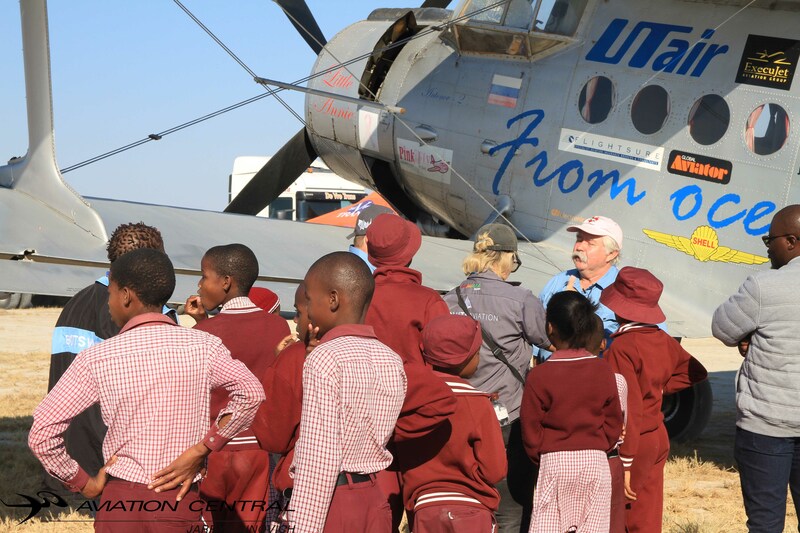 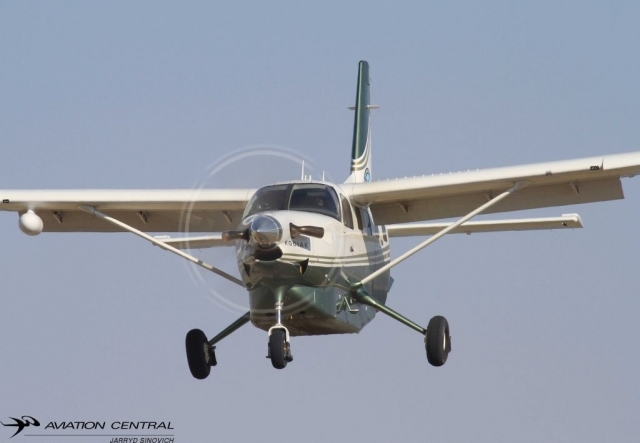 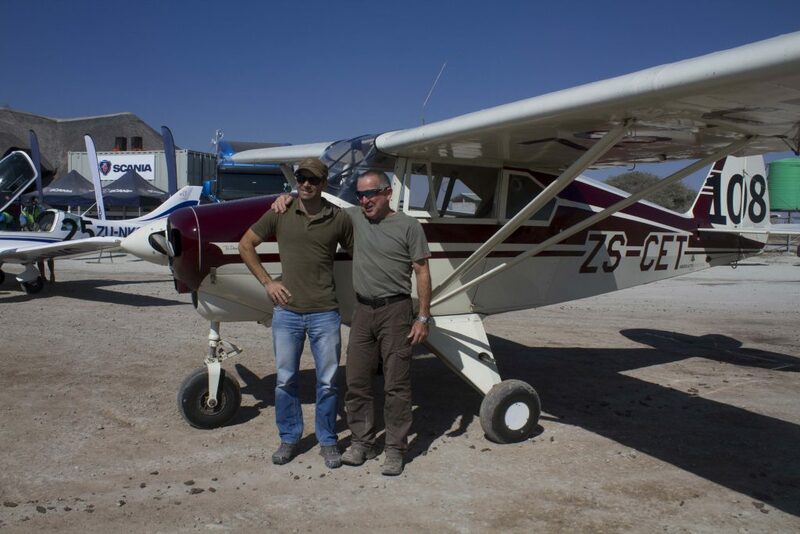 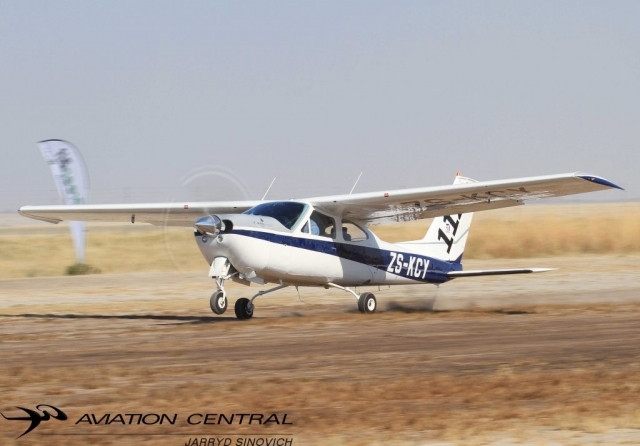 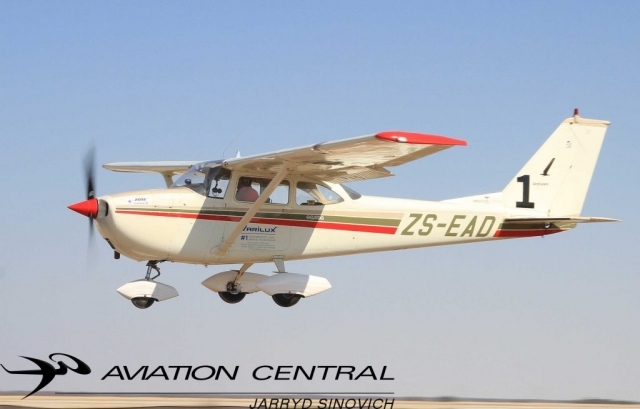 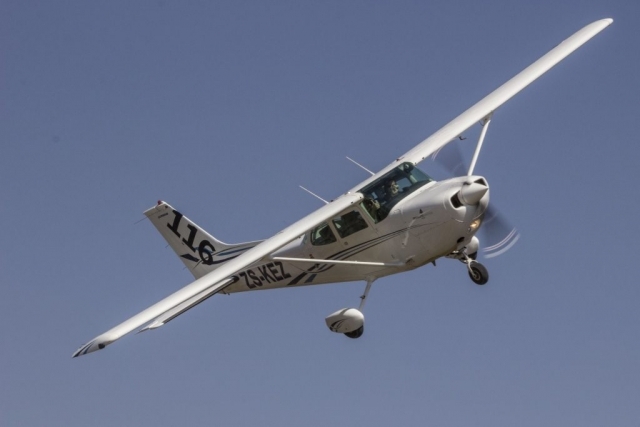 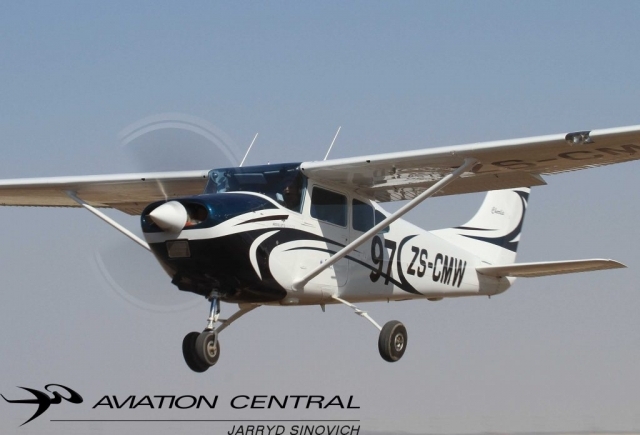 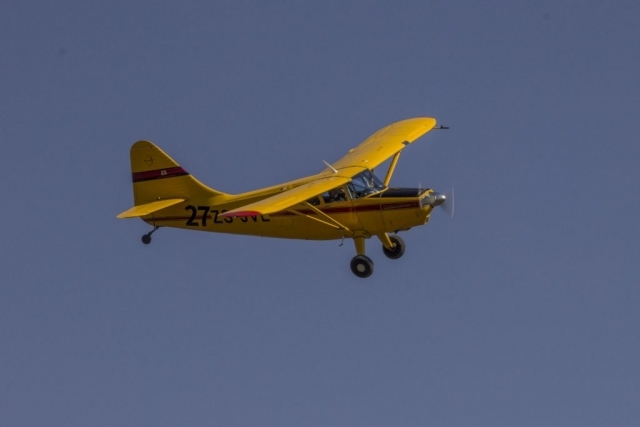 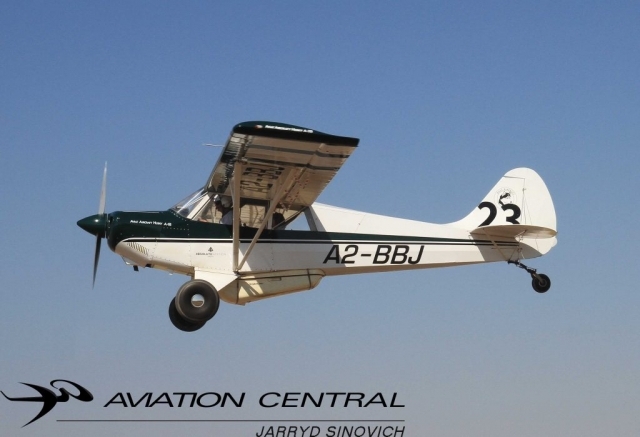 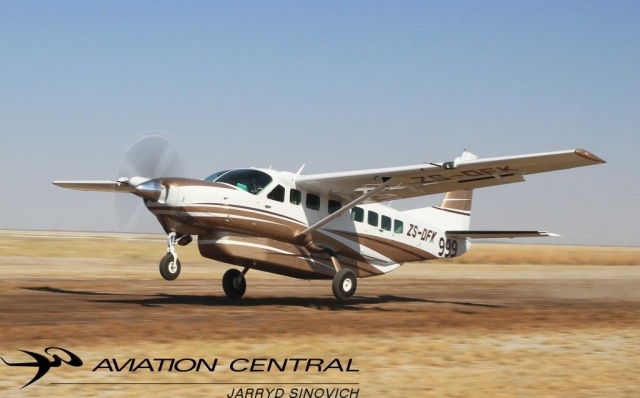 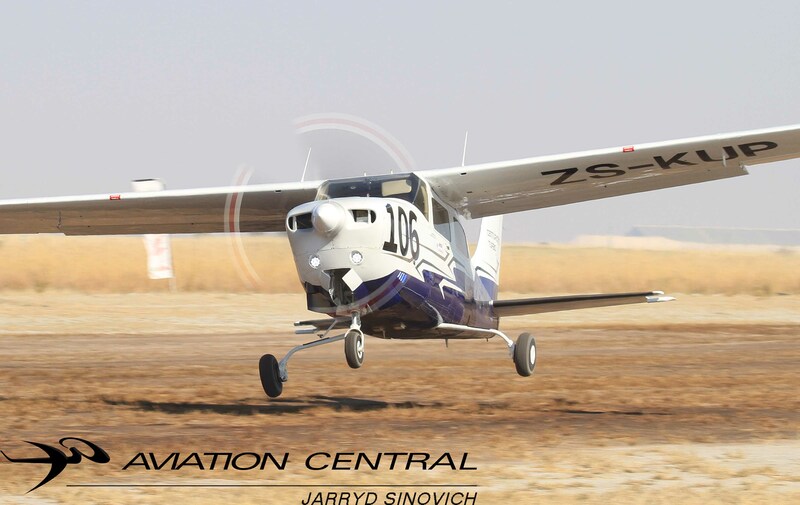 We had a fun-filled flight from Pretoria to Pilanesberg to clear customs and from their on to Sua Pan on ‘Little Annie’ An2 piloted by Jon-Marc and Mark Hill.We were allocated to our accommodation in comfortable tents that were placed up before arrival. 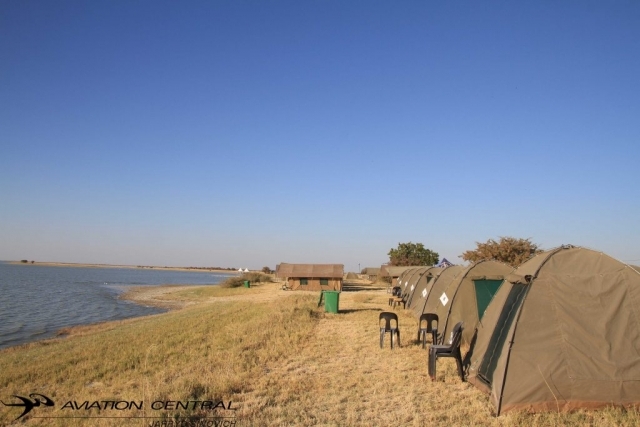 Each day our tents were cleaned, beds made and all our valuables all in one place! 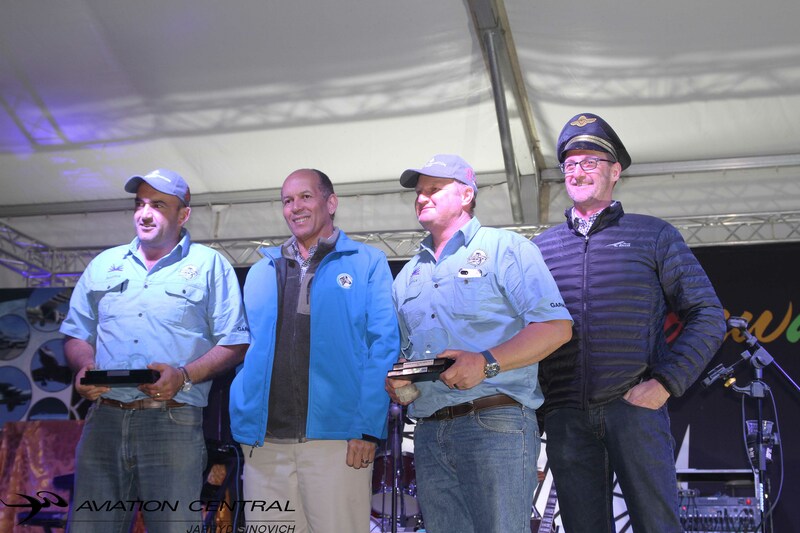 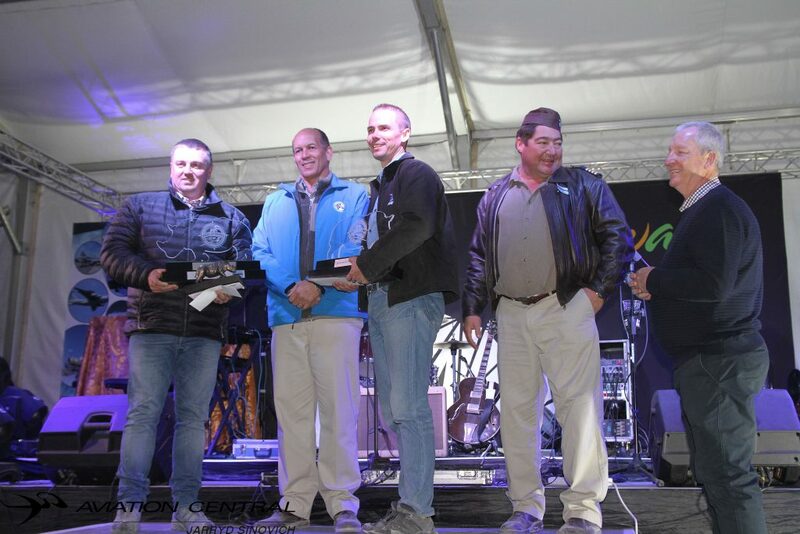 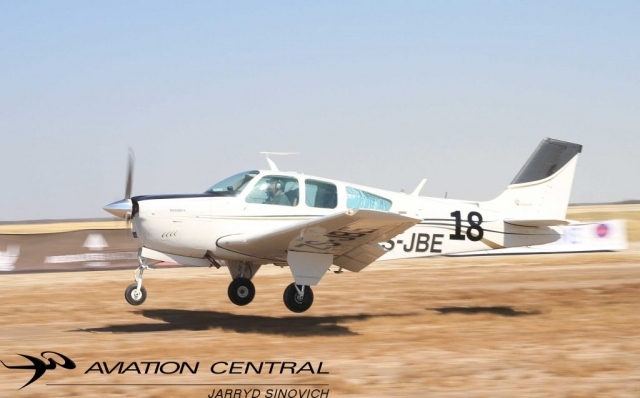 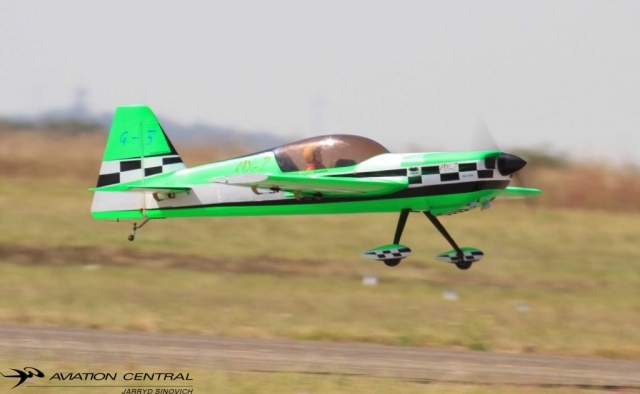 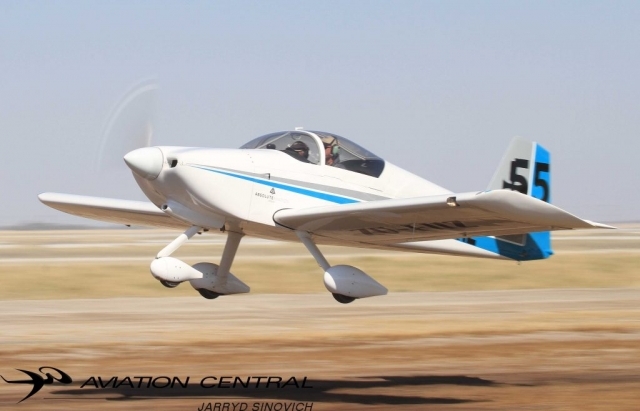 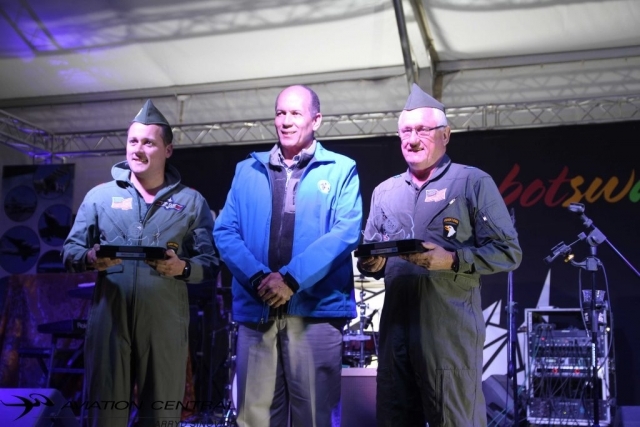 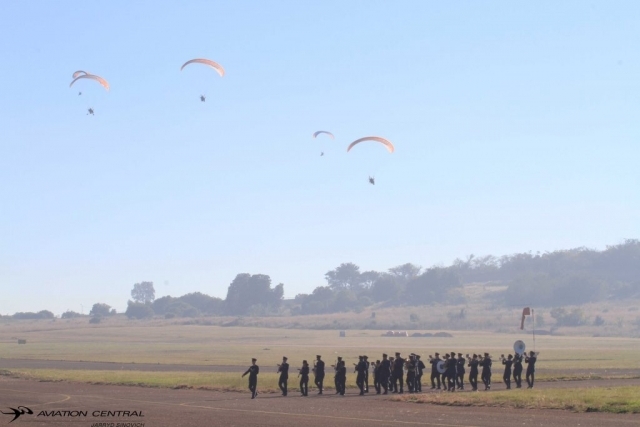 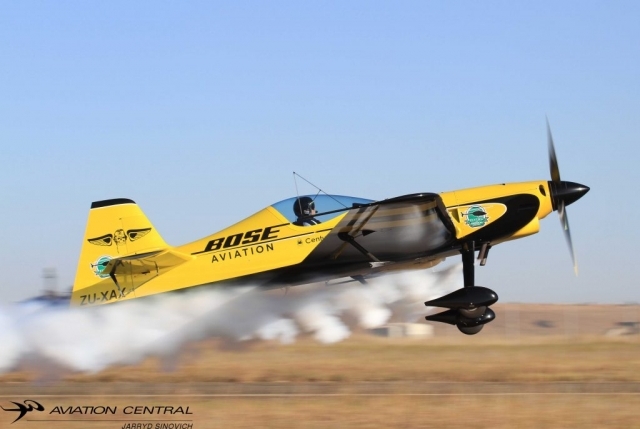 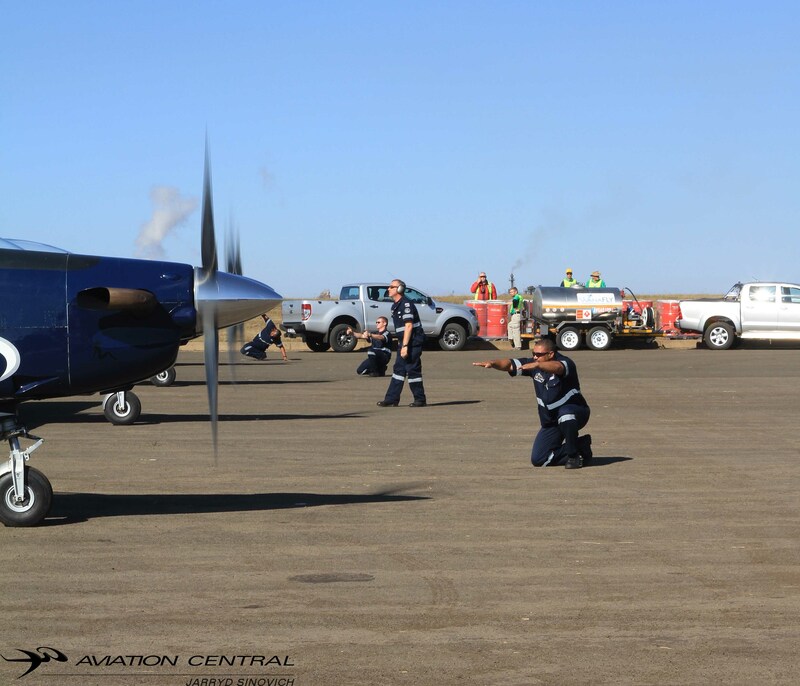 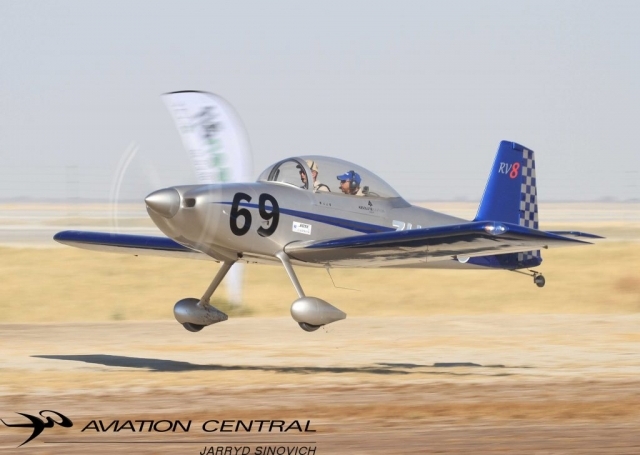 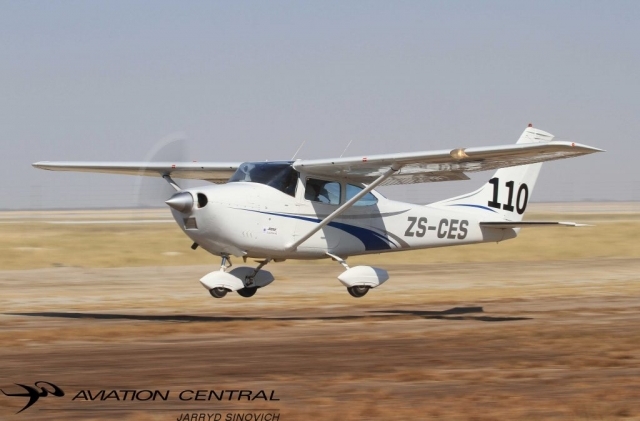 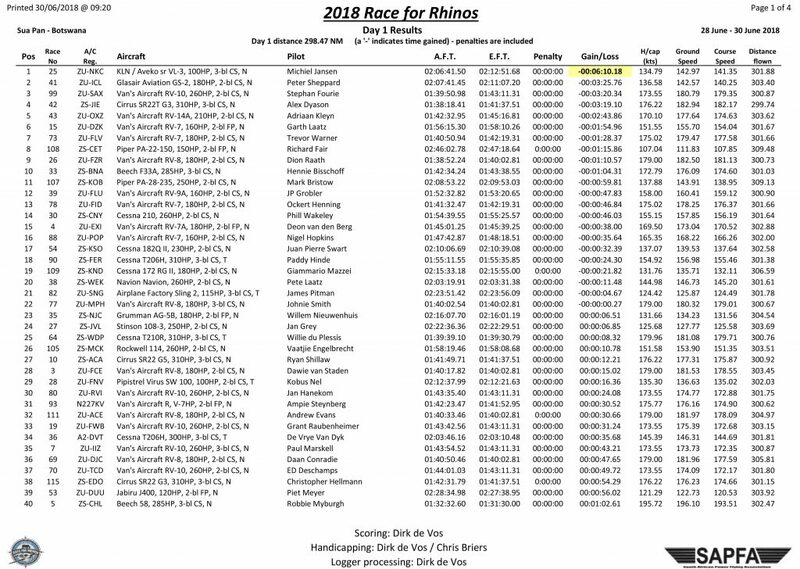 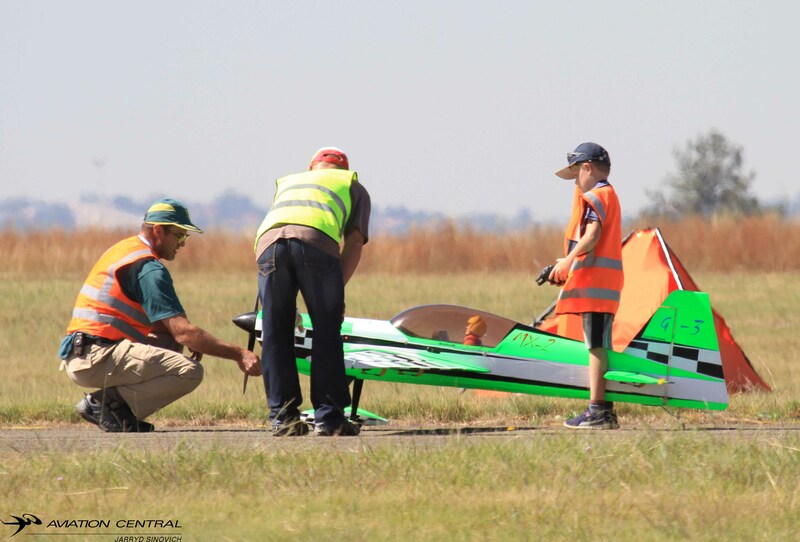 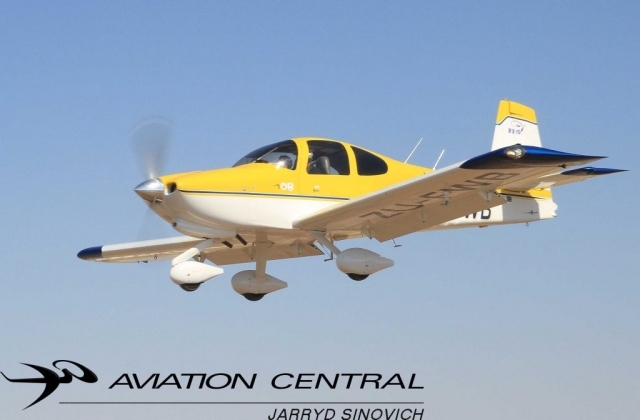 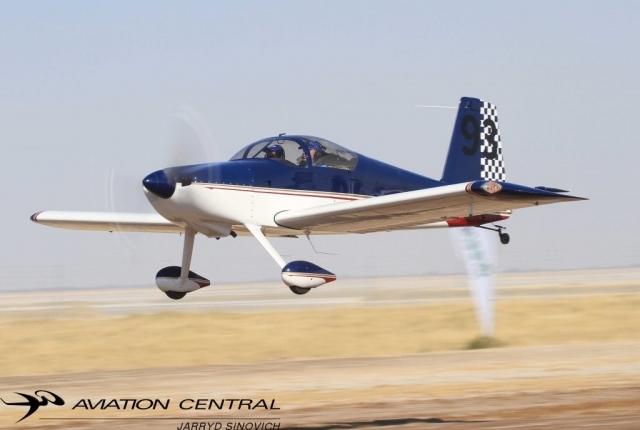 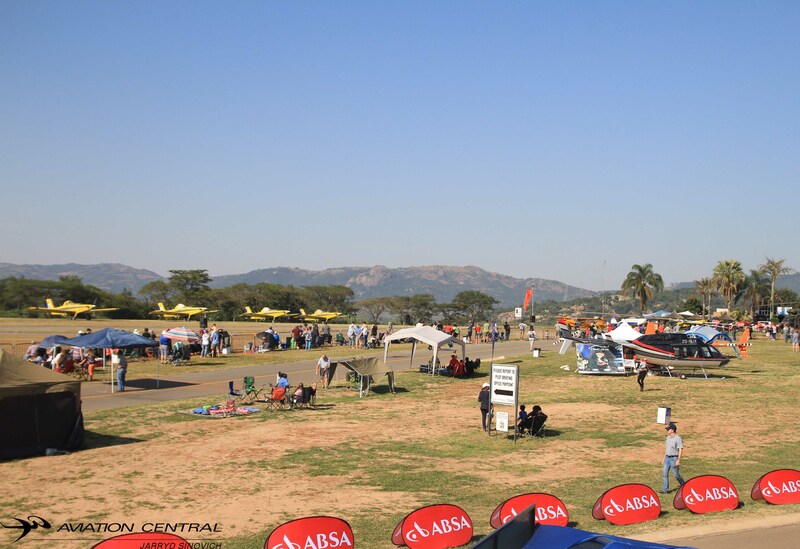 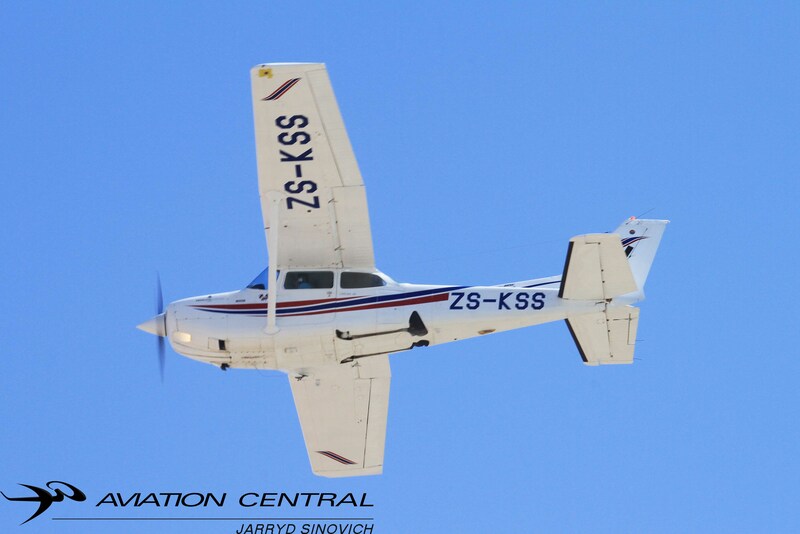 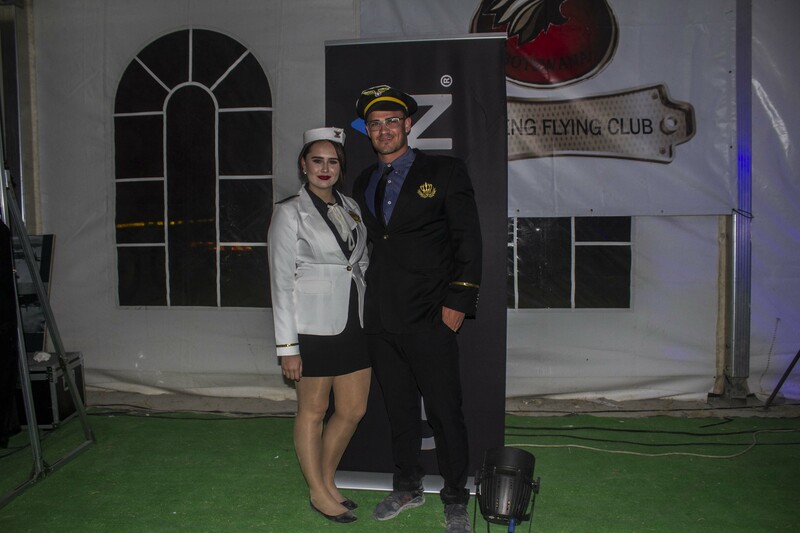 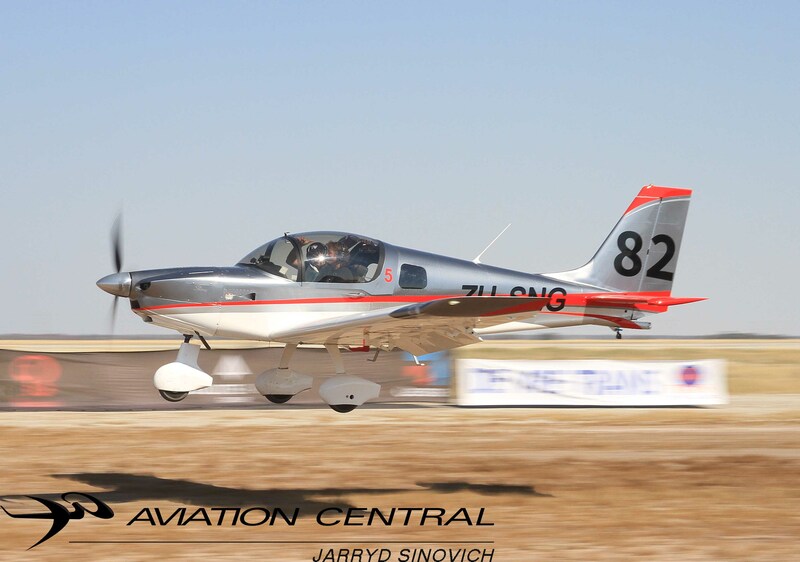 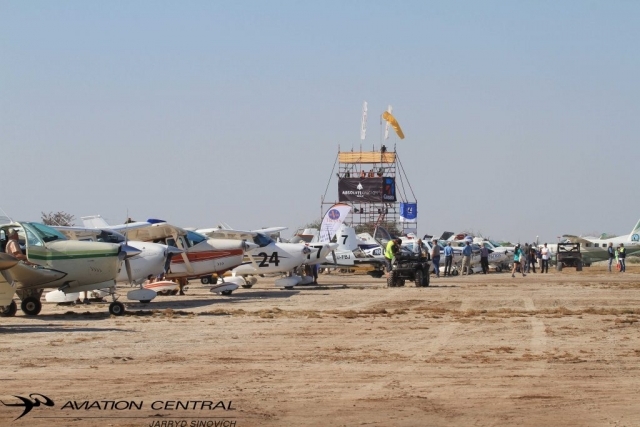 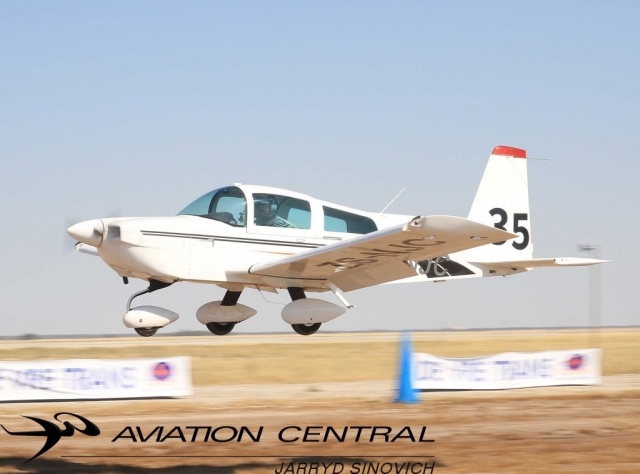 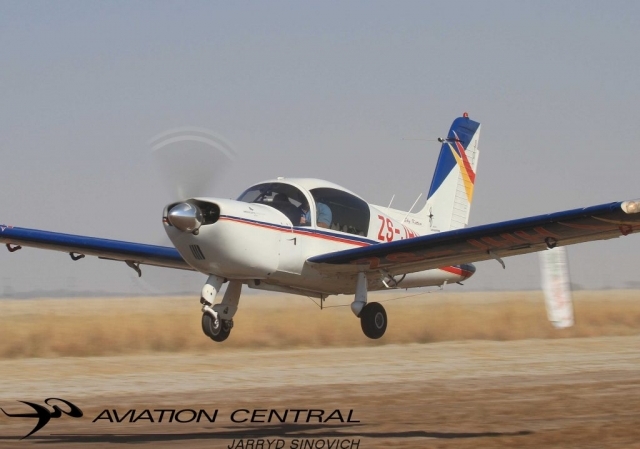 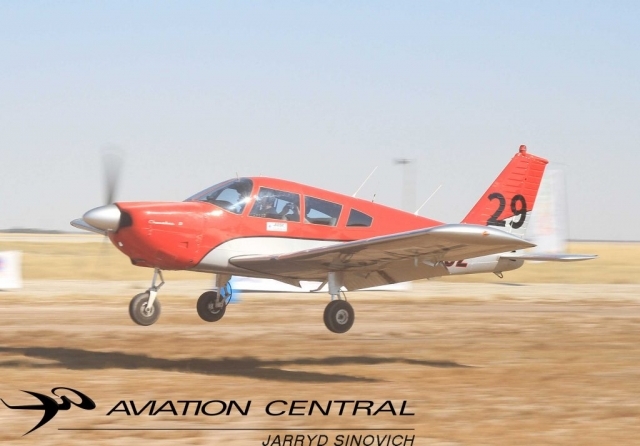 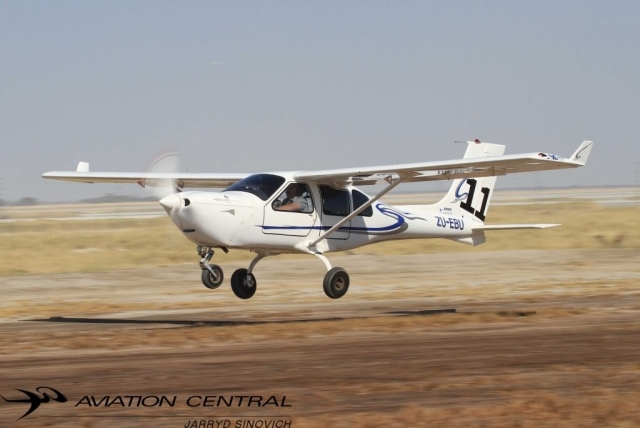 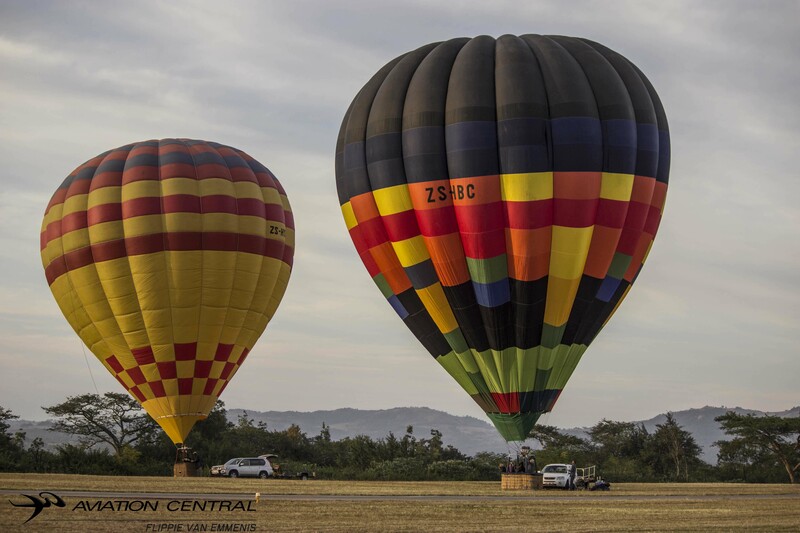 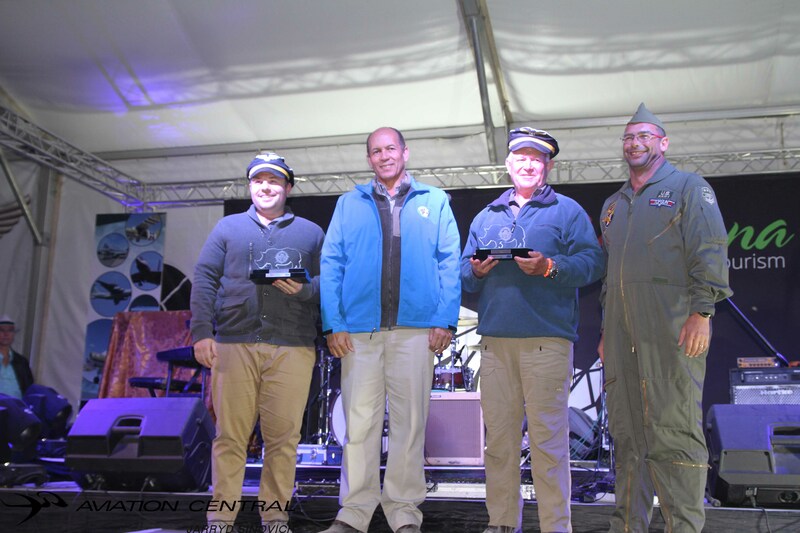 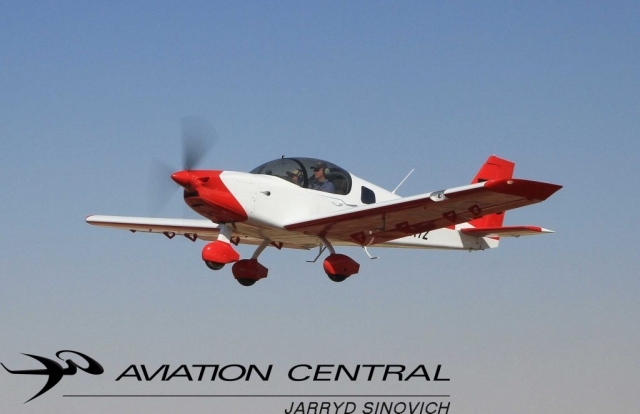 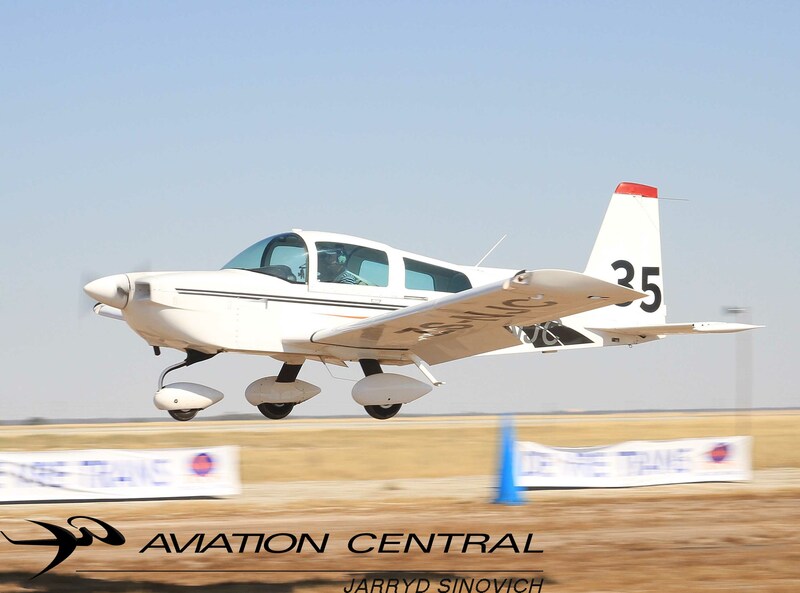 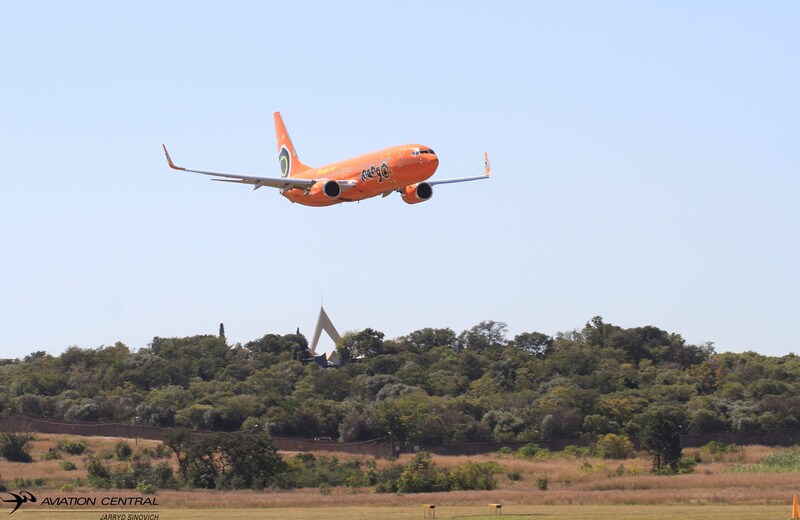 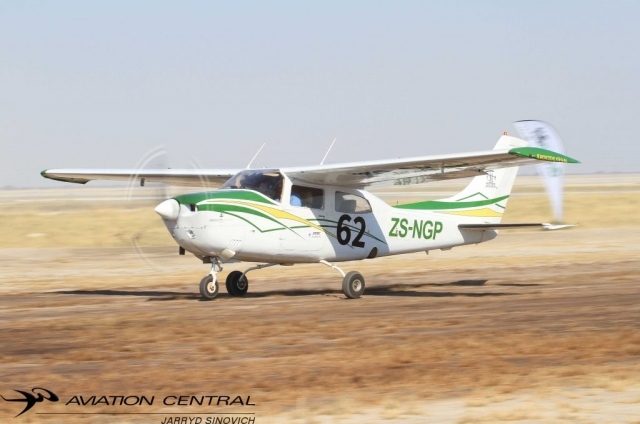 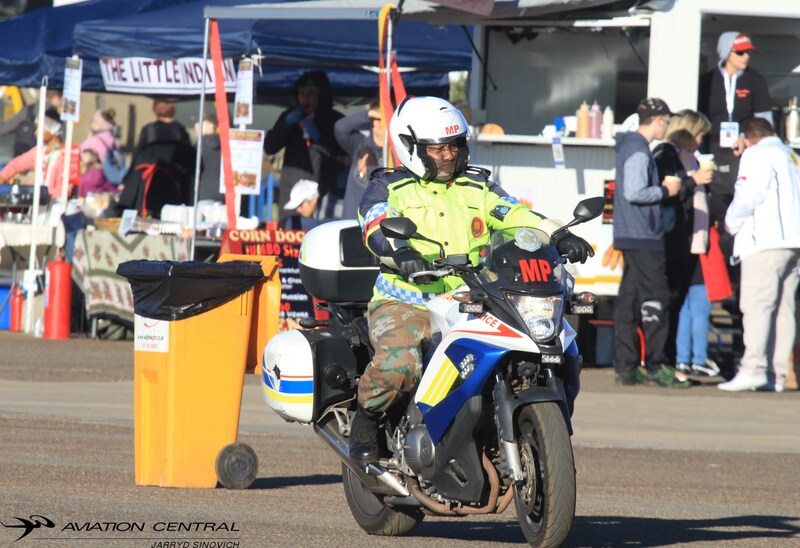 Biggest air race to date was in Bloemfontein in central South Africa with 111 entries, The 2018 Race for Rhinos is 117 entries. 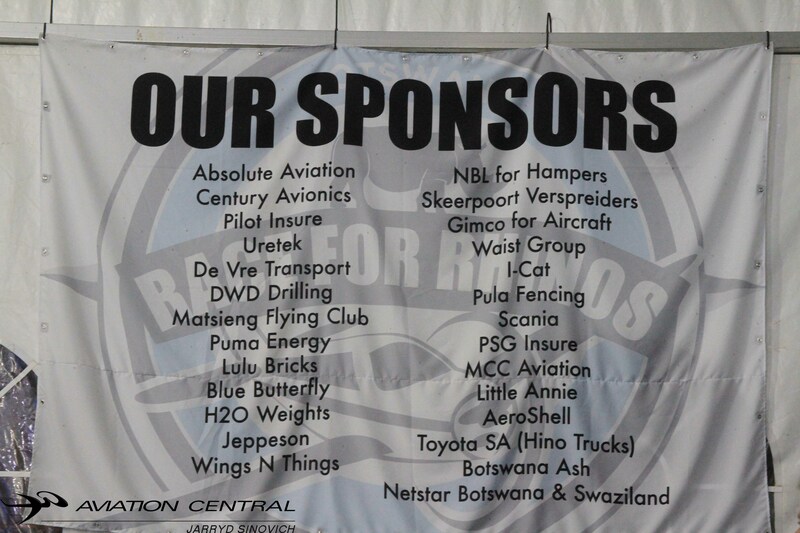 The huge marquee that was put up just in front of Race Headquarters where Brian Emmenis and his team were Broadcasting from and was our daily alarm clock playing music from 6am in the morning to get the competitors up and amped for the day ahead.At the Marquee we were served three meals a day,obviously that being breakfast,lunch and supper.The bar area was also placed there where we could enjoy many of the sunsets on shores of the pan and the evenings entertainments from various musicians. 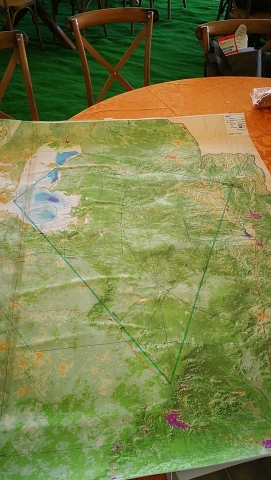 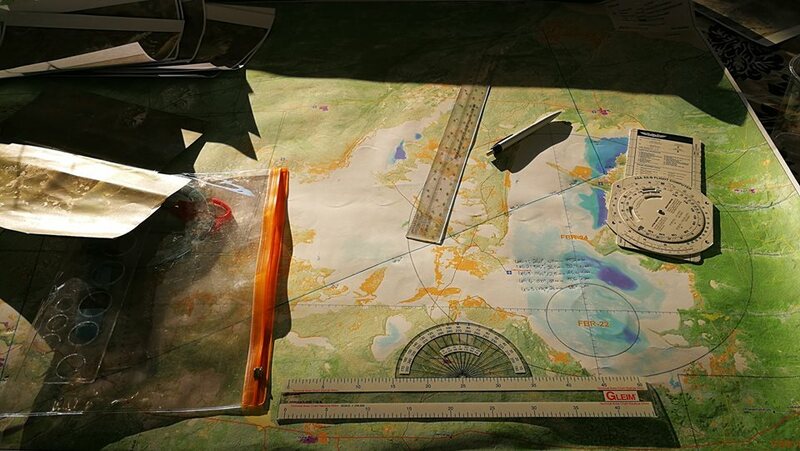 Most of the competitors were busy with their plotting’s and race briefings before everyone made route for the tents quite early before the start of day one of Thursday evening. With our daily alarm clock getting us up nice and early thanks to Capital Sounds, we headed off to freshen up in the portable showers, straight after that to the filling breakfasts and Cappuccinos on tap to get all competitor’s ready for day 1 of the race. 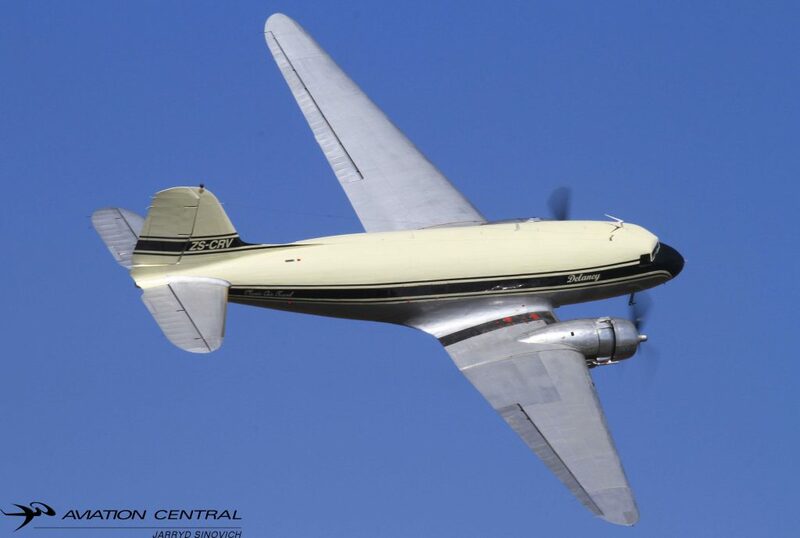 Pilots and Navigators then made their way to their aircraft while the Bathawk and Bantam took off for the Telstar mission to communicate with Race authorities if their had to be a emergency from one of the competing aircraft along the route. 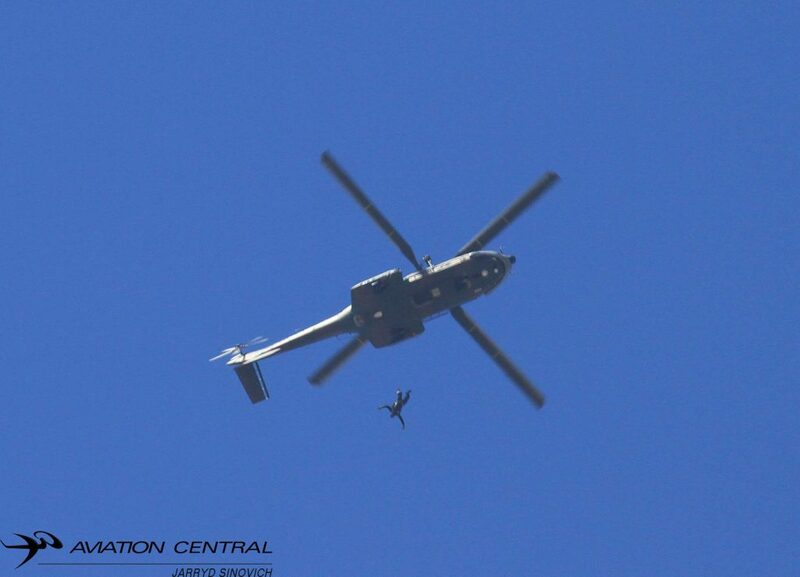 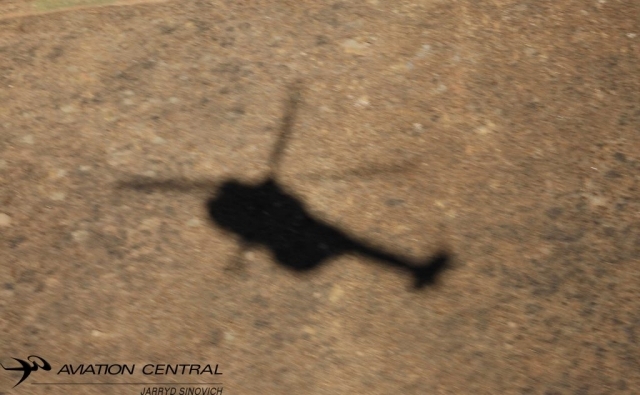 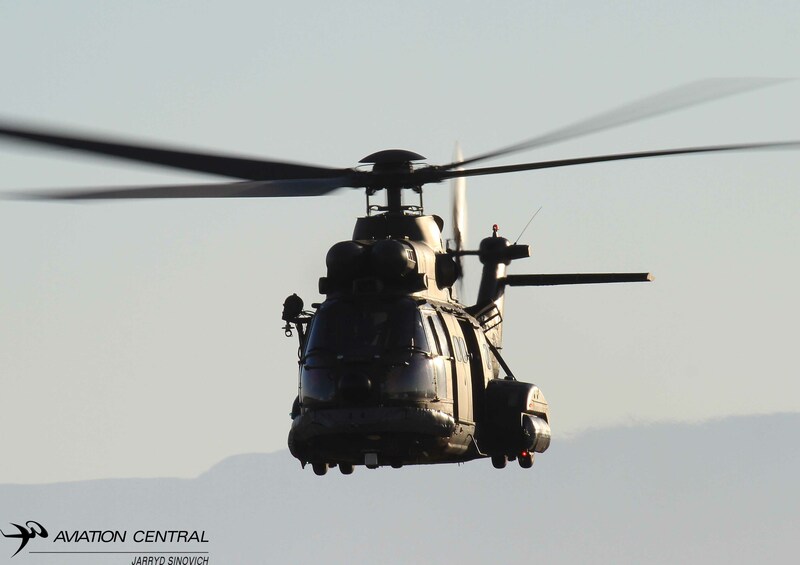 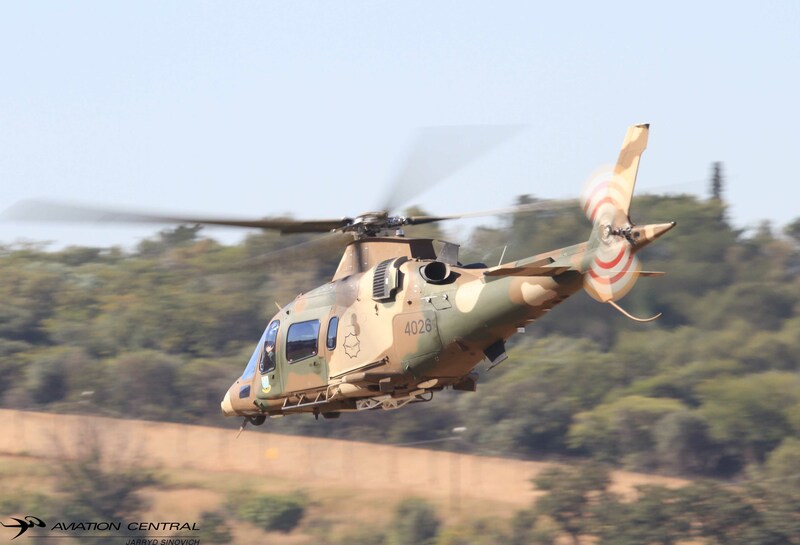 Chris Briers took media up in the Agusta A119 to get some aerial shots of different competitors. 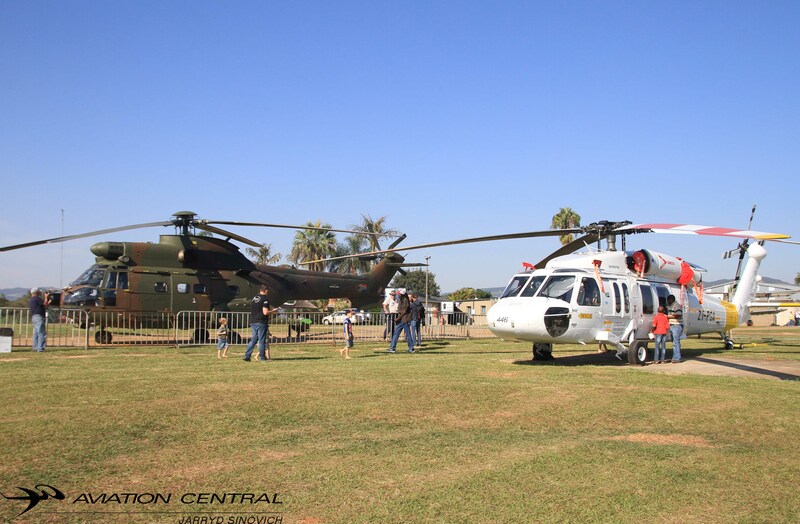 The chopper was donated 20 hours of flying during the race days. The Kingdom of Sua Pan had its own non-radio station from Capital Sounds, filling us in with any information for the days proceedings with most of the base having sound equipment reaching far and wide into the distance. 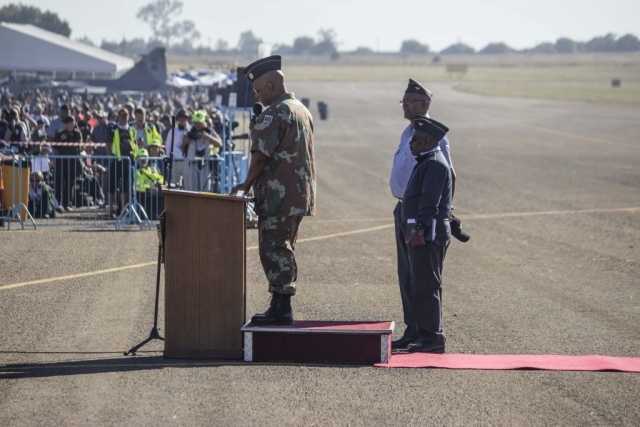 To make sure no one couldn’t miss out what was taking place. 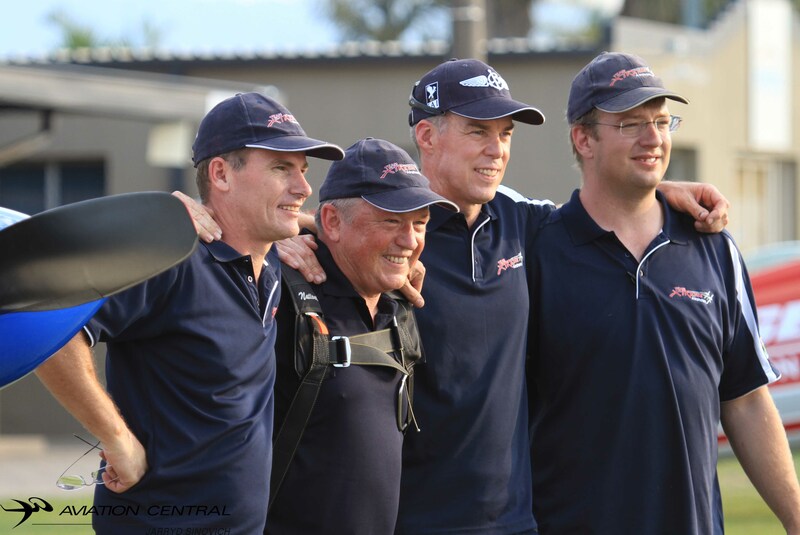 The team comprised of Brian Emmenis, Leon Du Plessis, Rodger Coetzee, Ricky Fouche, Eric Nkomo. 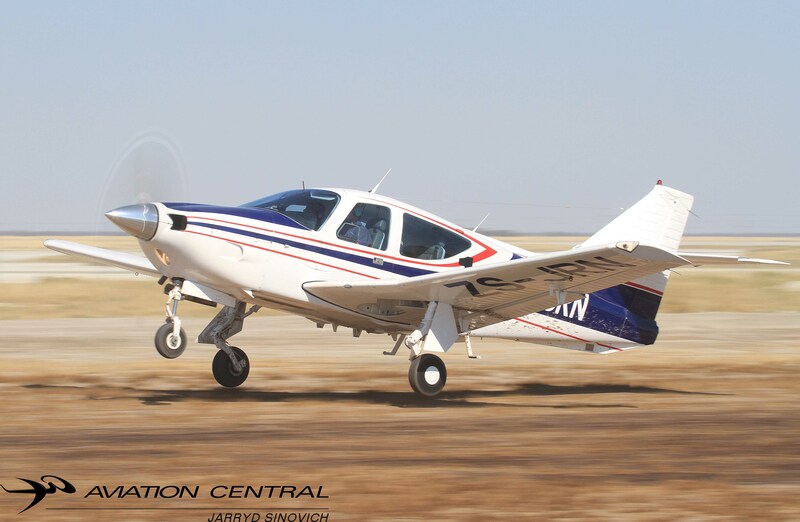 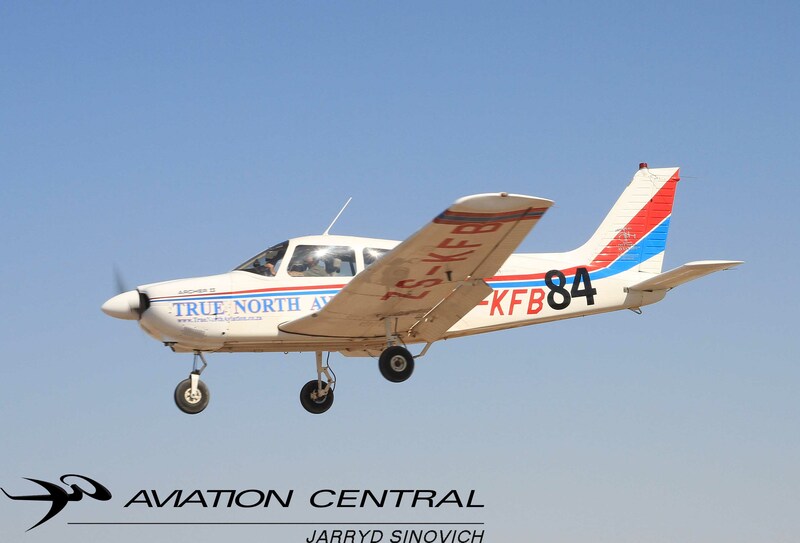 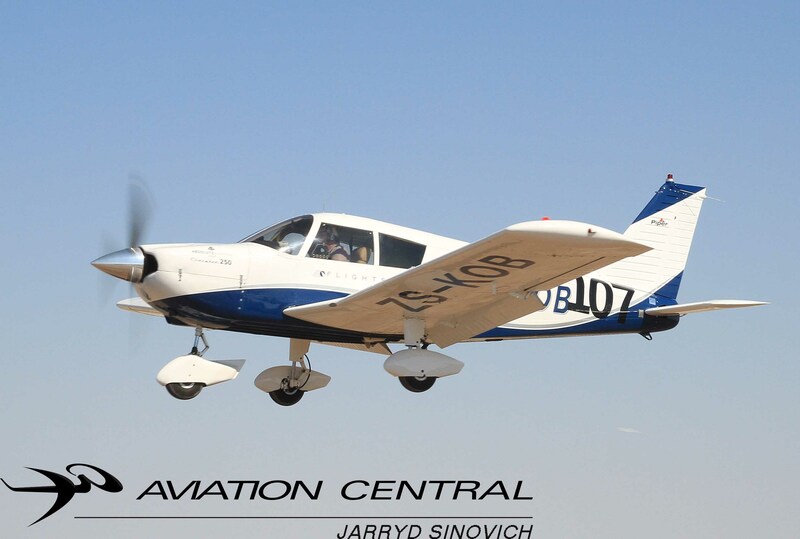 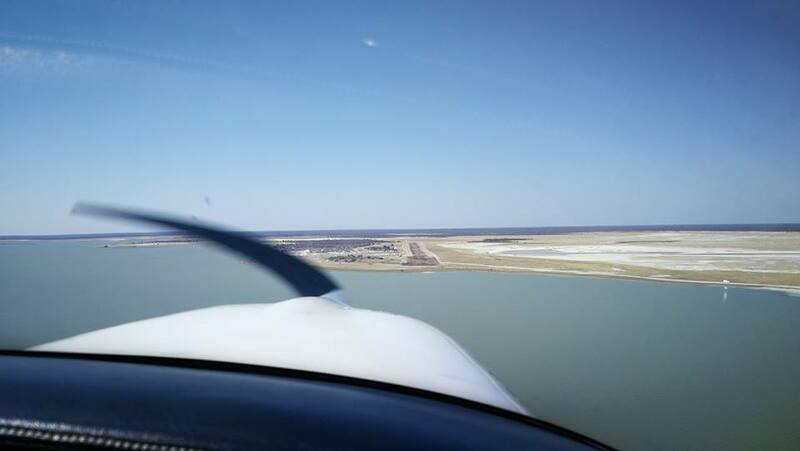 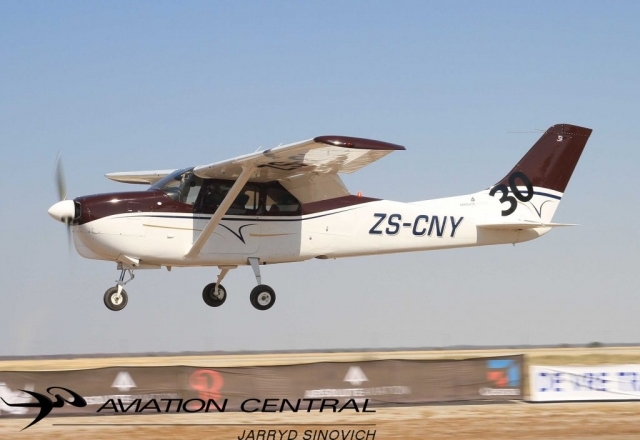 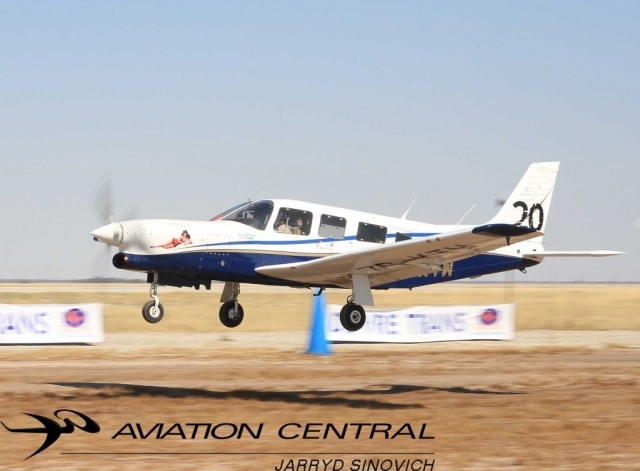 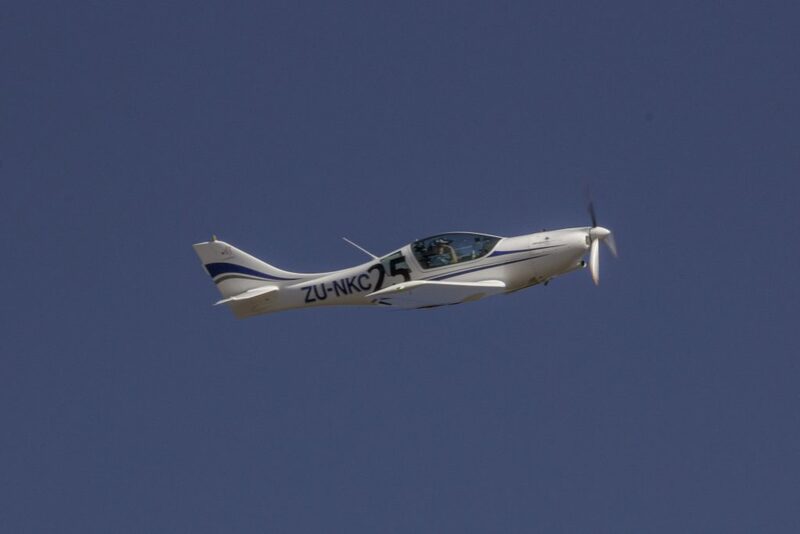 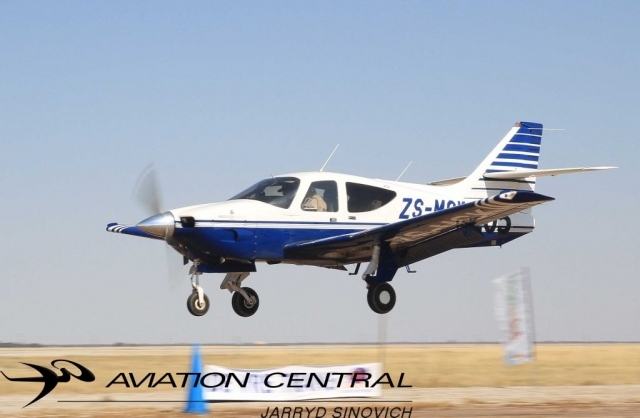 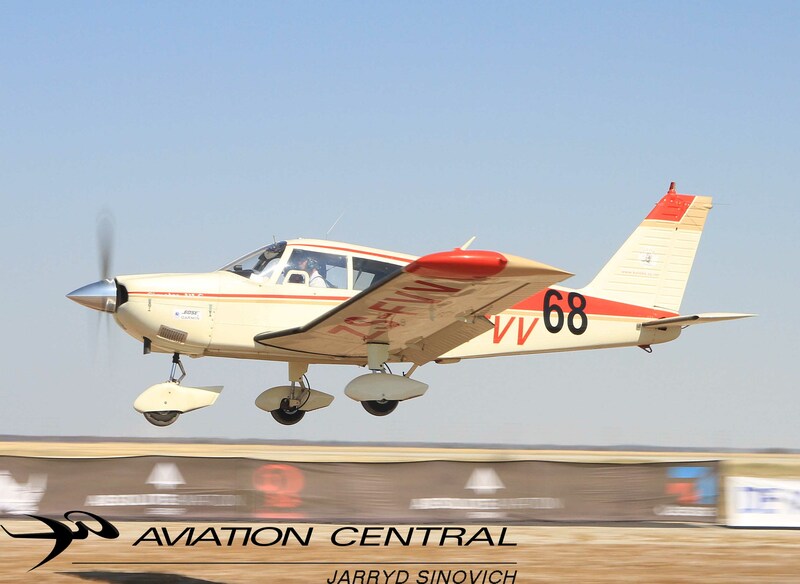 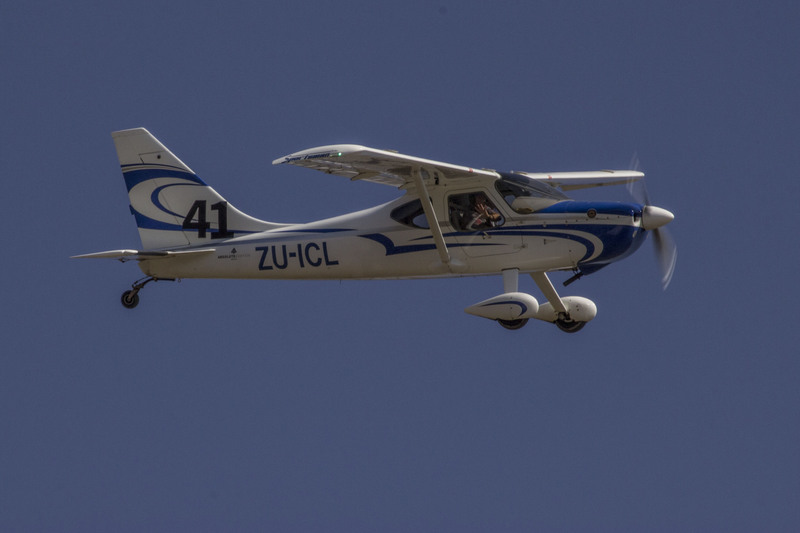 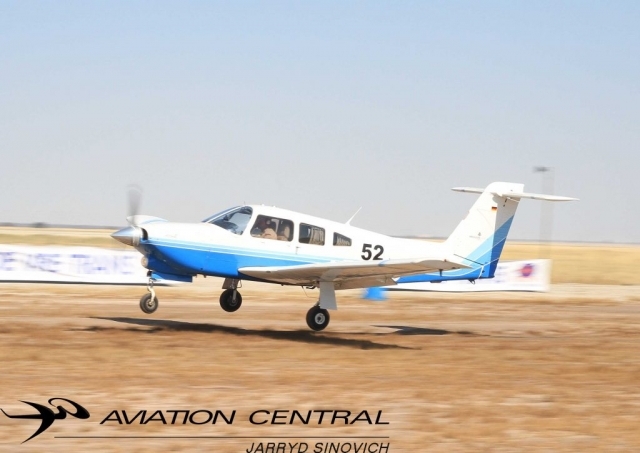 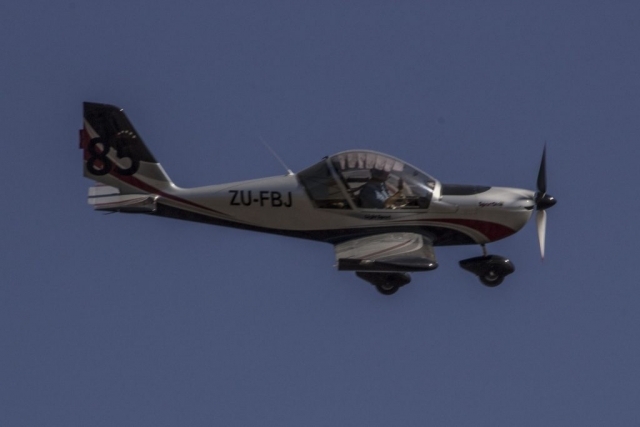 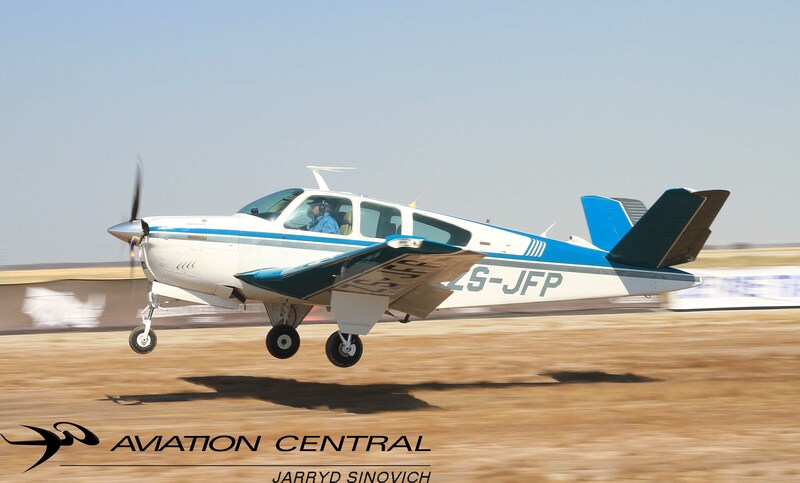 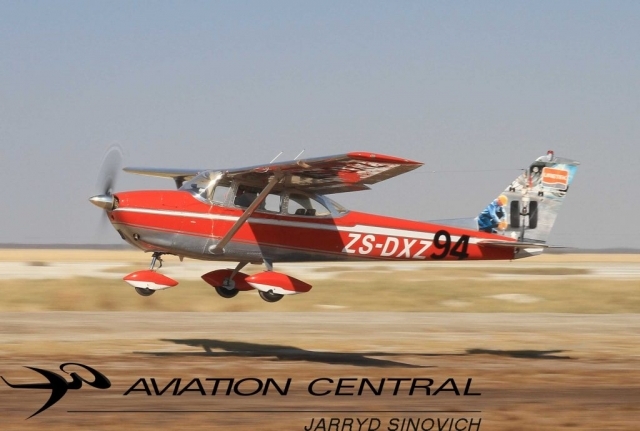 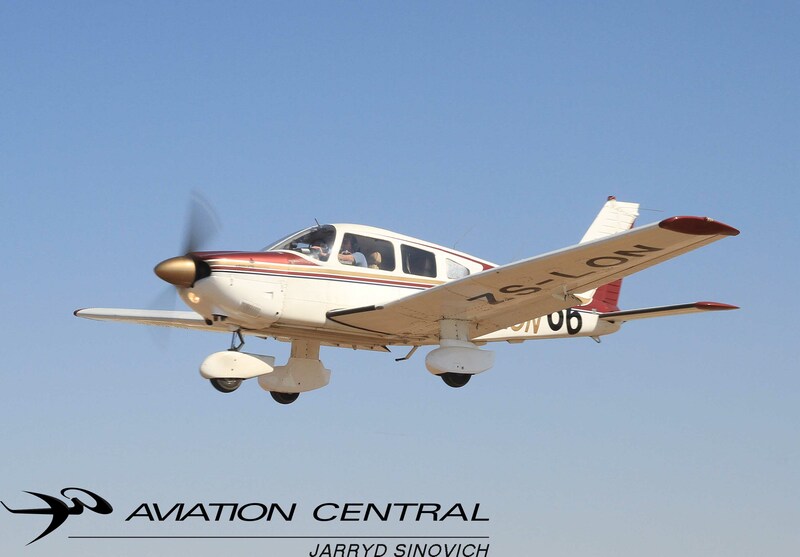 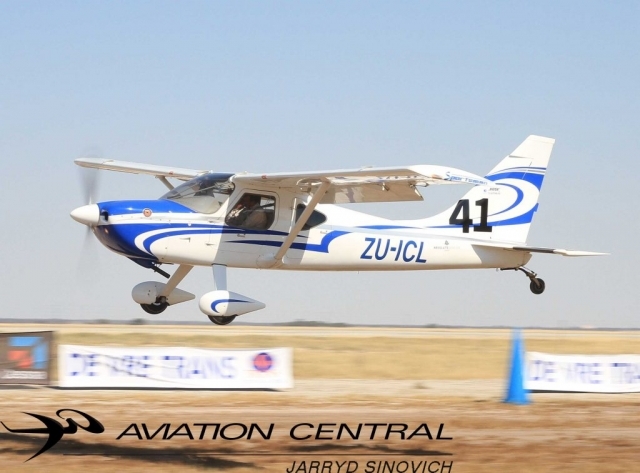 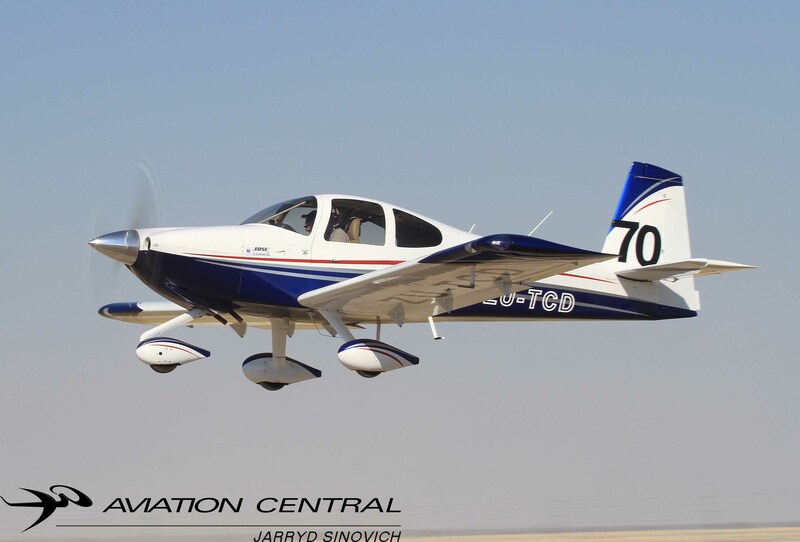 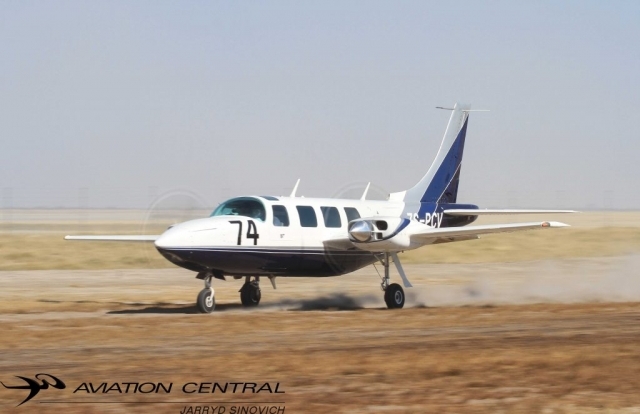 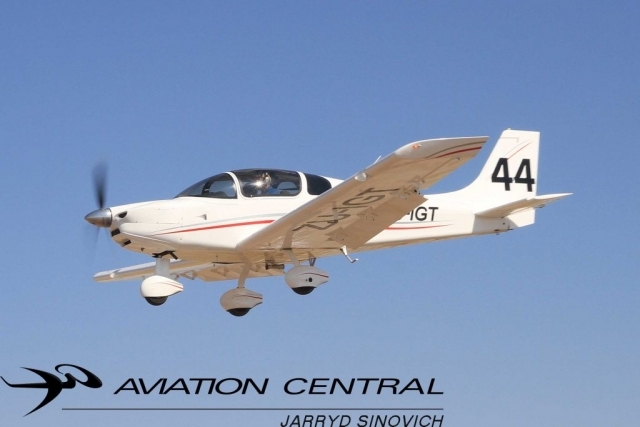 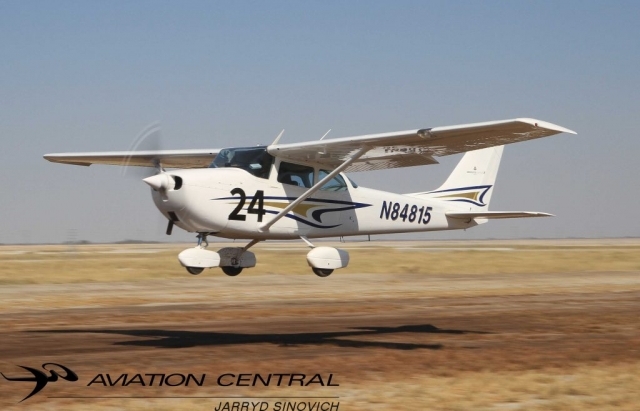 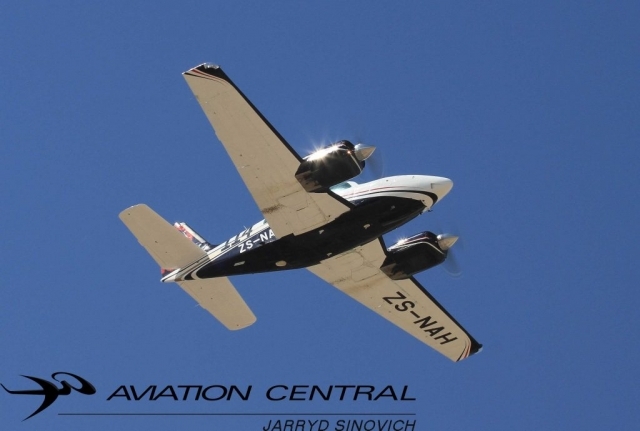 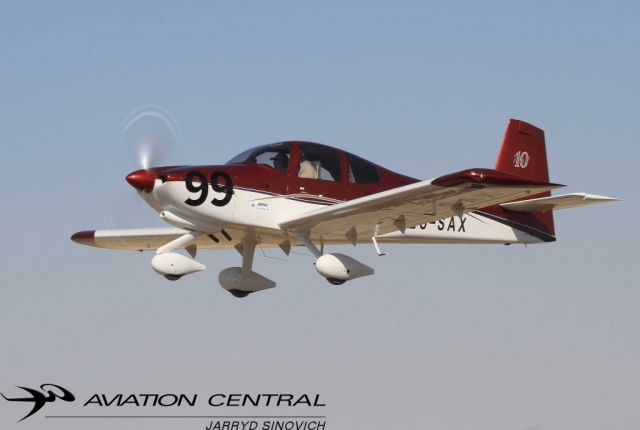 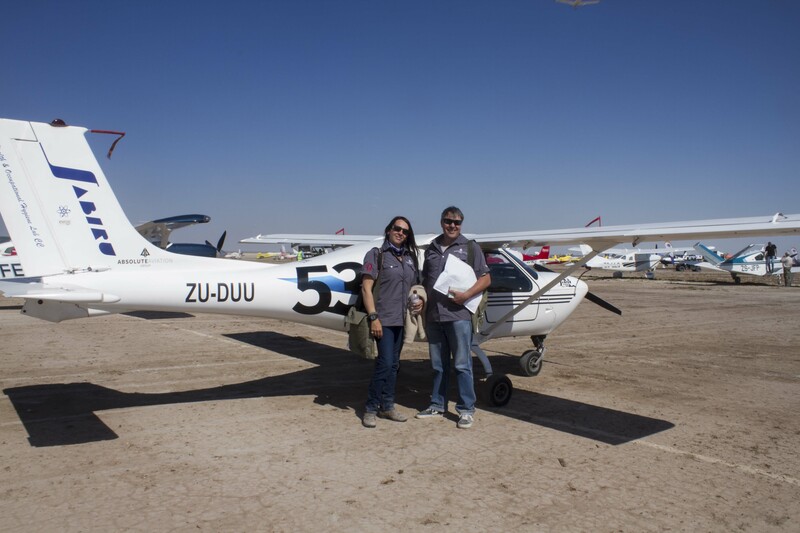 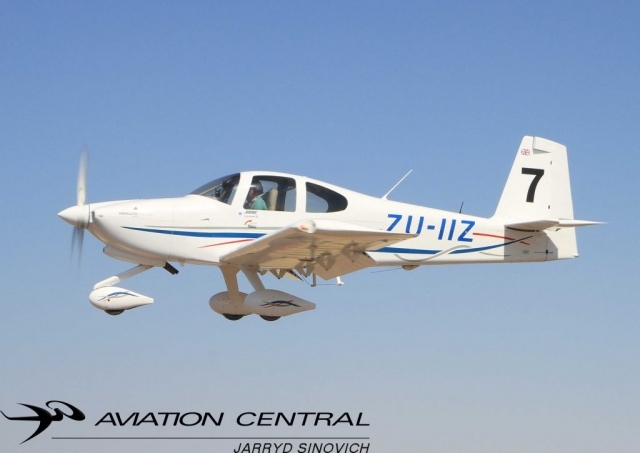 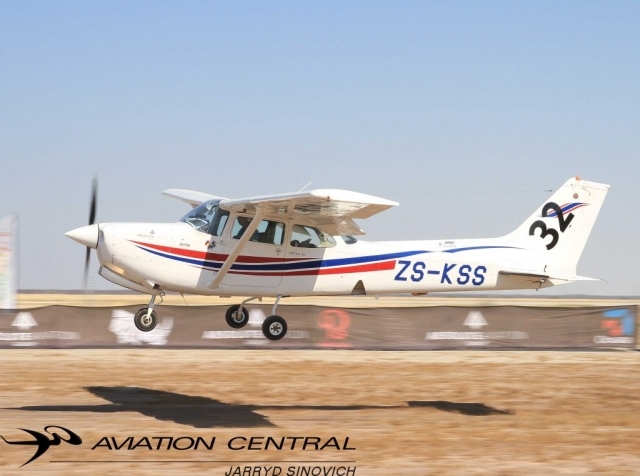 At 10am saw the first takeoff from race 74, a Aerostar/Piper 600A ZS-PCV flown by JZ Moolman and his navigator Jannie Moolman of the 114 competitors with ex President of Botswana Ian Khama waving the Botswana National flag of the start of go time! 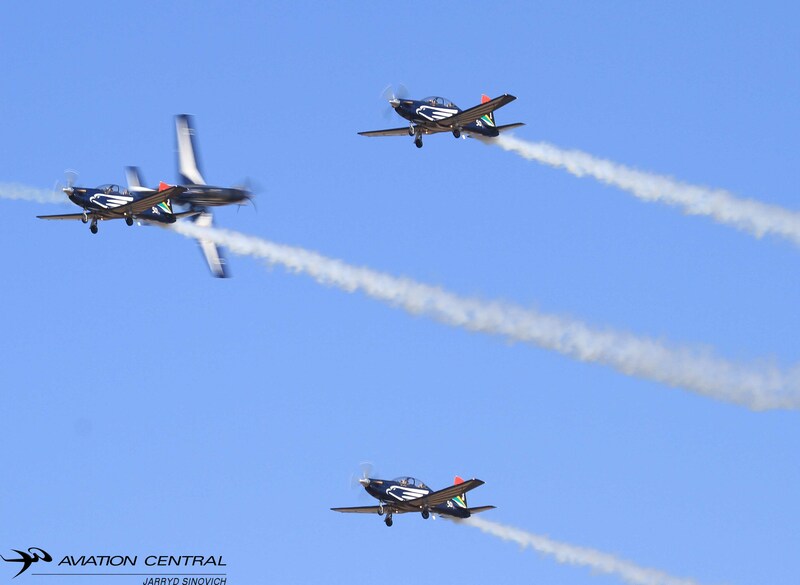 Just after mid day the first of the aircraft made their way back to base,once landed and checked back in at Race HQ,Then treated to lunch and competitors getting ready for day 2.We were then treated to some fantastic flying displays from a T6 Harvard flown by Dion Raath, Extra 330 flown by Nigel Hopkins who also led Team Extreme with Jason beamish in the Rv7,Mark Hensman in the RV8 and Mark Sampson in the Sbach XA41.Neville Ferreira flew a great show in his Kitty Hawk based Slick 540,The Raptors RVs were the up next in their tight formation flying and then joined up with other Rv owners in a mass RV formation that has not been seen before in Southern Africa,with a total of 12 RVs in one formation. 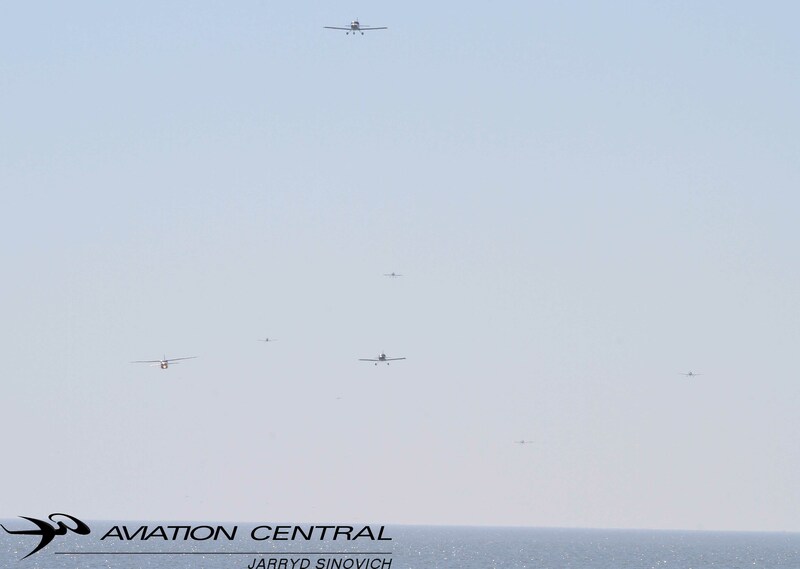 What a sight it was! 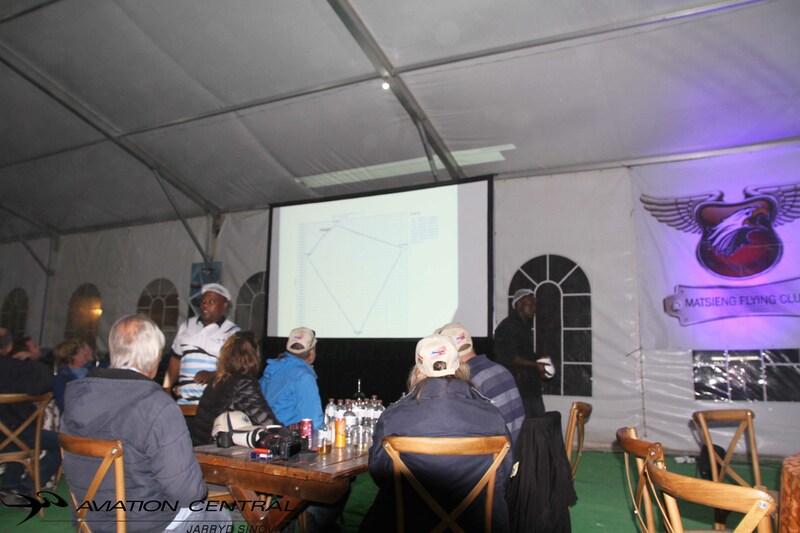 Dinner was served and a short race briefing was presented and some of the daily loggers were shown. 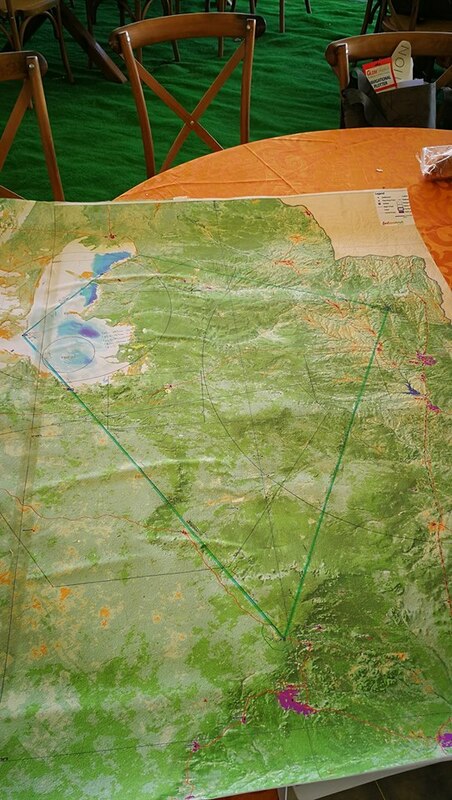 Day 2 was slowly upon us. 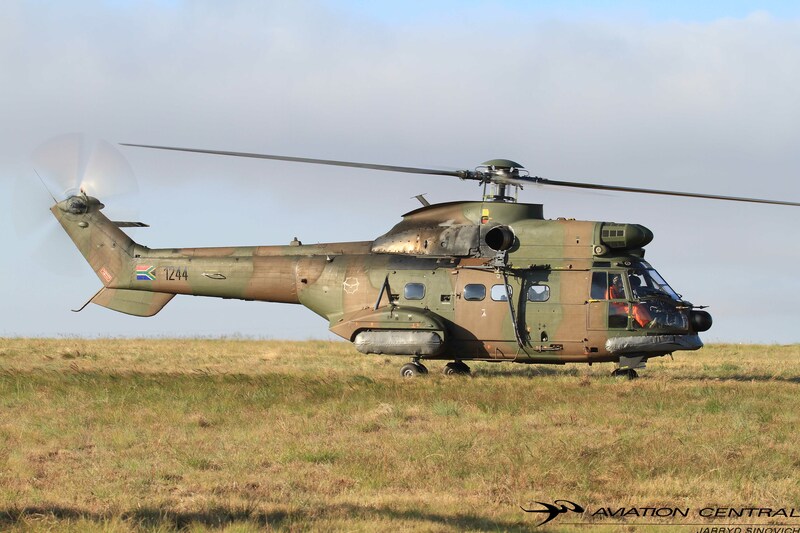 The day once again with our daily alarm clock, shower Breakfast and go time. Day 2 saw all the slowest aircraft getting off the ground first and the route being more difficult then the day before. 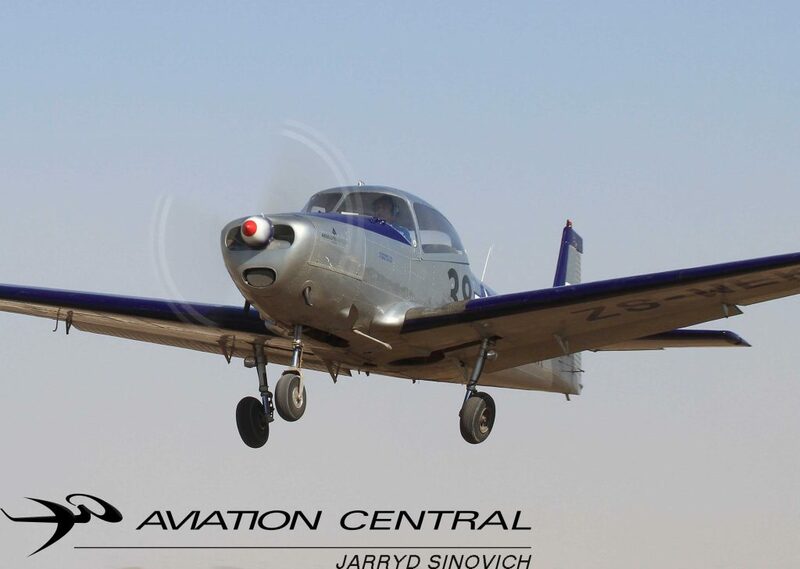 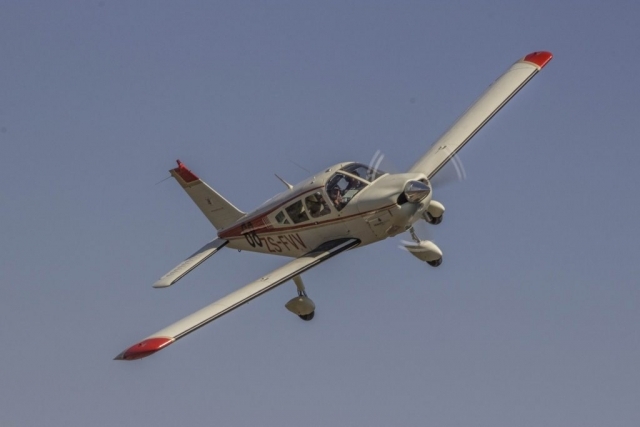 The flag was waved and the first aircraft was off the ground, that being Race 108 a Piper PA-22 ZS-CET flown by Pilot Richard Fair and Navigator Timothy Fair. 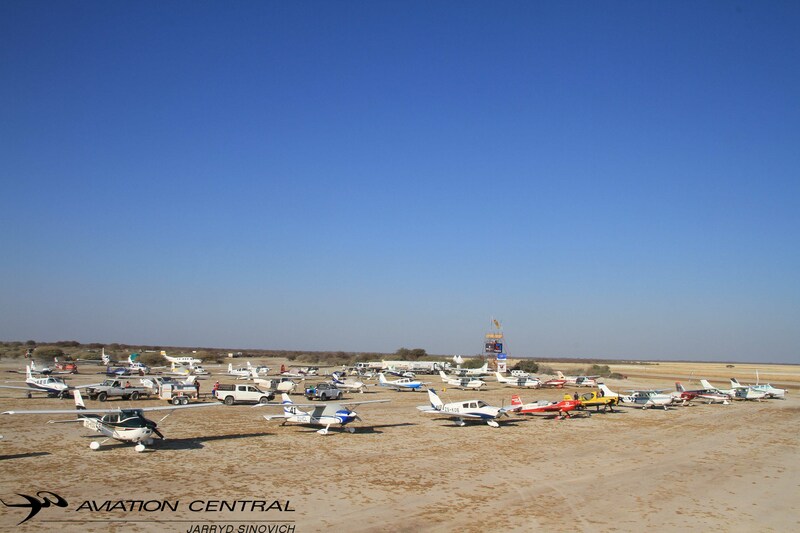 At lunch time all the aircraft arrived back and a sight it was to behold seeing many aircraft arriving back at the same time. 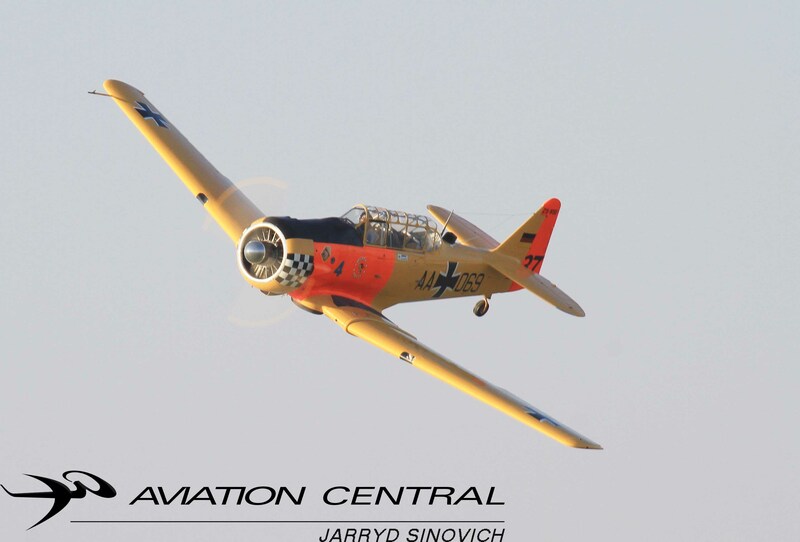 Not long after that the Puma Flying Lions Harvard’s arrived from Rand Airport. 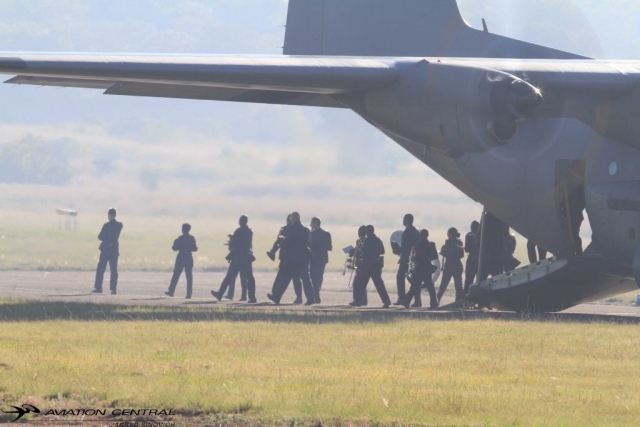 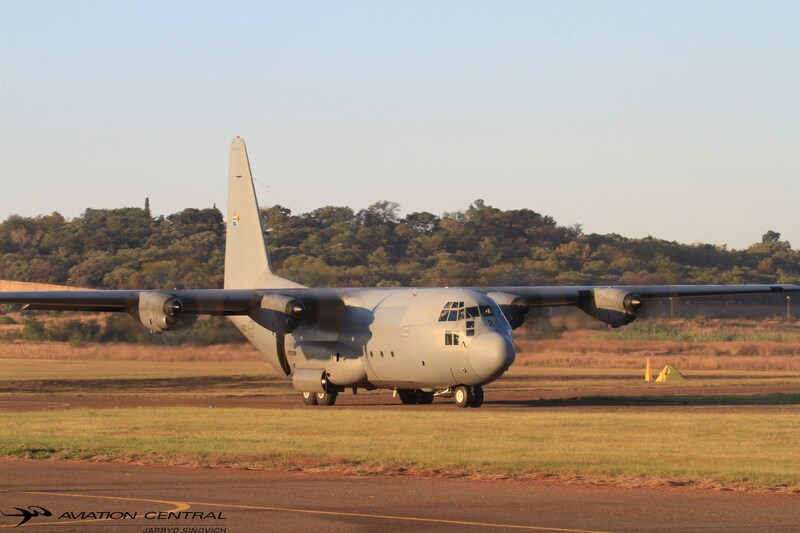 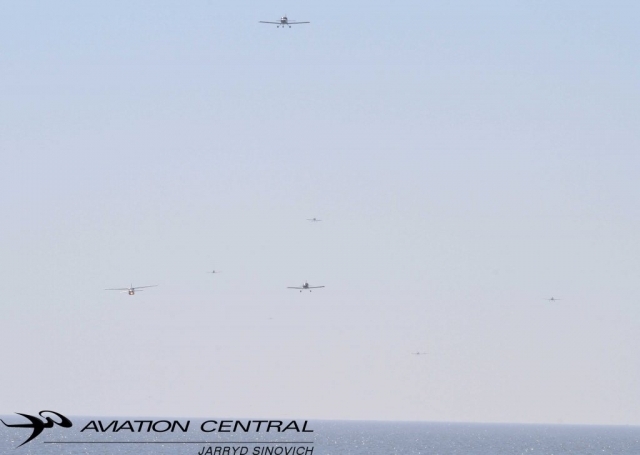 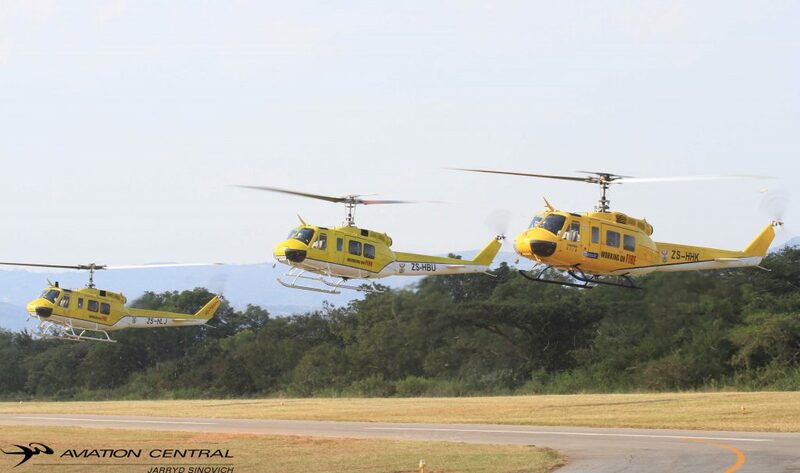 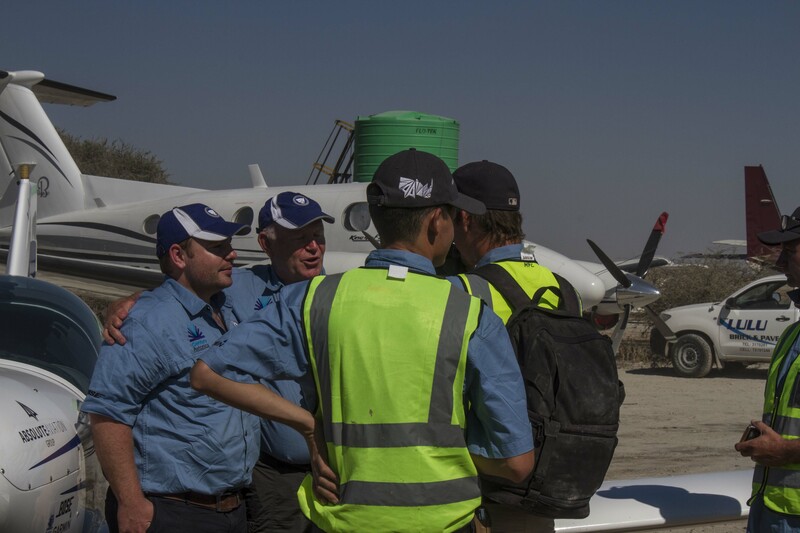 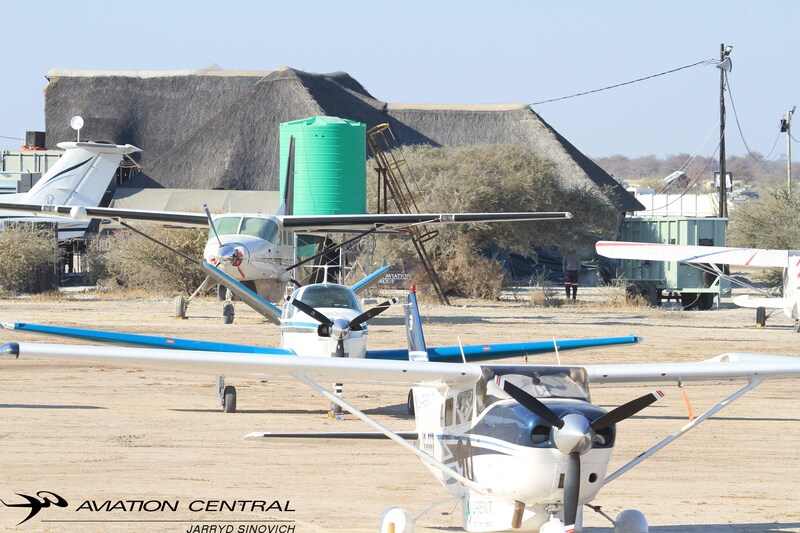 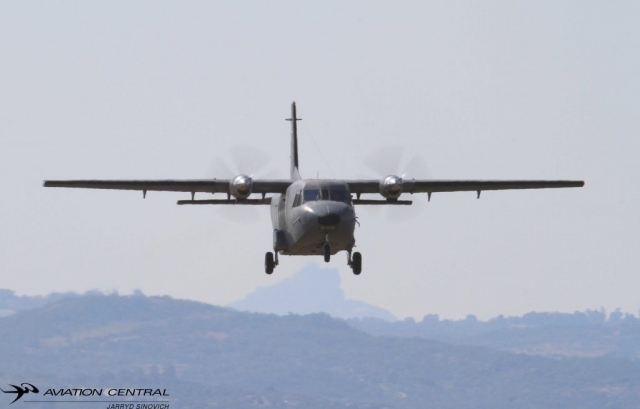 The first four aircraft arrived back and the long wait for who was the winner of this years Race for Rhinos. 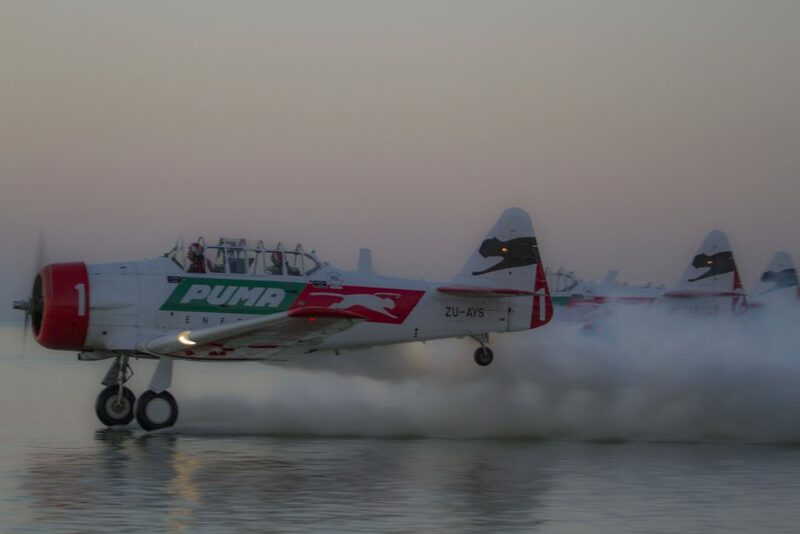 The late evening airshow took place as like the day before plus the Puma Flying Lions doing their display plus water skiing on the water in front of the marquee was unbelievable, something we don’t see everyday. 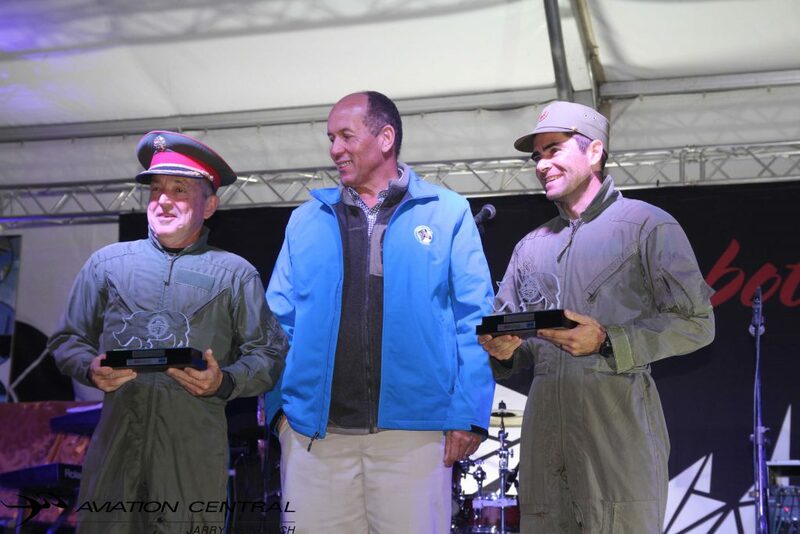 The evening saw a dress up of the early fifties of pilots and crew, where some of the beautiful ladies dressed up like cabin crew and some of the men taking the part of early fighter pilots.The Minister of Environment, Conservation, Natural Resources and Tourism Affairs Mr. T.S Khama greeted the competitors of the final results and presented why everyone has to work together to protect Botswana’s wildlife and still keep the country as a tourist attraction for many. 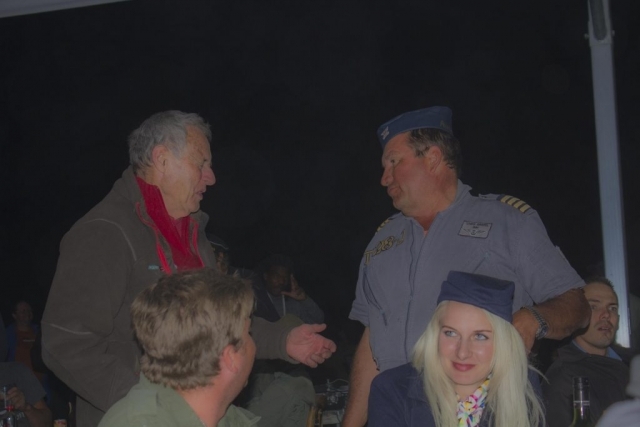 He also addressed many with a joke or two, not many ministers one can interact with without having body guards swarming the place! 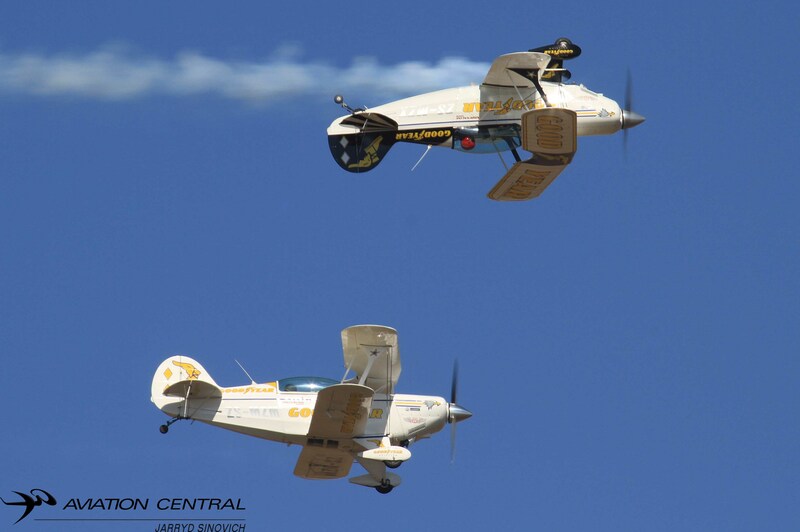 Stephan Fourie nd Derek Bird in Race 99 finished in 3rd place. 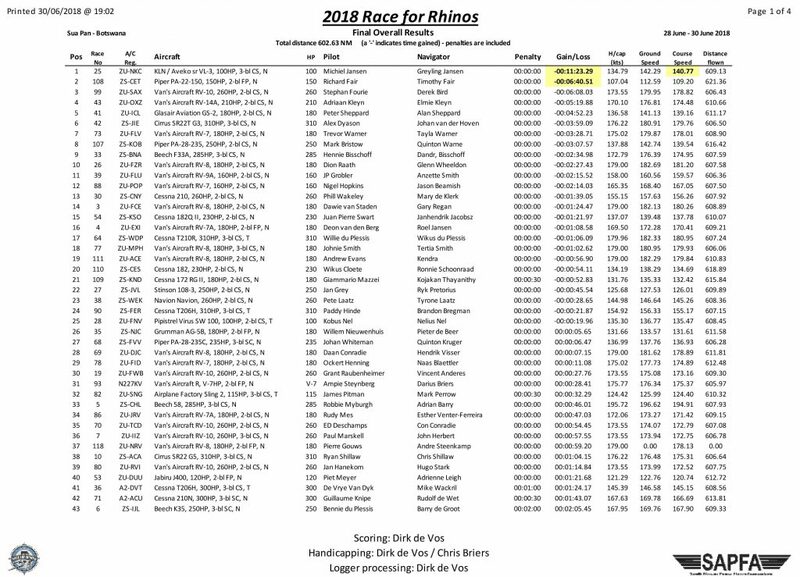 Richard and Timothy Fair took 2nd place in race 108. 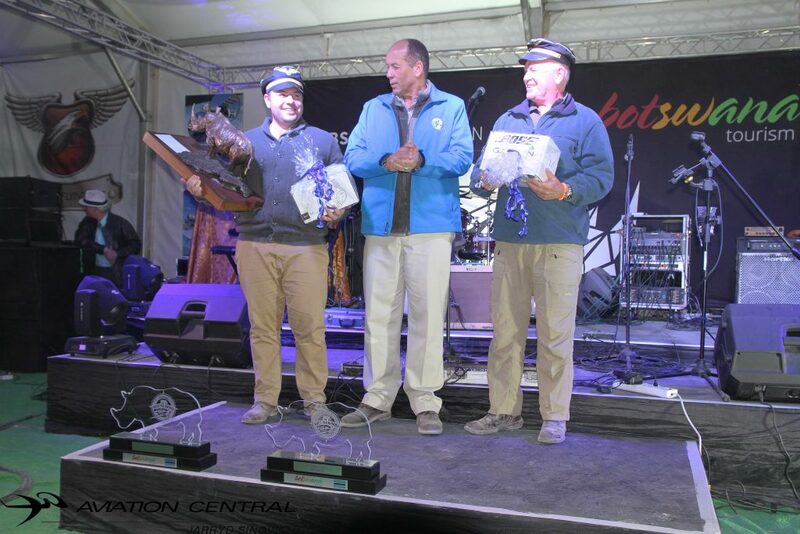 Overall winners in race 25,Michiel and Greylingh Jansen. 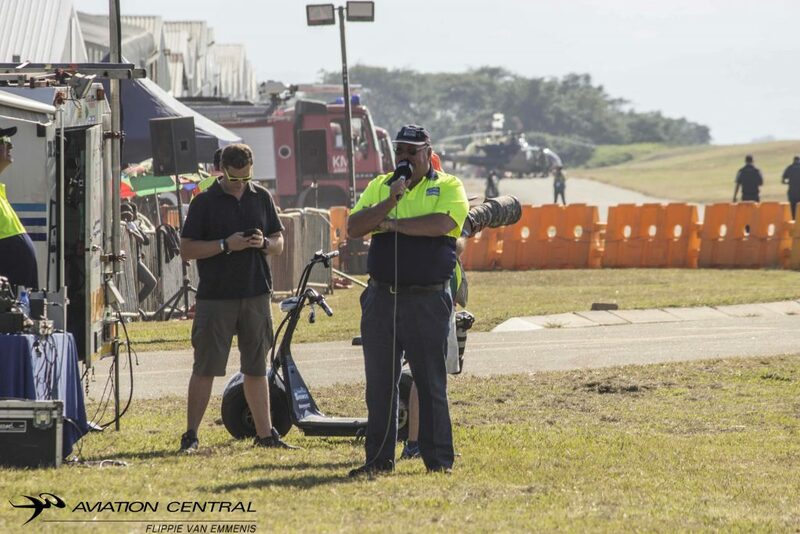 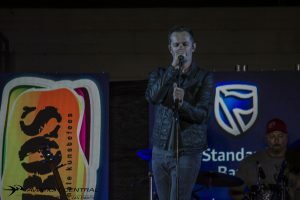 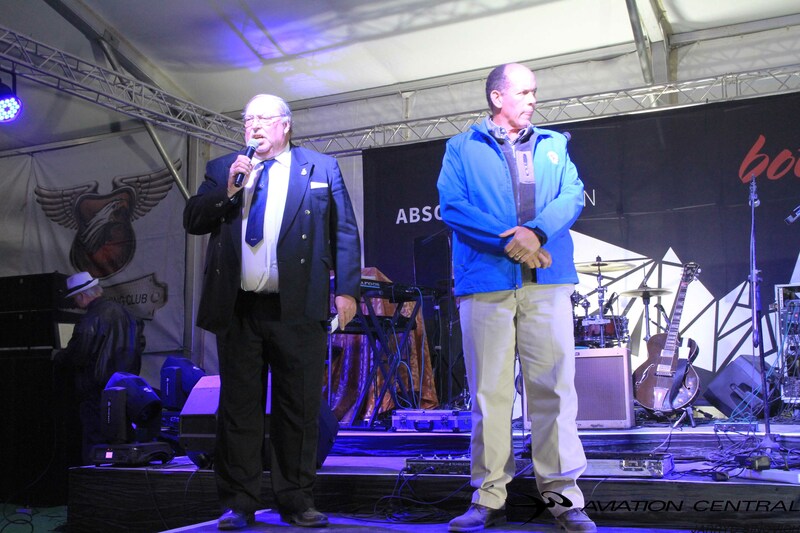 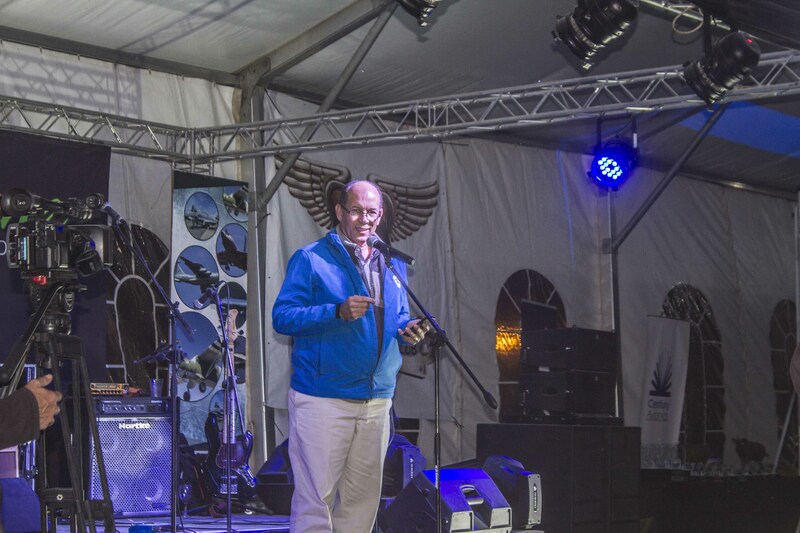 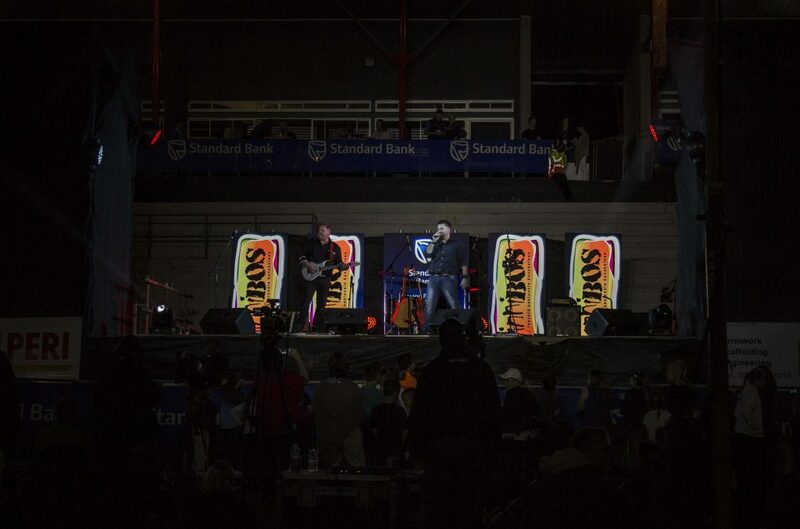 Chris Briers was up next to thank all that took place and made the forth Race for Rhinos take place without any incidents involved, he thanked the Government of Botswana for all their hard work and finance’s put into the race, without them tis race would not be taking place. 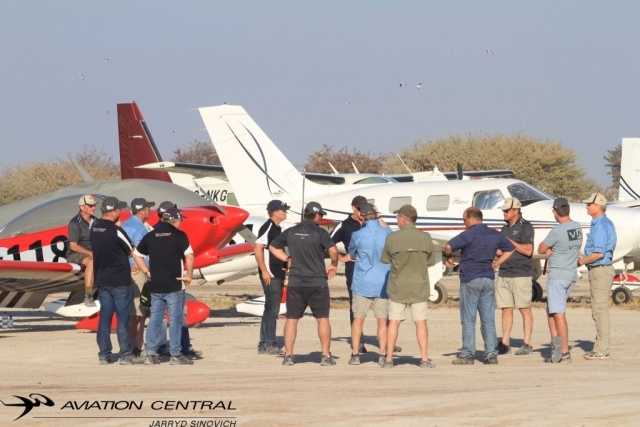 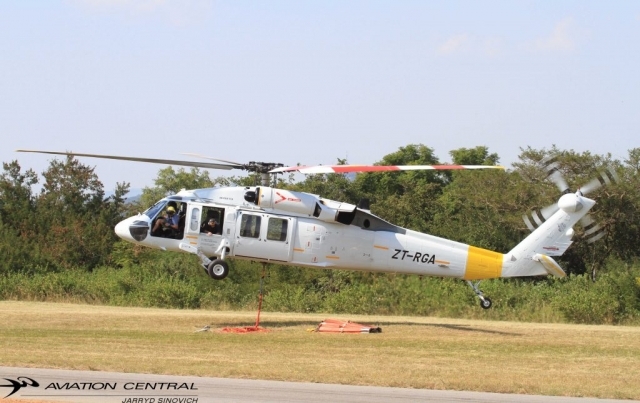 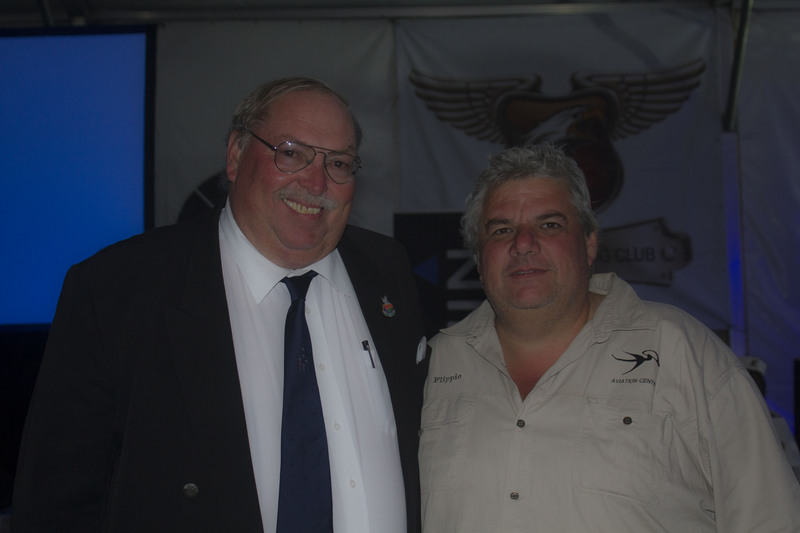 We would like to thank Chris Briers and the Botswana Government for hosting the media and to Mark Mansfield for organising everything for Aviation Central from all the updates and making sure we were taken good of. We were then treated to again some of the various musicians and Diner .The next day we set sail back to South Africa in ‘Little Annie’ flown by Father and son Jon-marc and Mark Hill. We thank them for getting us to and from Sua pan safe and sound. 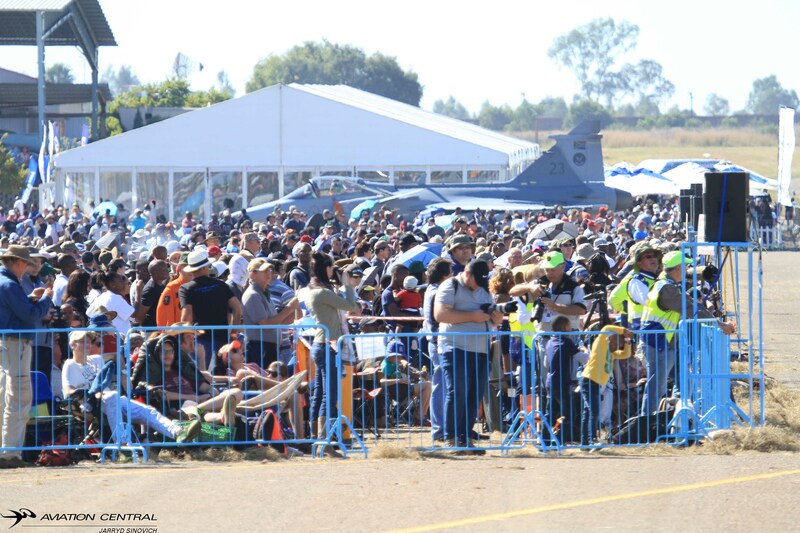 We look forward to the 2019 Race as every year gets bigger and better! 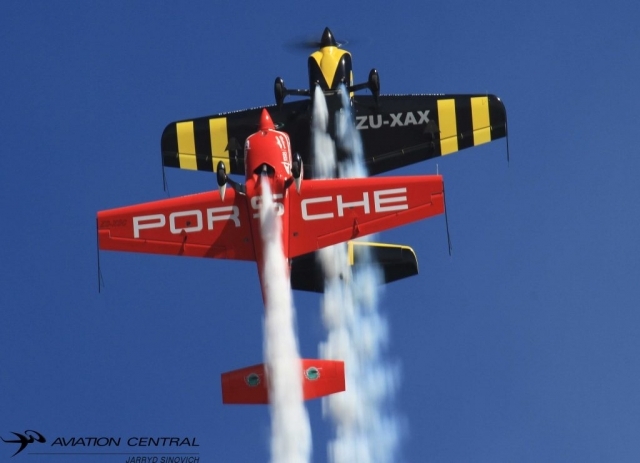 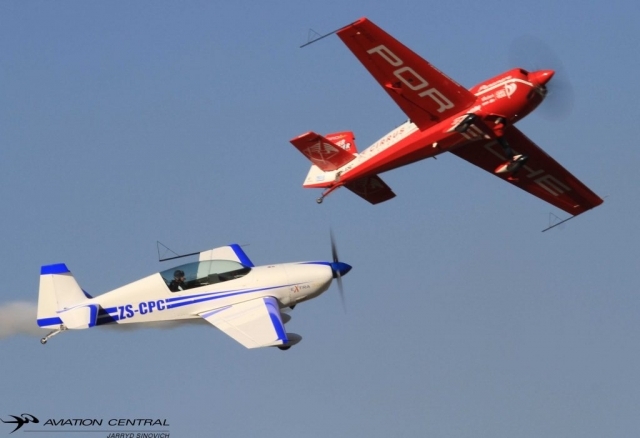 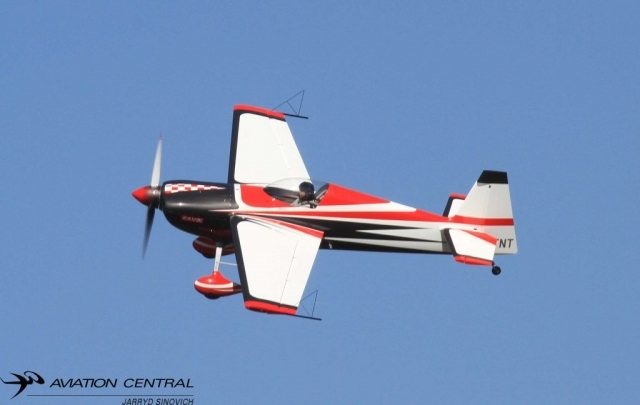 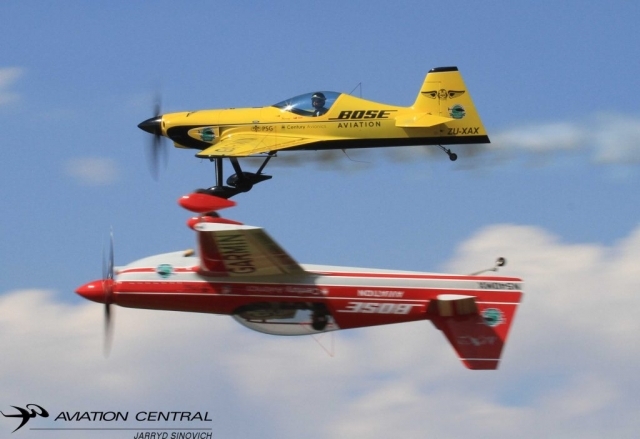 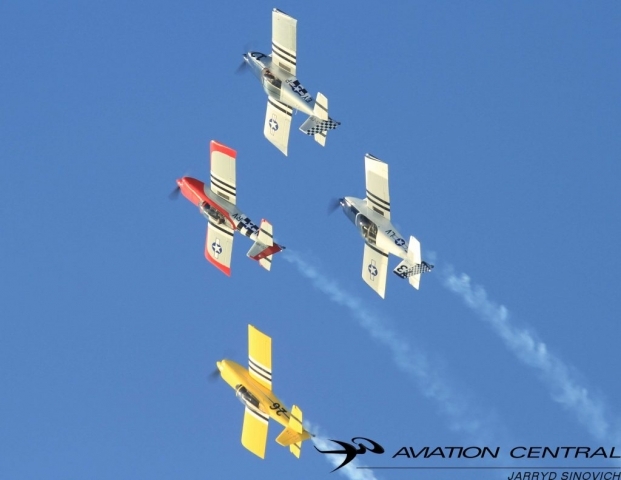 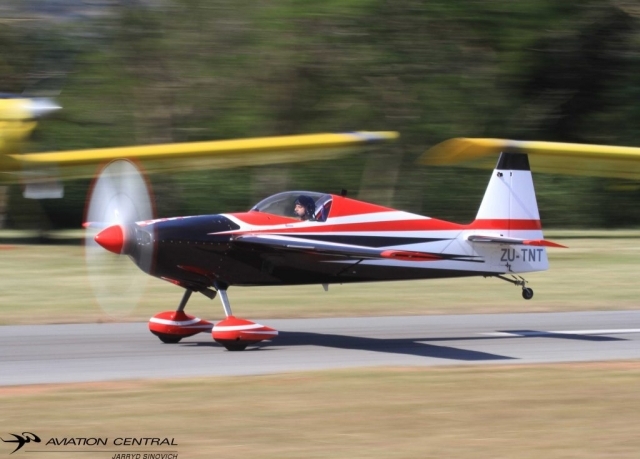 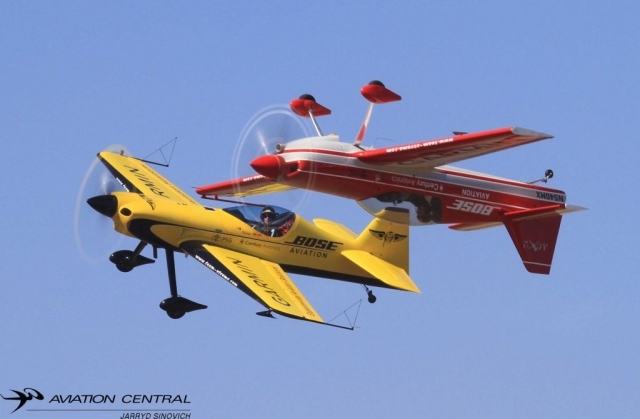 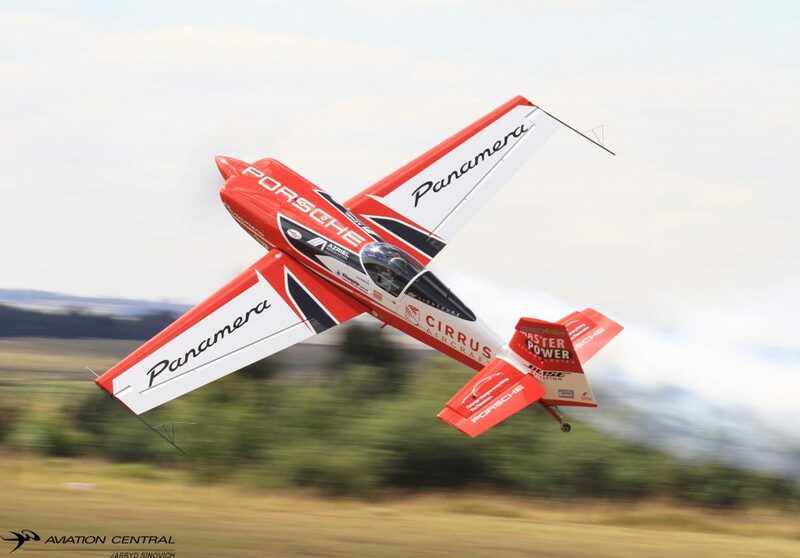 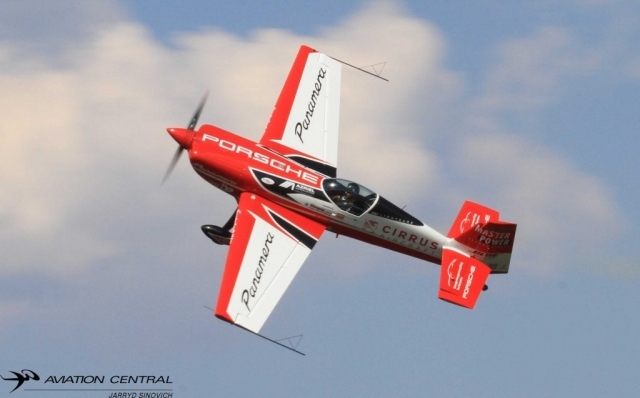 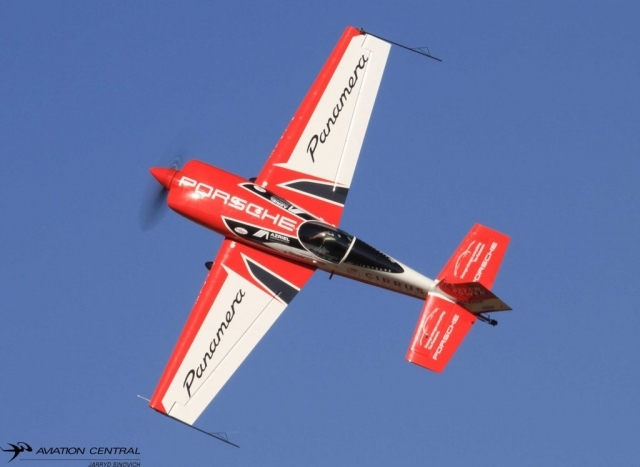 The team fly high performance aerobatic aircraft ranging from the Walter Extra 330SC and the Extreme Air XA42 Sbach,both aircraft are built in Germany. 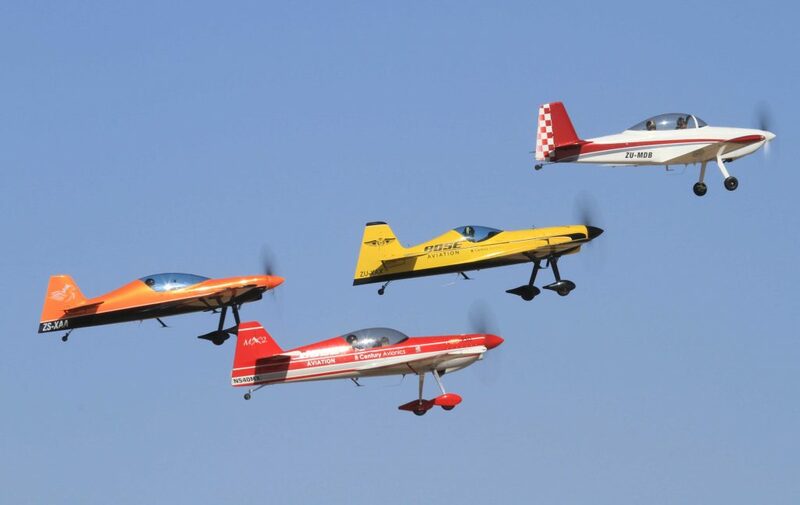 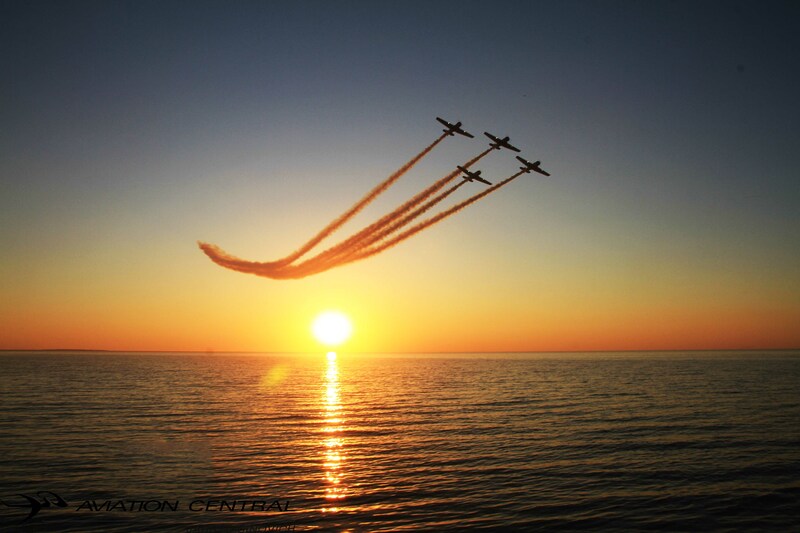 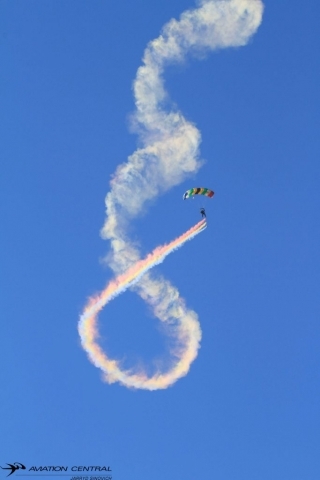 Team Extreme is a four ship Aerobatic Team,the pilots perform manures which includes formation & freestyle aerobatics, cross-over passes, synchronized maneuvers and solo gyroscopics. 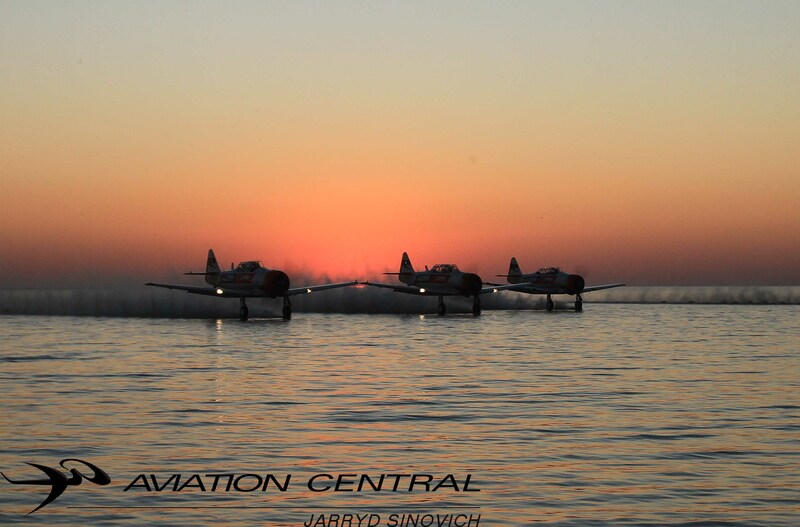 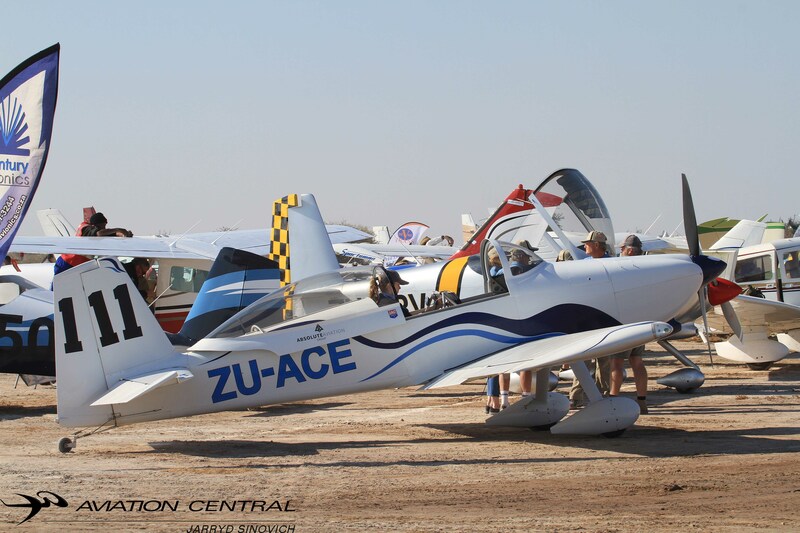 The team members often take part in regional and international aerobatic competitions and are regular performers on the airshow circuit, if they arent flying aerobatic aircraft at an airshow.They flying warbirds or jet airliners, each member having different flying experience.Each pilot is an active member of the Sport Aerobatic Club of South Africa and holds an Advanced or Unlimited Aerobatic Rating in addition to the required Display Ratings. 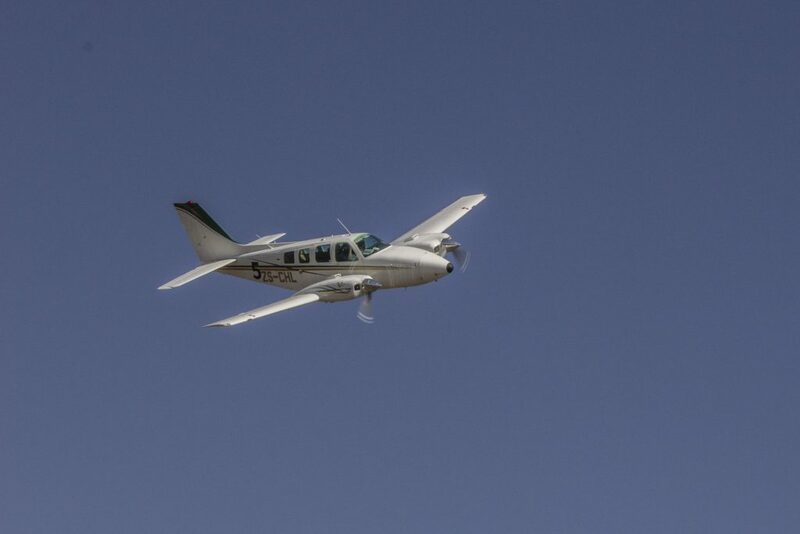 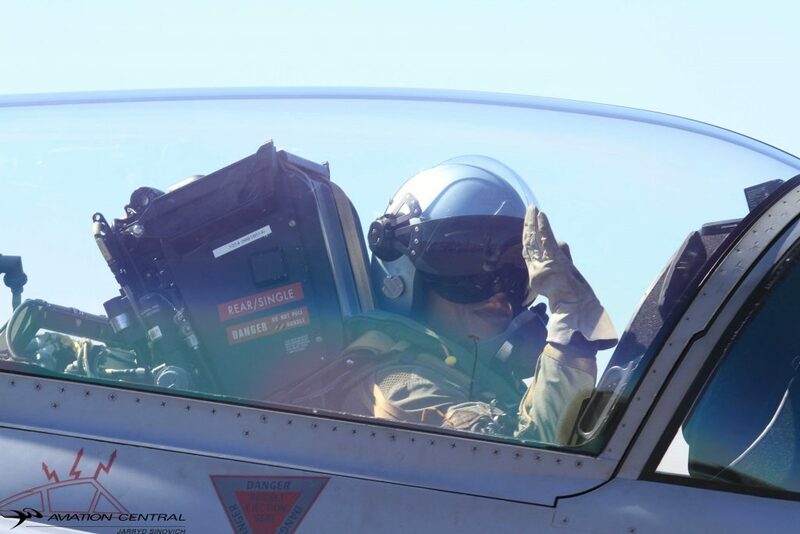 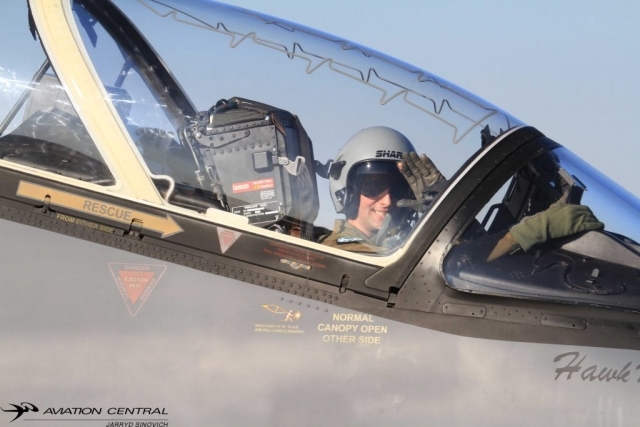 The pilots have a combined experience of 47,700 flight hours. 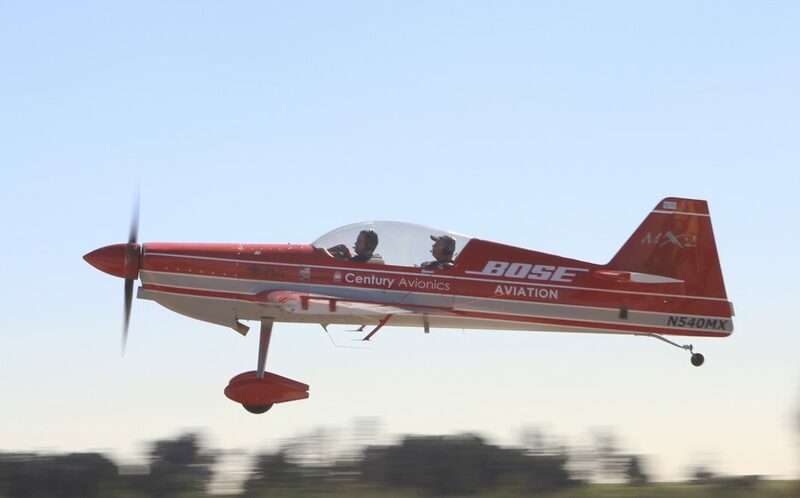 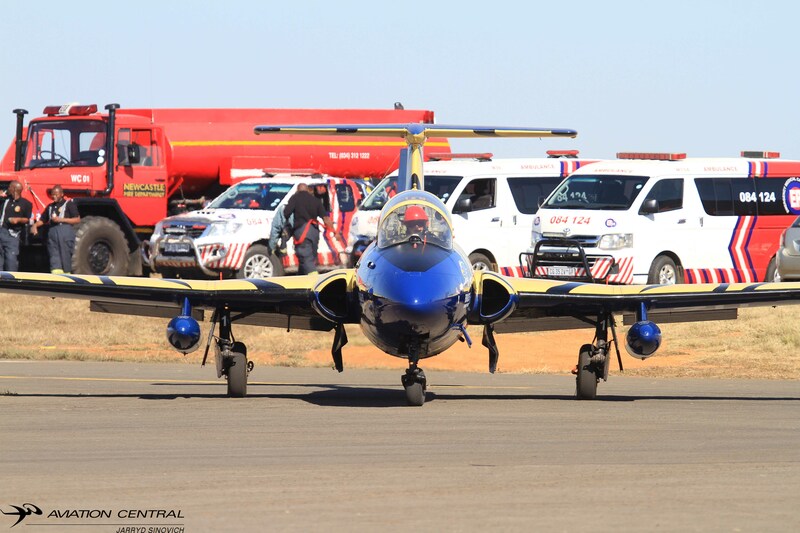 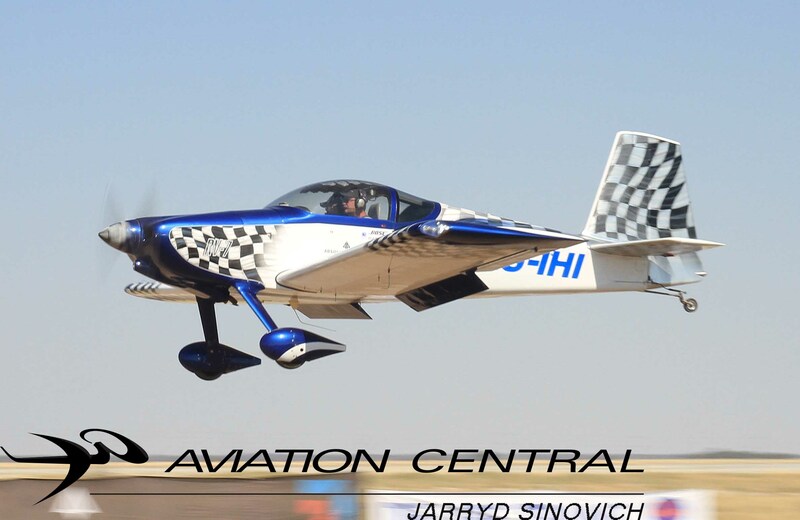 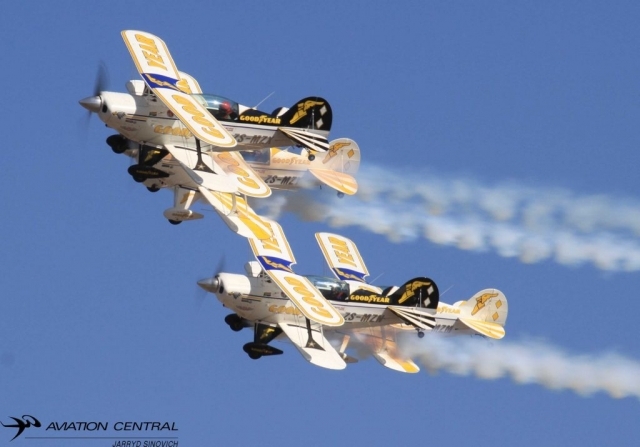 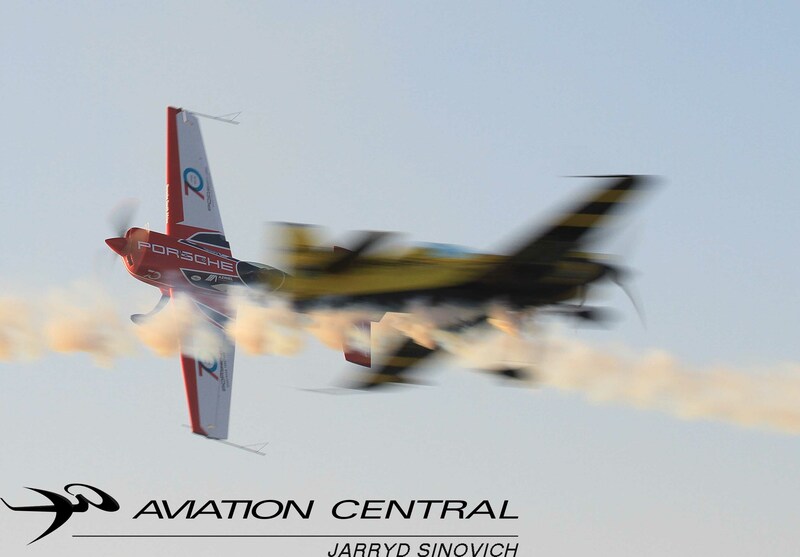 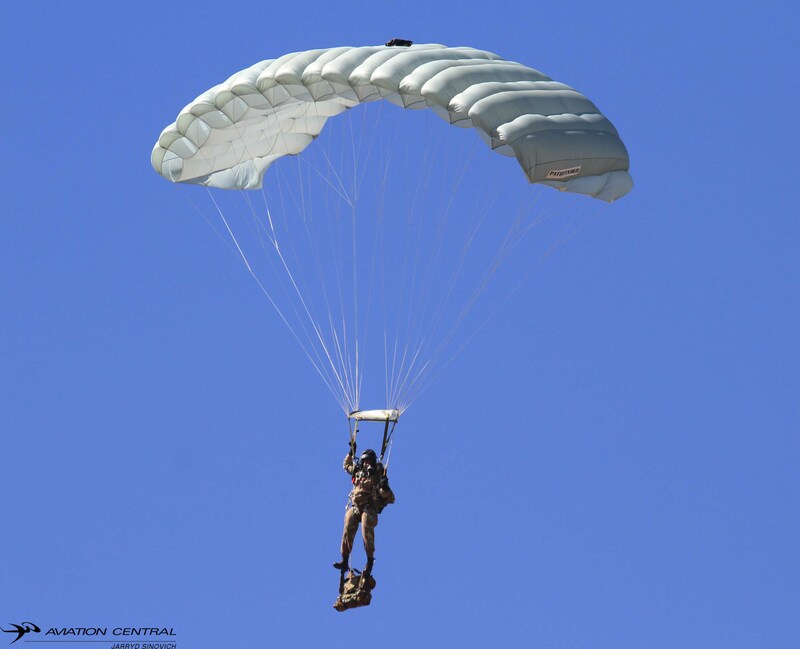 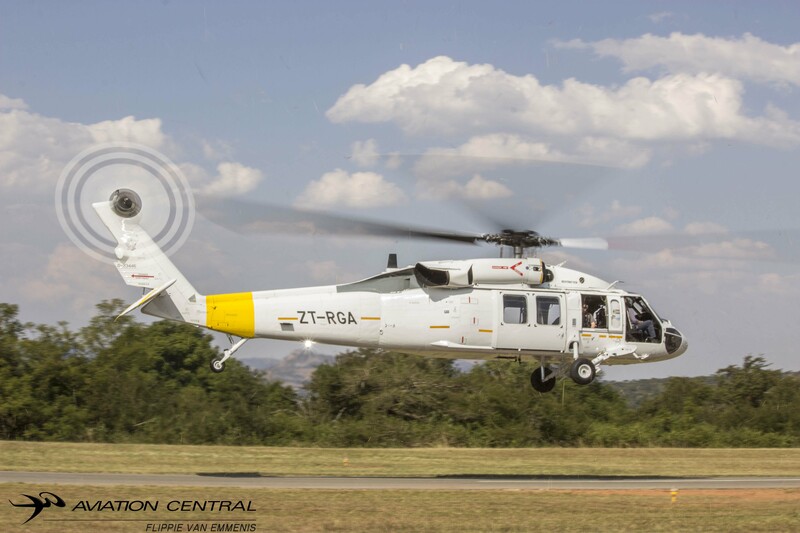 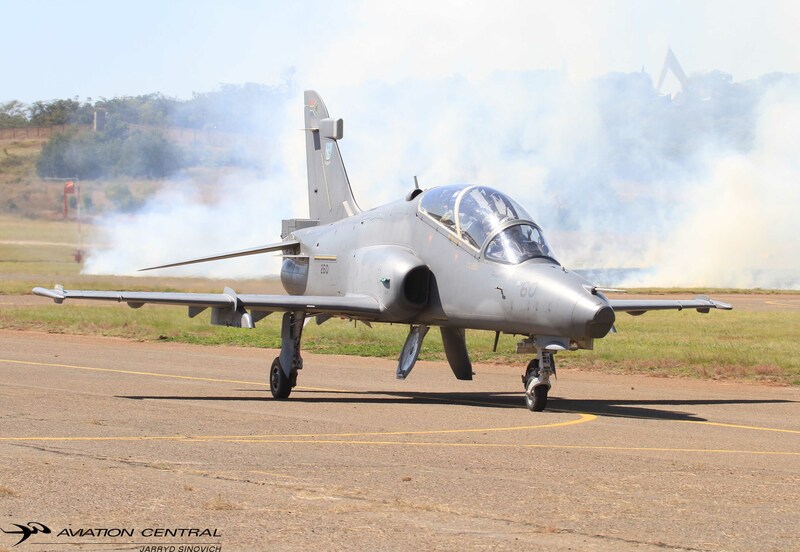 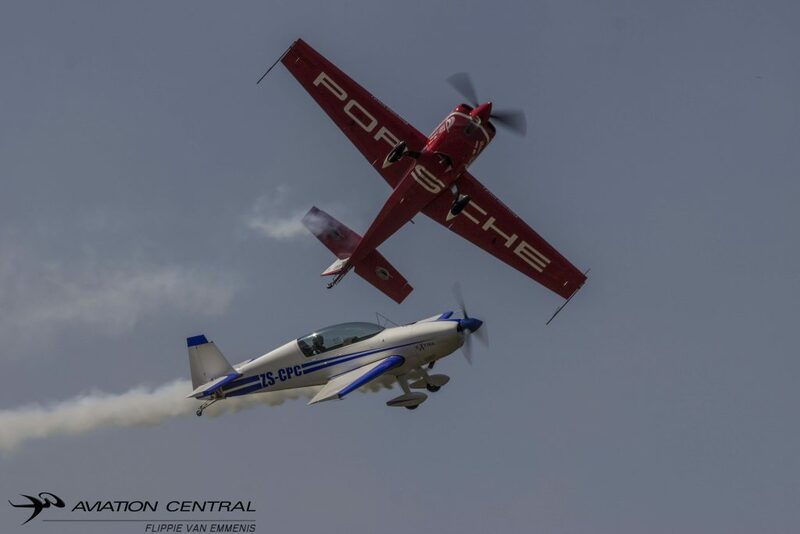 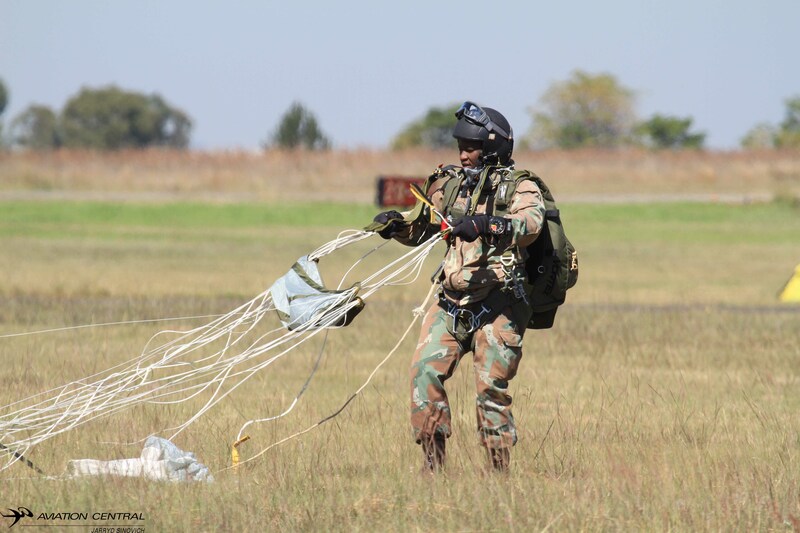 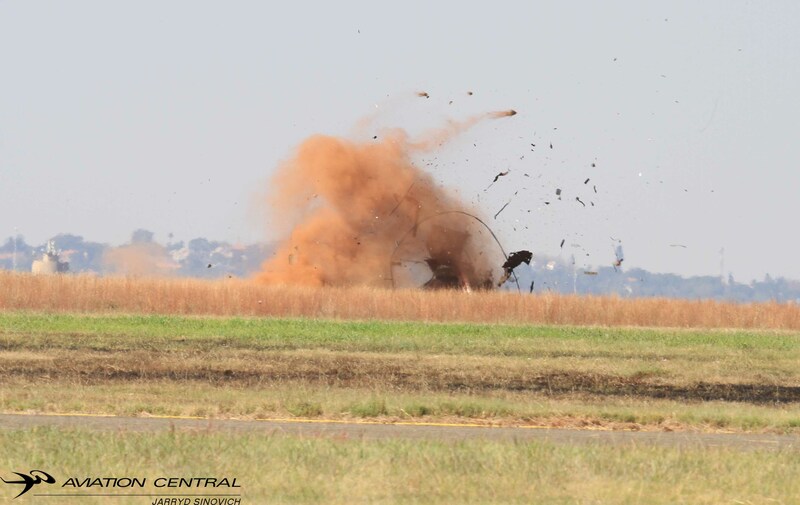 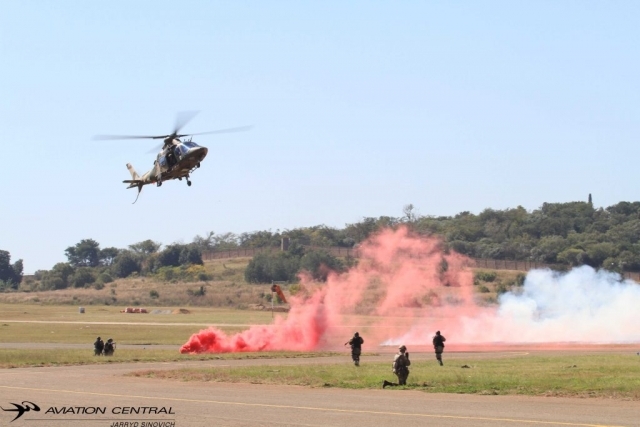 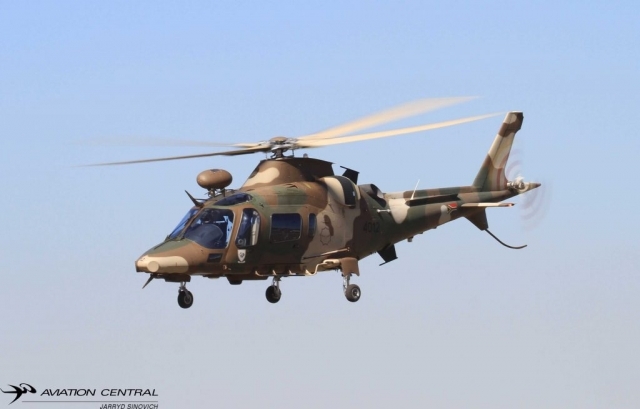 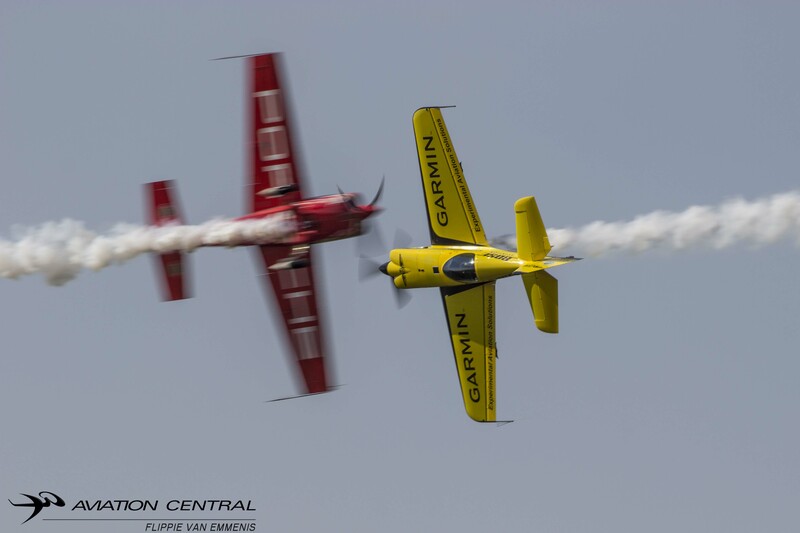 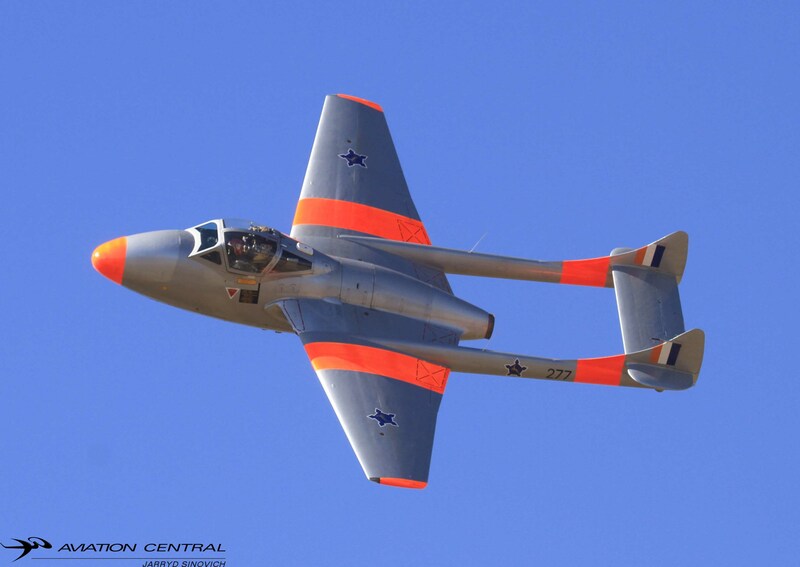 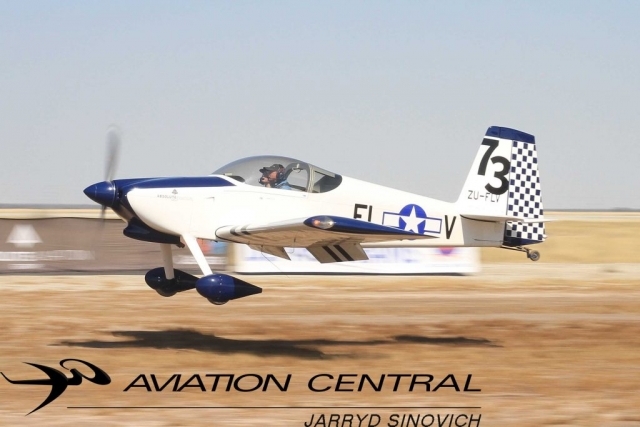 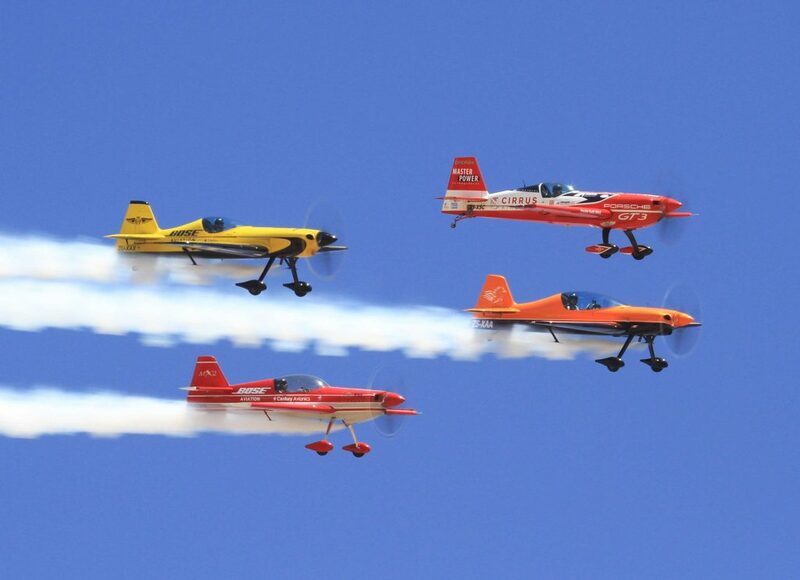 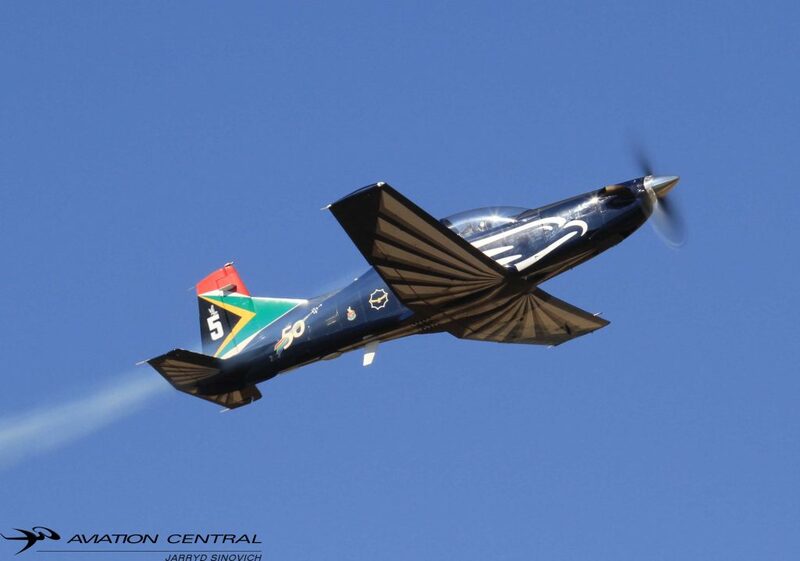 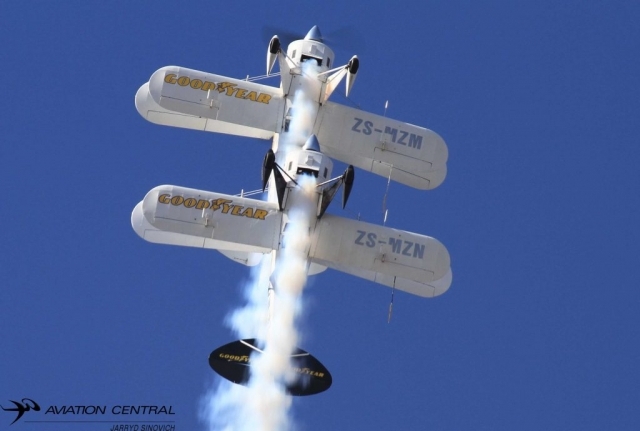 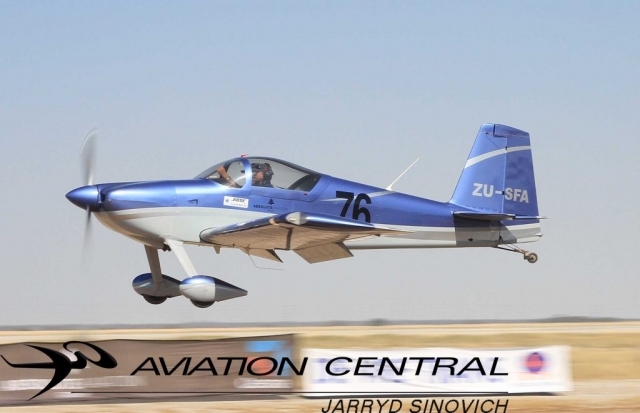 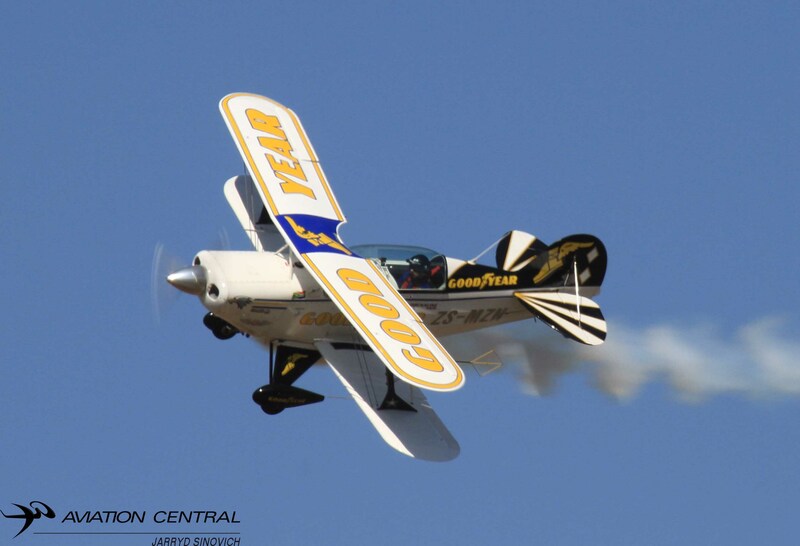 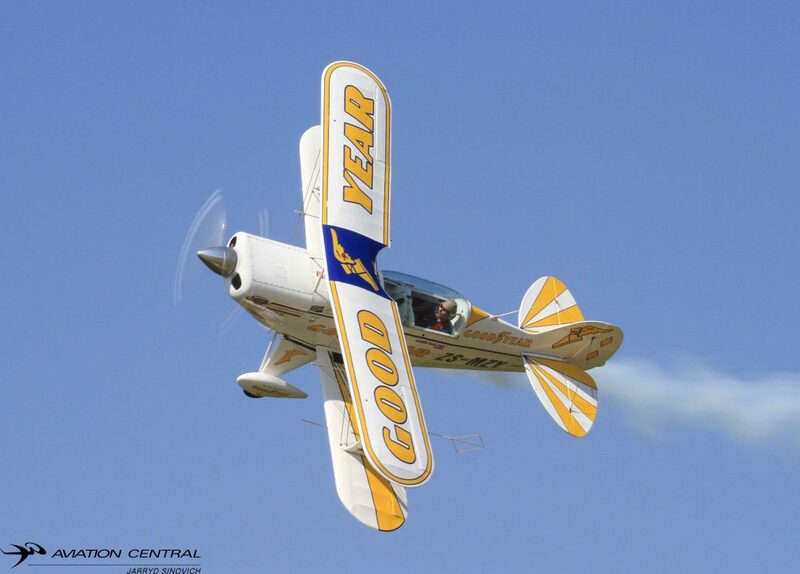 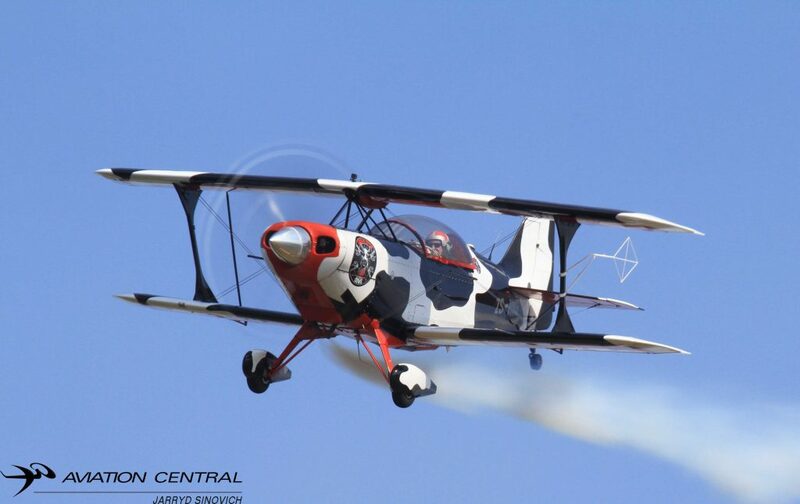 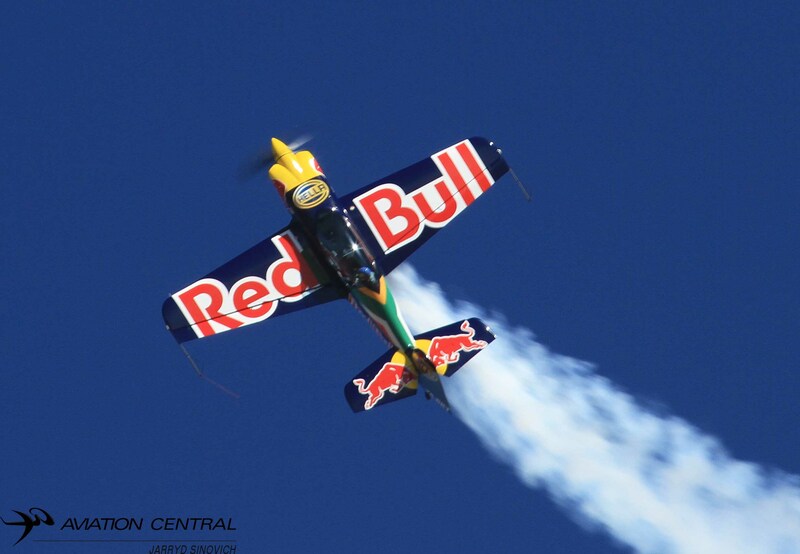 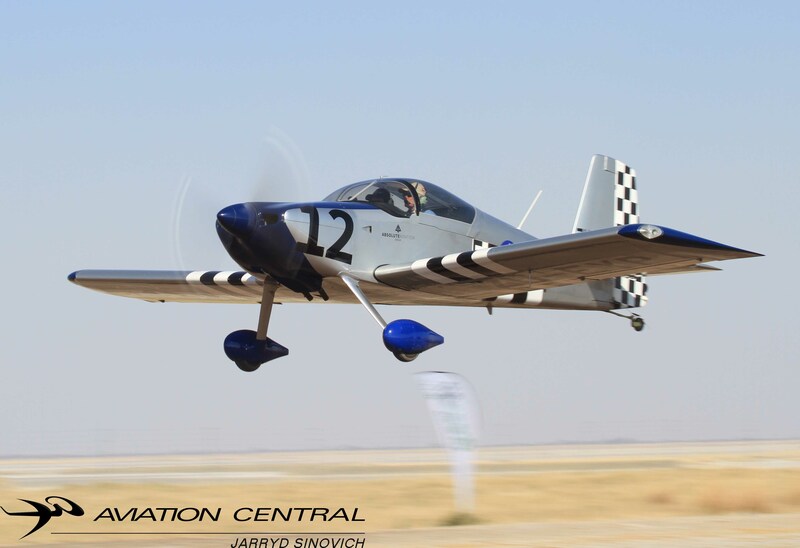 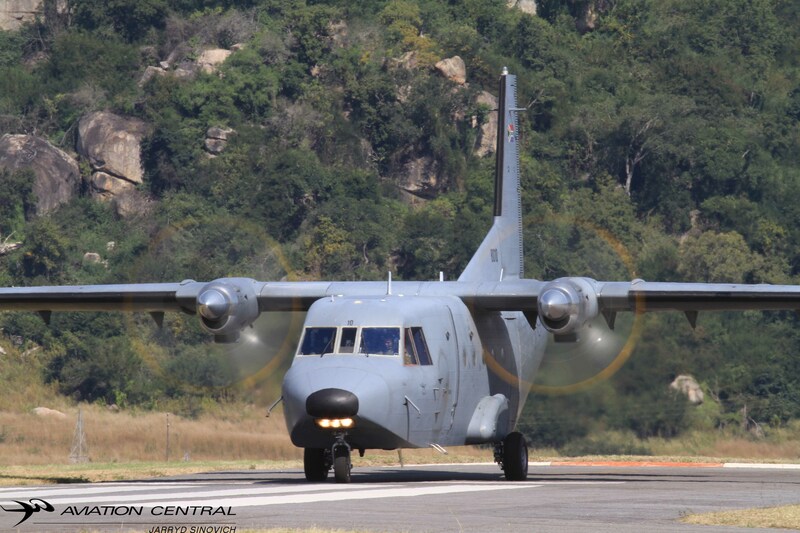 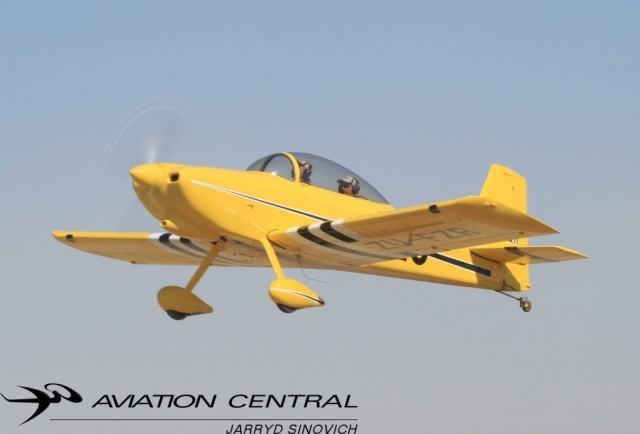 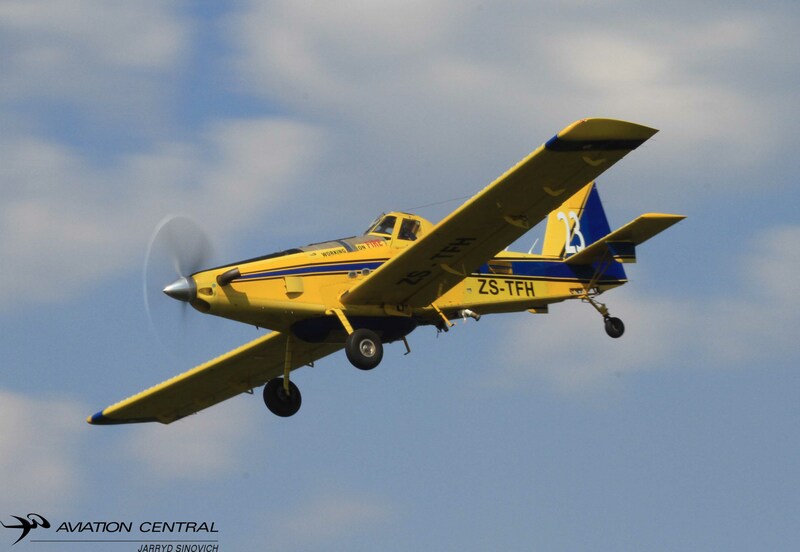 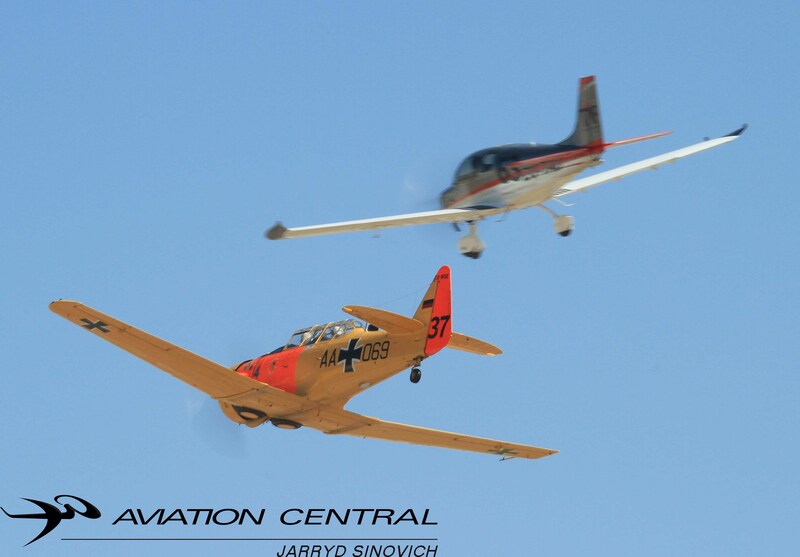 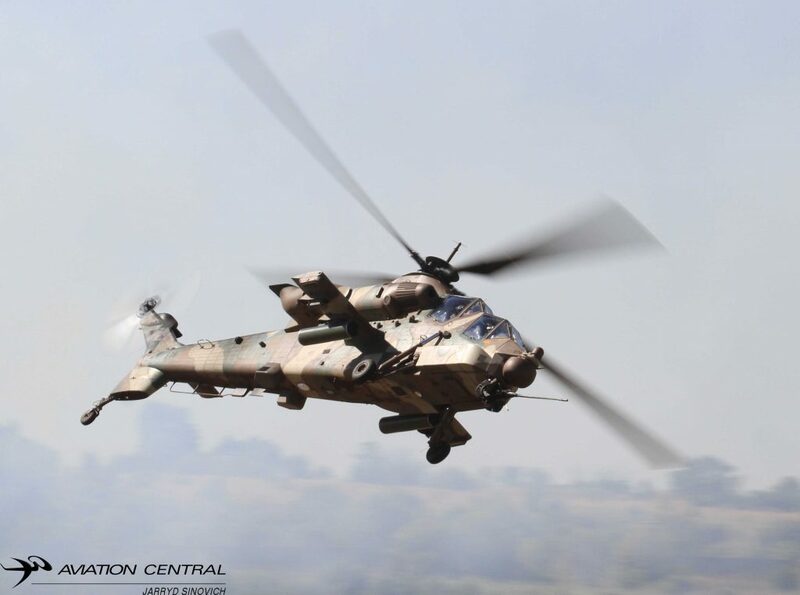 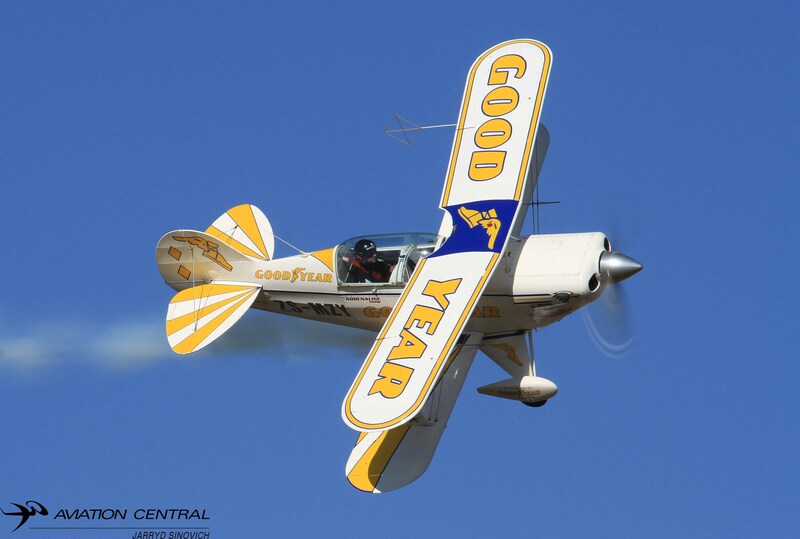 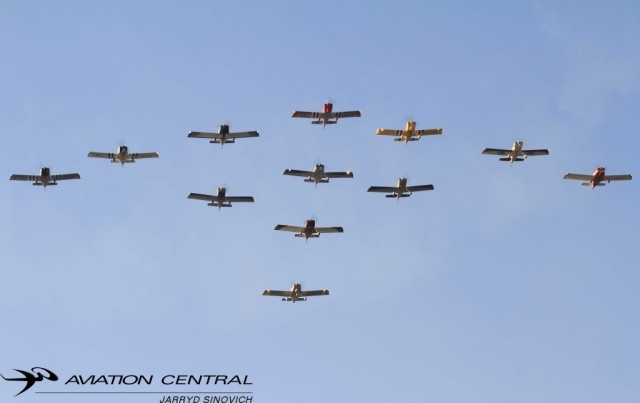 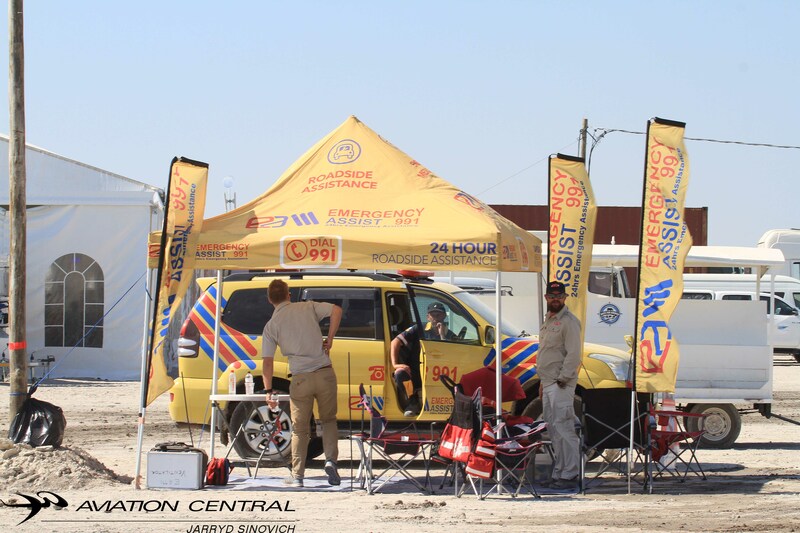 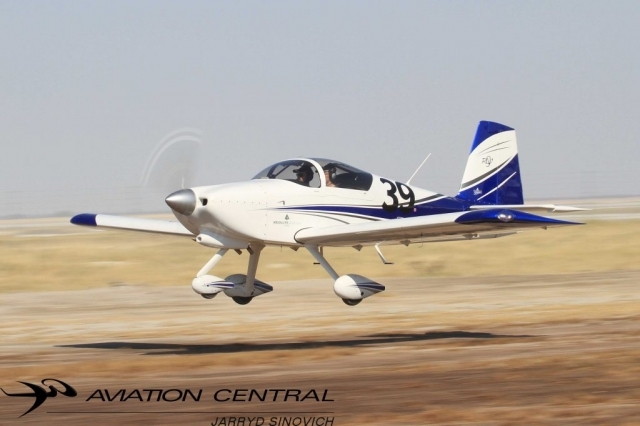 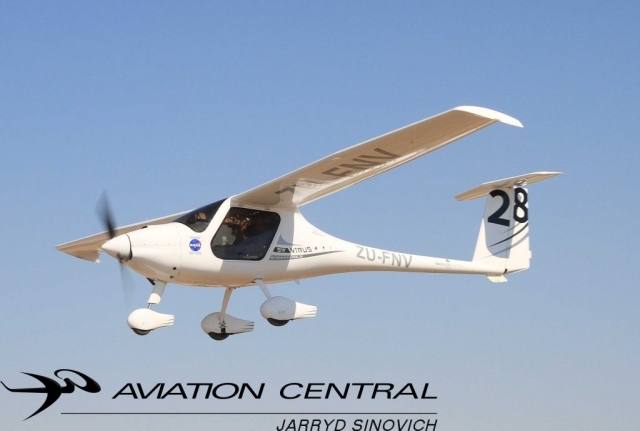 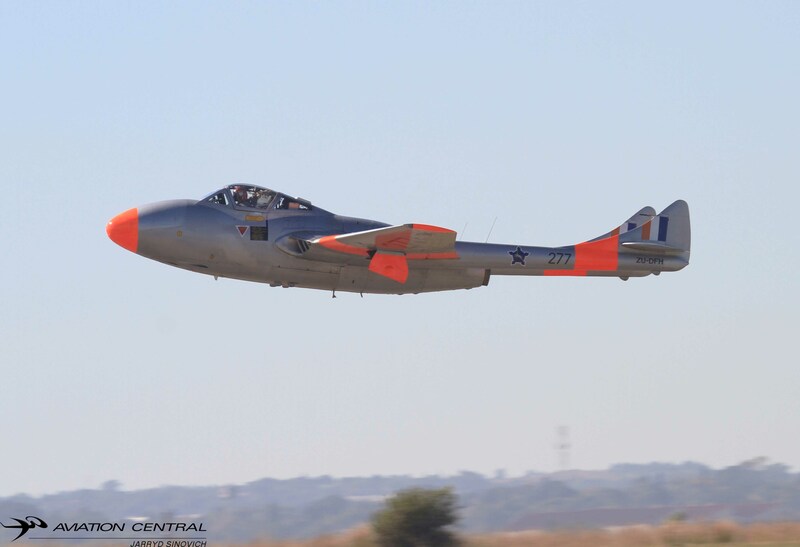 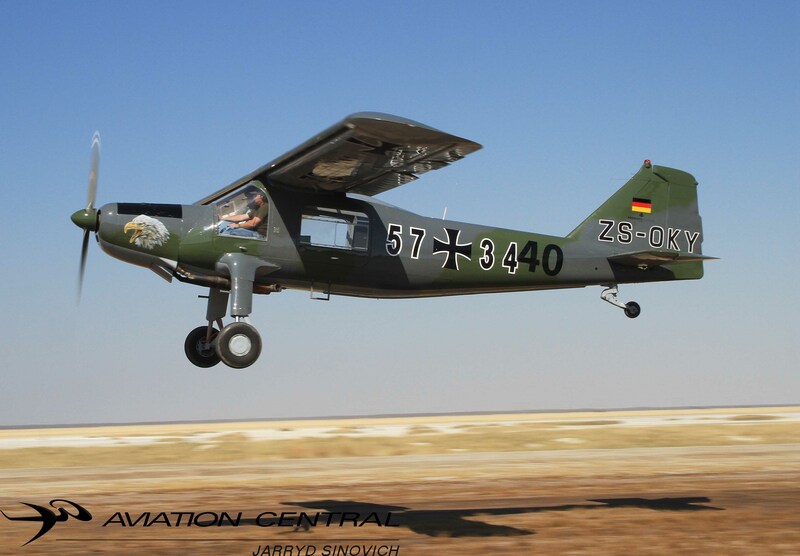 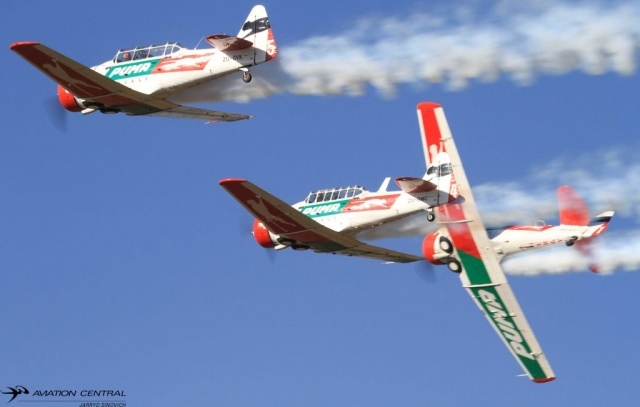 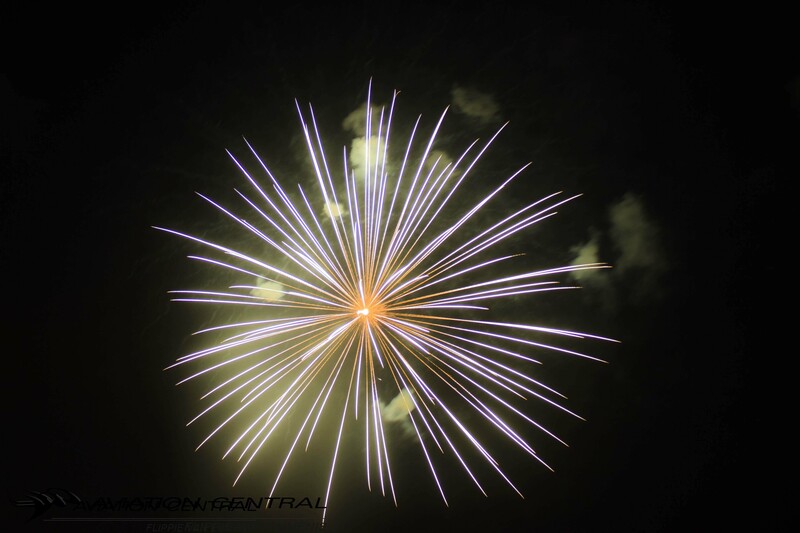 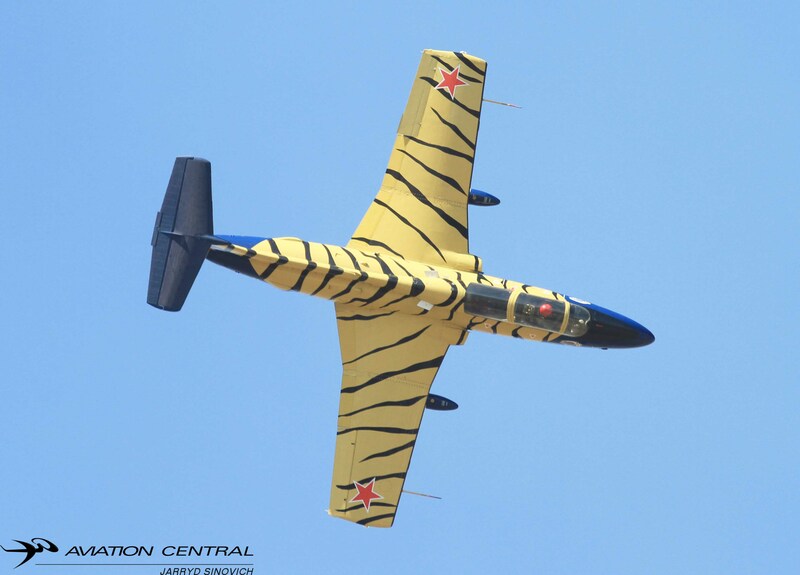 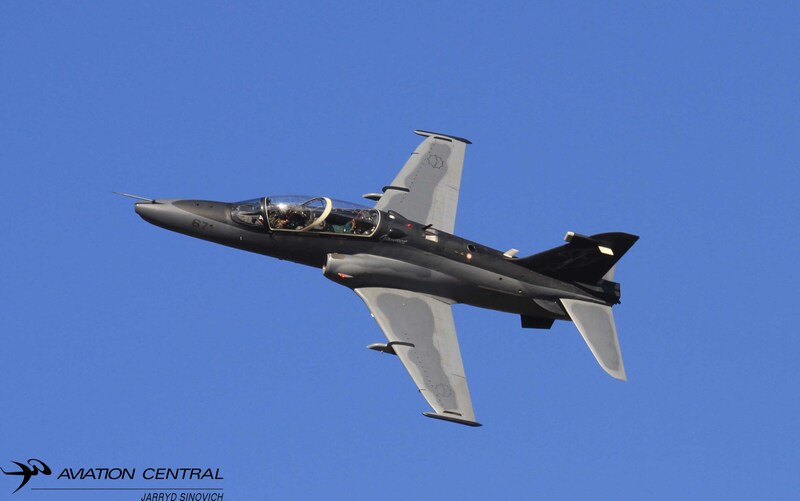 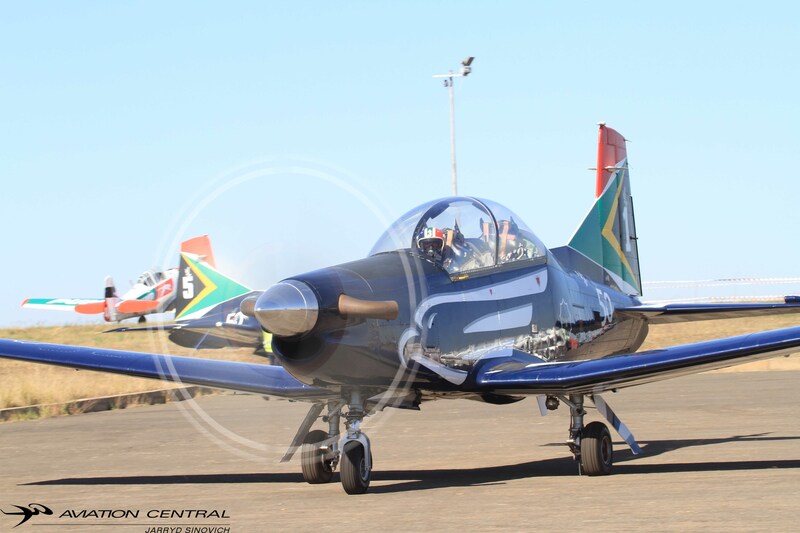 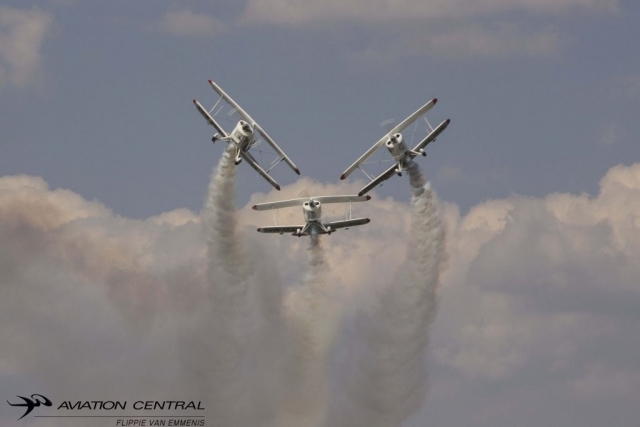 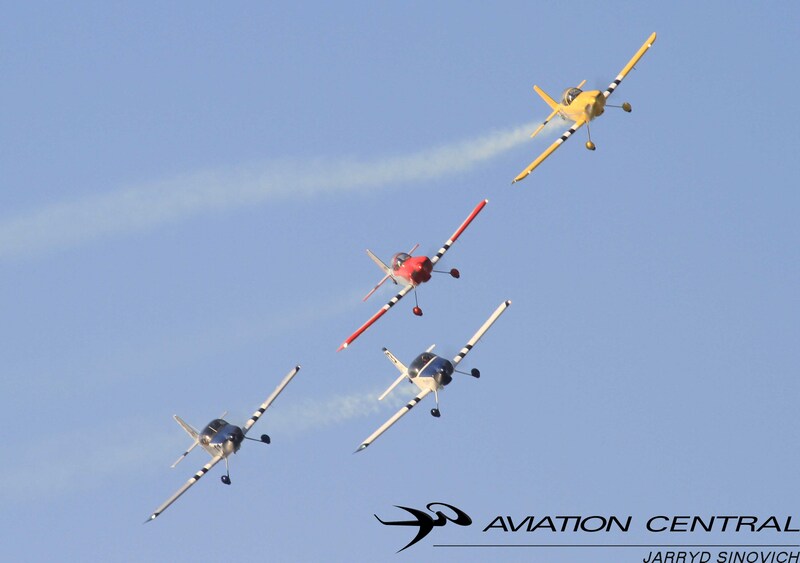 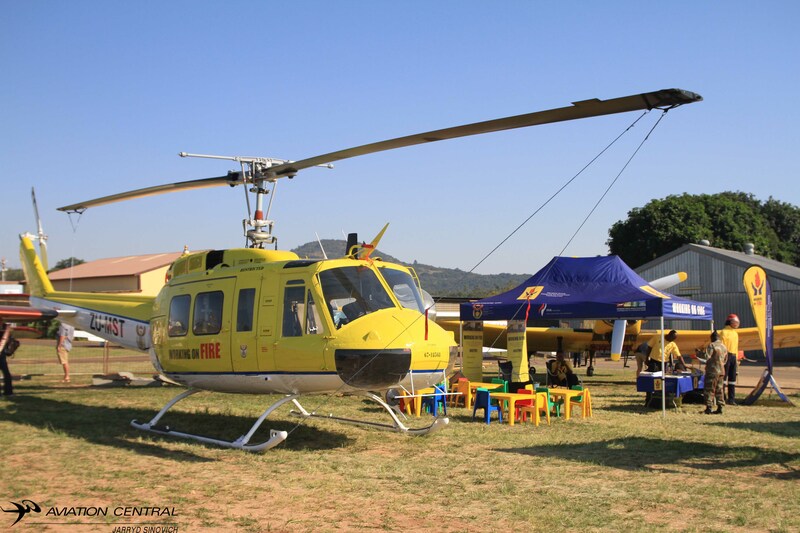 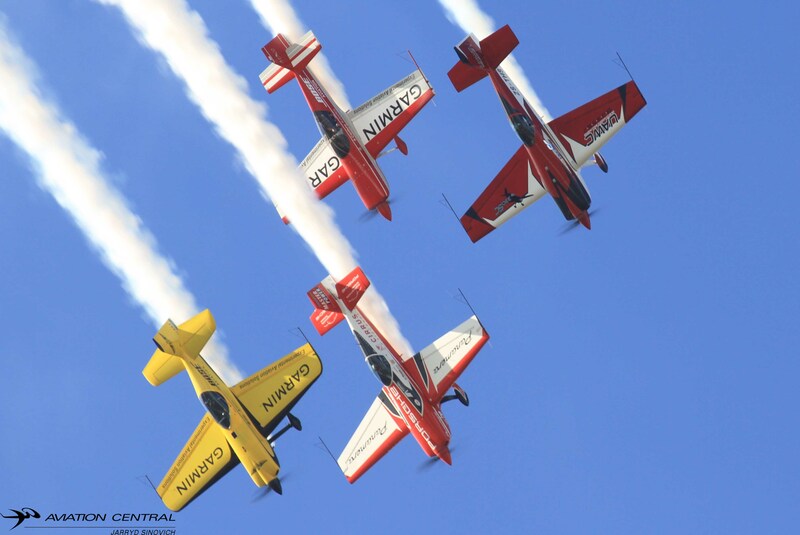 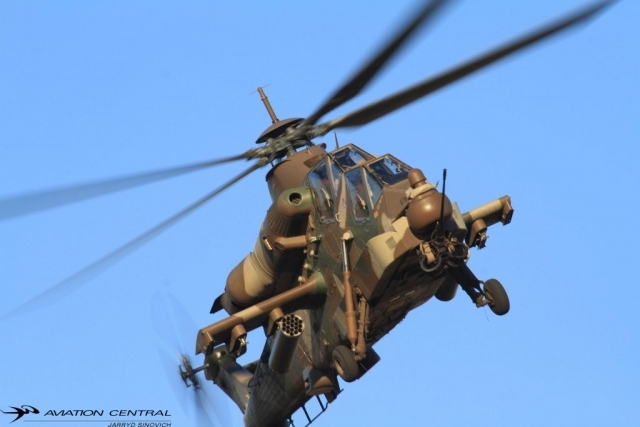 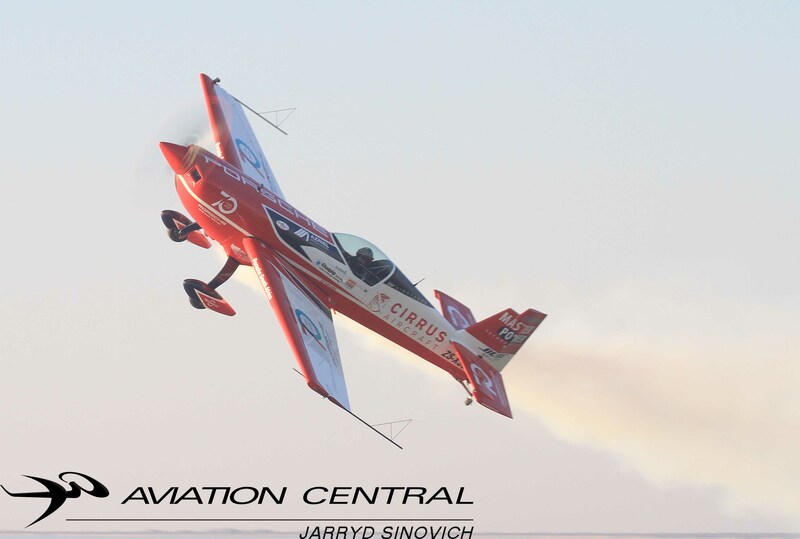 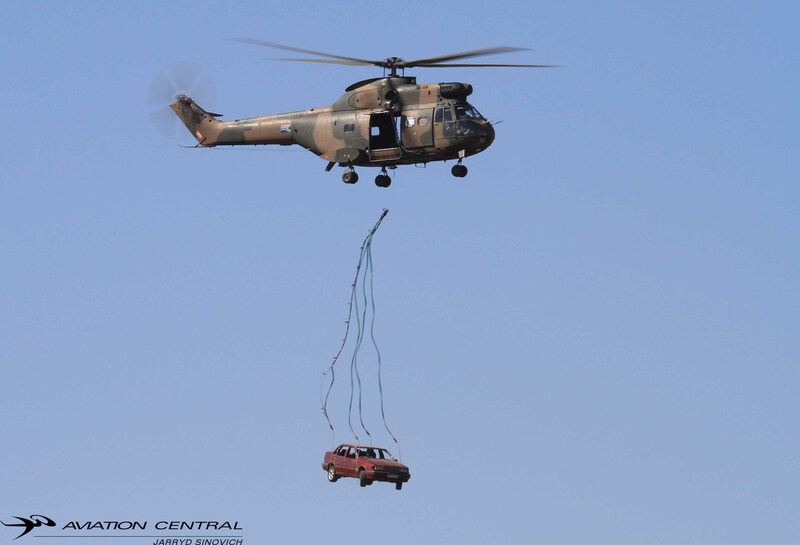 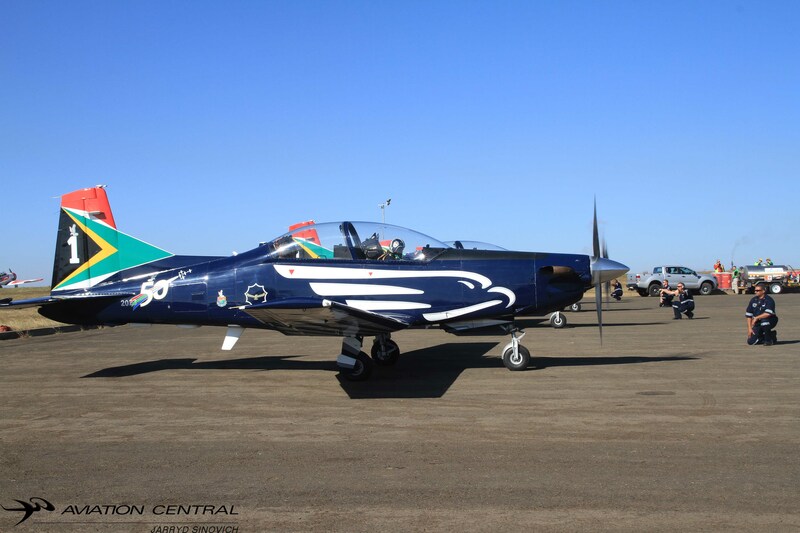 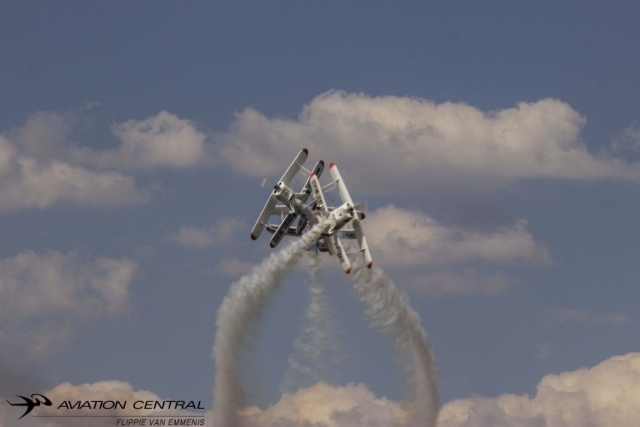 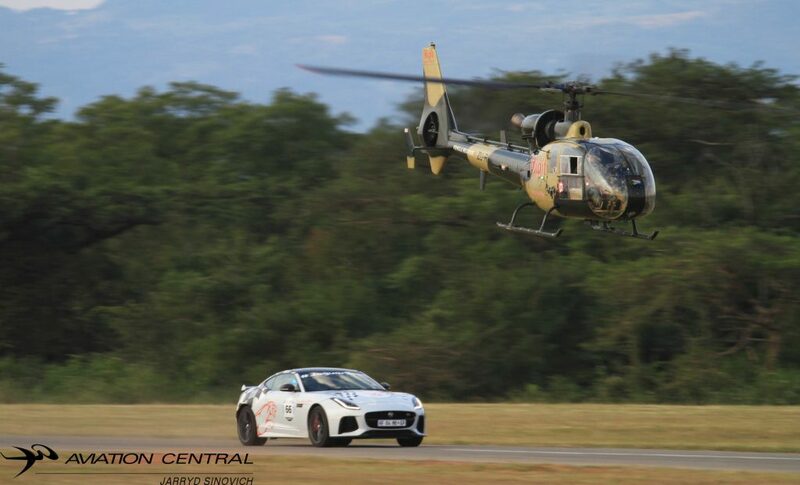 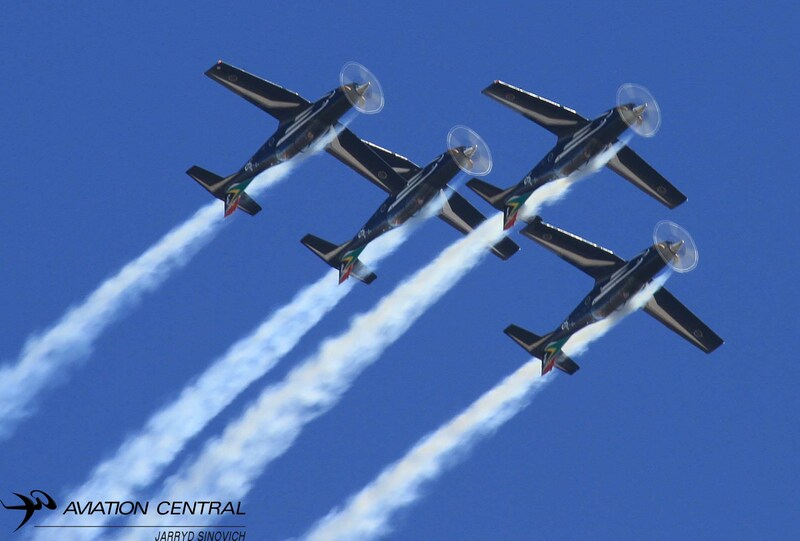 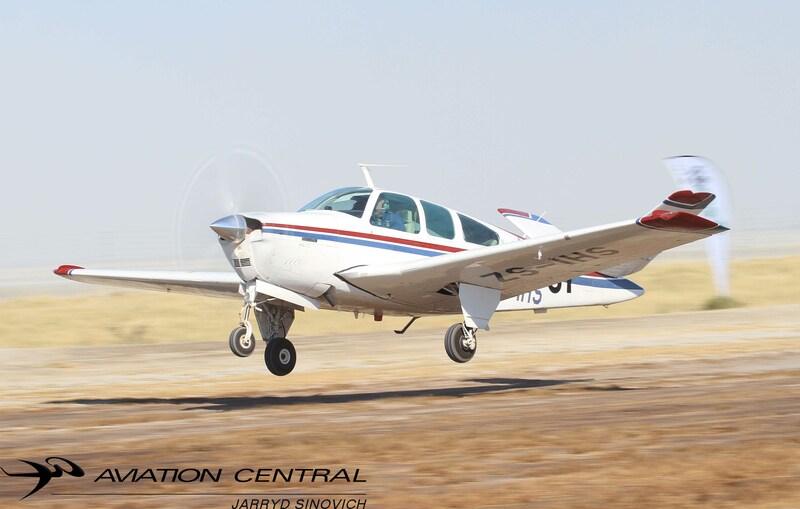 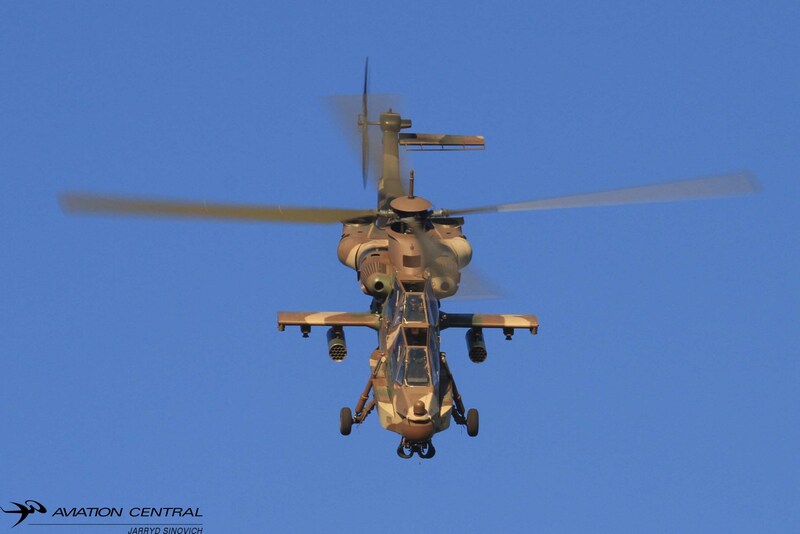 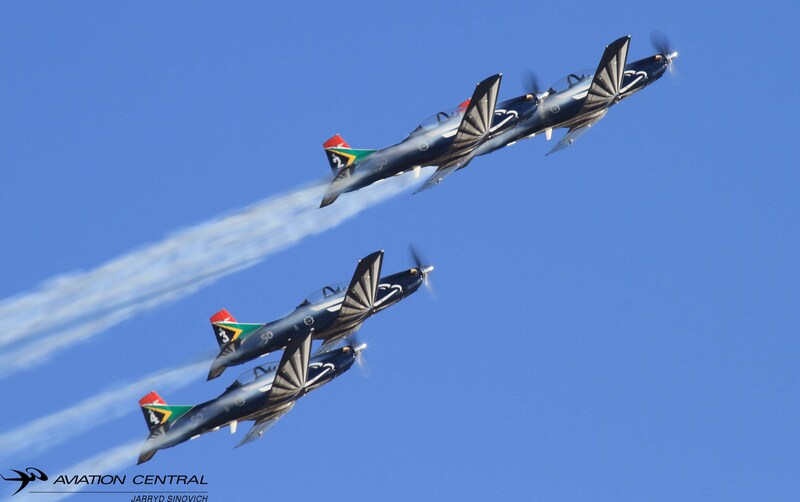 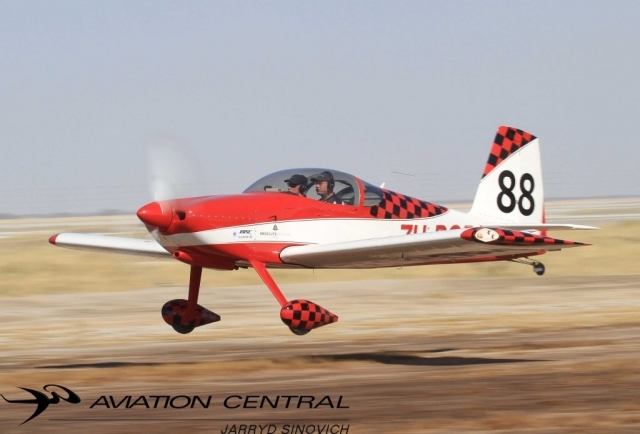 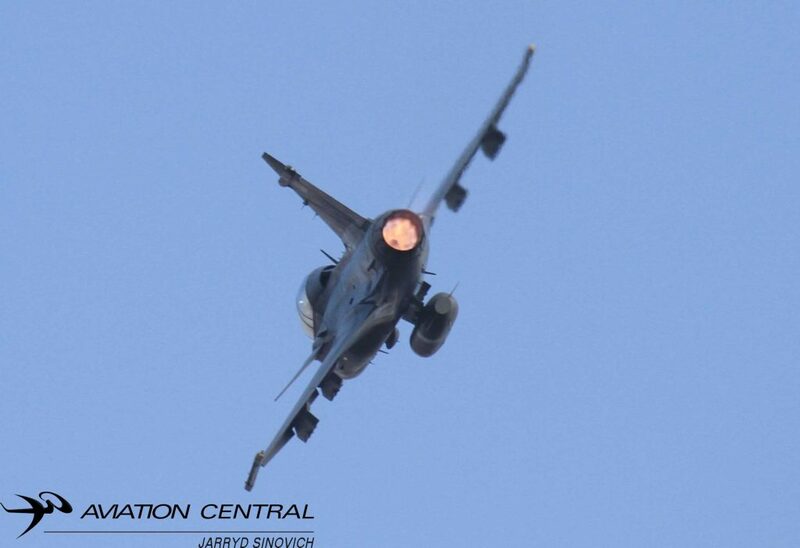 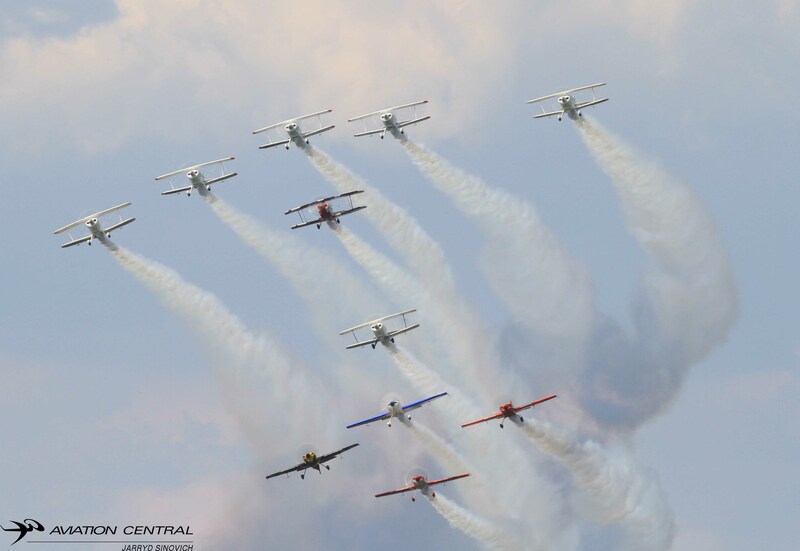 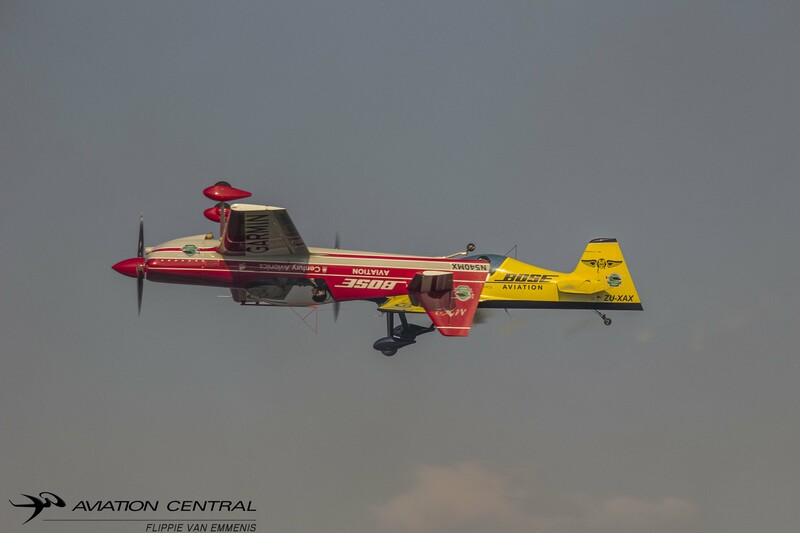 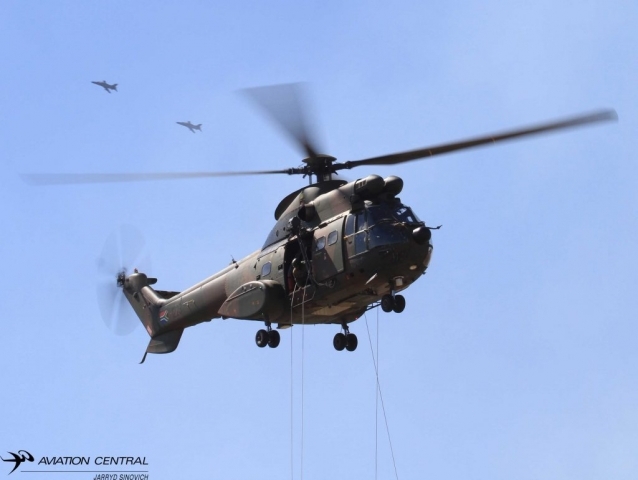 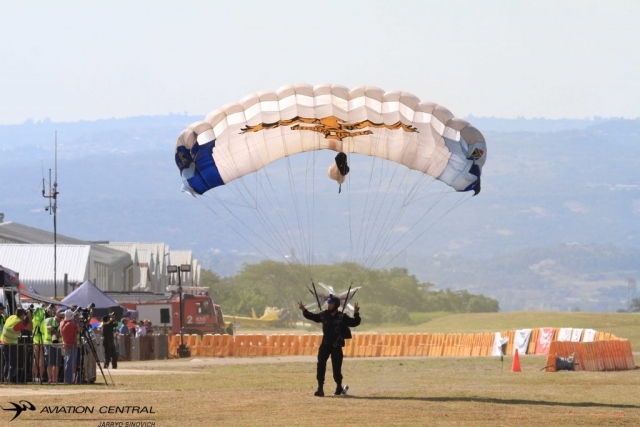 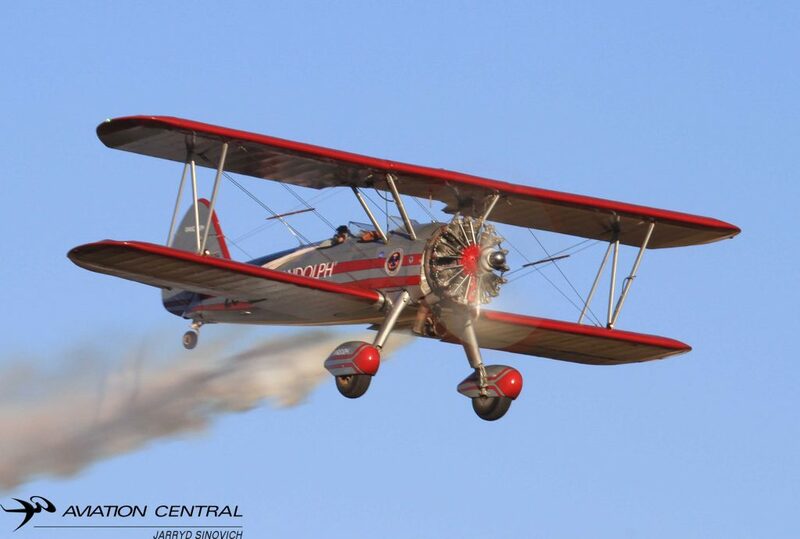 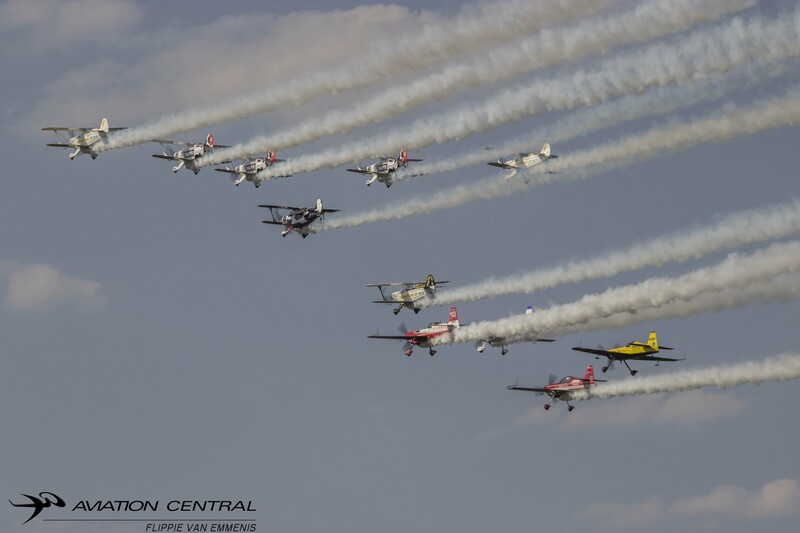 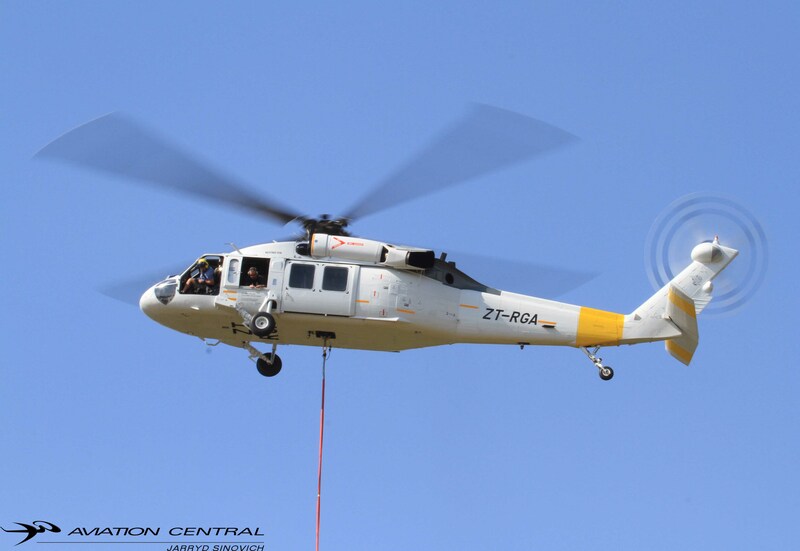 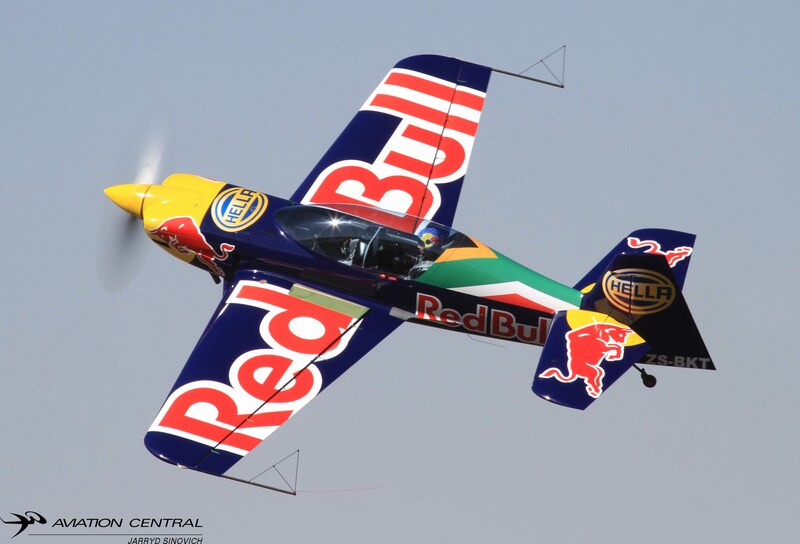 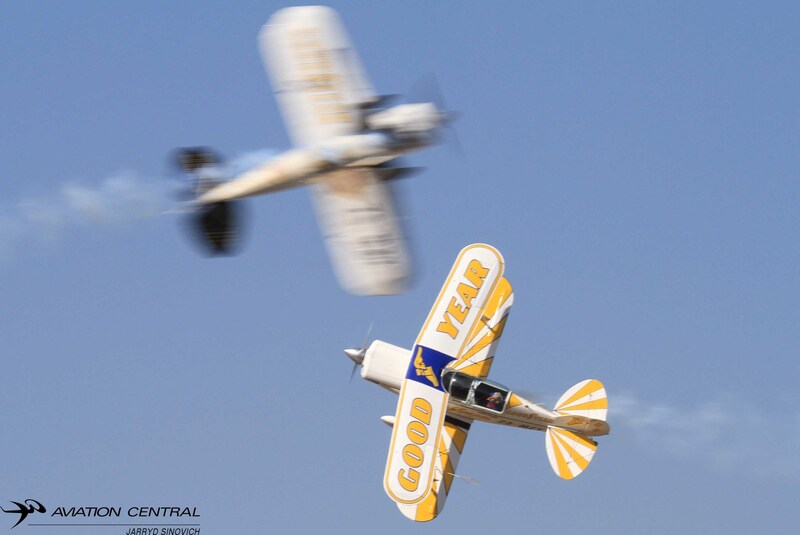 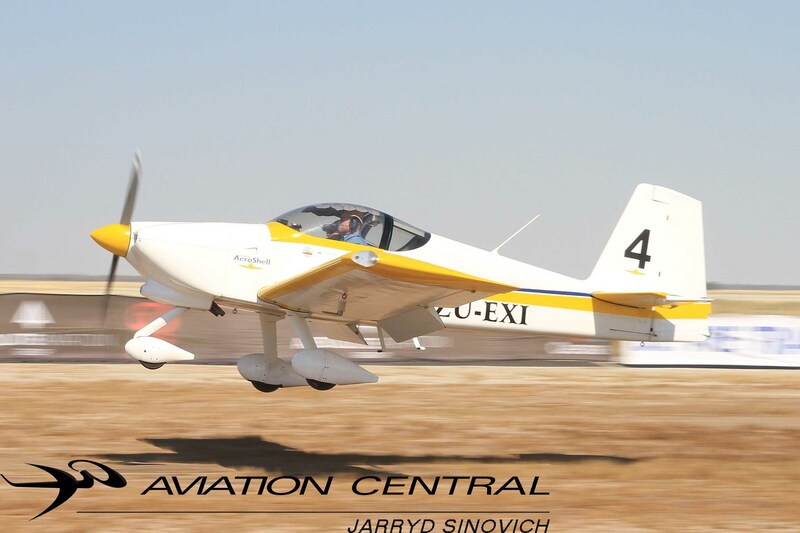 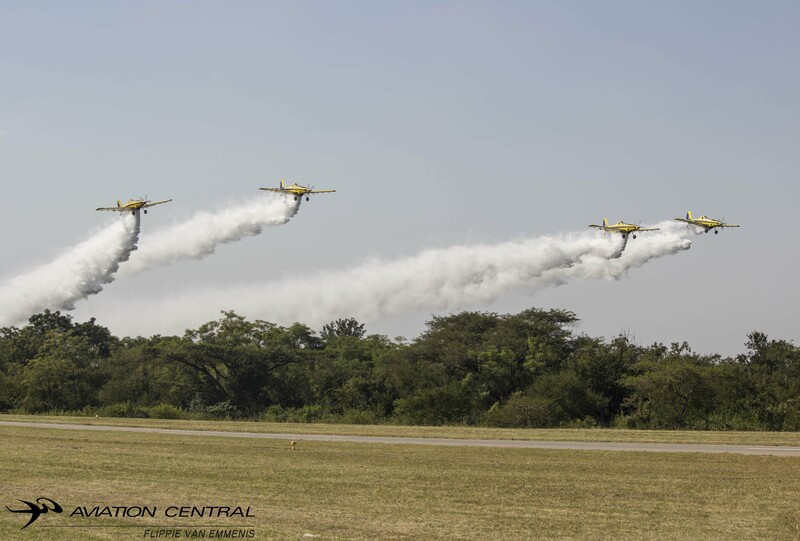 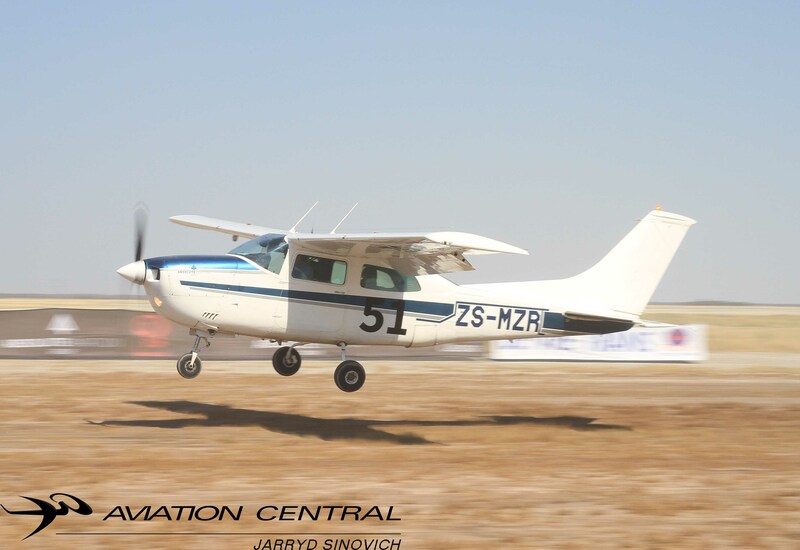 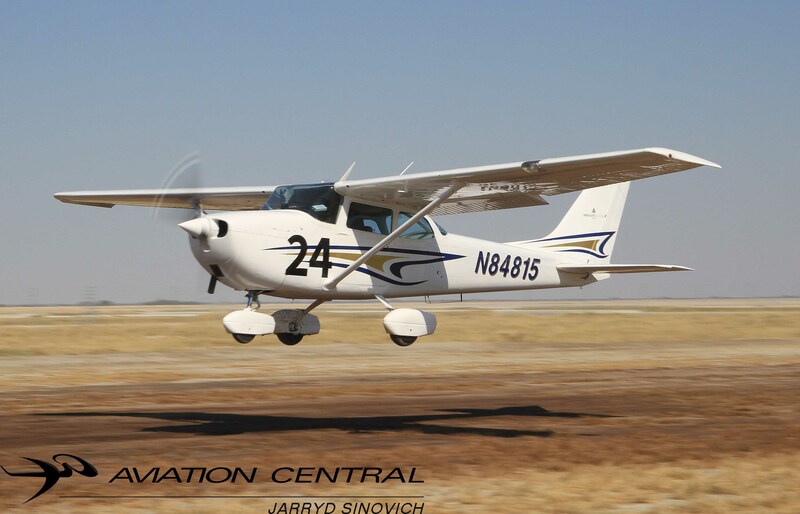 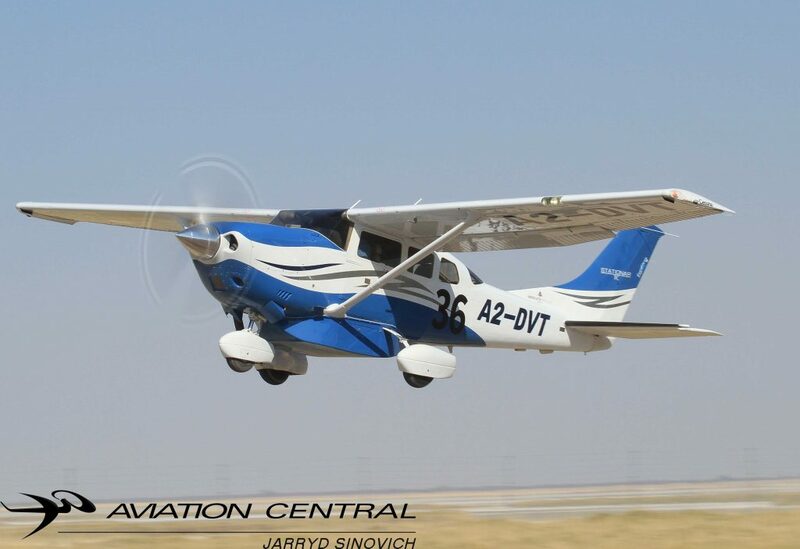 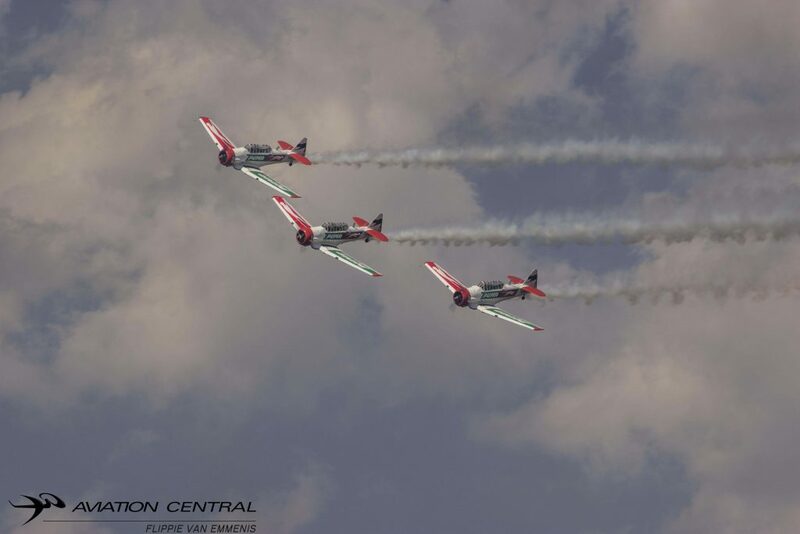 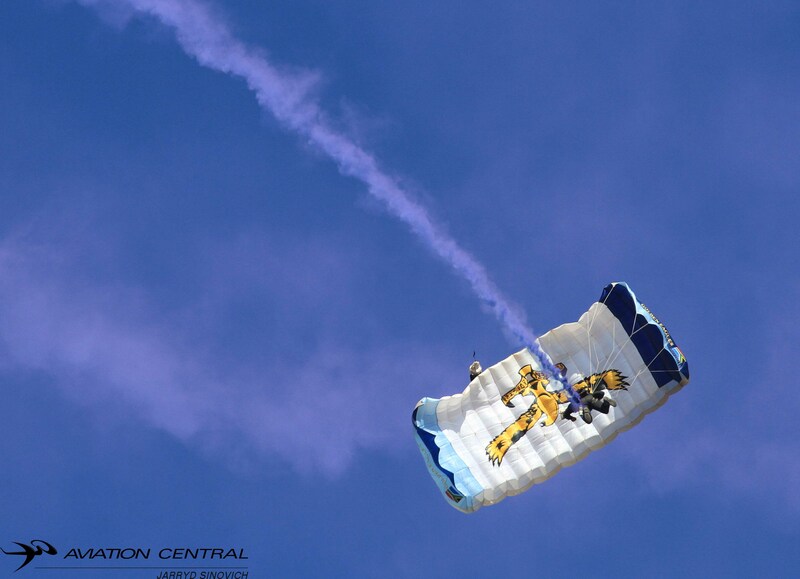 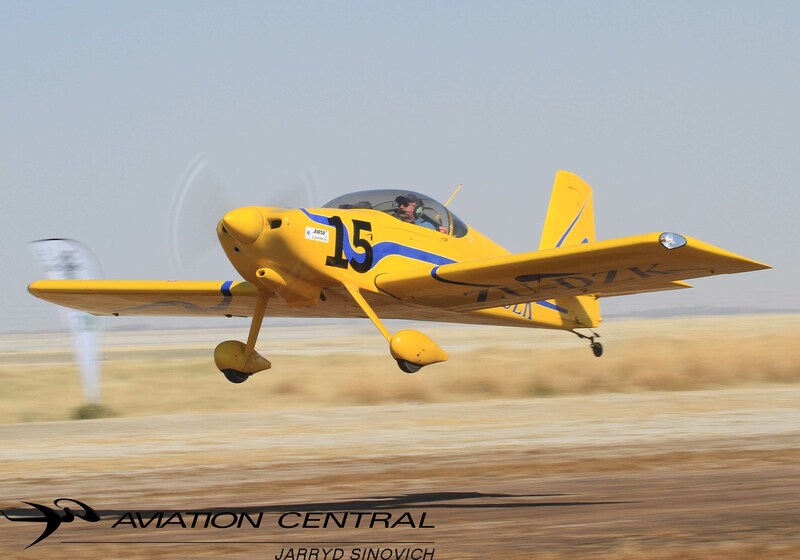 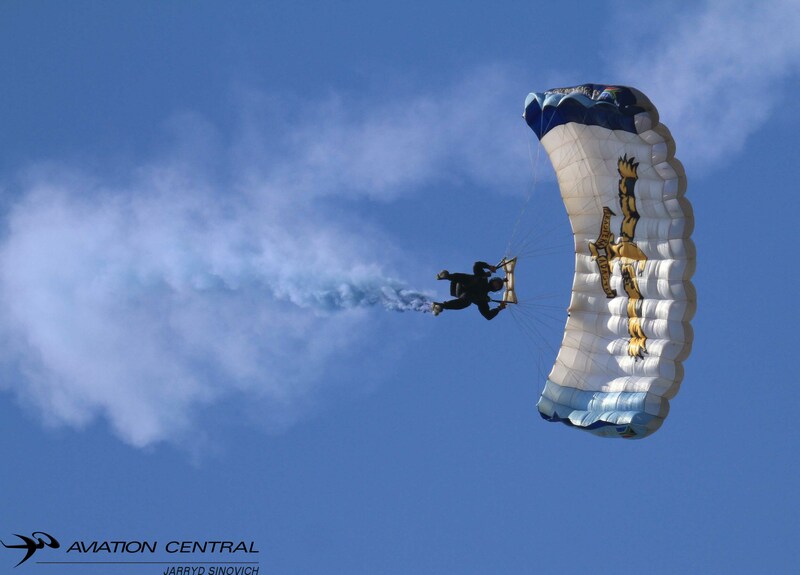 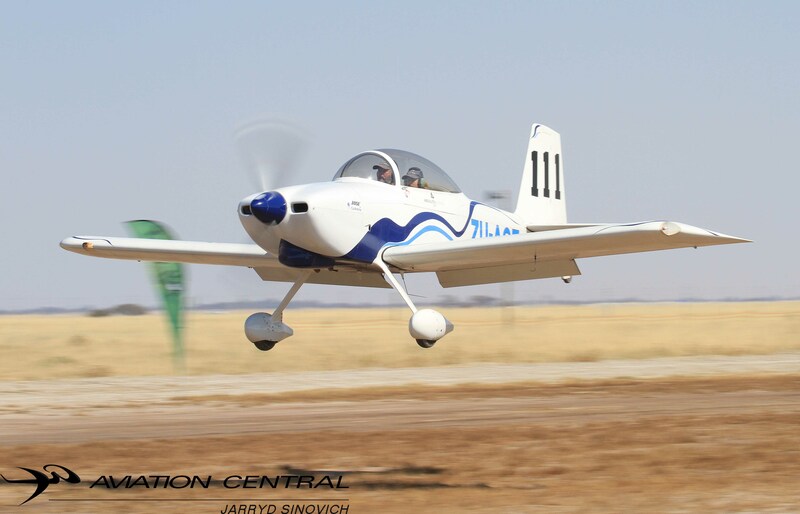 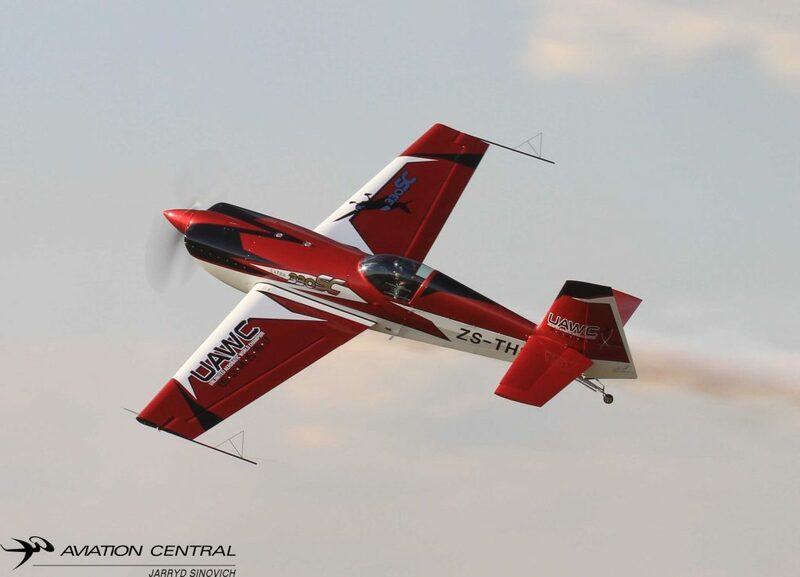 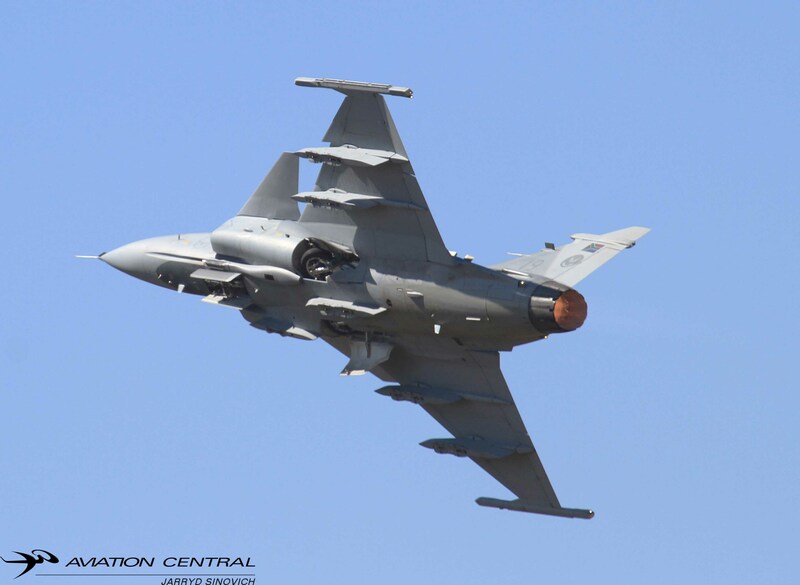 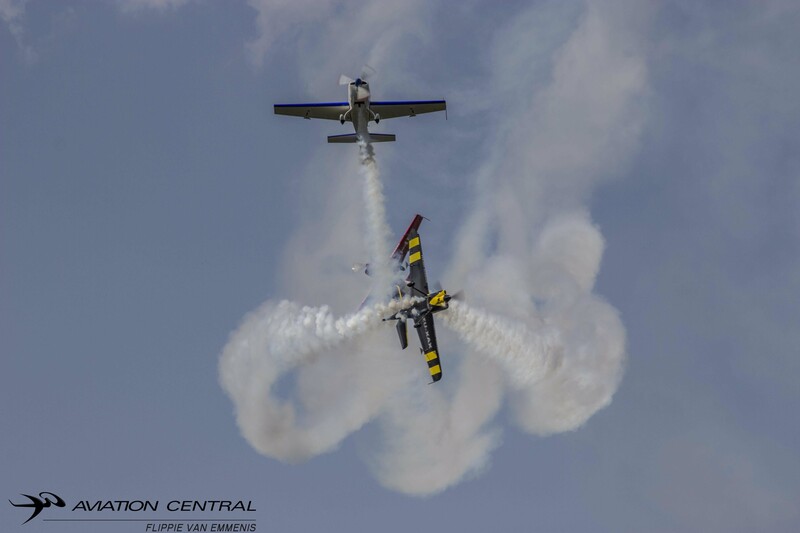 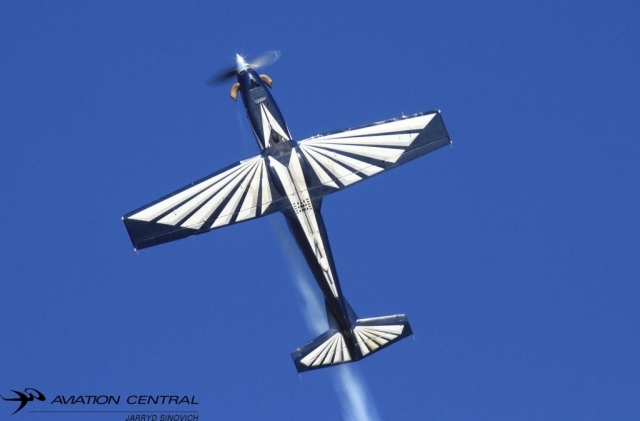 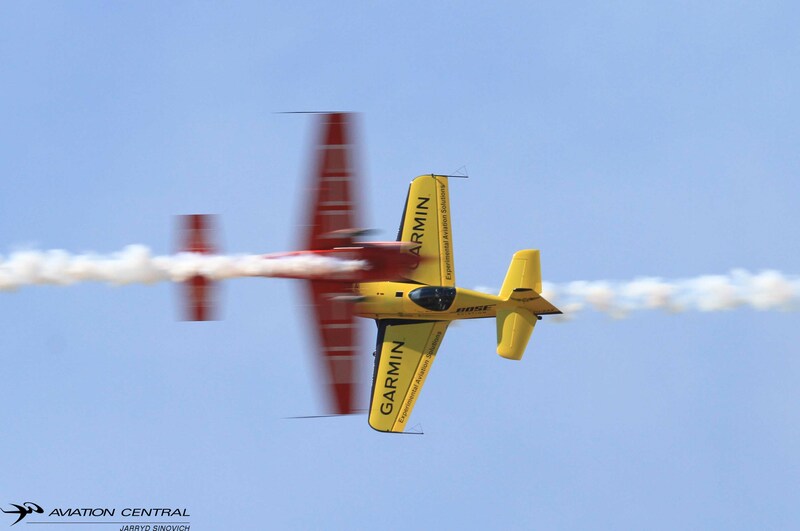 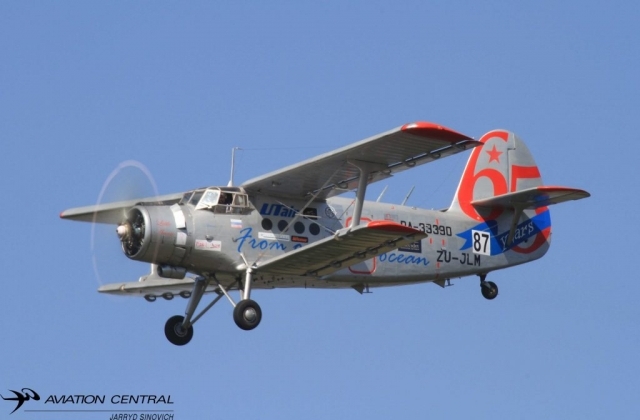 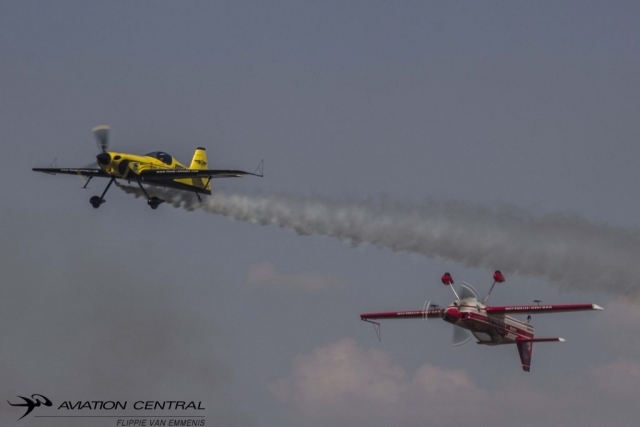 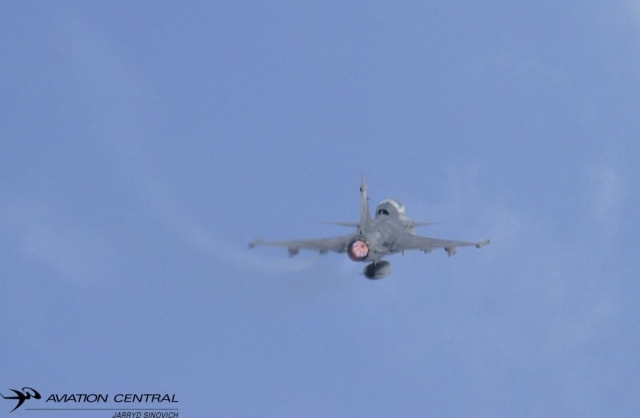 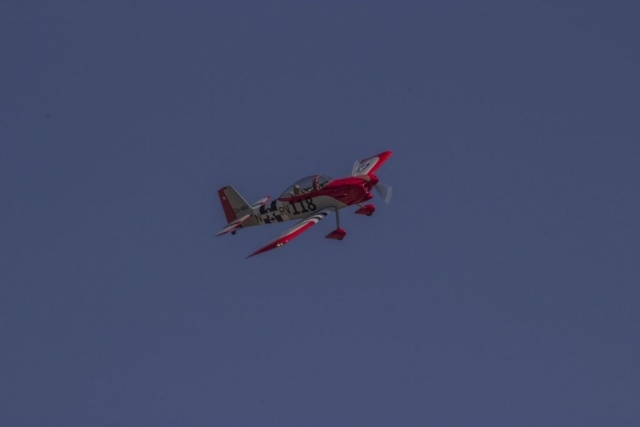 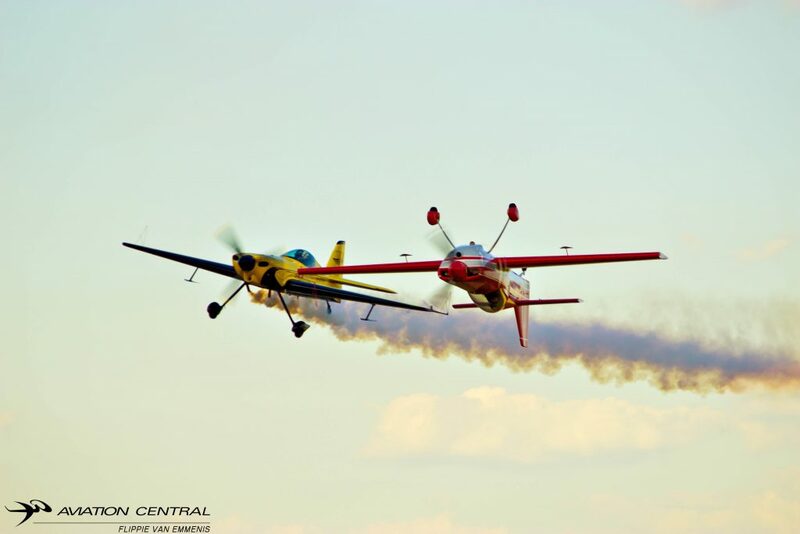 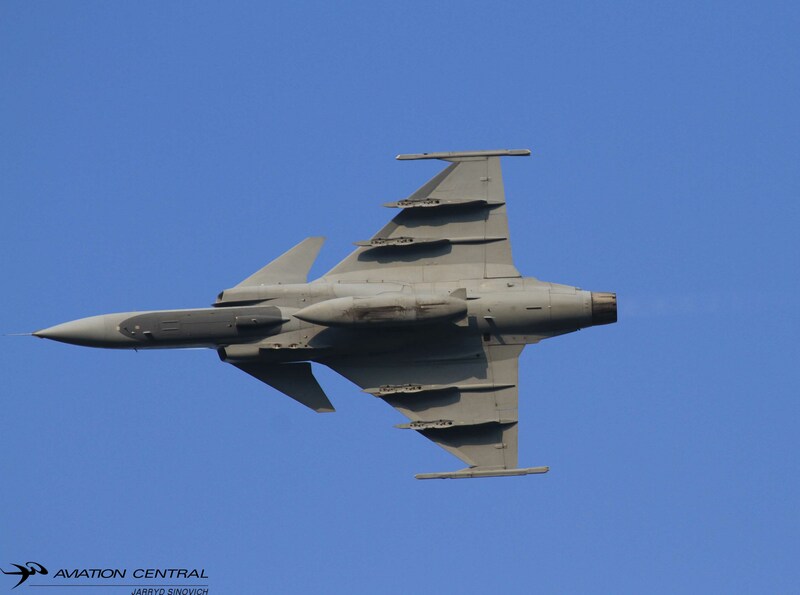 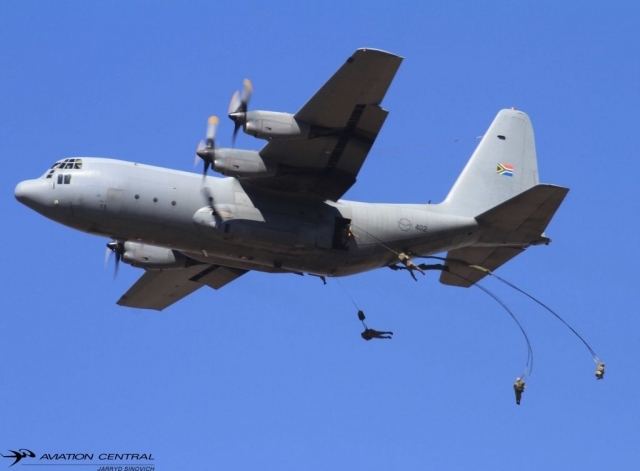 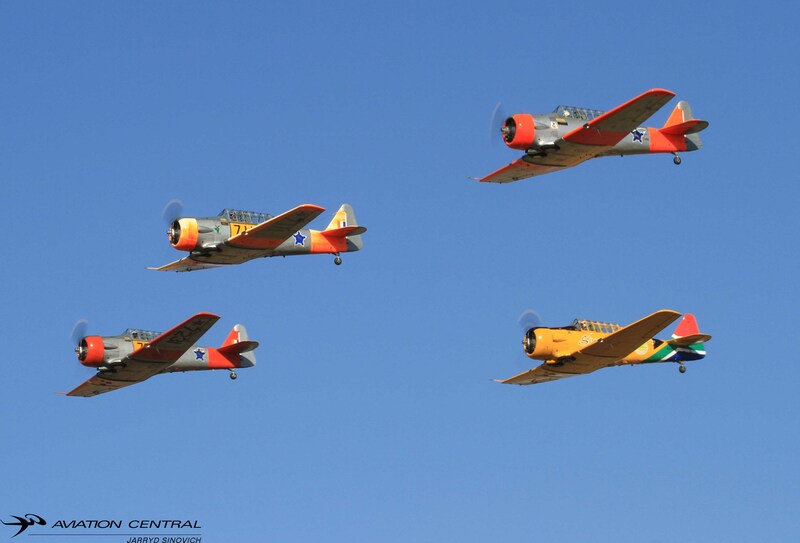 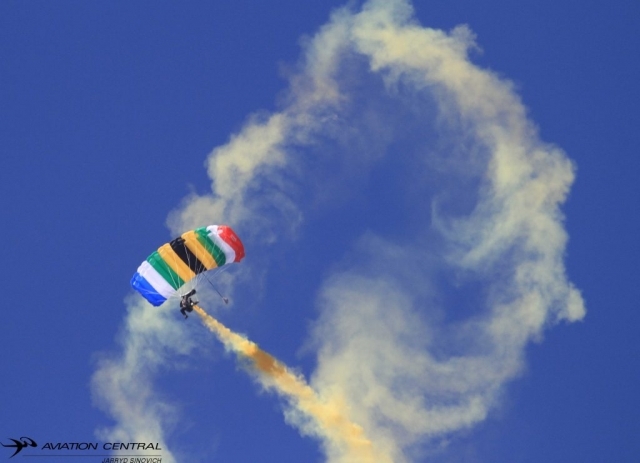 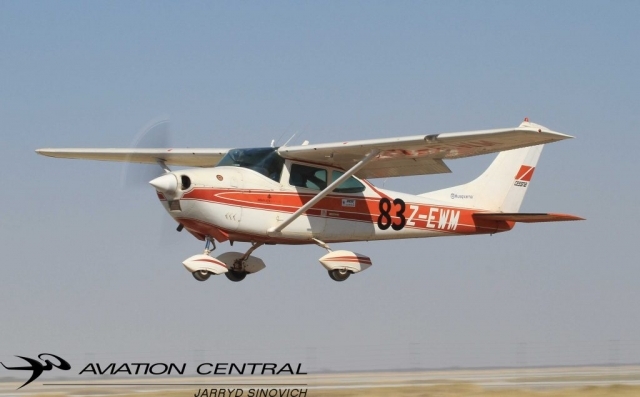 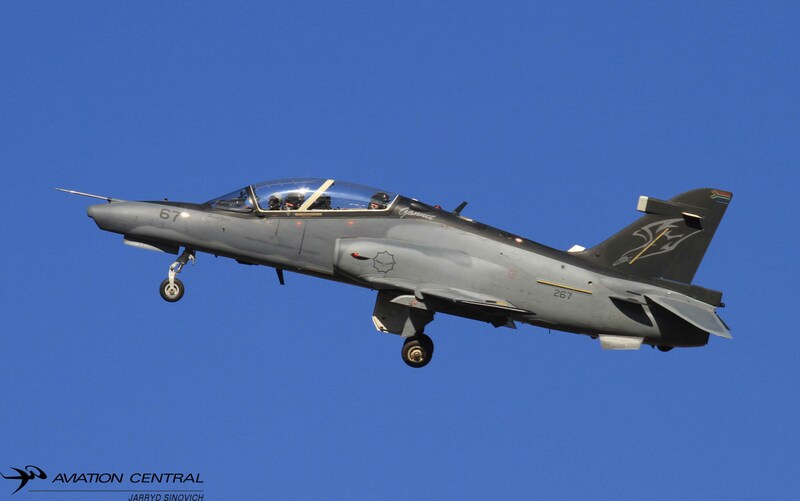 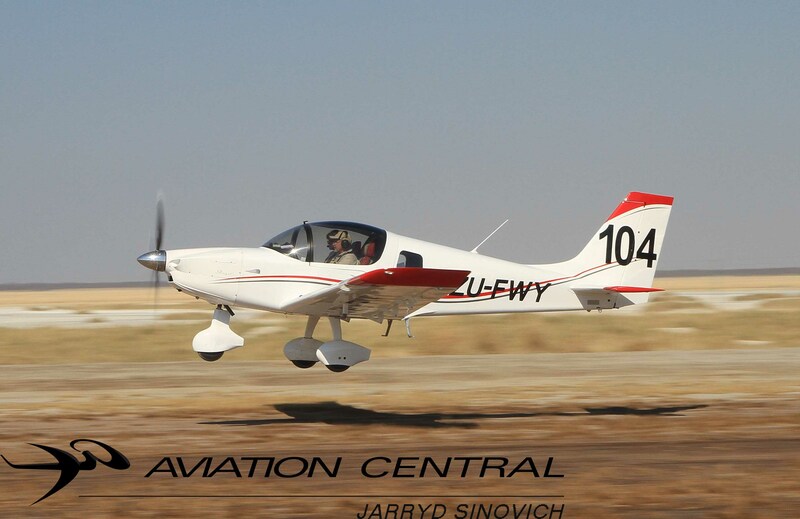 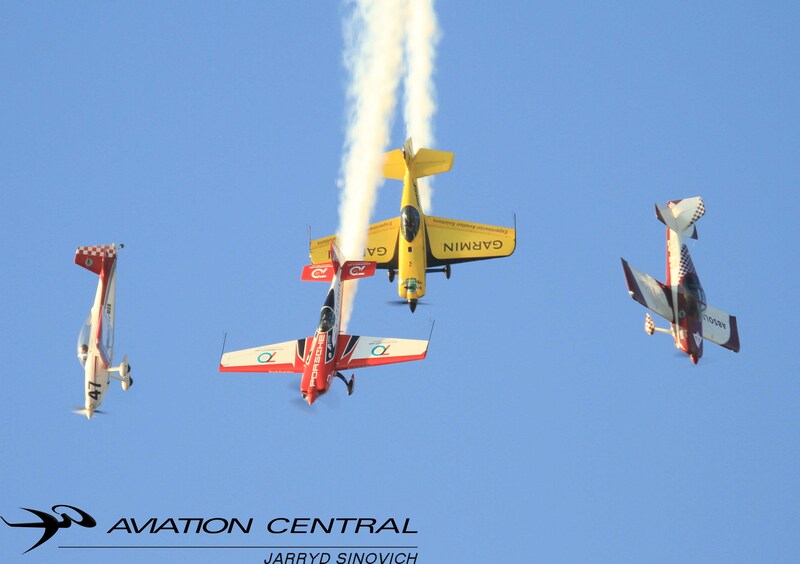 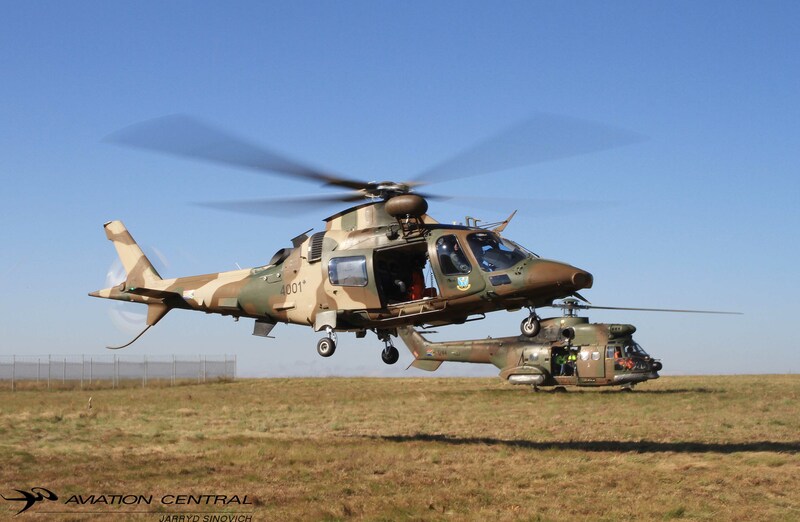 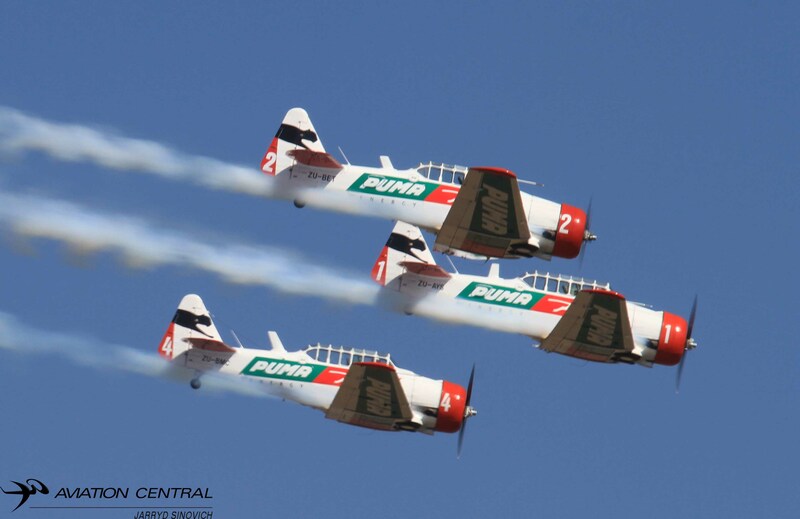 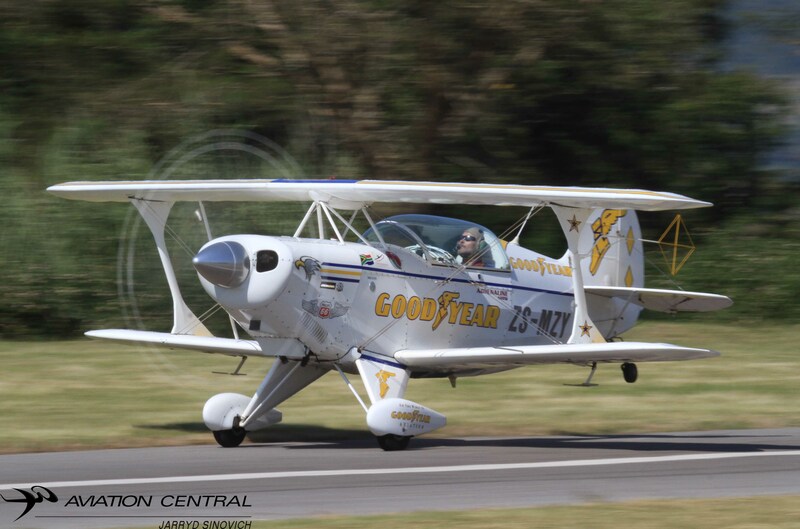 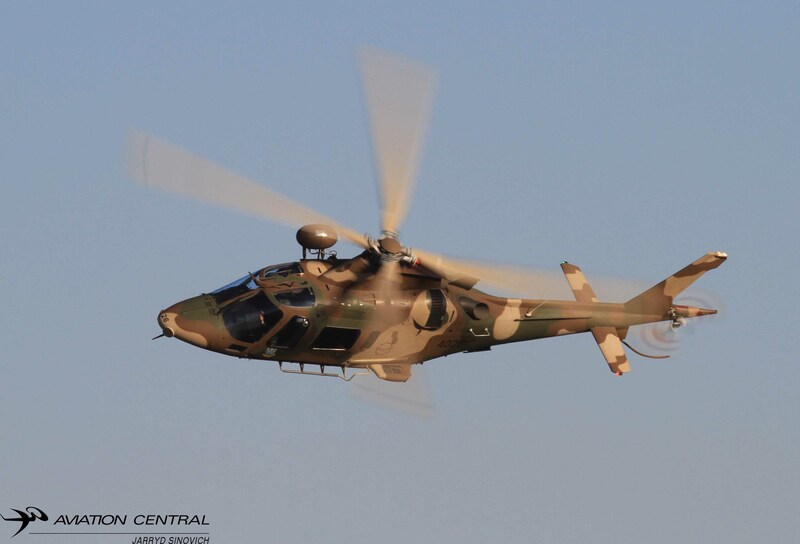 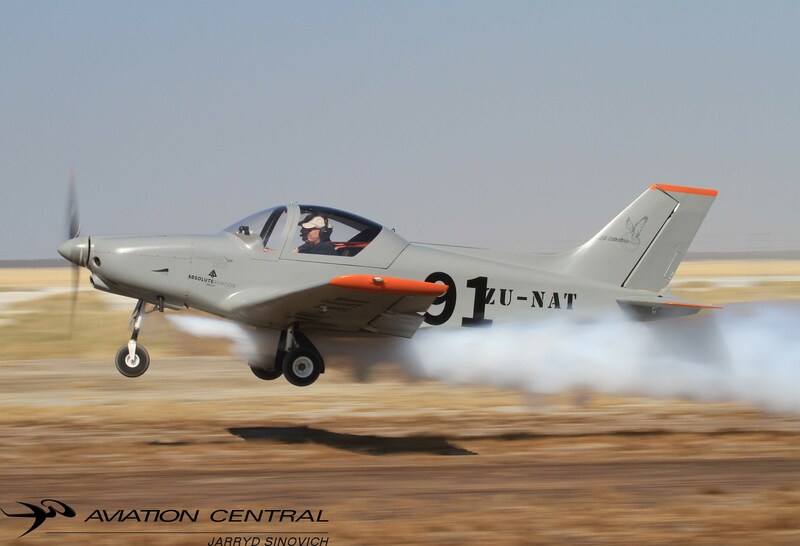 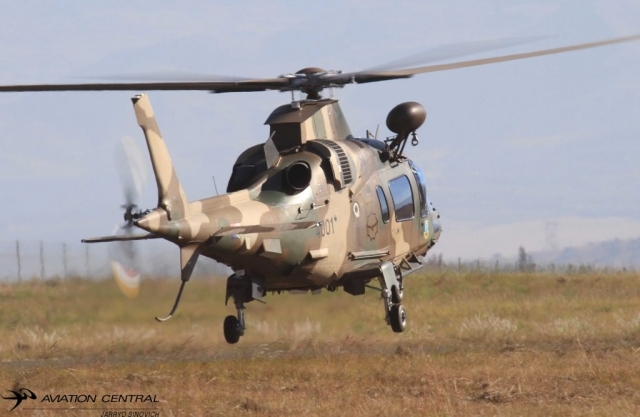 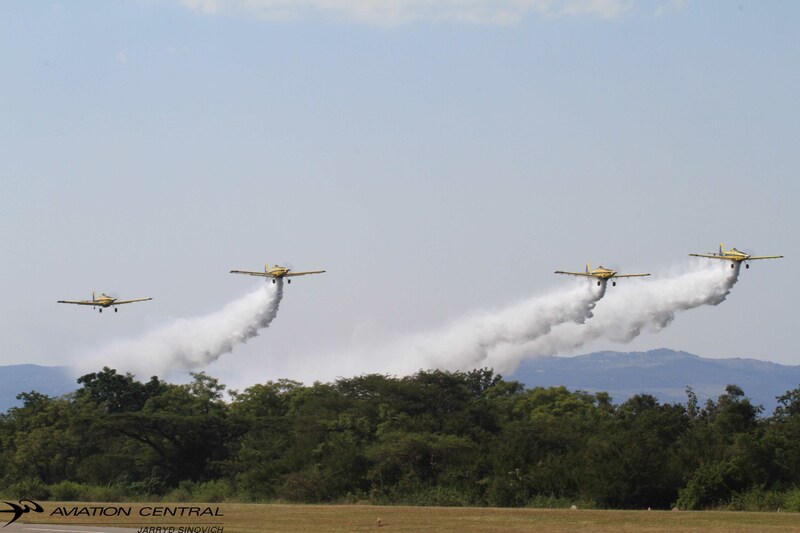 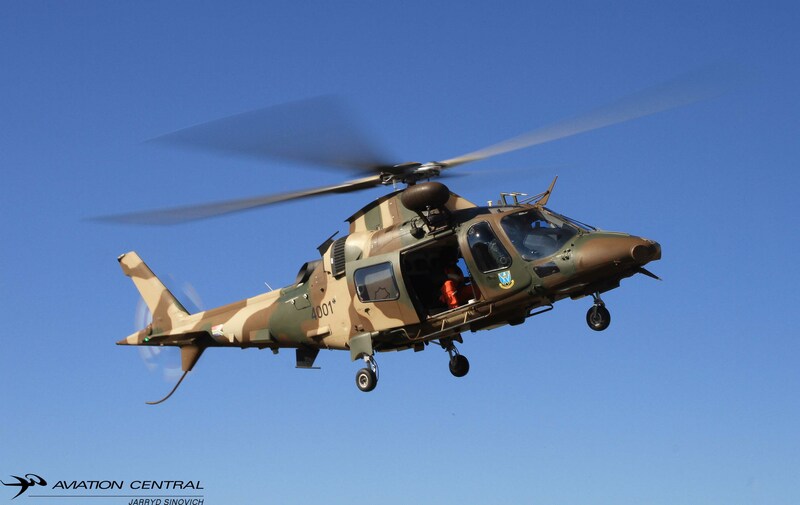 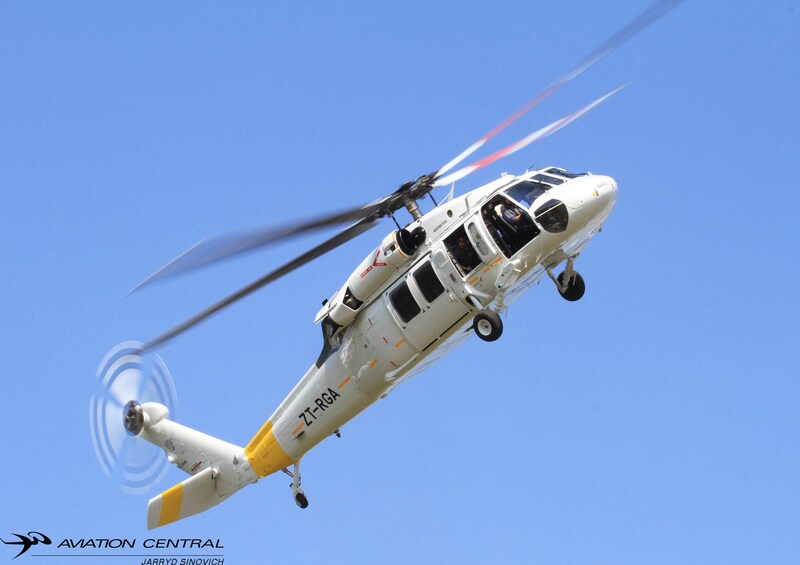 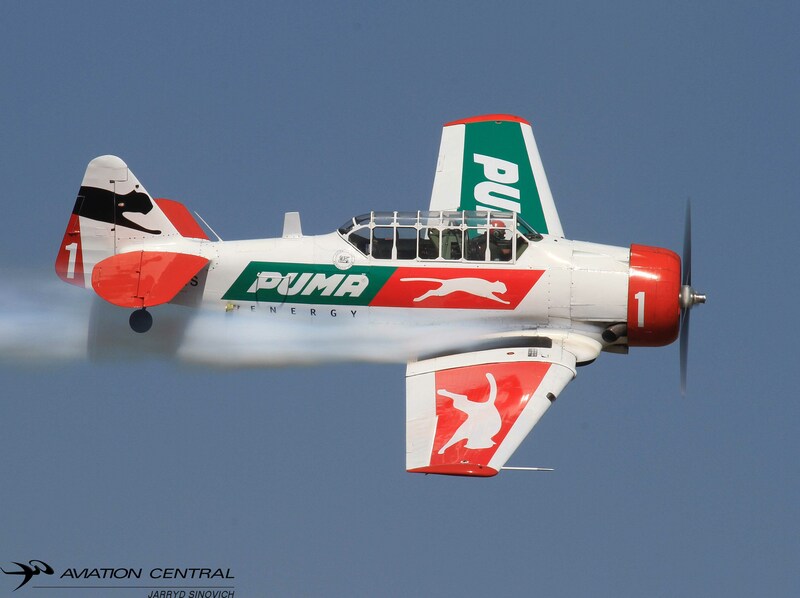 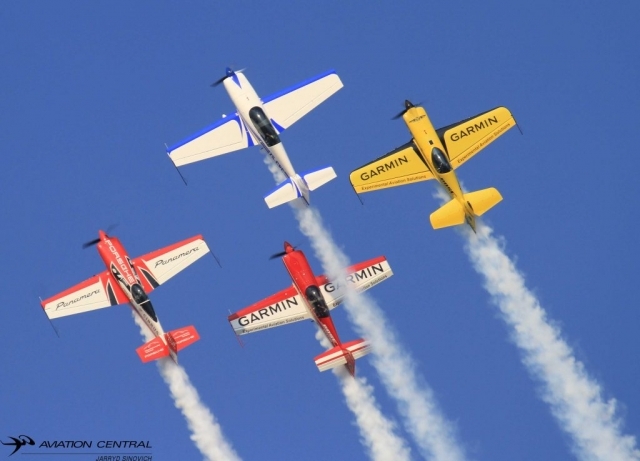 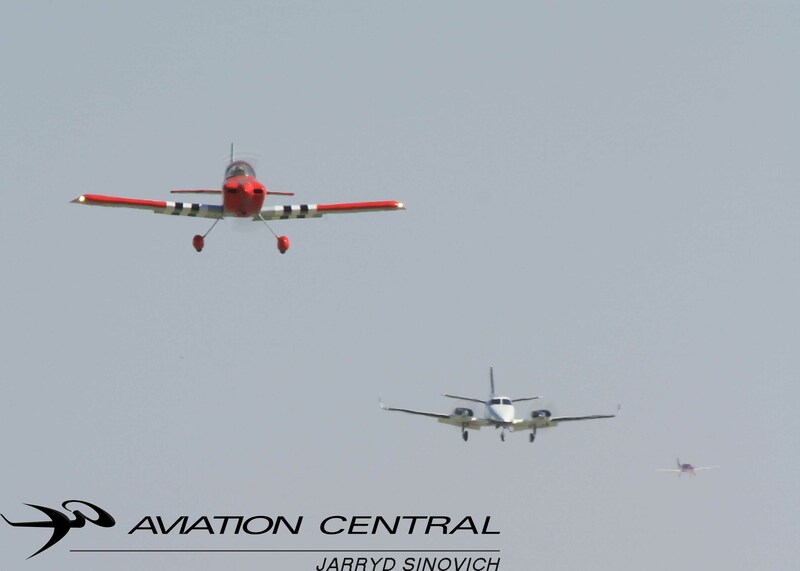 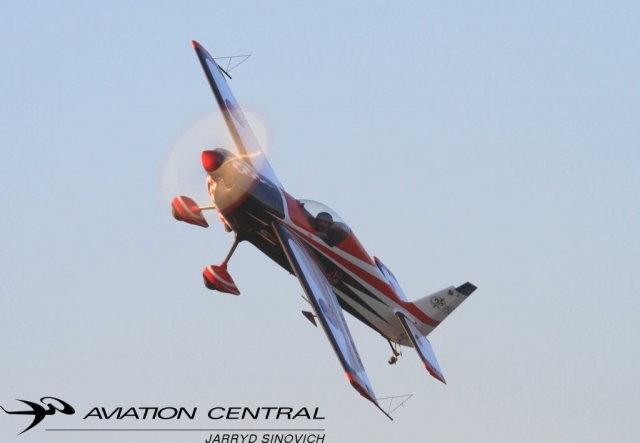 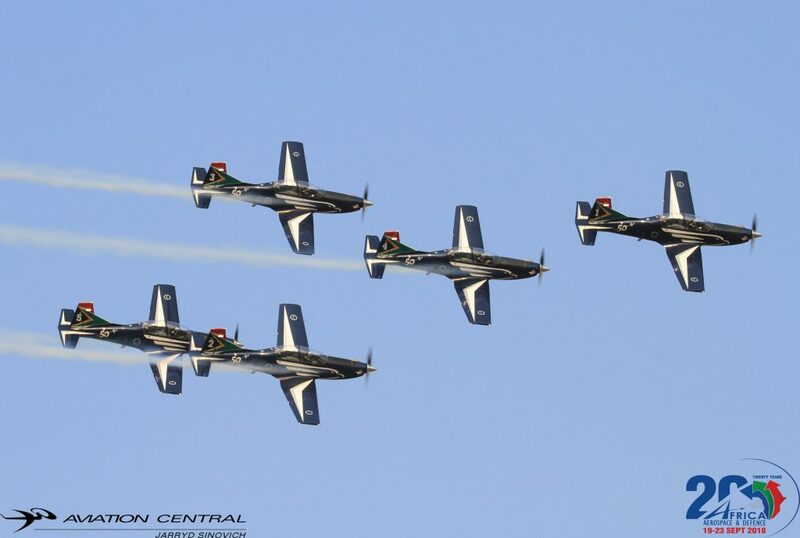 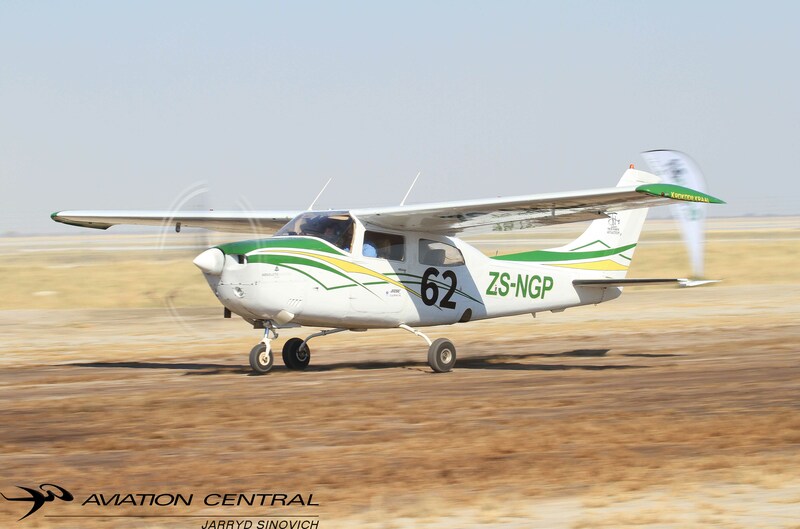 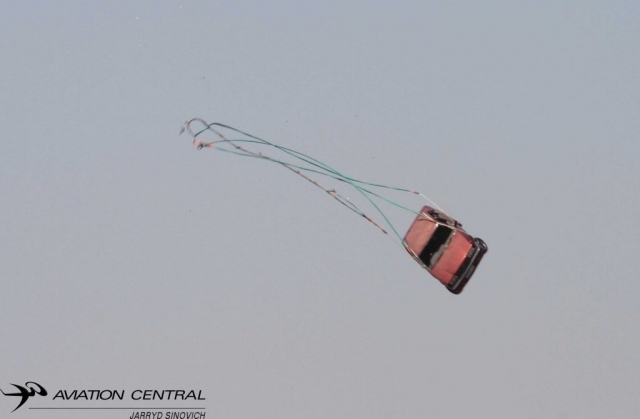 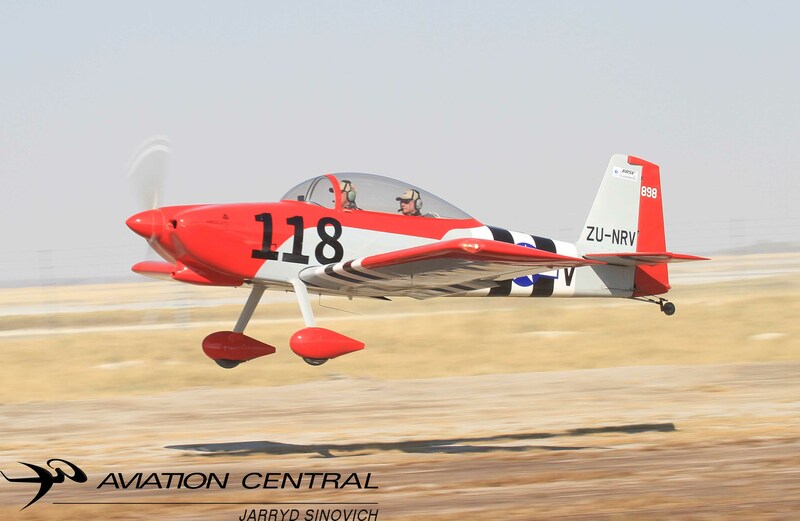 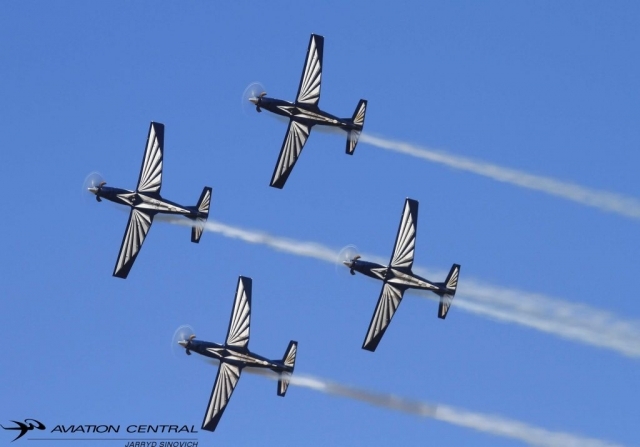 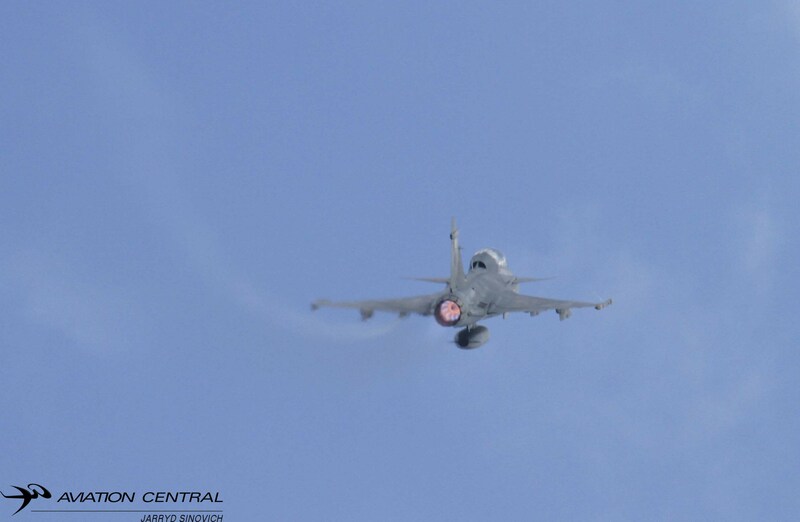 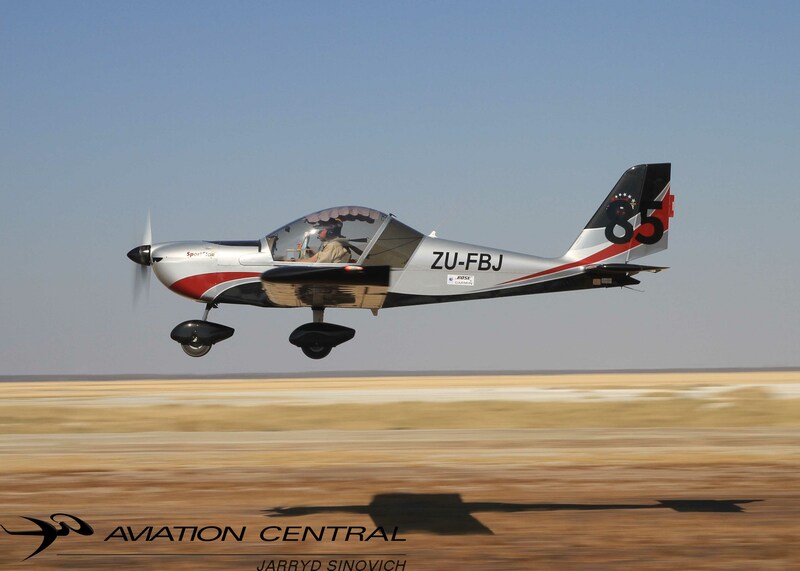 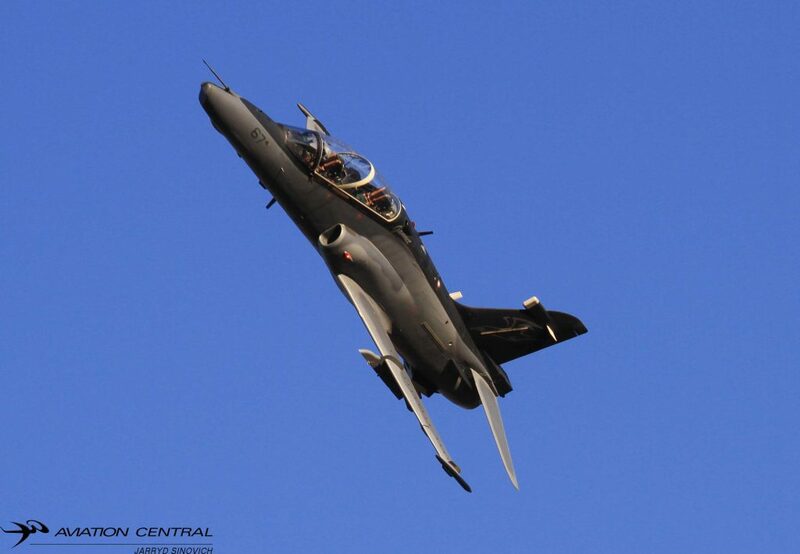 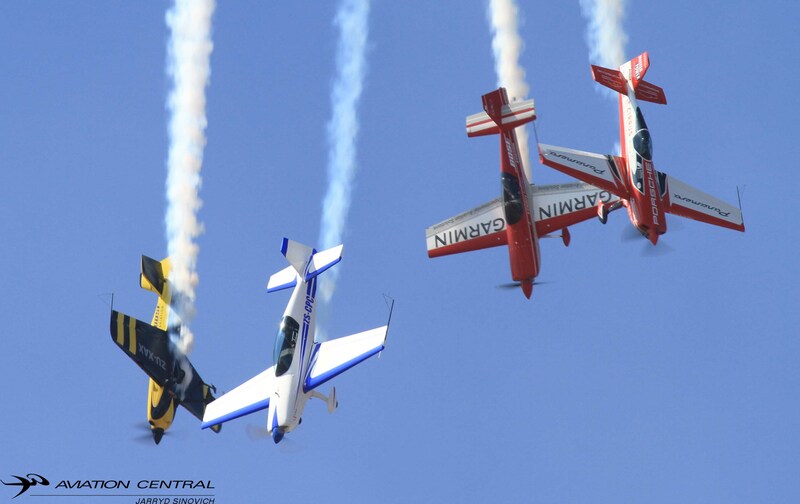 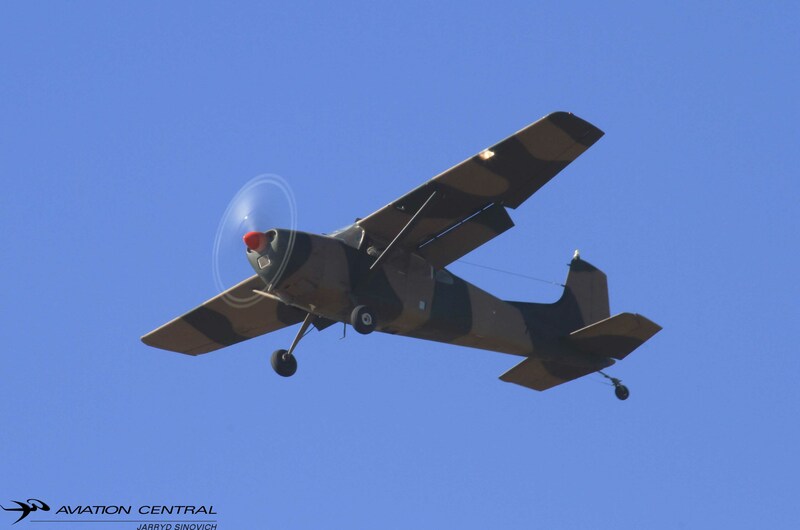 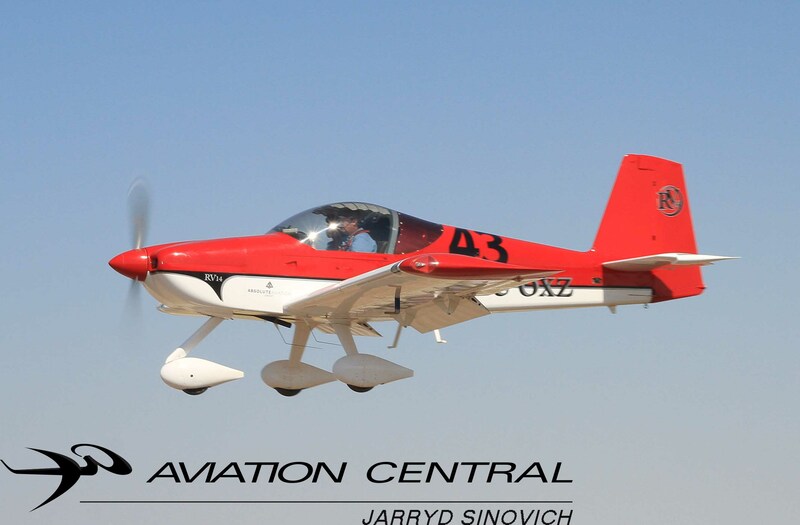 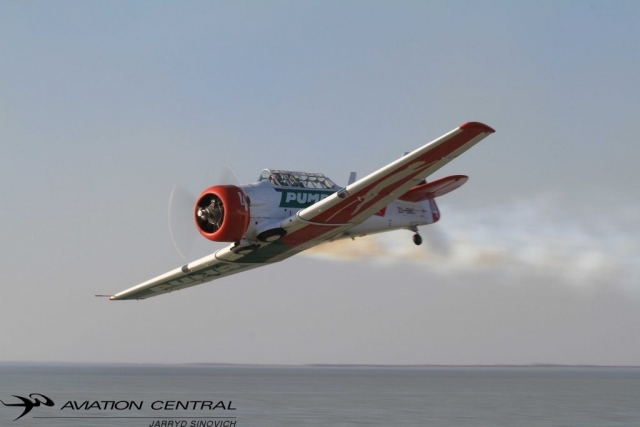 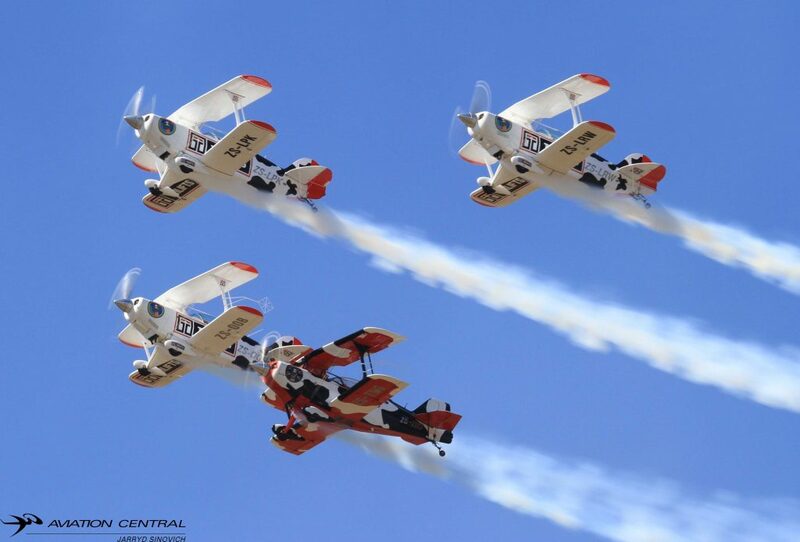 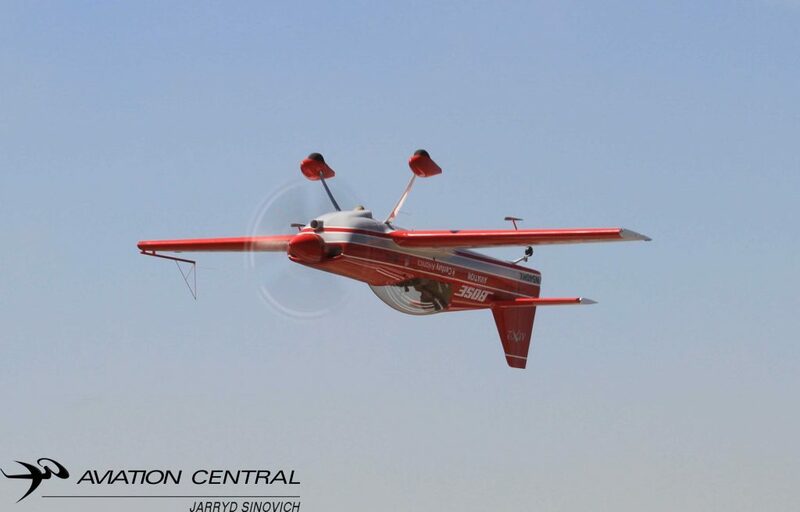 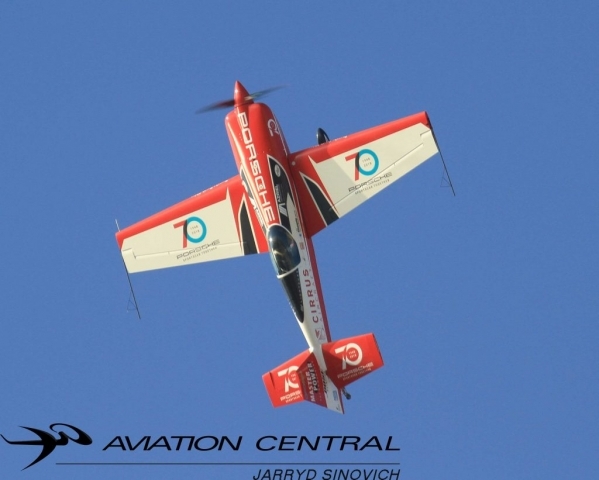 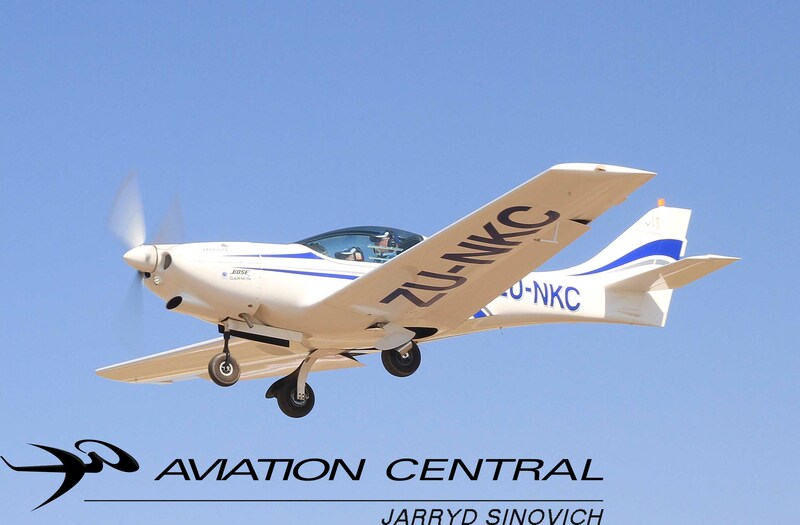 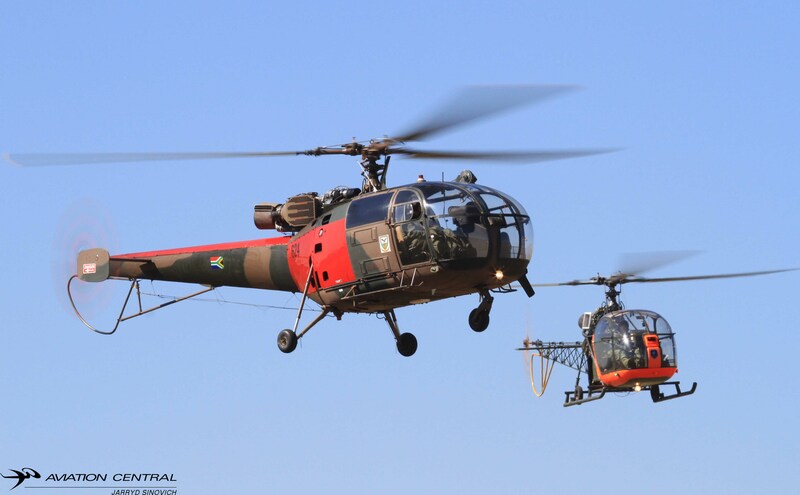 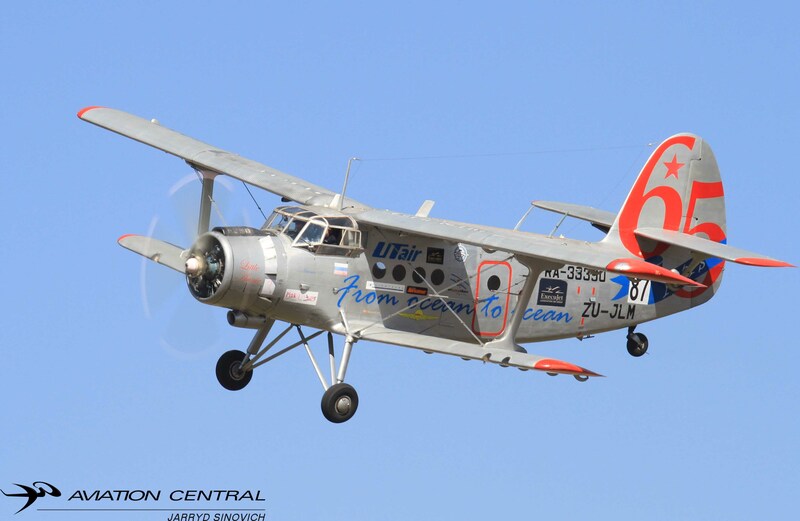 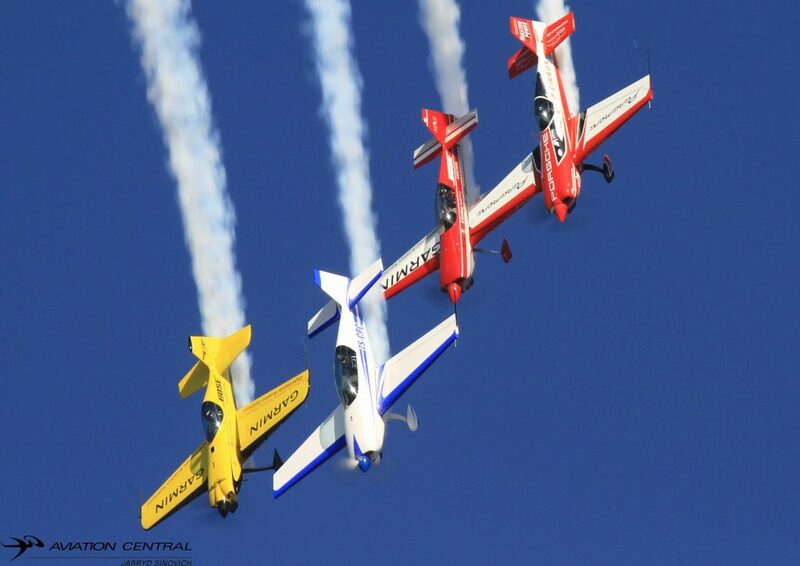 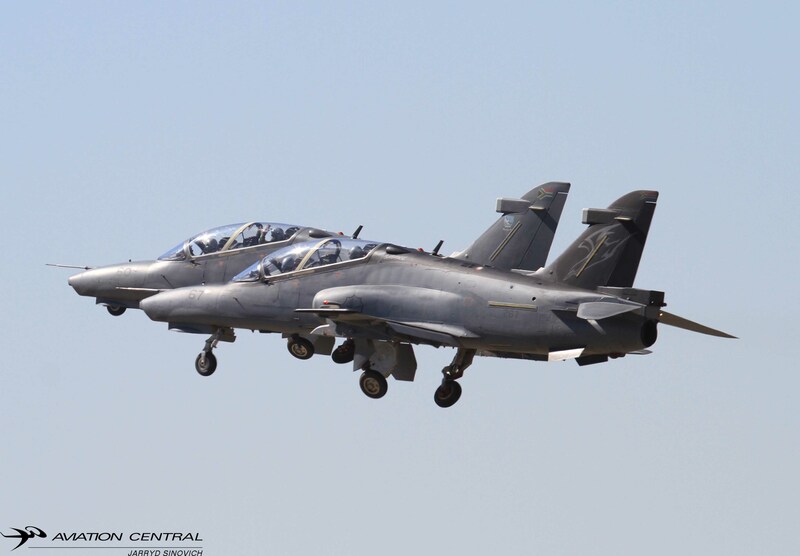 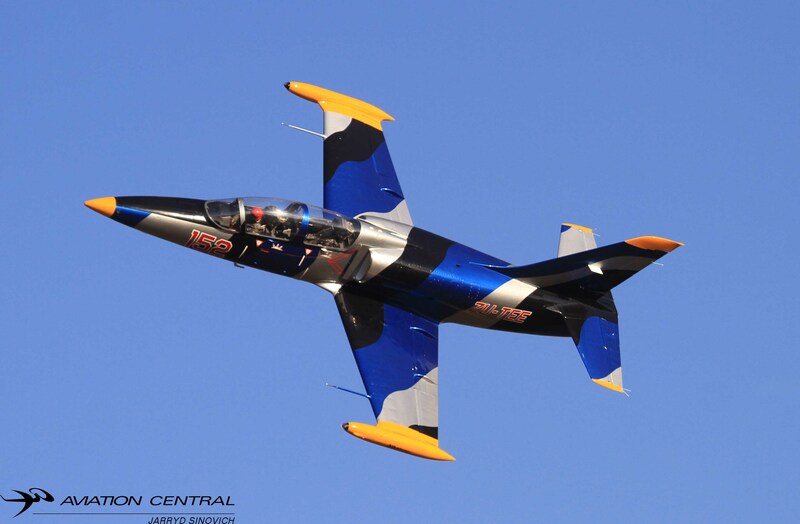 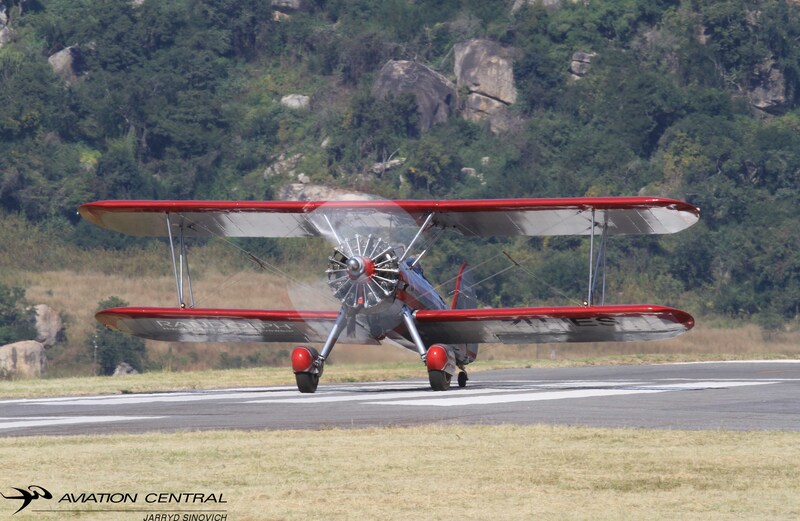 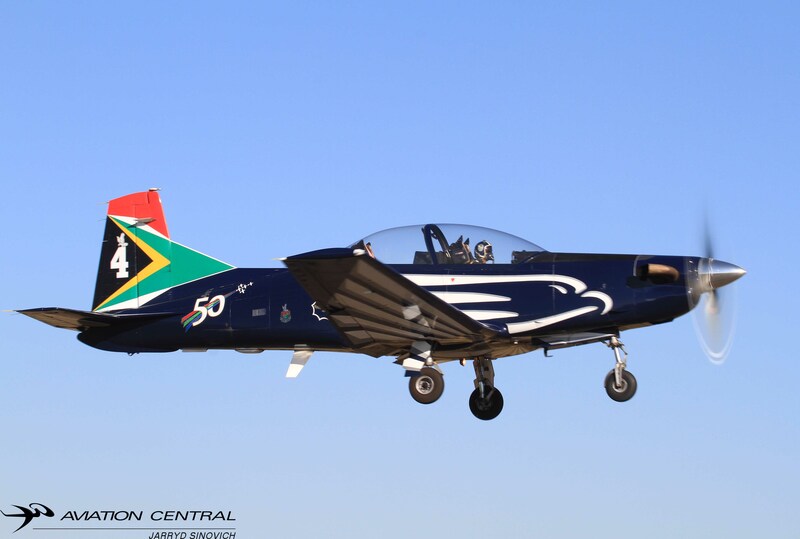 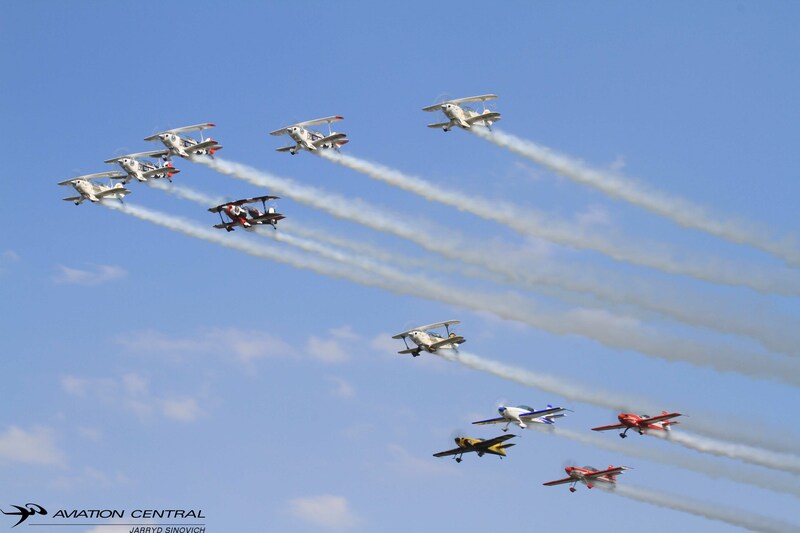 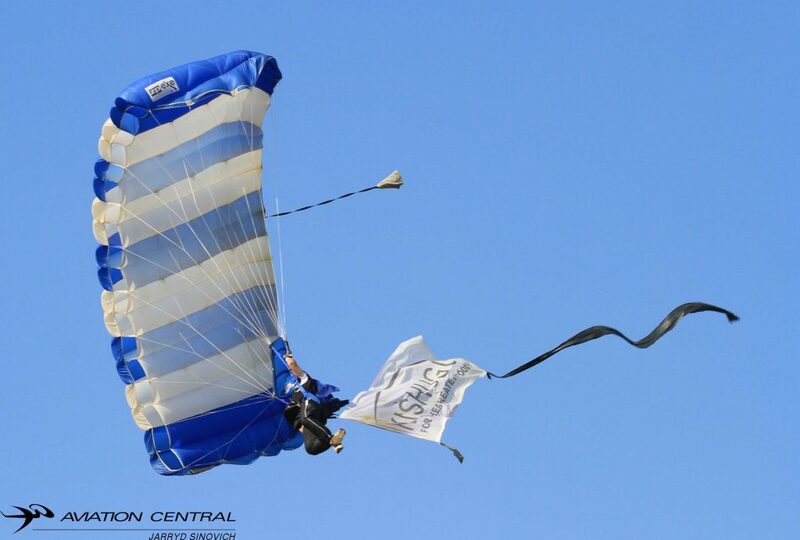 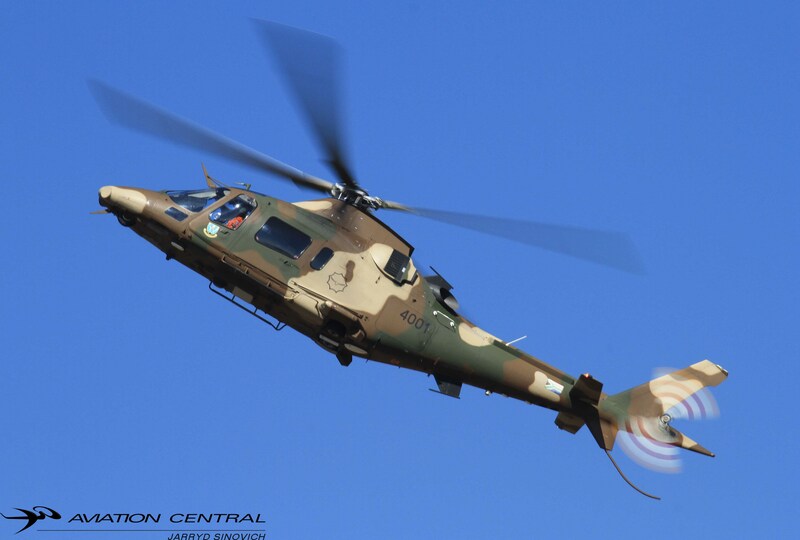 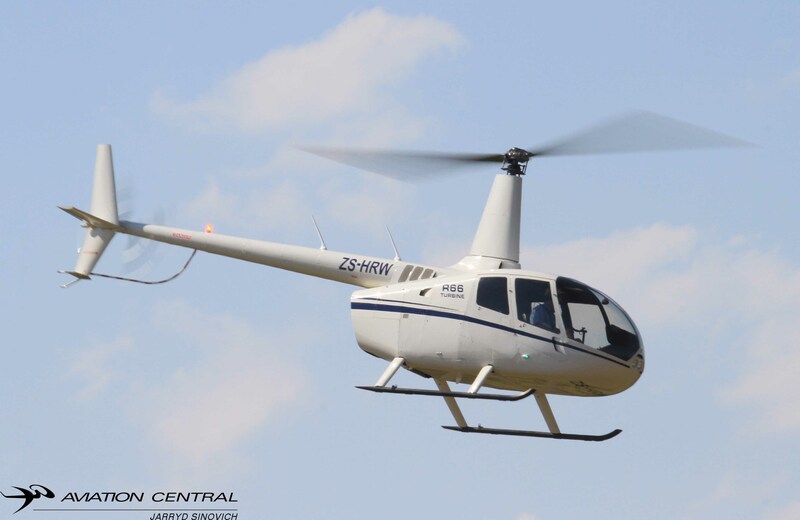 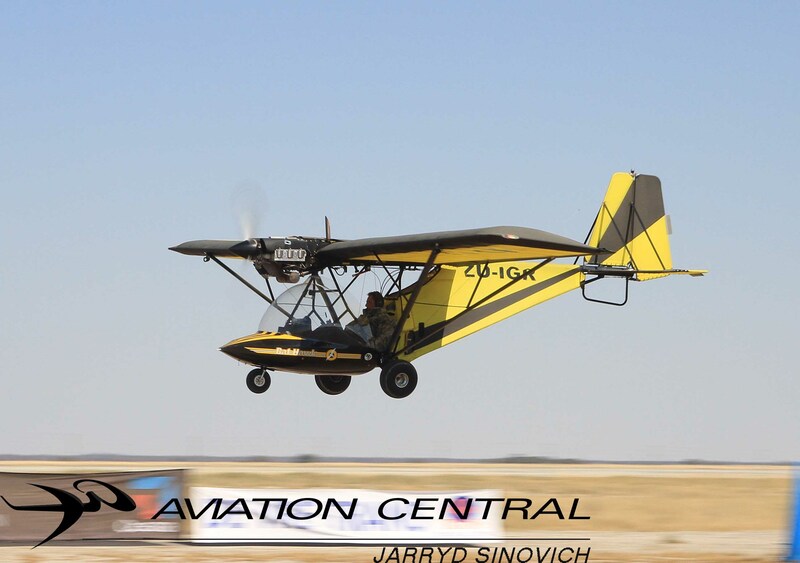 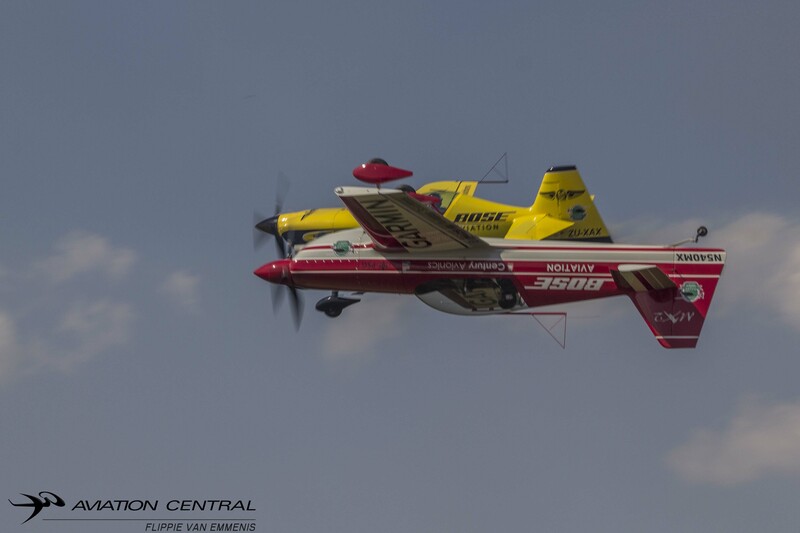 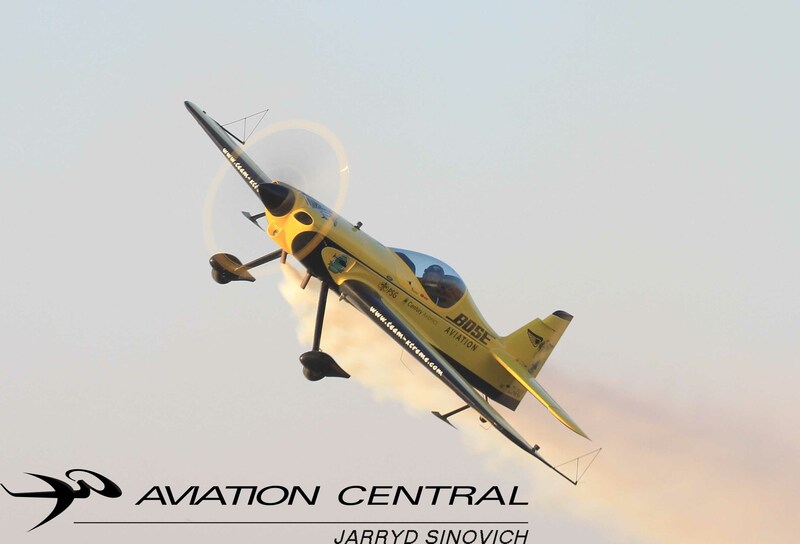 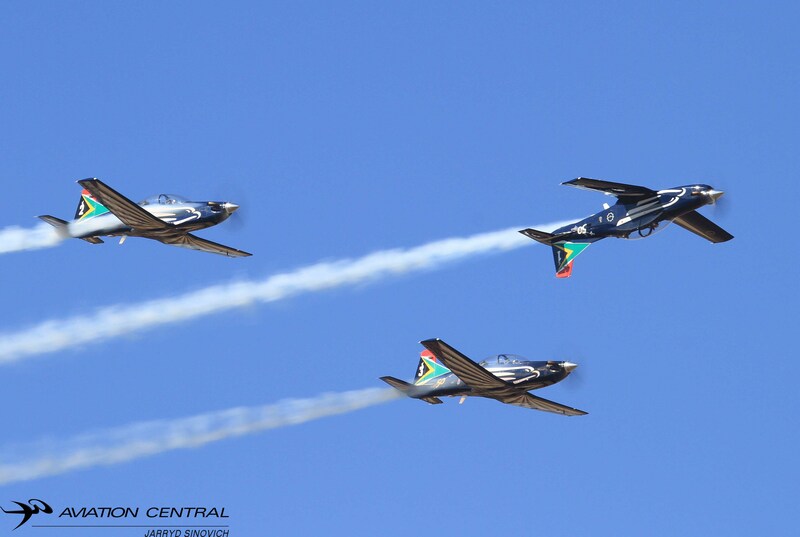 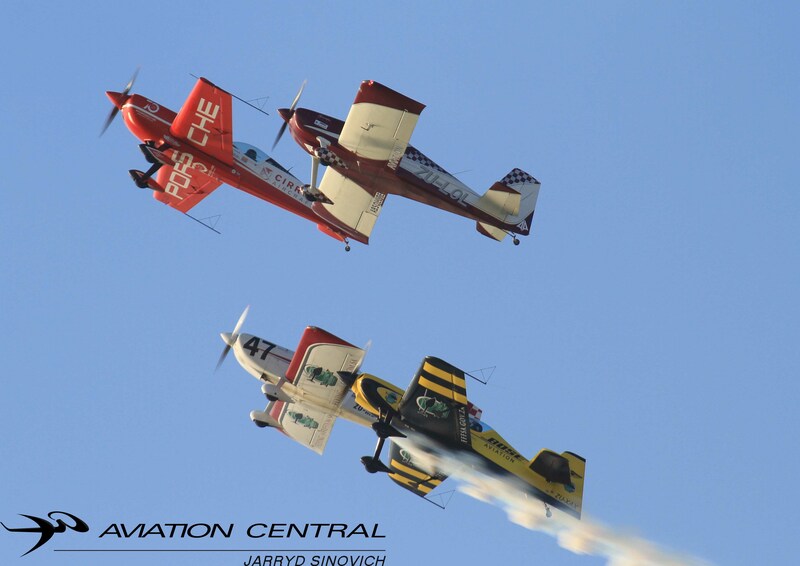 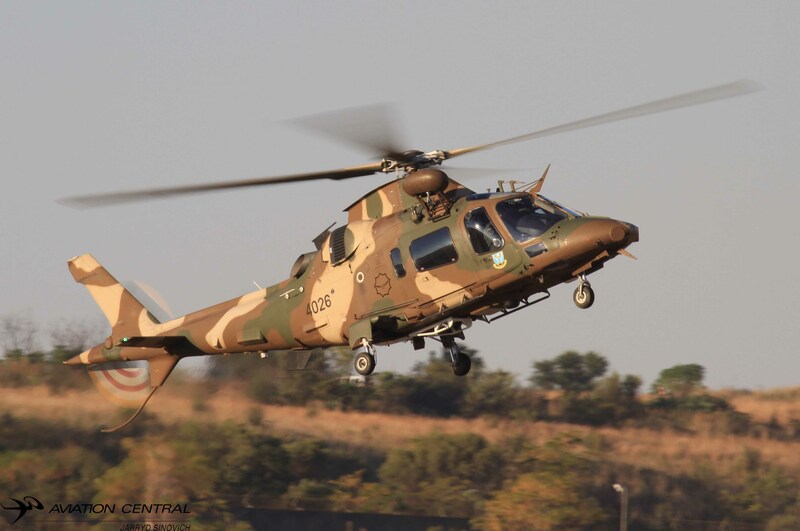 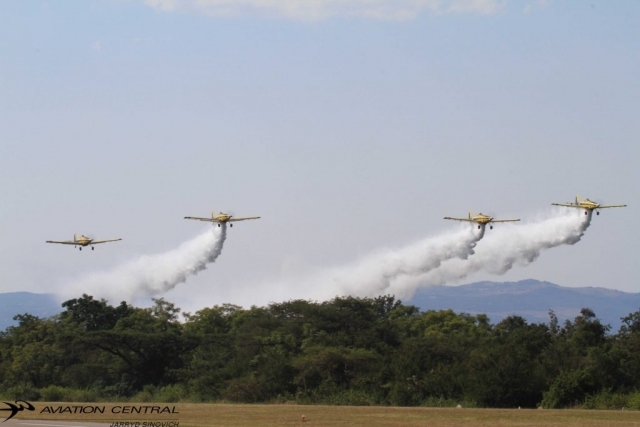 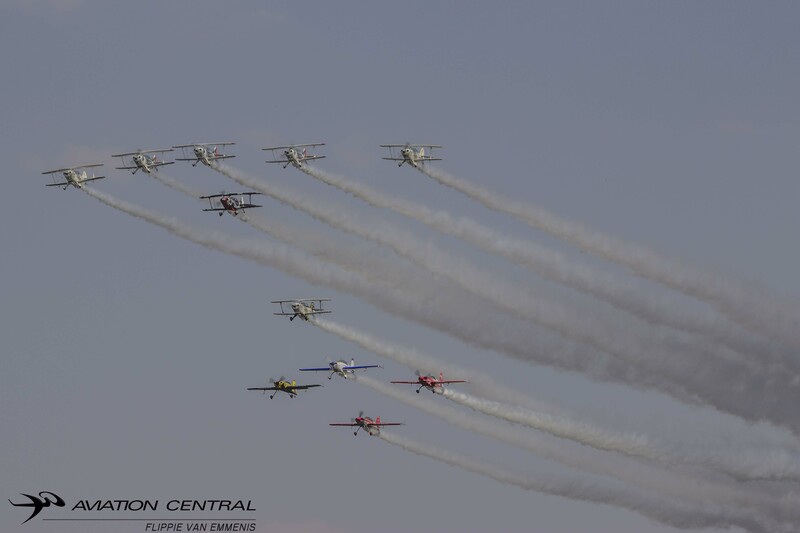 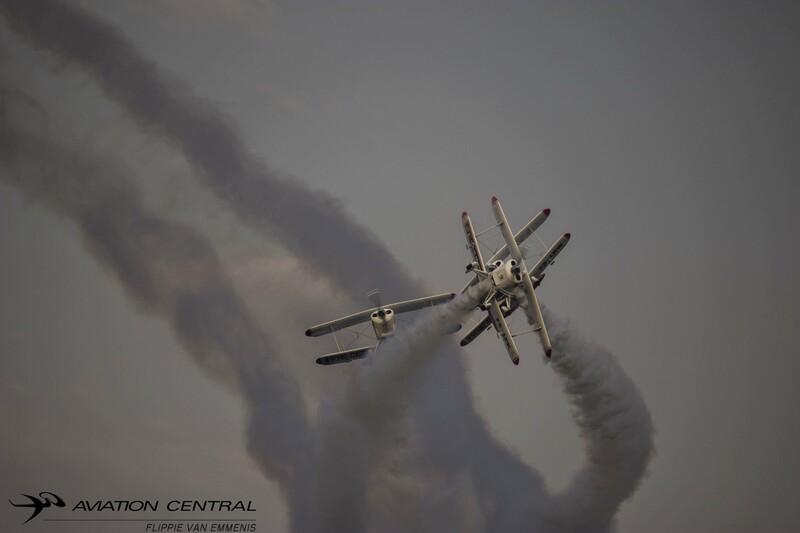 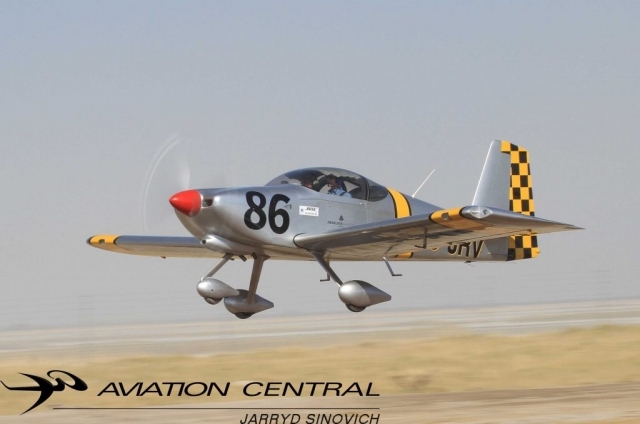 This year already the team has displayed at the FAW Ermelo Airshow in Mpumalanga. 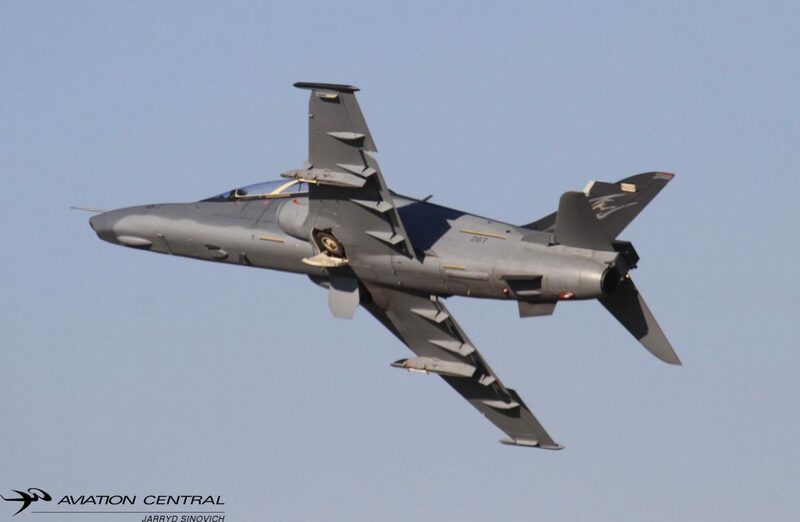 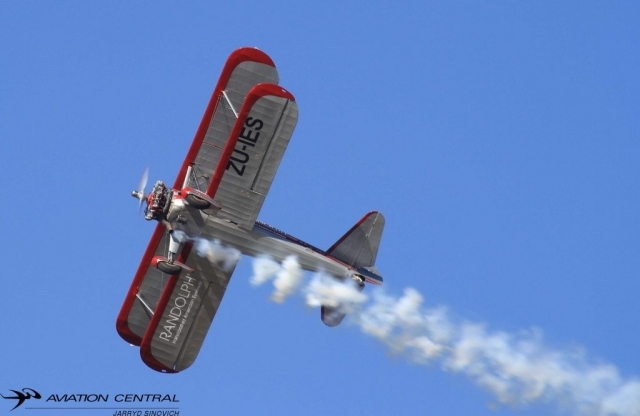 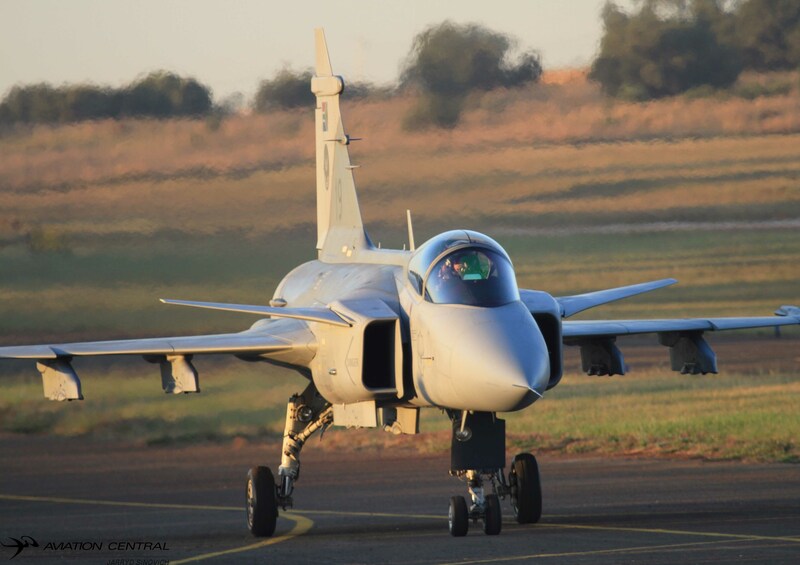 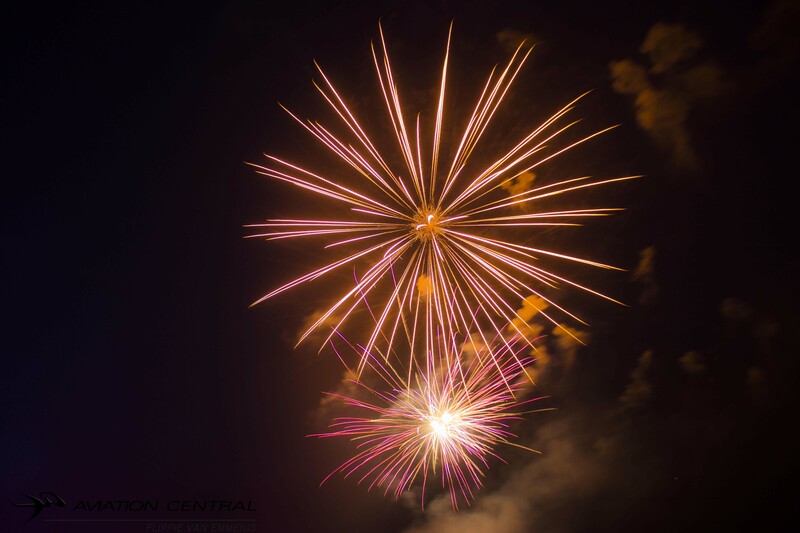 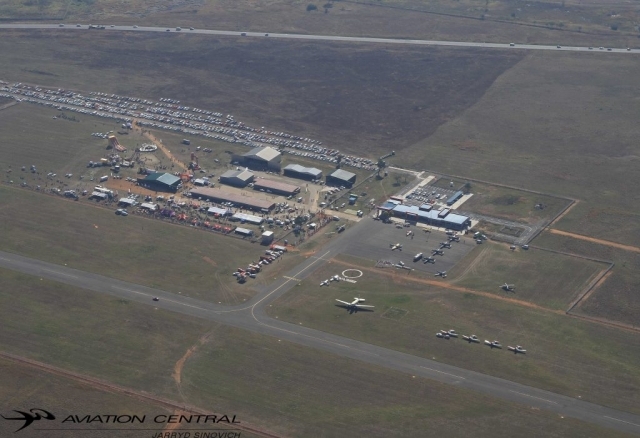 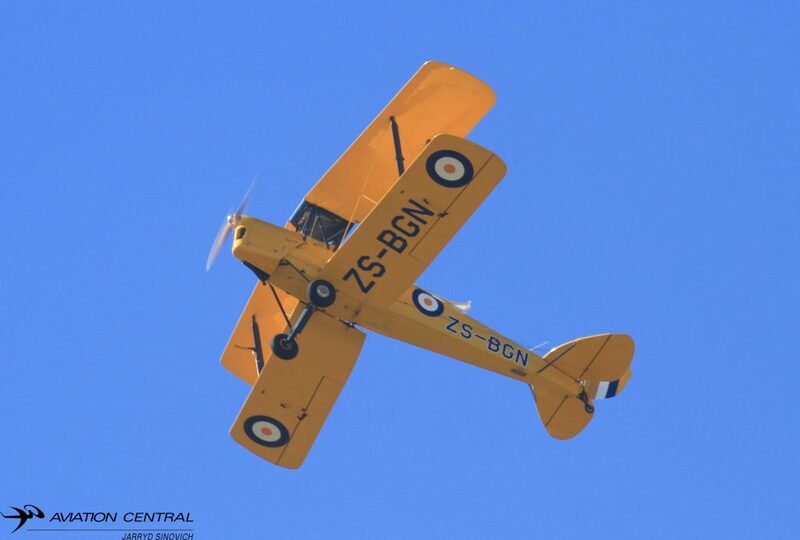 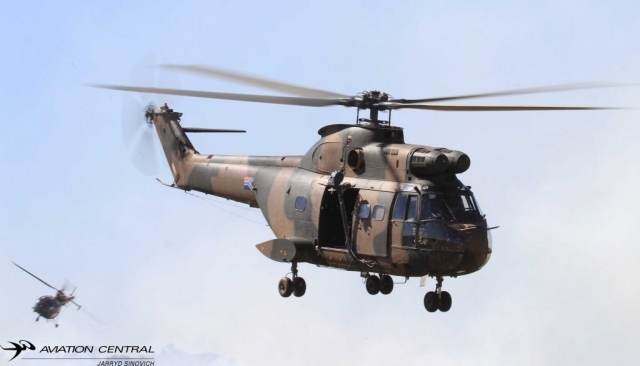 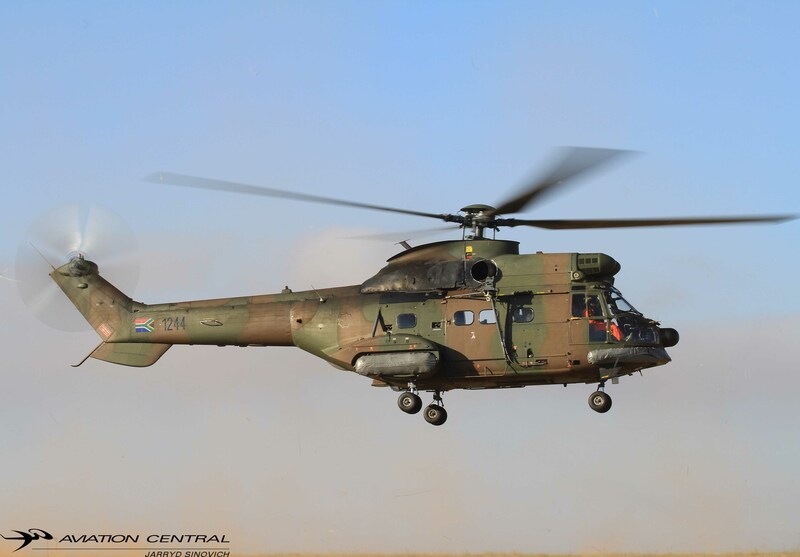 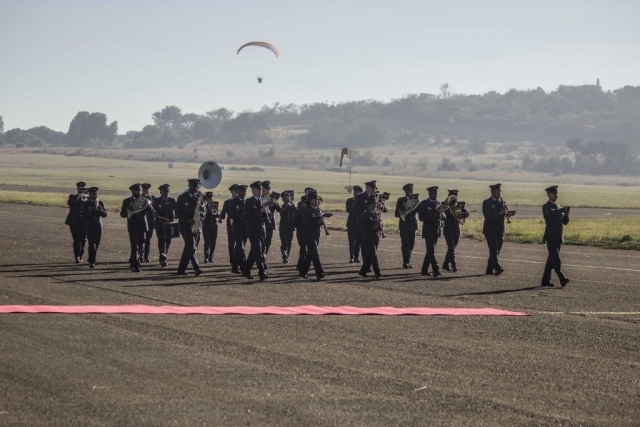 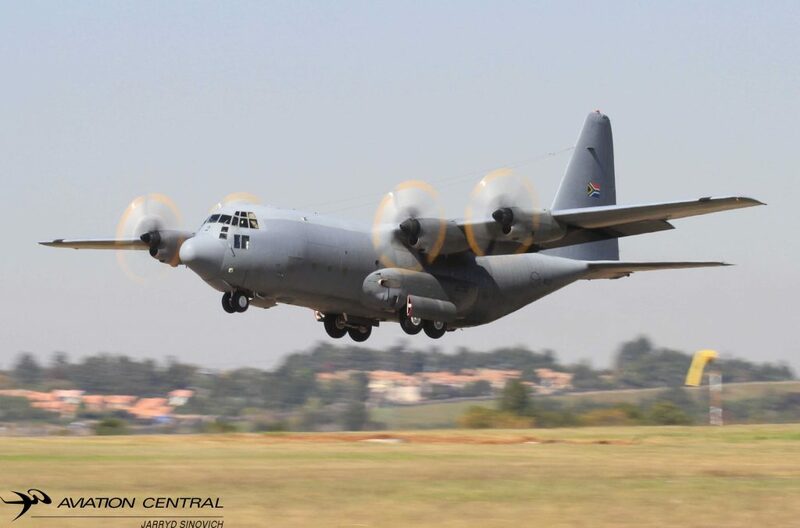 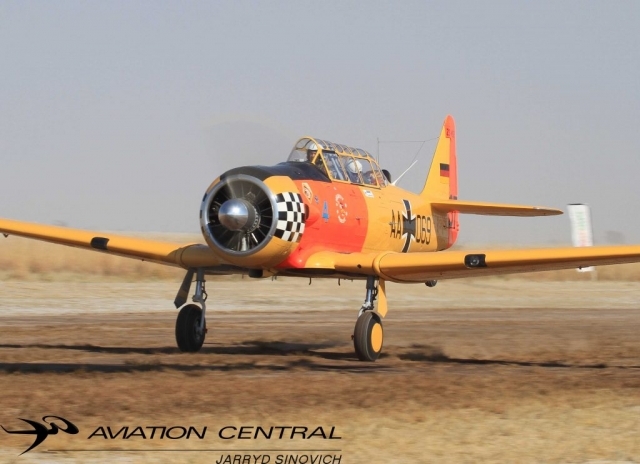 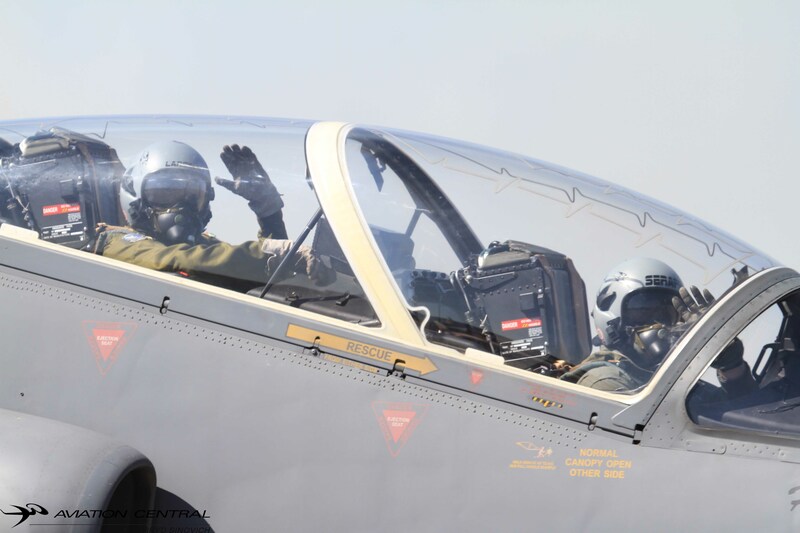 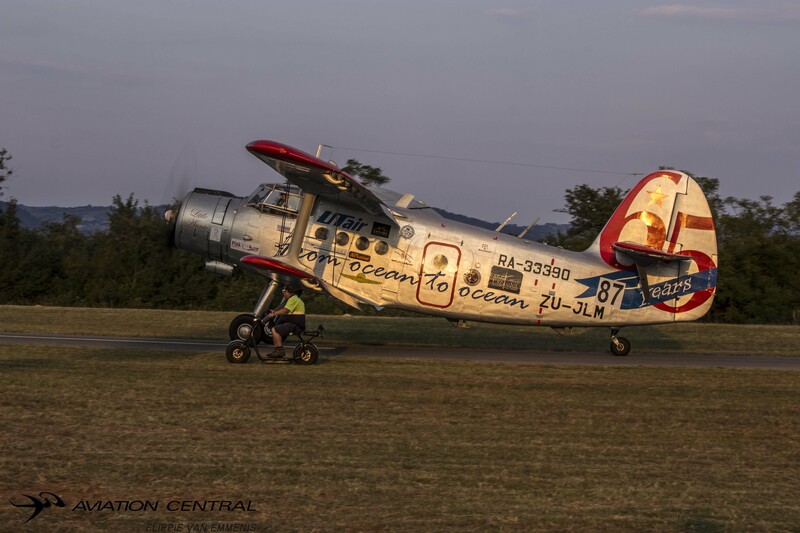 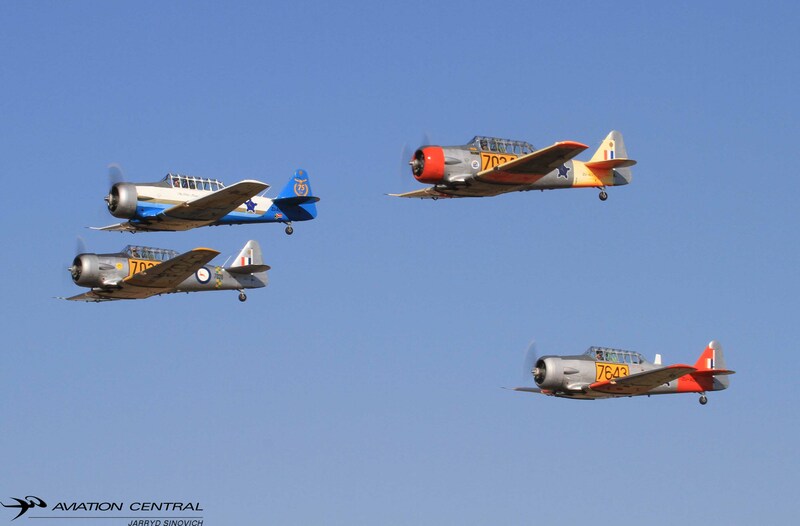 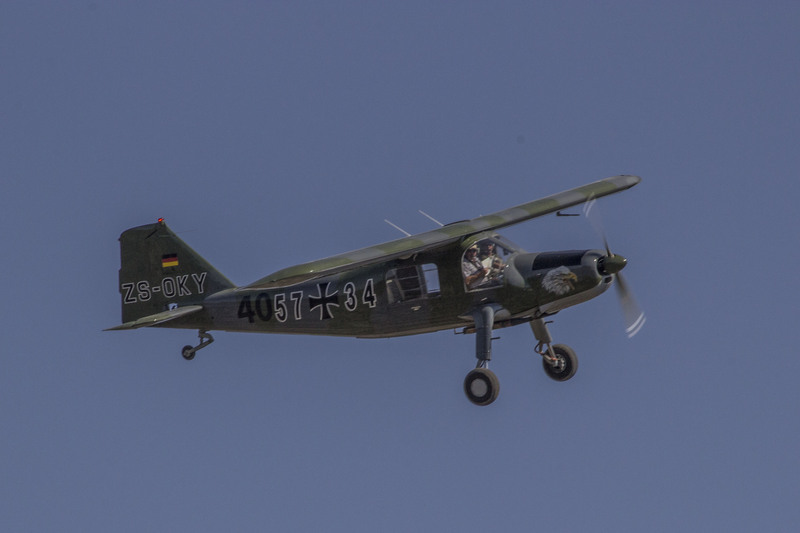 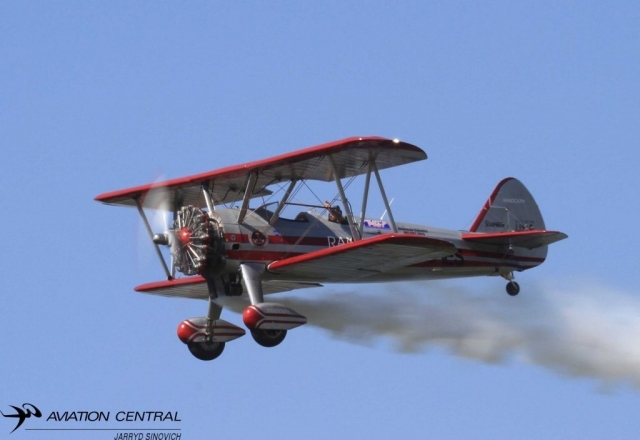 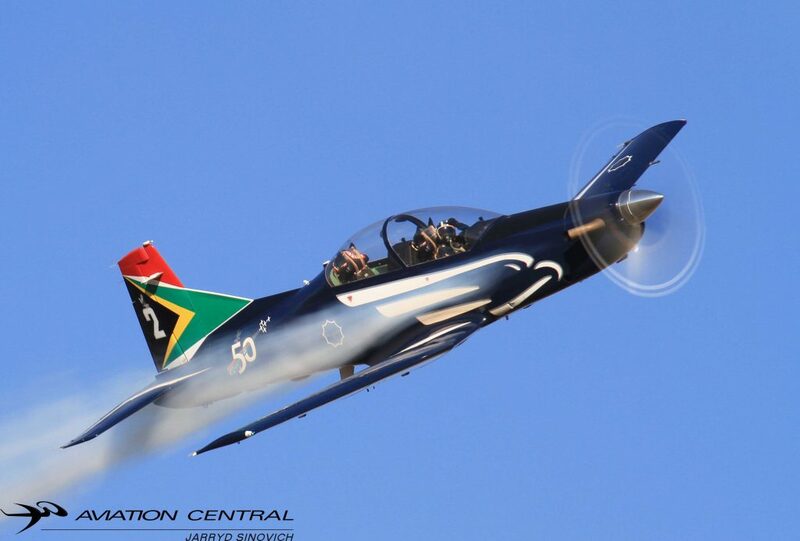 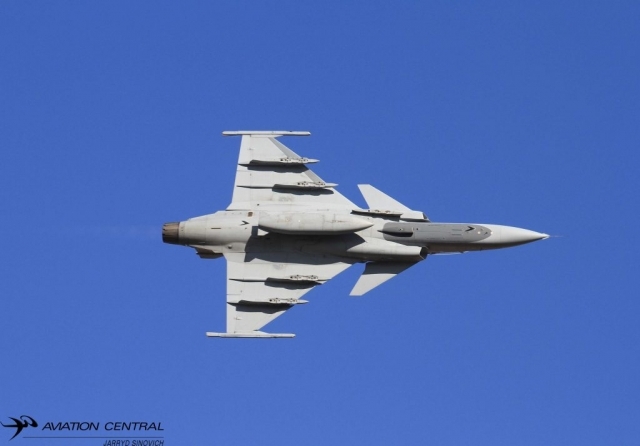 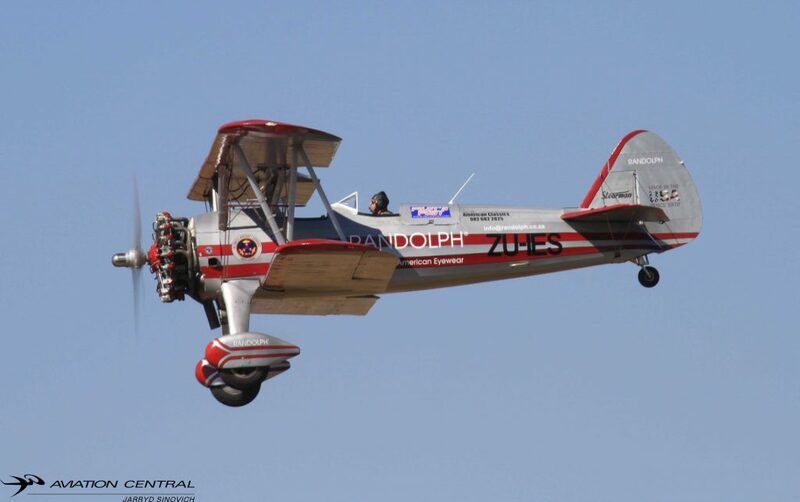 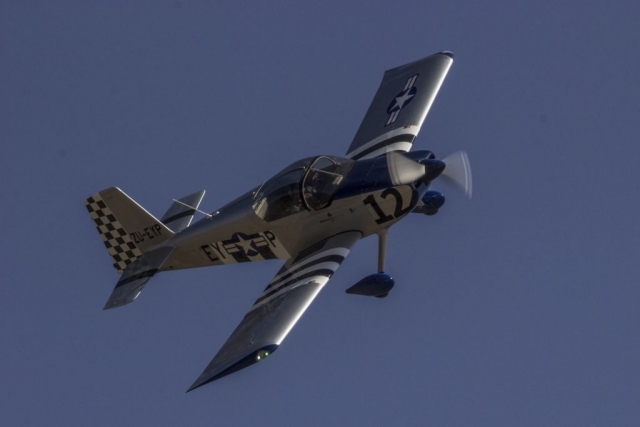 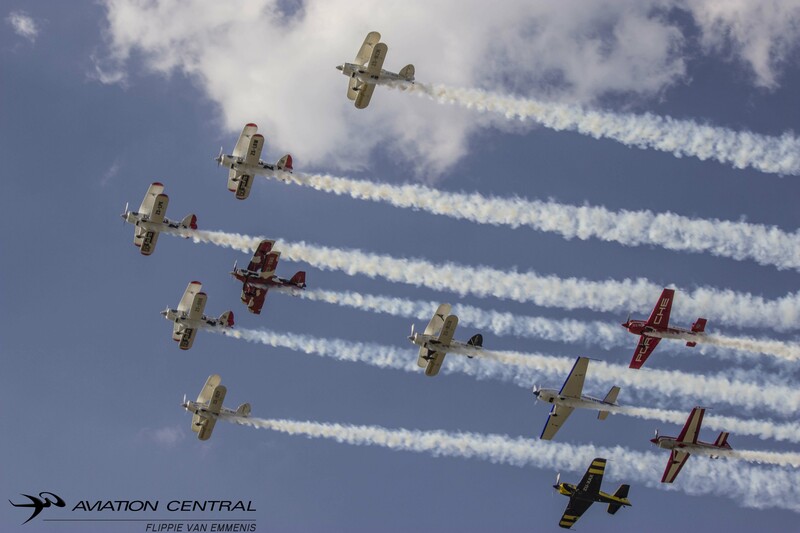 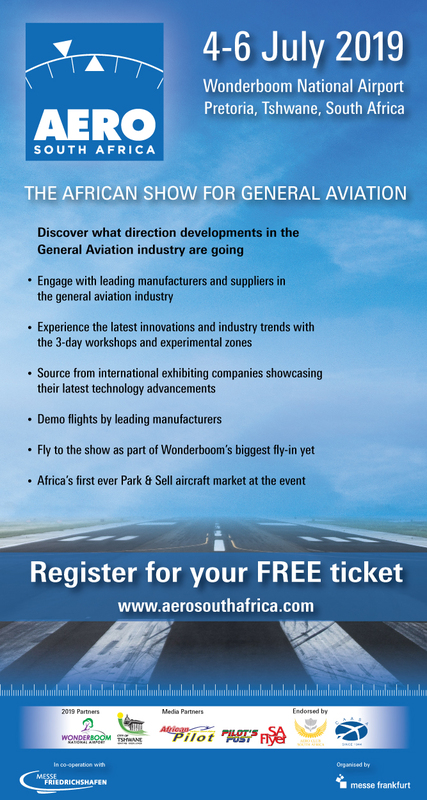 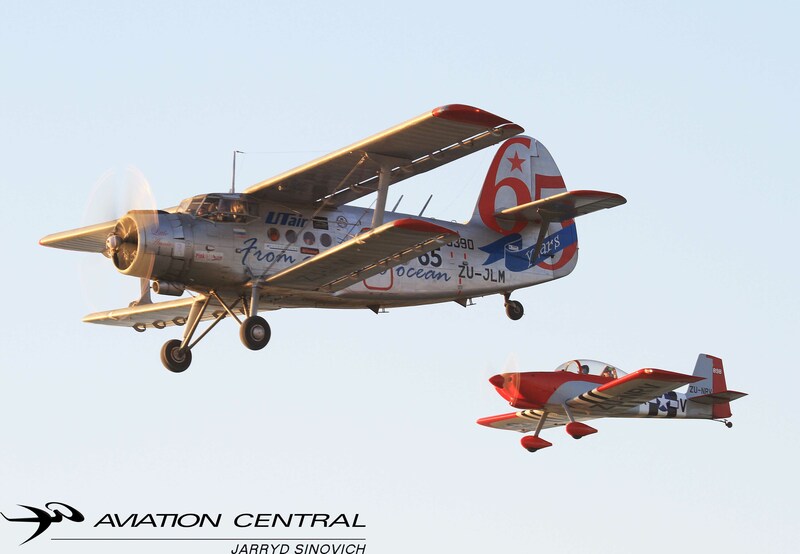 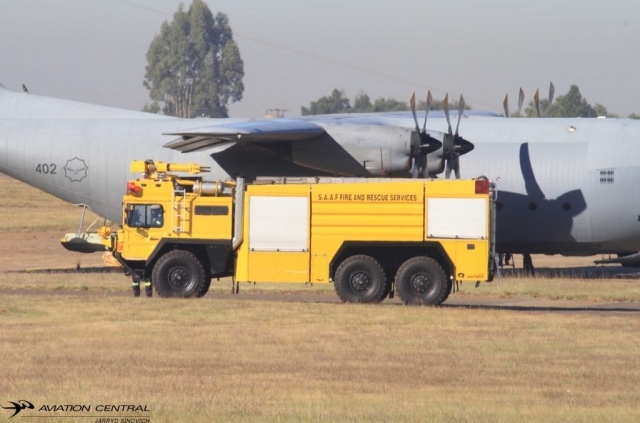 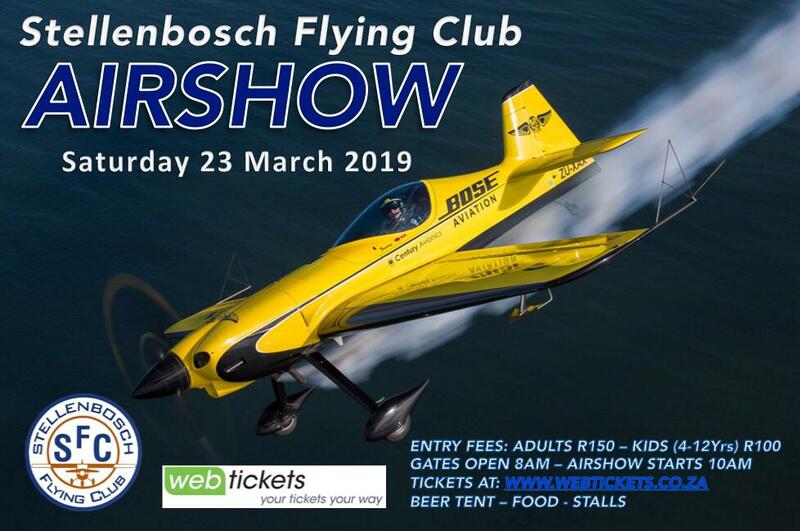 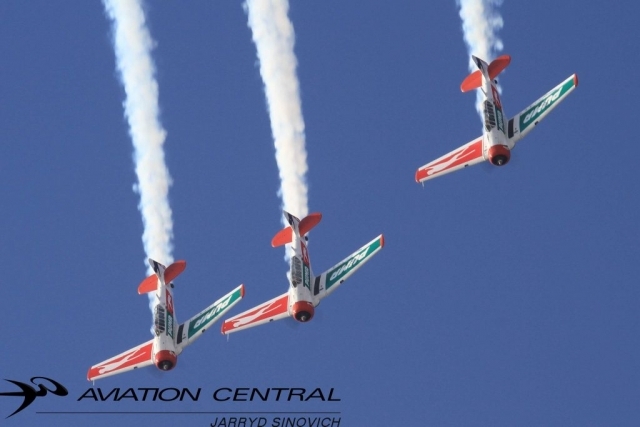 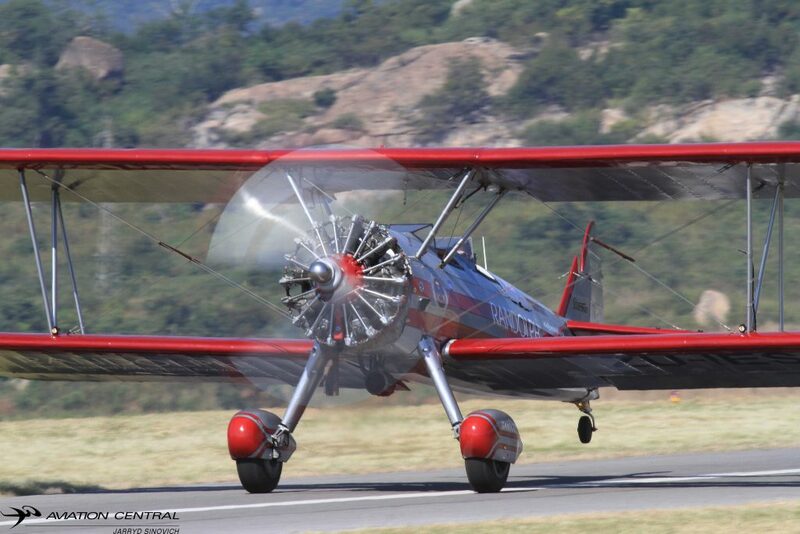 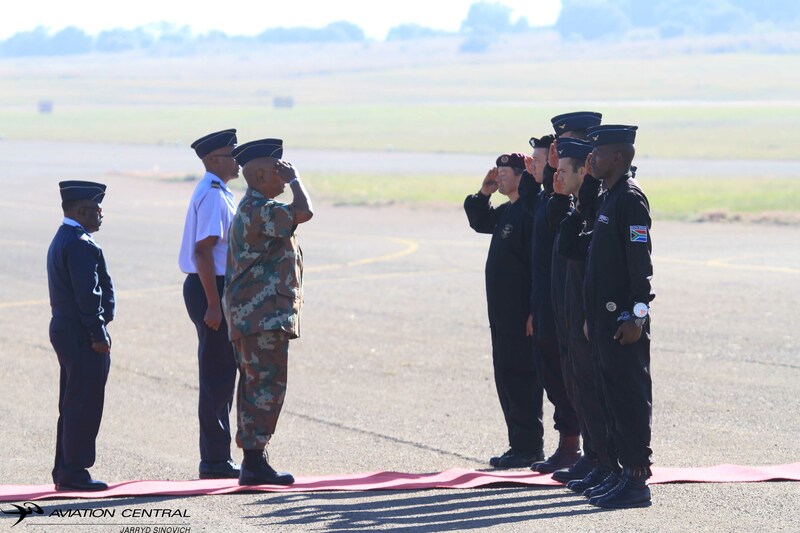 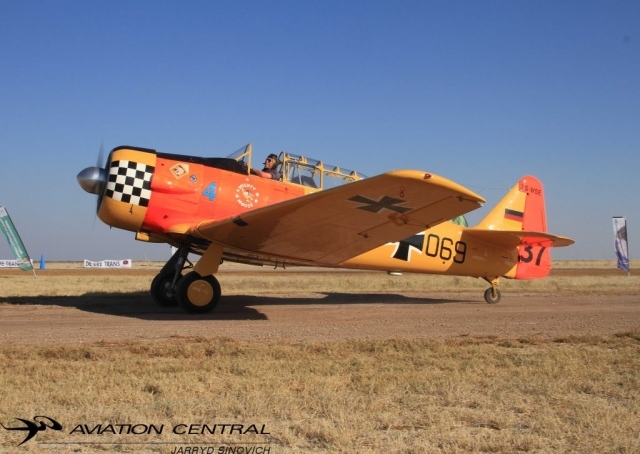 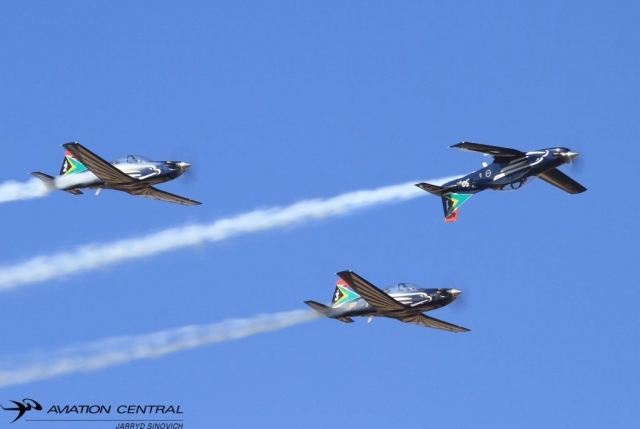 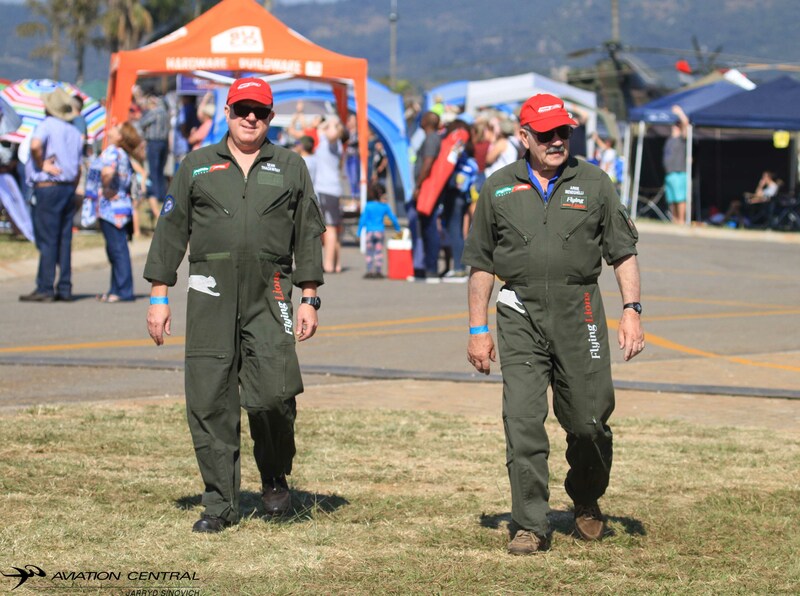 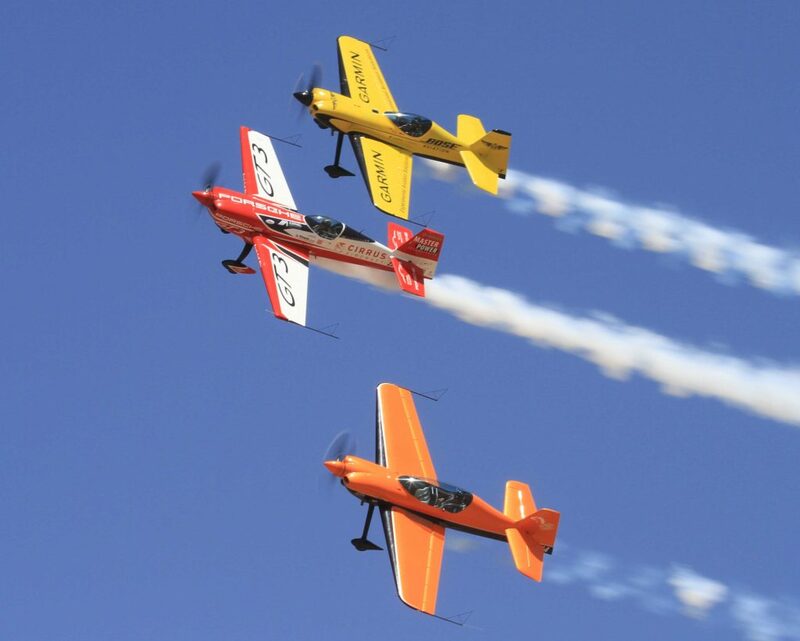 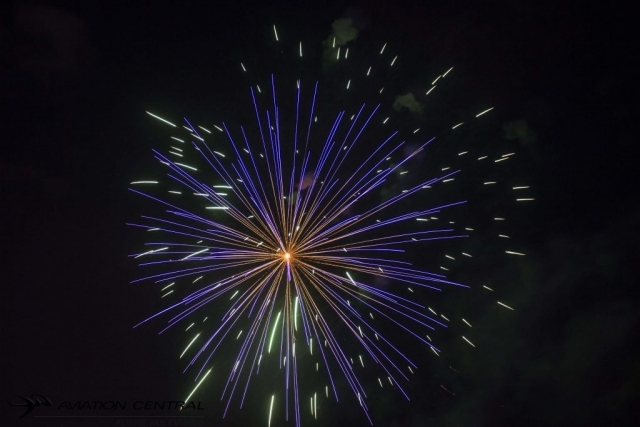 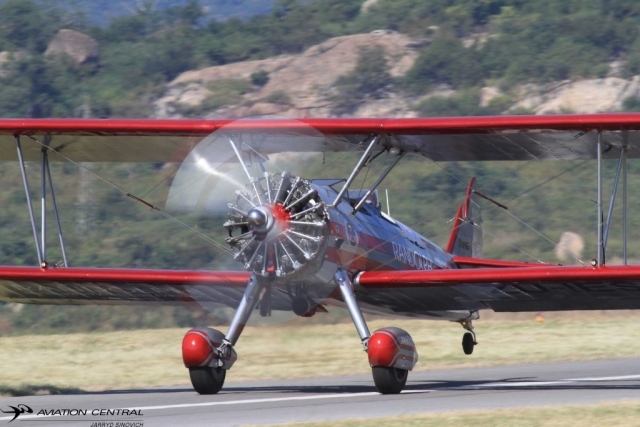 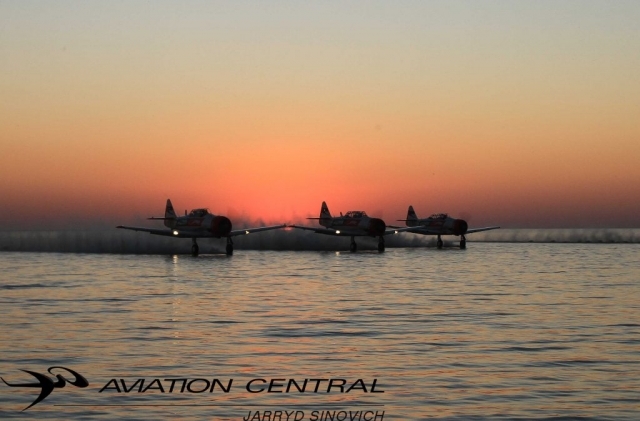 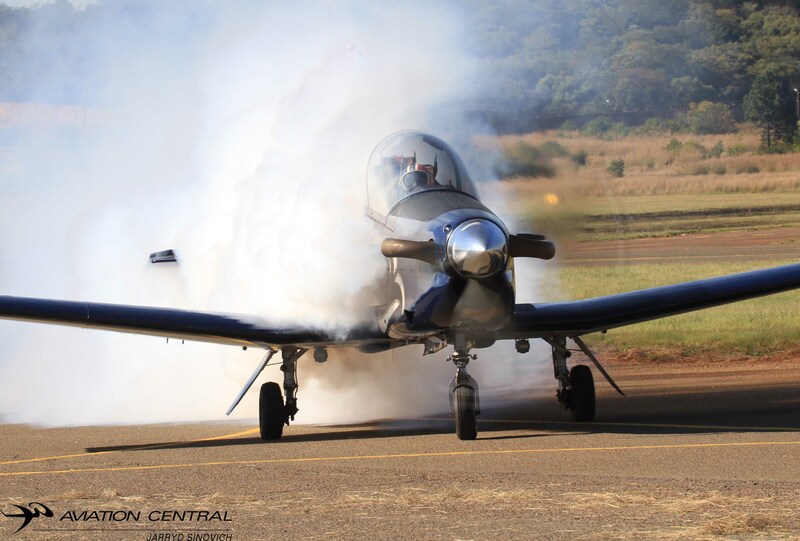 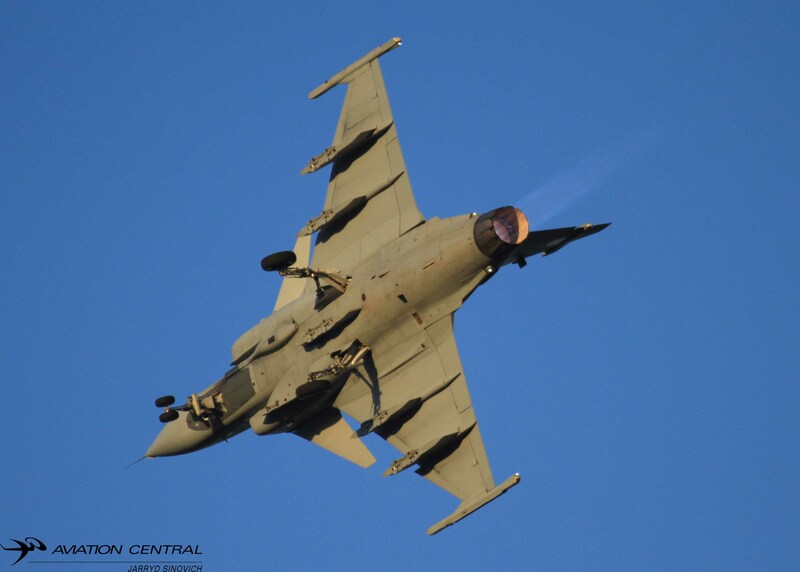 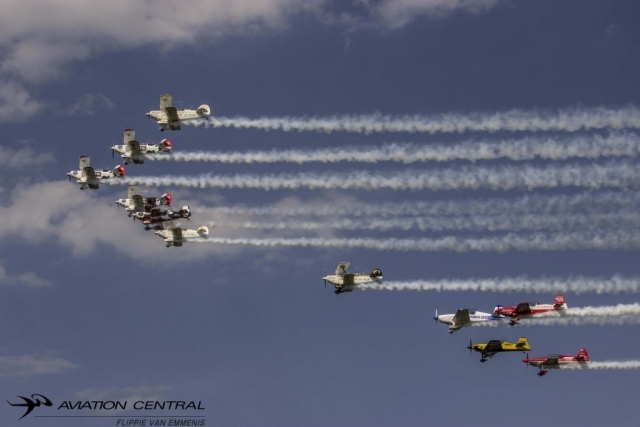 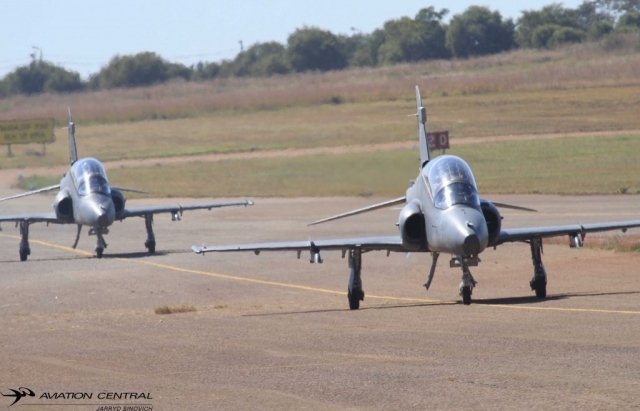 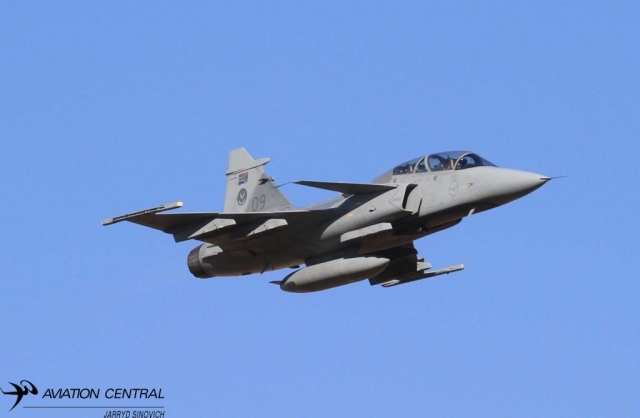 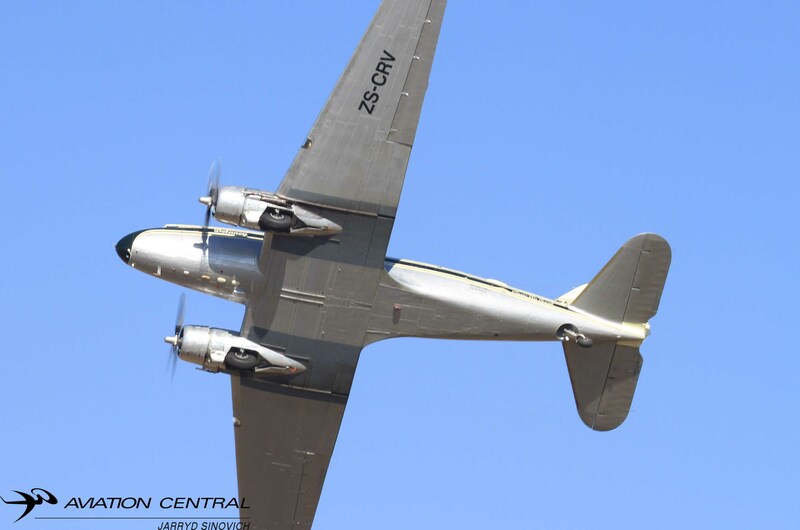 Next show on the cards is the SAAF Museum Airshow at Airforce Base Swartkops in Pretoria.The Pretoria airshows are always big and large crowds gather to see some of South Africa’s best pilots perform both civil and military. 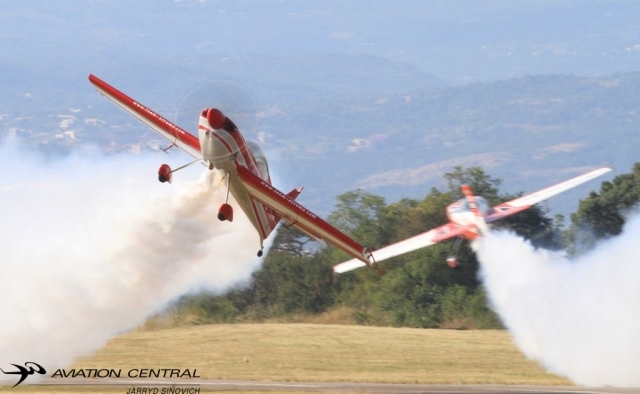 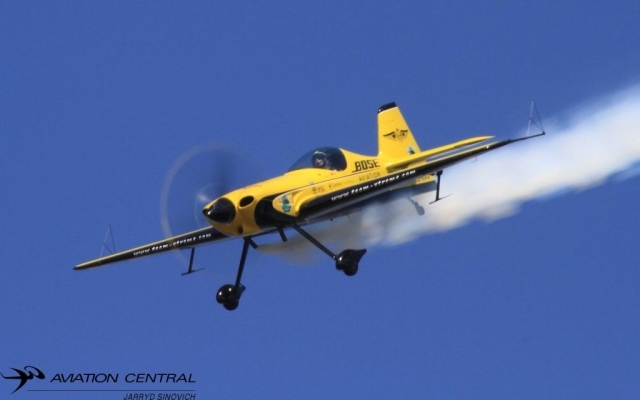 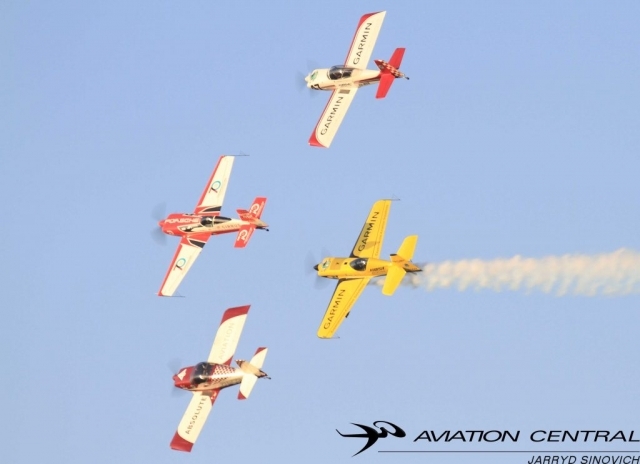 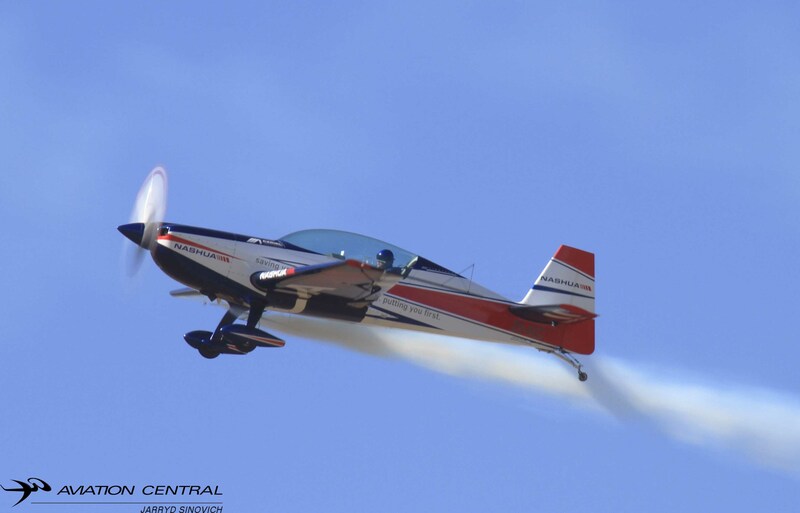 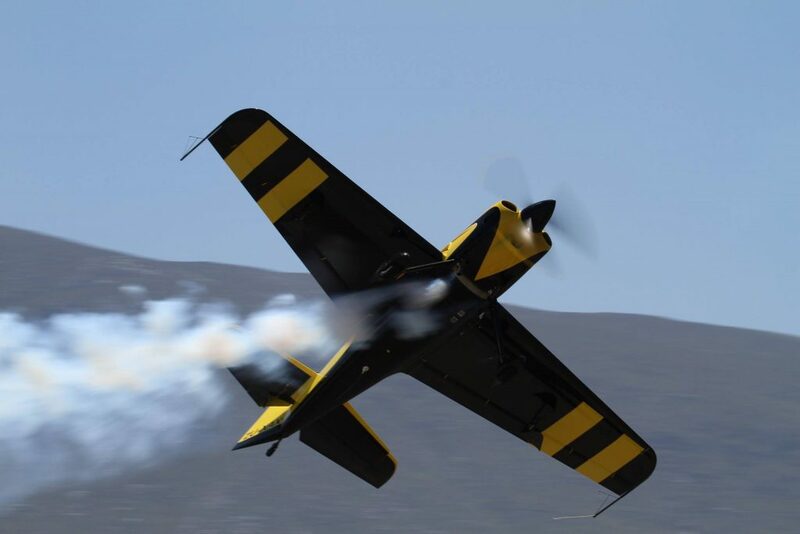 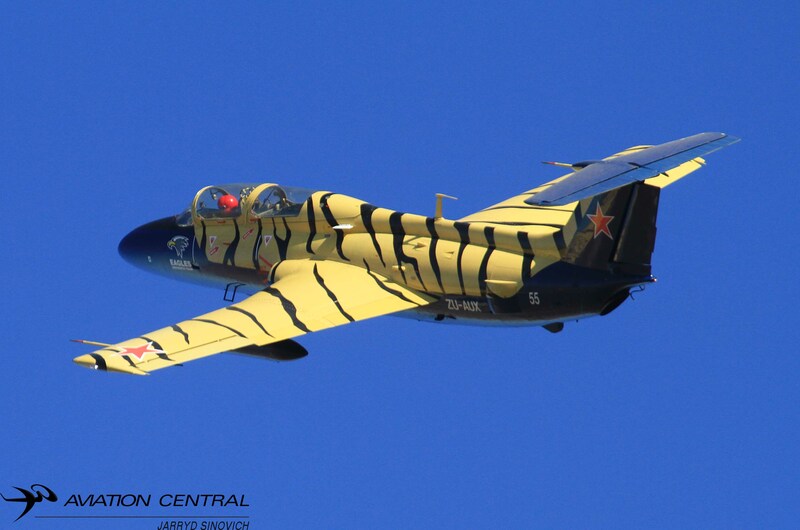 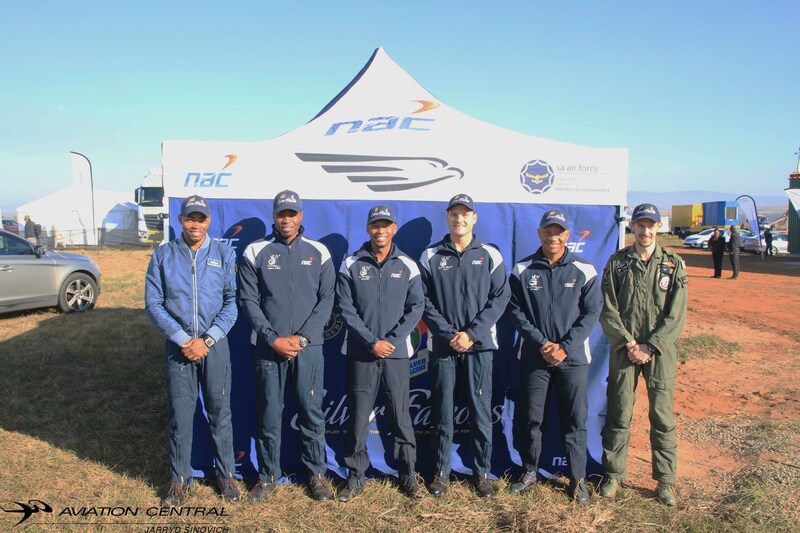 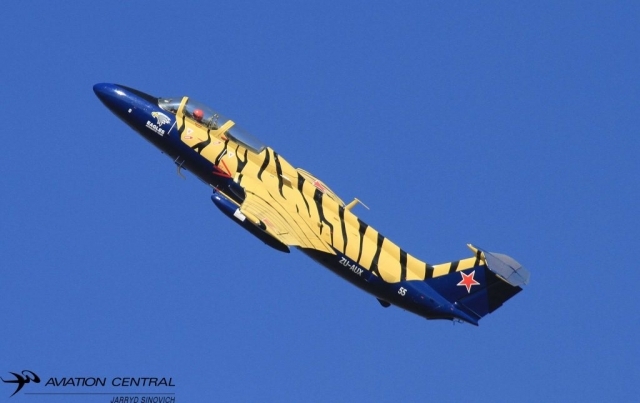 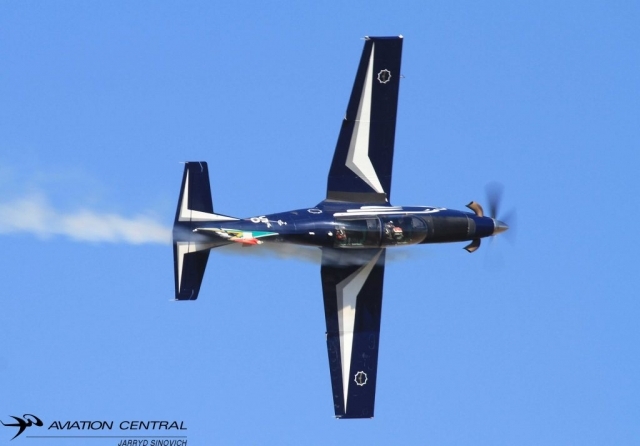 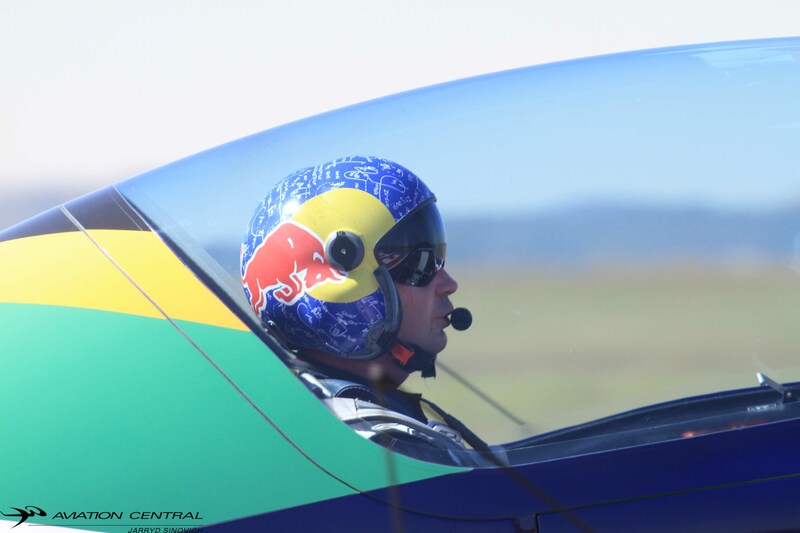 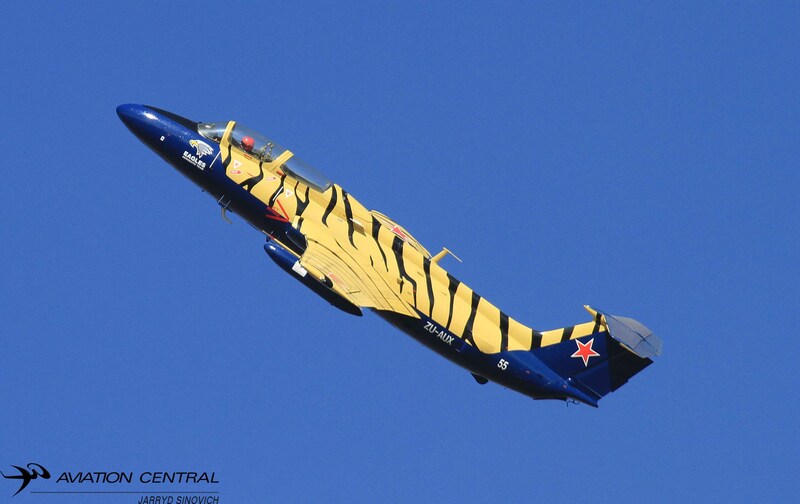 The Aerobatic Team has performed nearly 100 displays in South Africa, Southern Africa and China since 2010, Team Xtreme is voted in the top 3 civilian Aerobatic Teams at the inaugural Formation Aerobatic Challenge (FAC 2017) held in Zhengzhou, China. 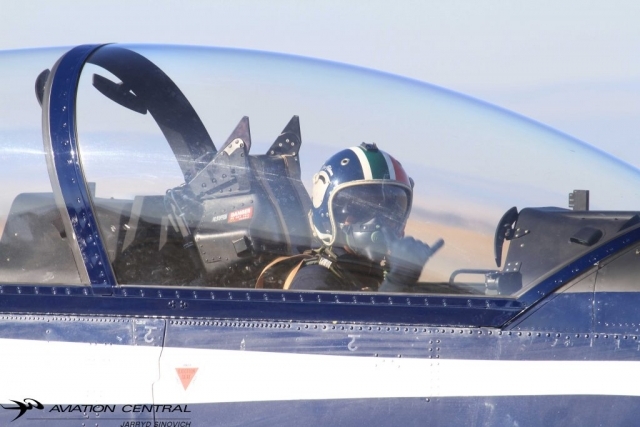 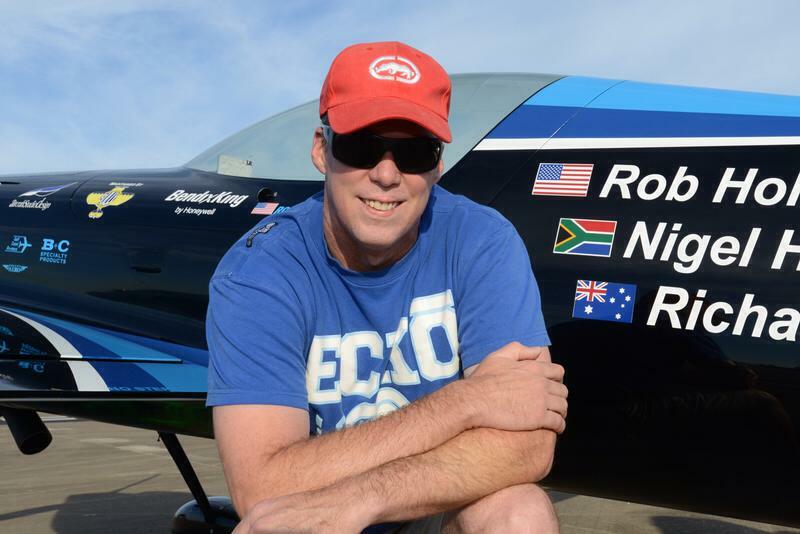 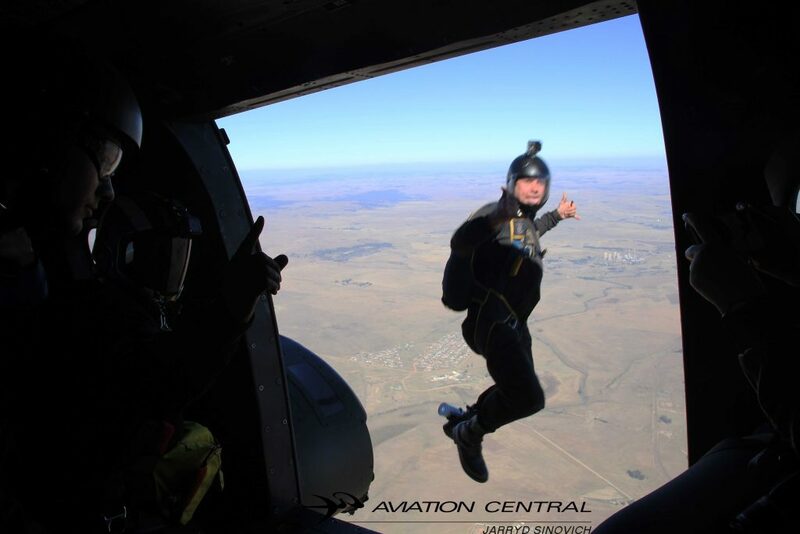 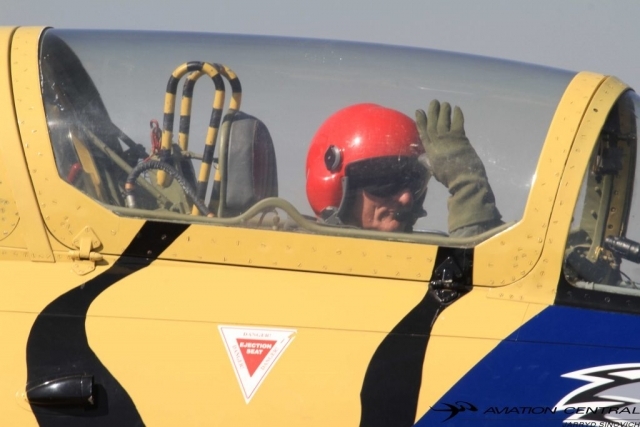 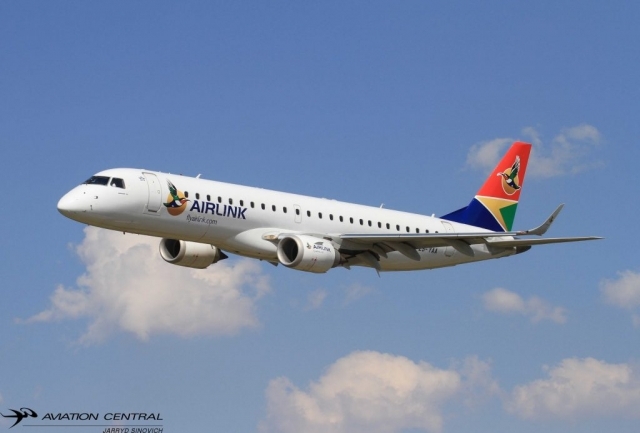 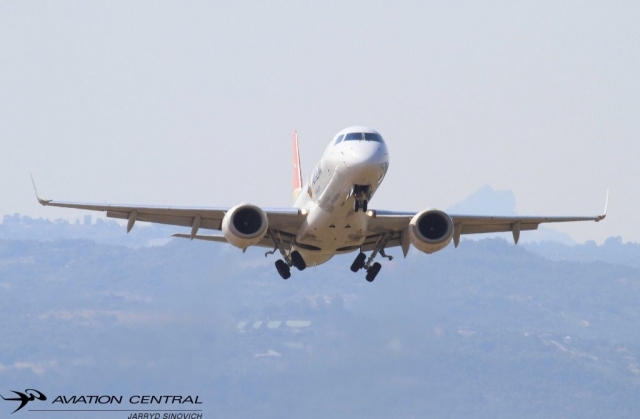 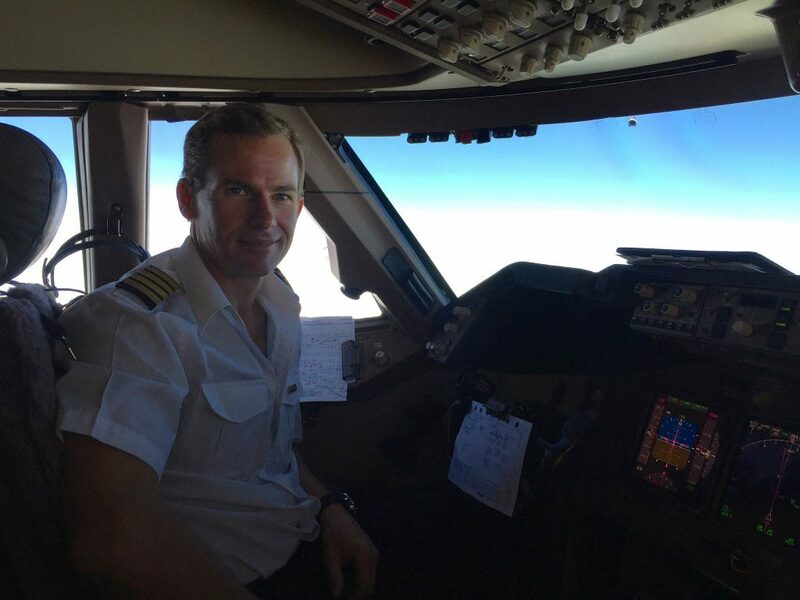 Is a training Captain at South African Airways on the Airbus A320,he has flown all types of aerobatic aircraft and warbirds including the T28 Trojan and L29 Delphin. 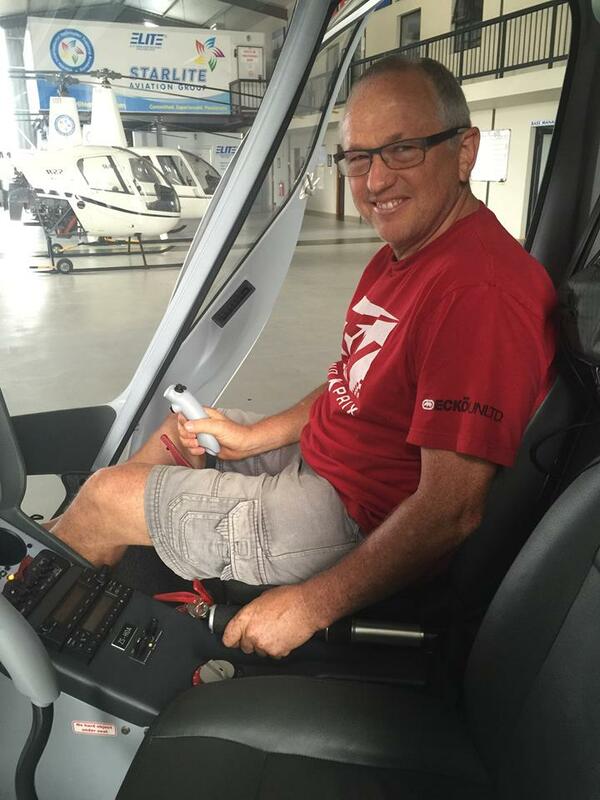 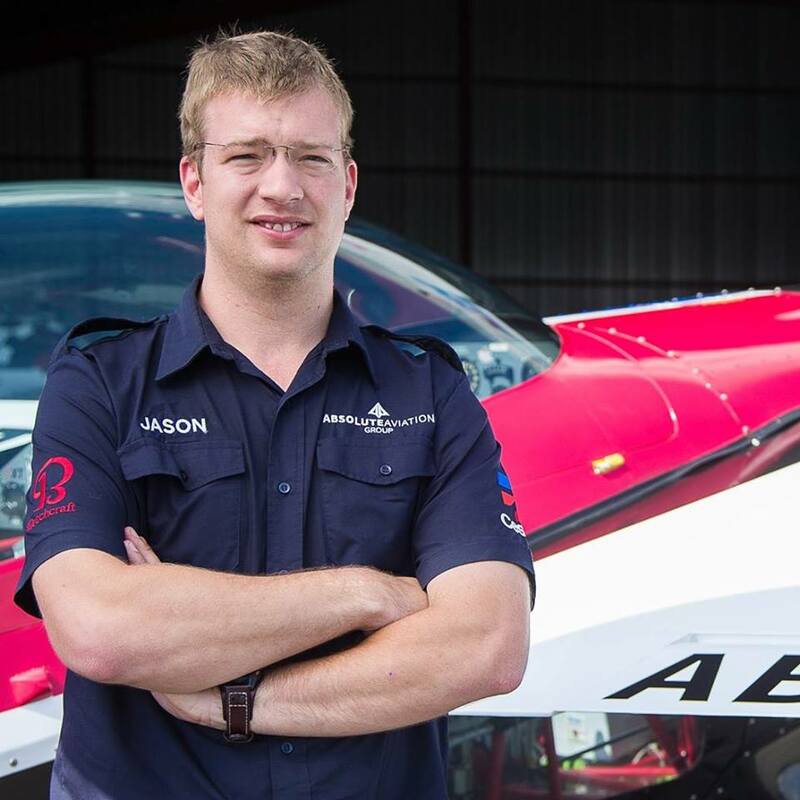 Is the Team Manager & Aircraft Technician,he was recently Nigel Lambs Aircraft Technician on the Red Bull Air Race Series.He also has a helicopter PPL. 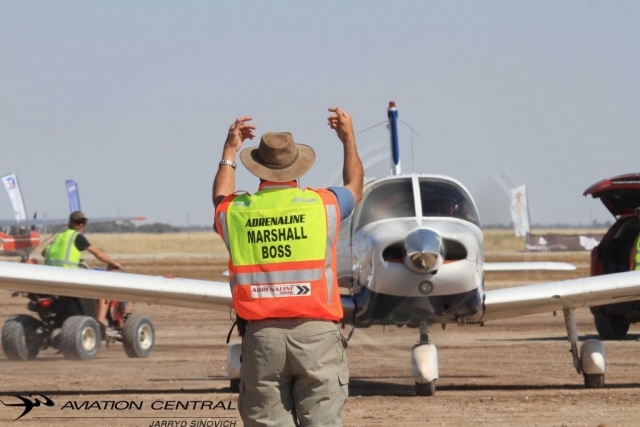 His Total Flying hours: 15,500+ hrs.